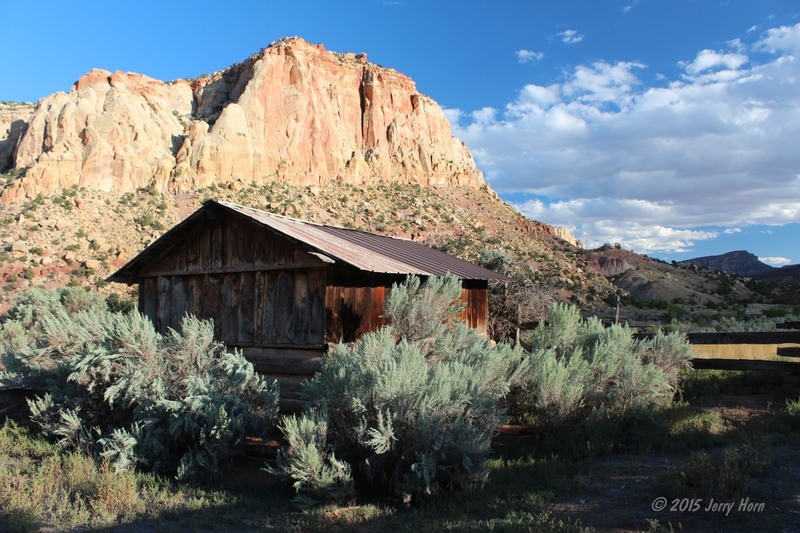 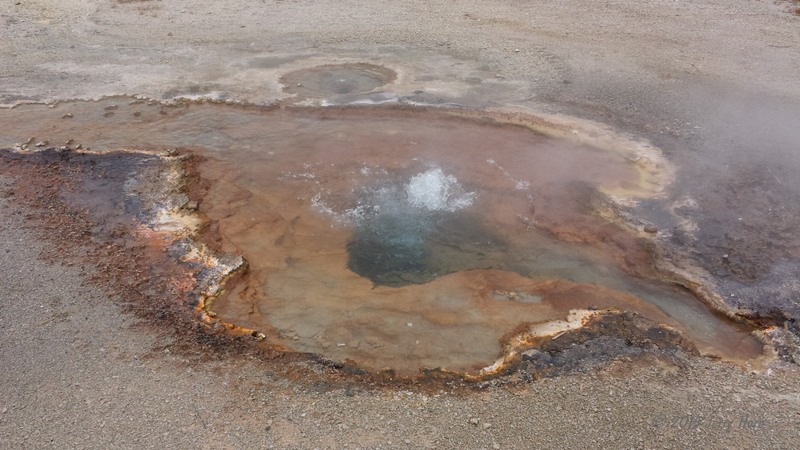 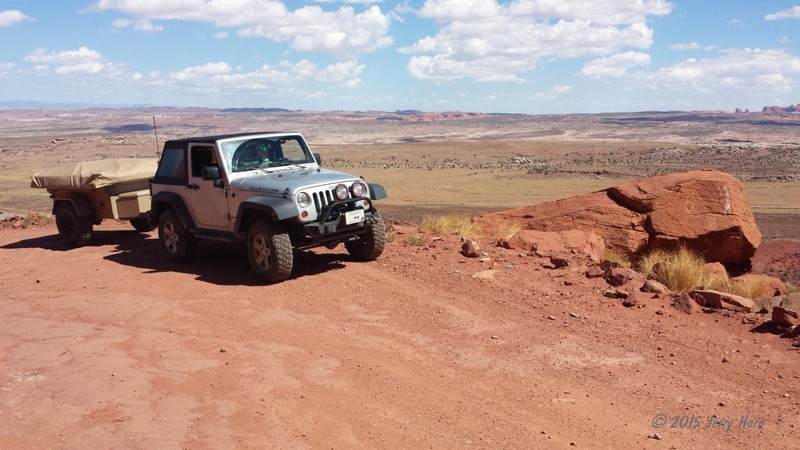 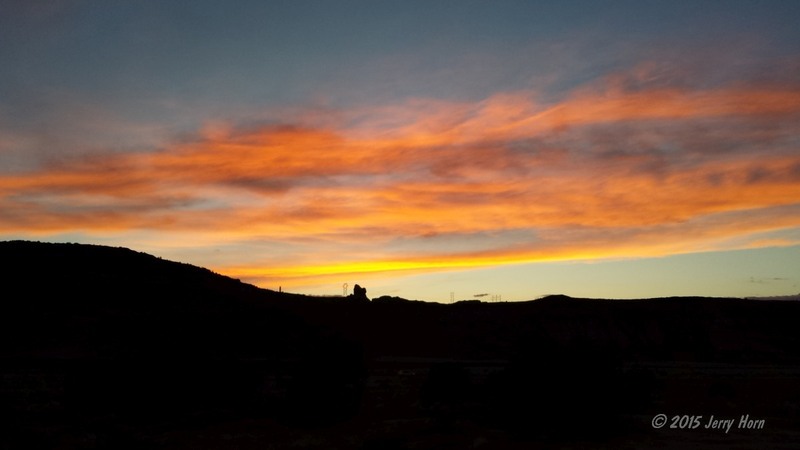 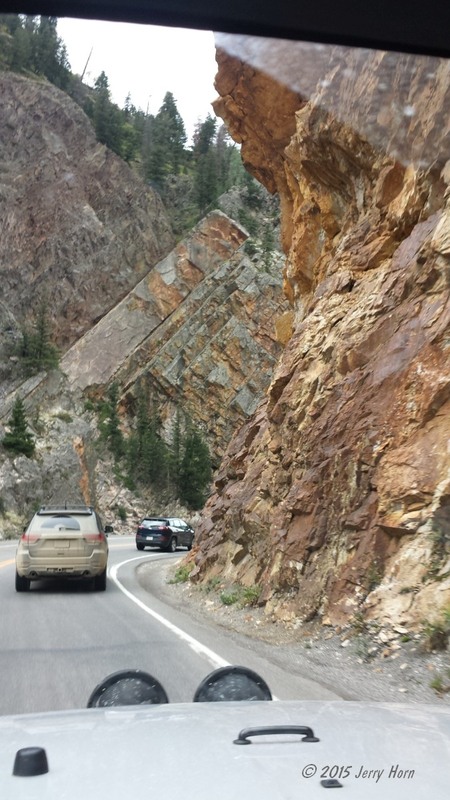 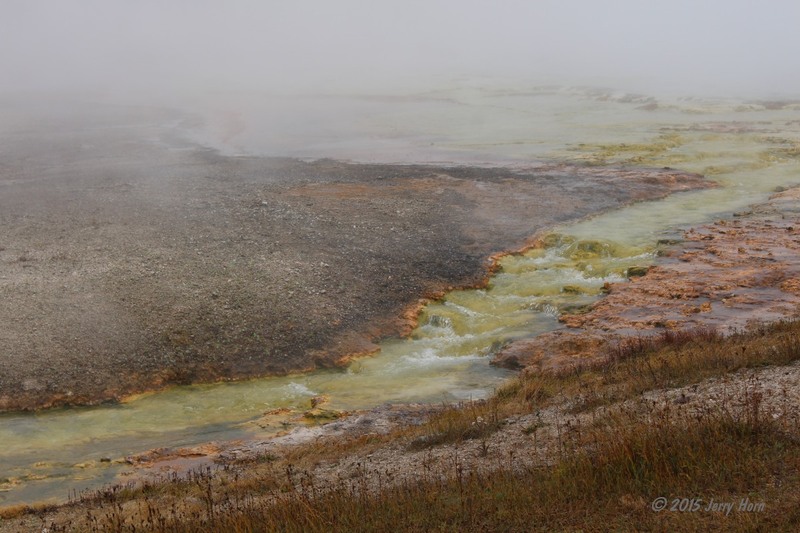 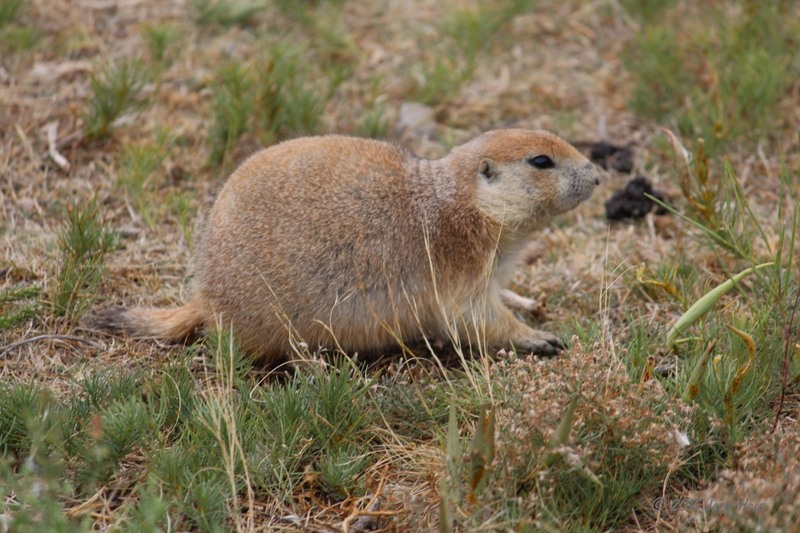 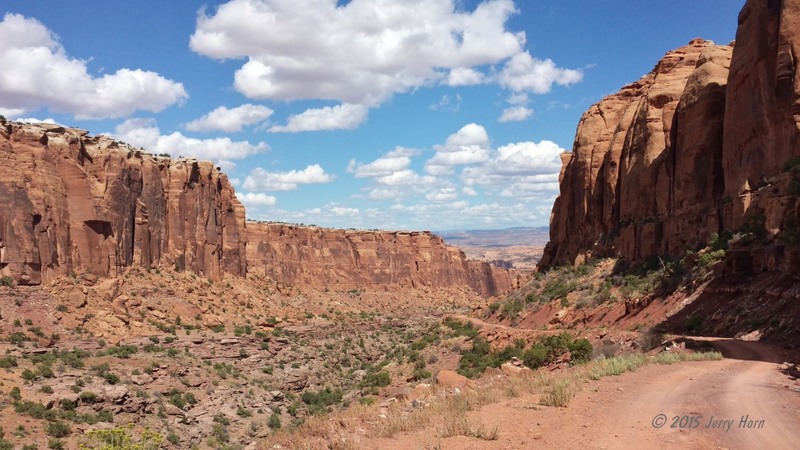 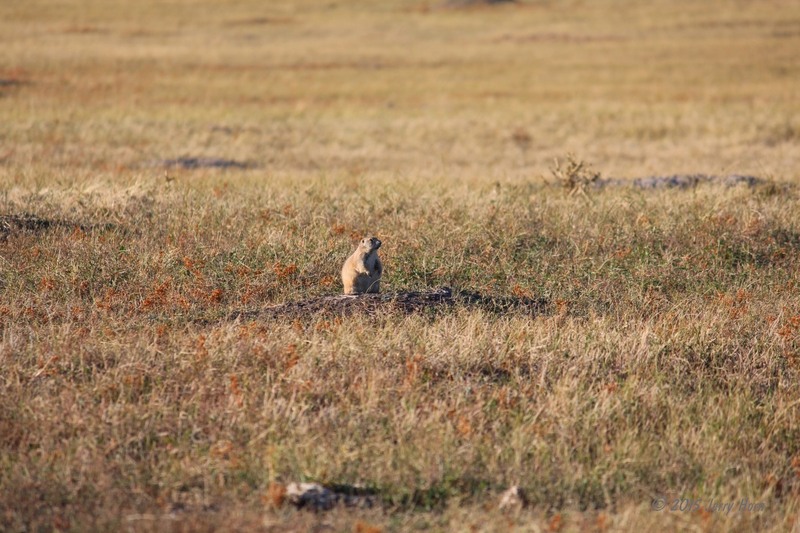 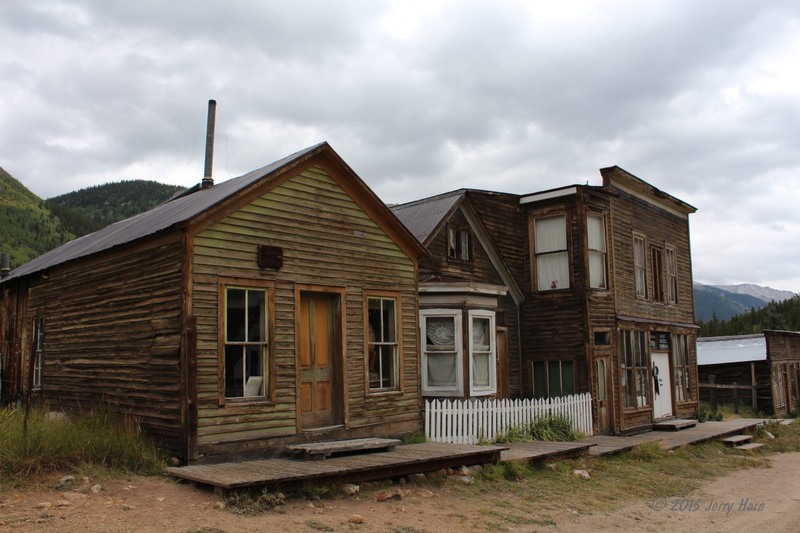 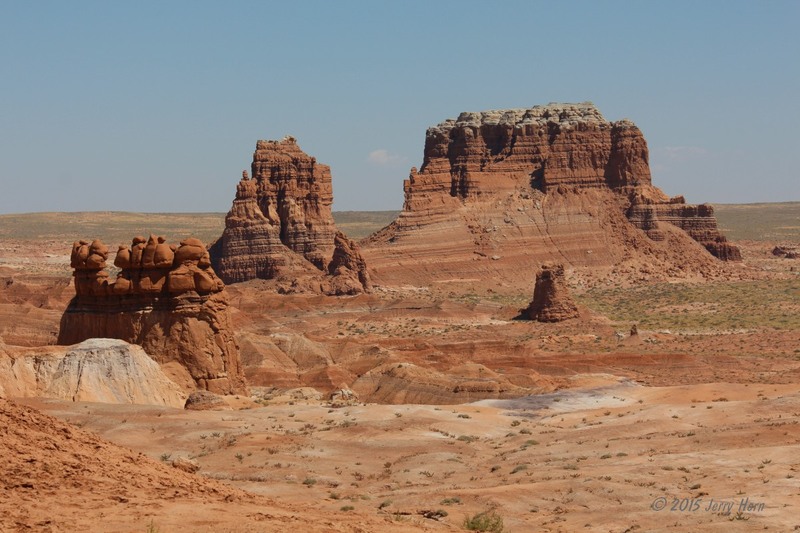 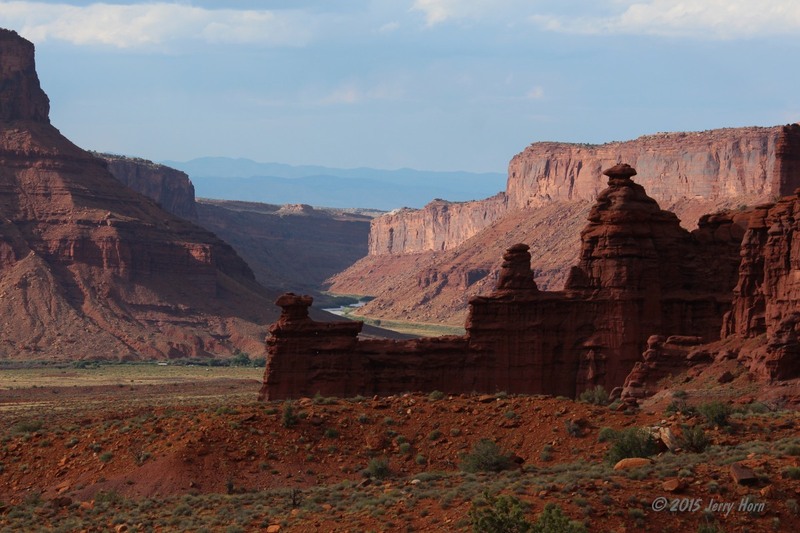 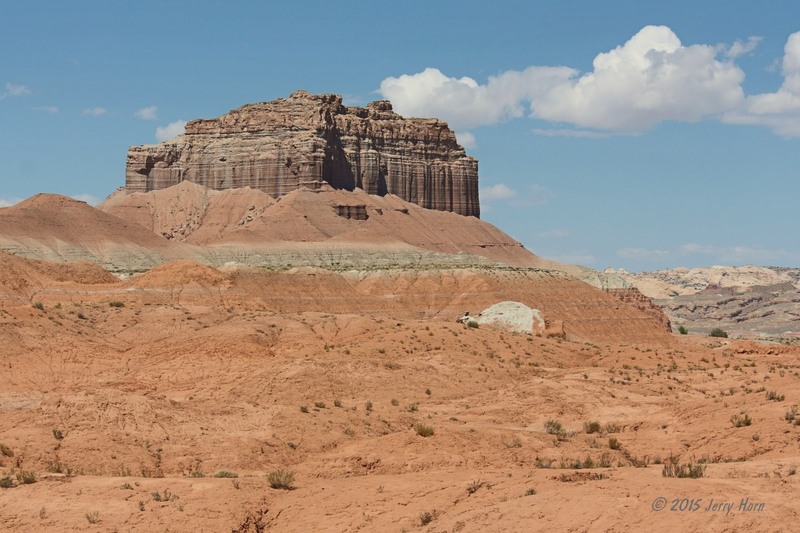 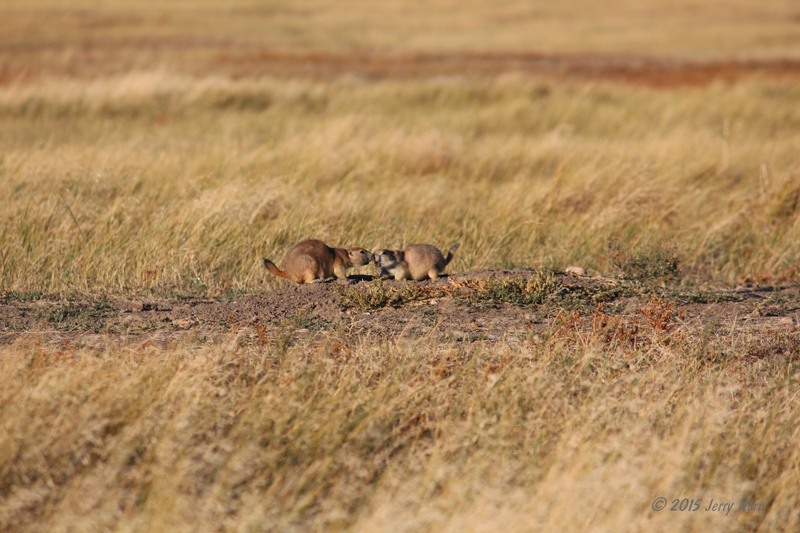 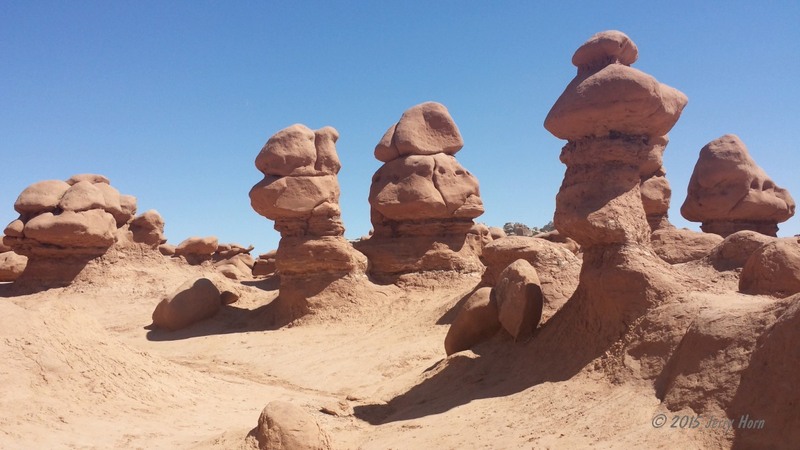 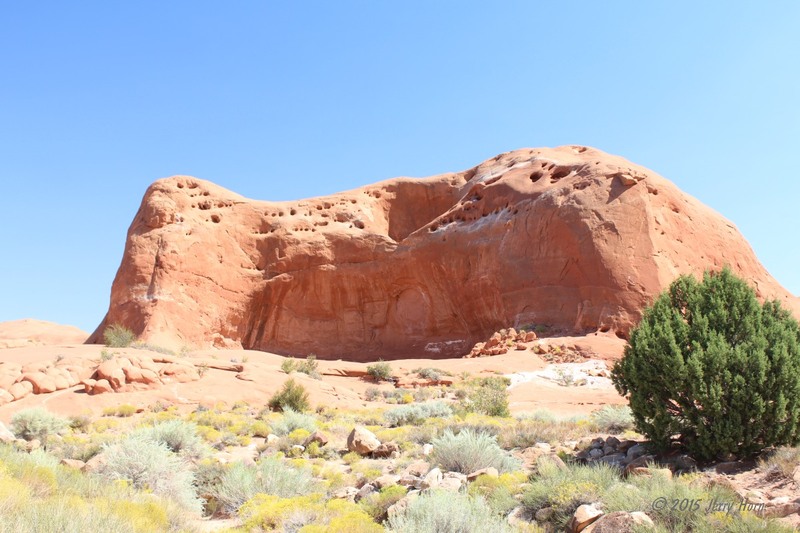 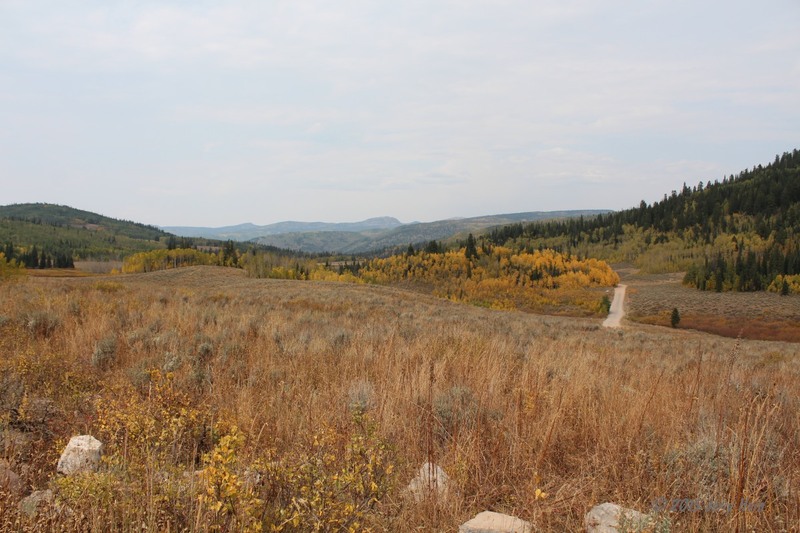 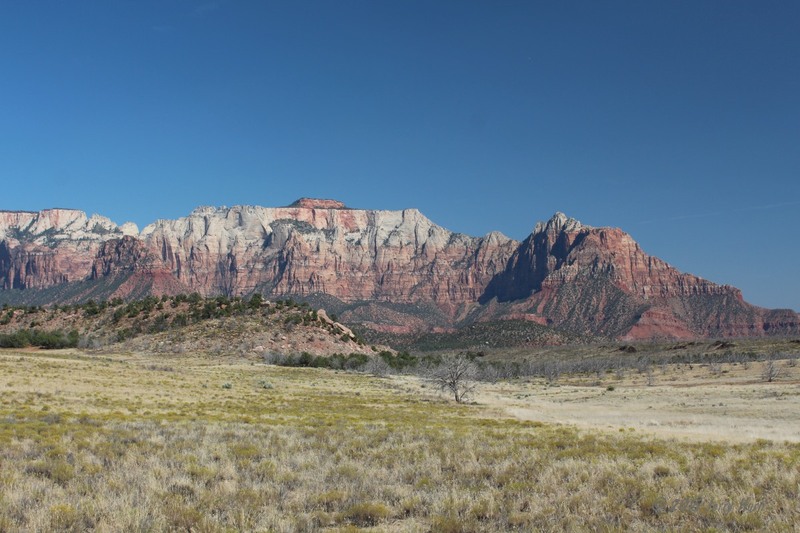 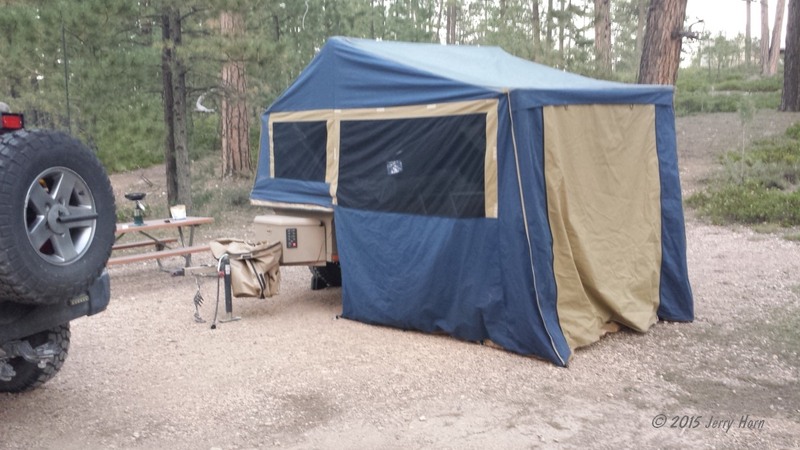 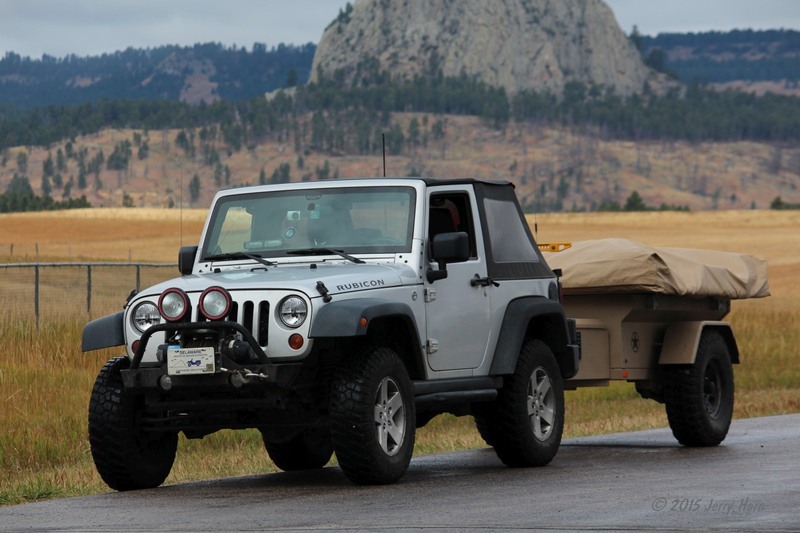 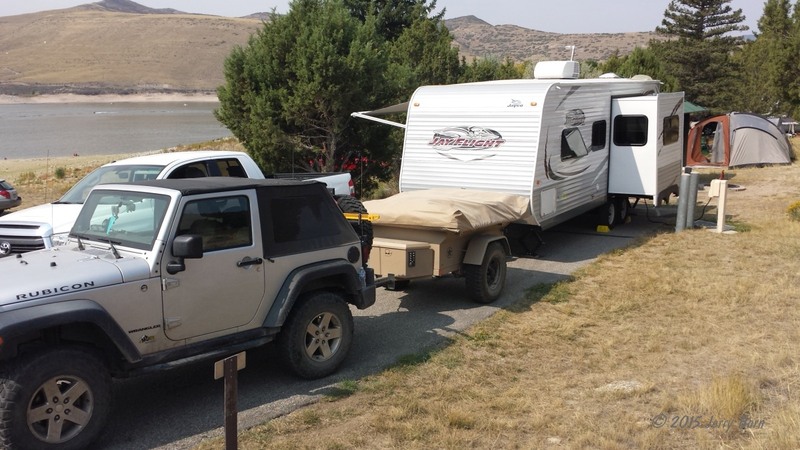 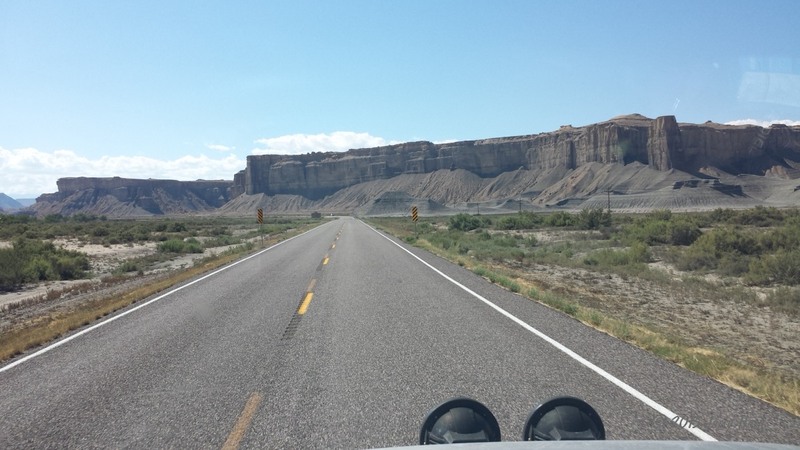 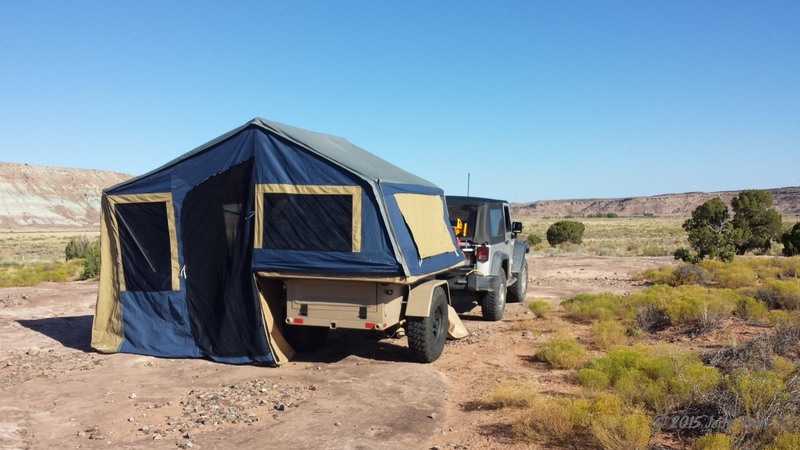 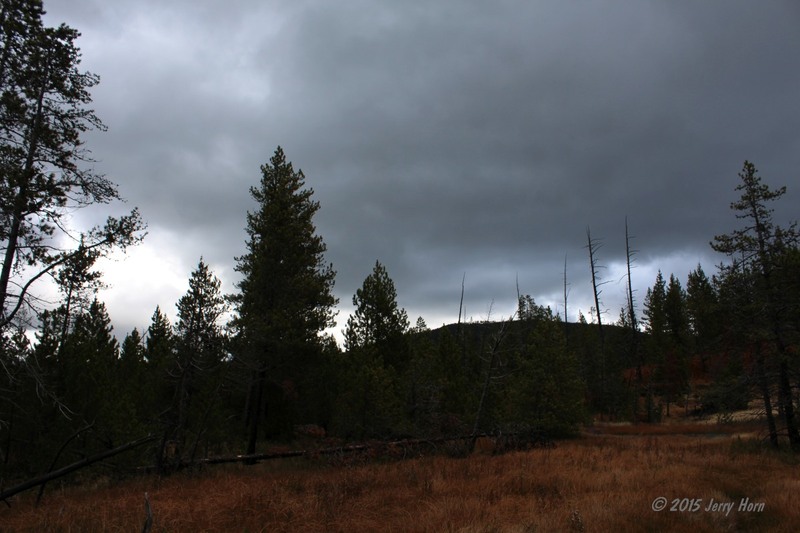 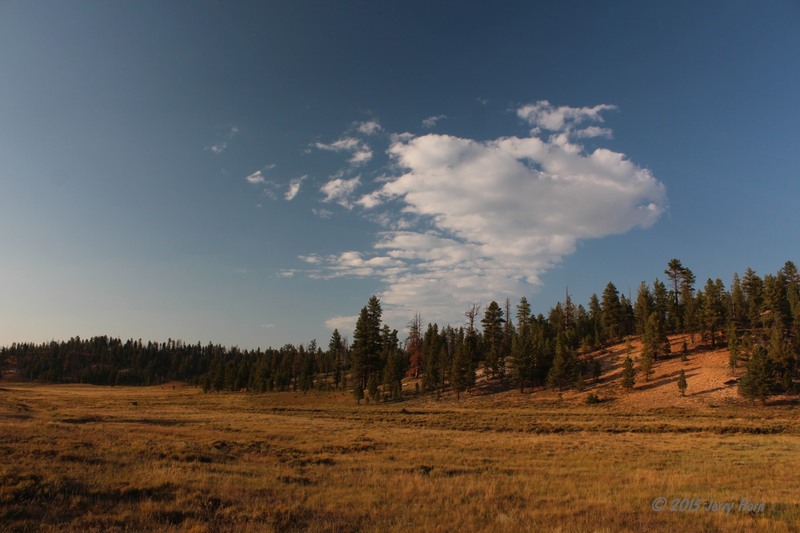 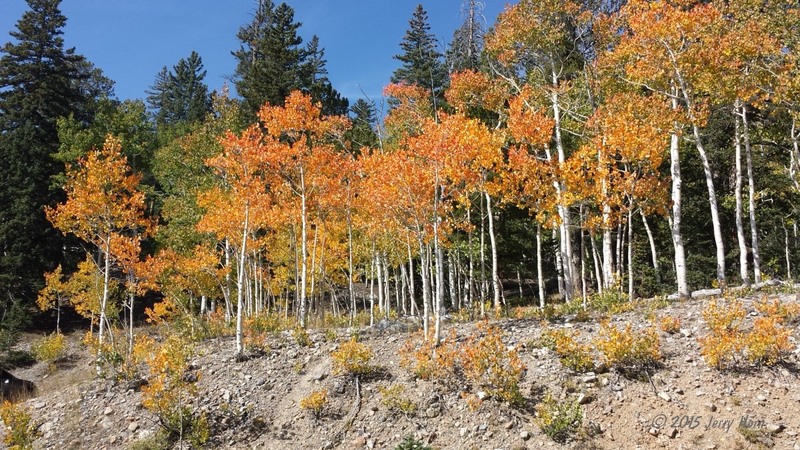 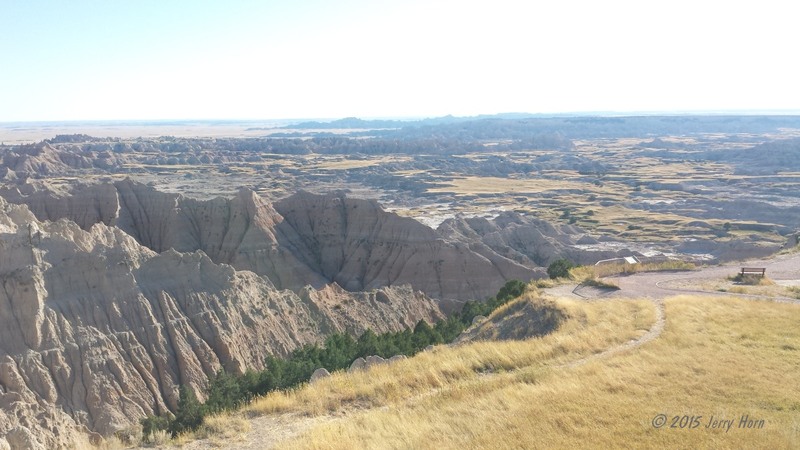 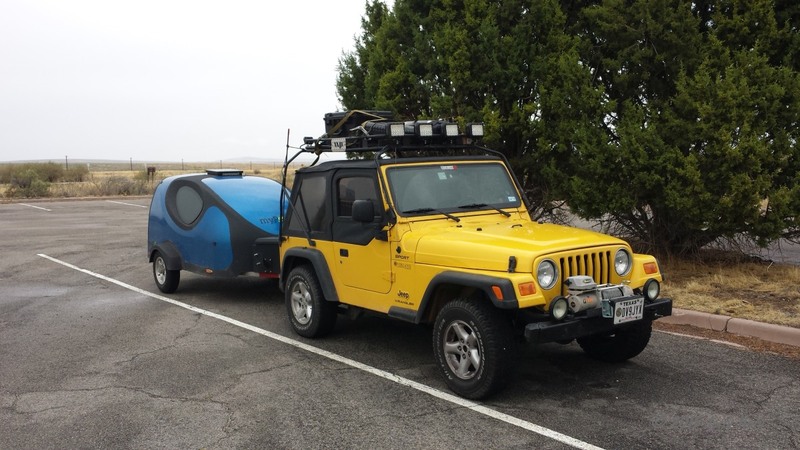 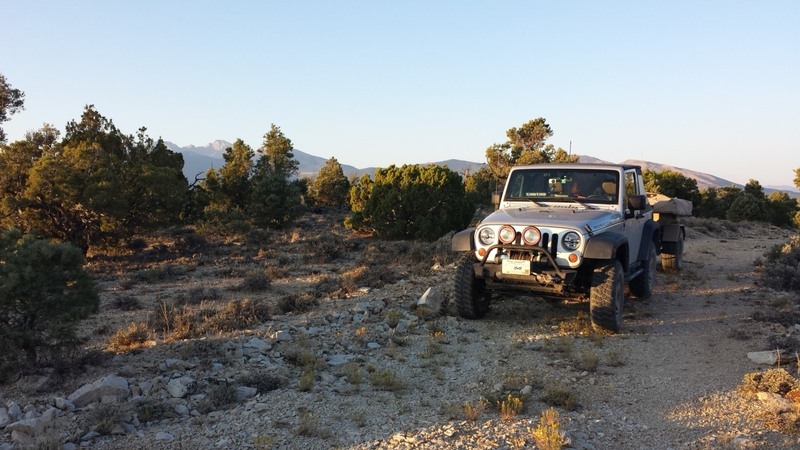 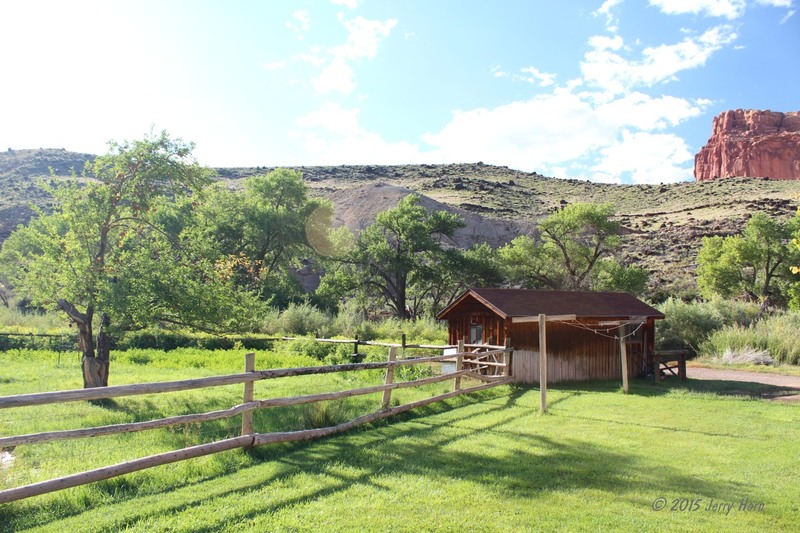 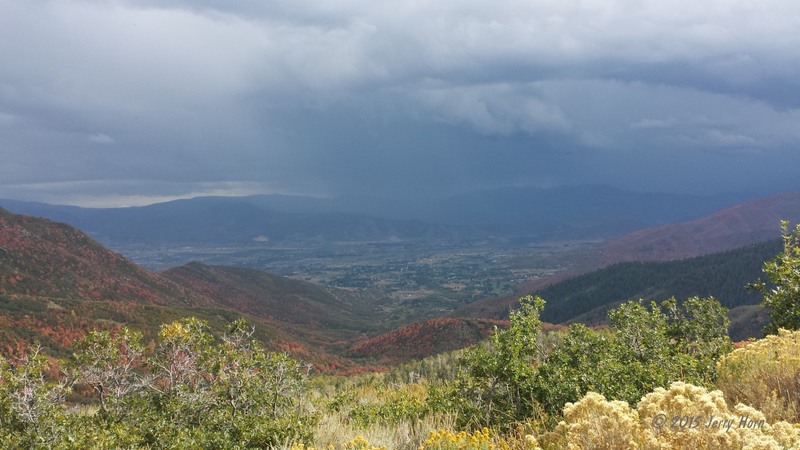 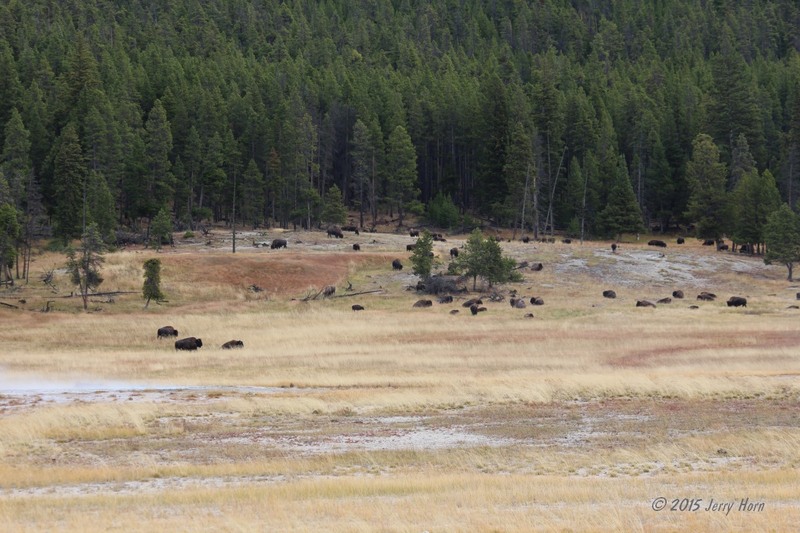 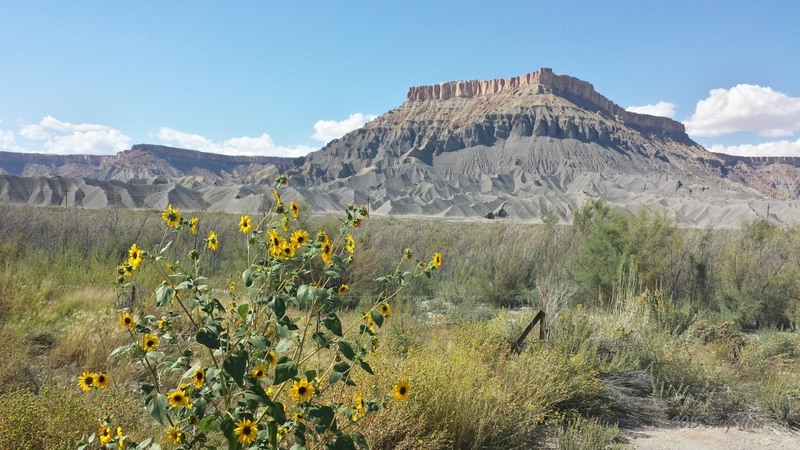 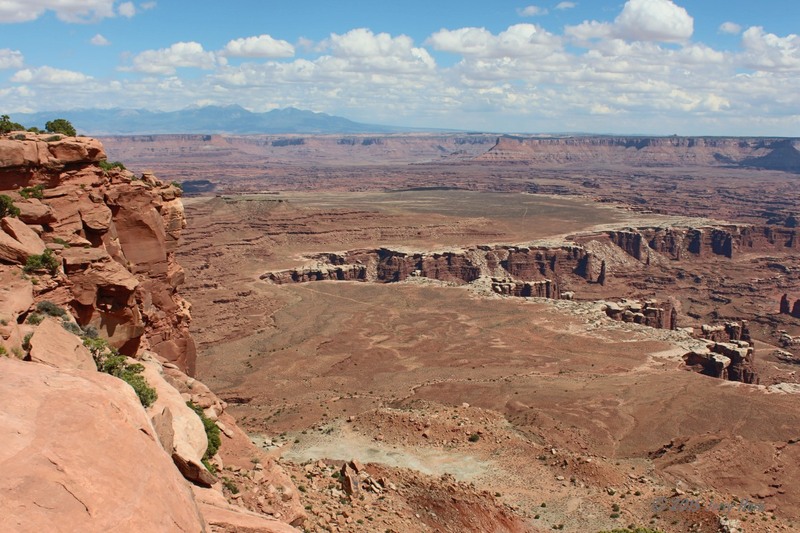 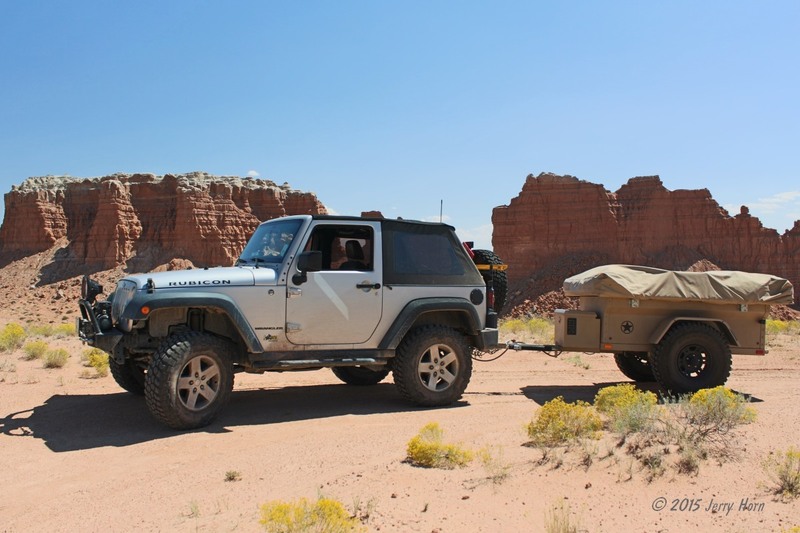 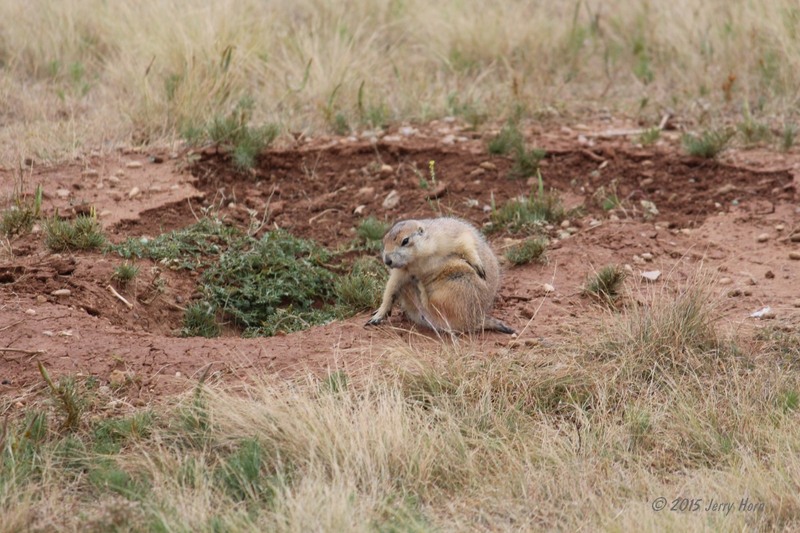 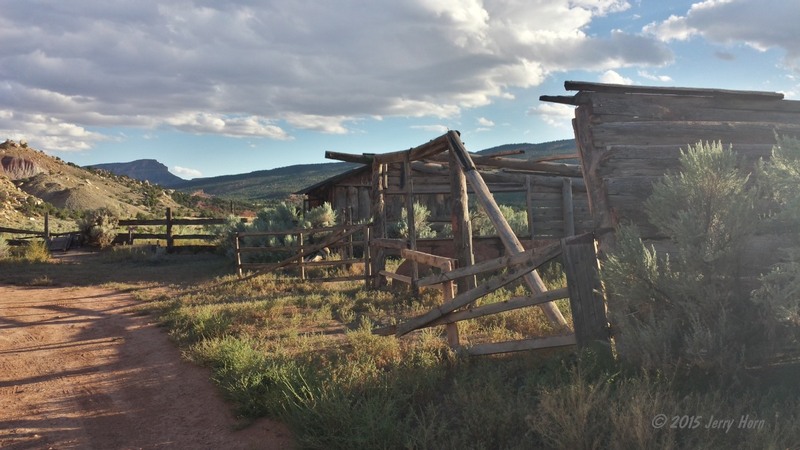 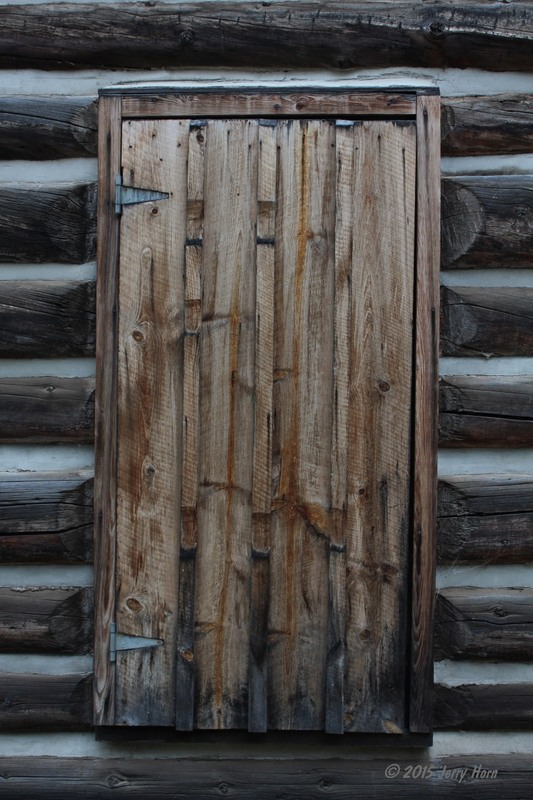 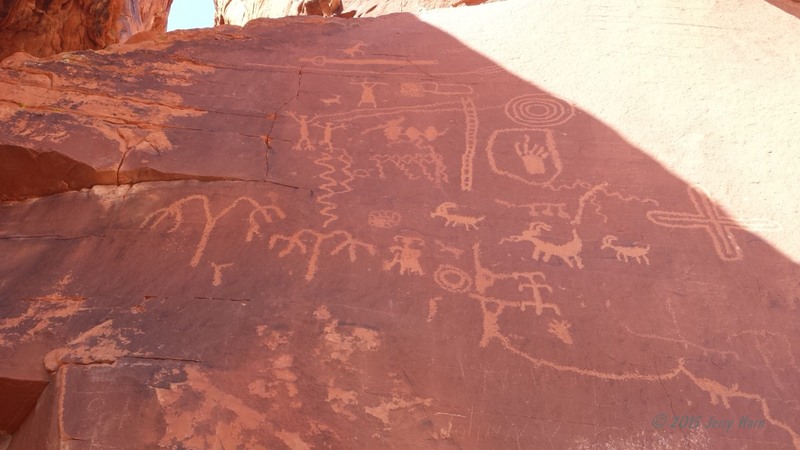 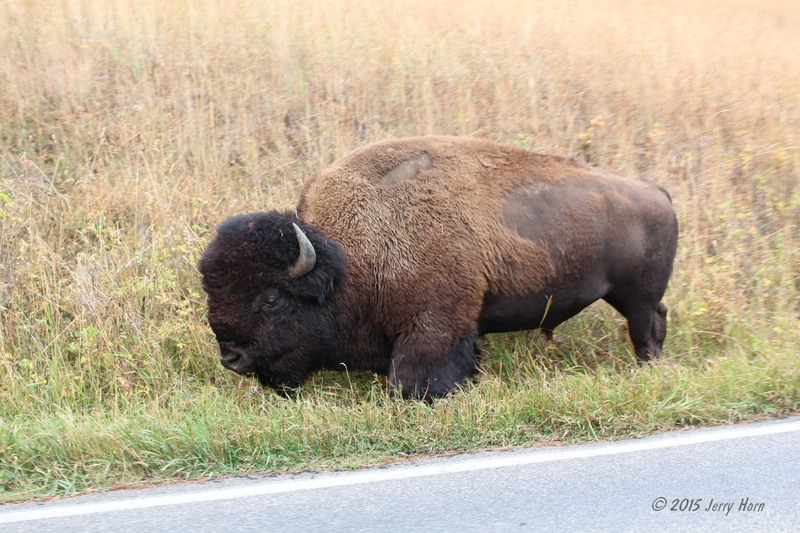 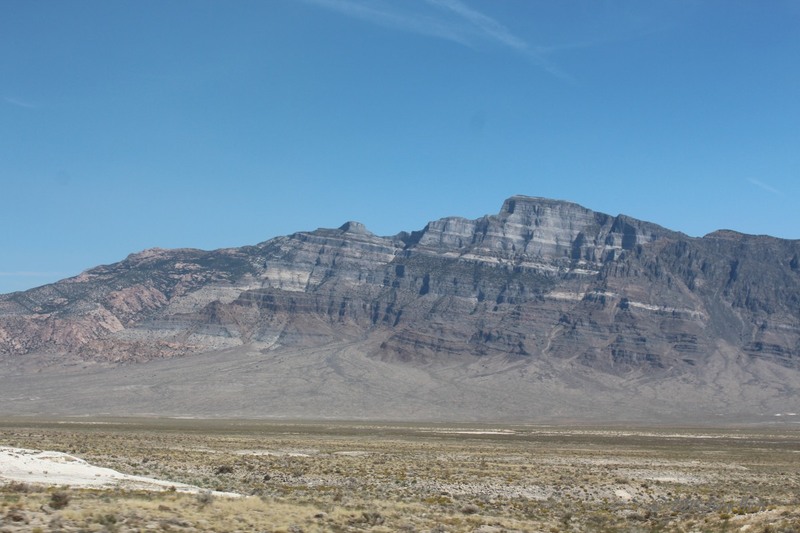 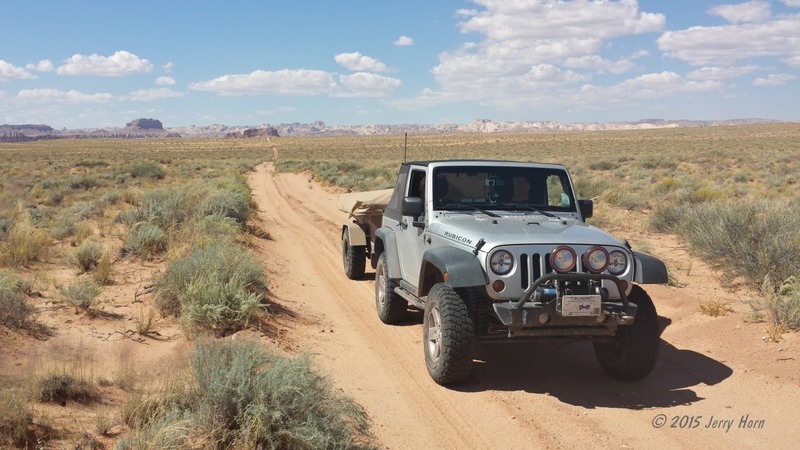 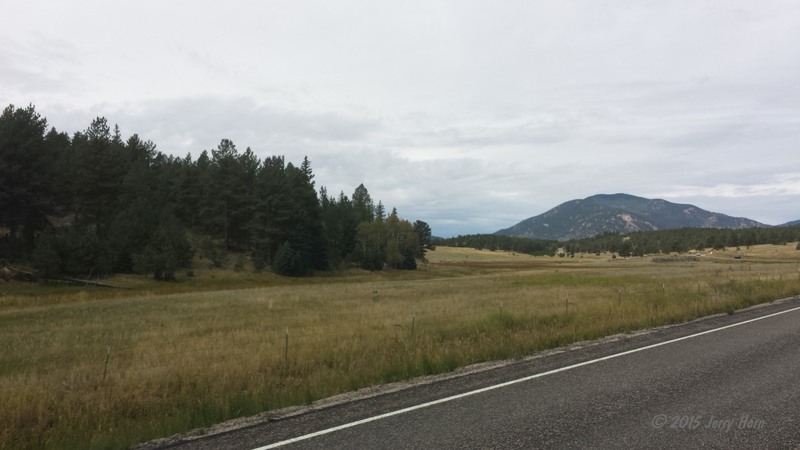 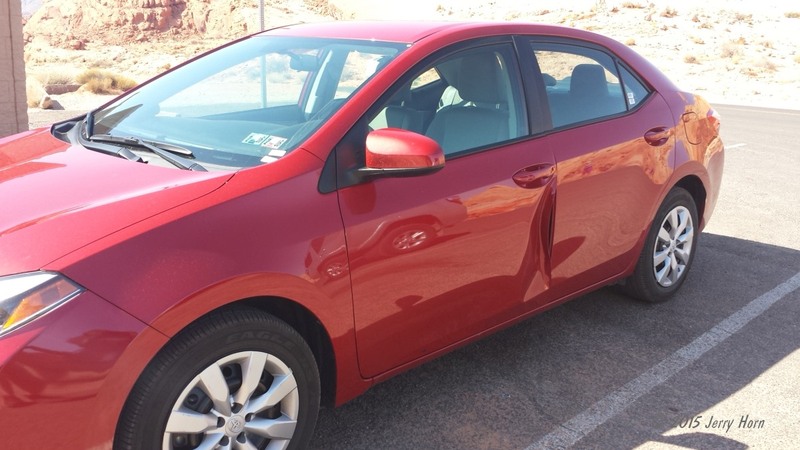 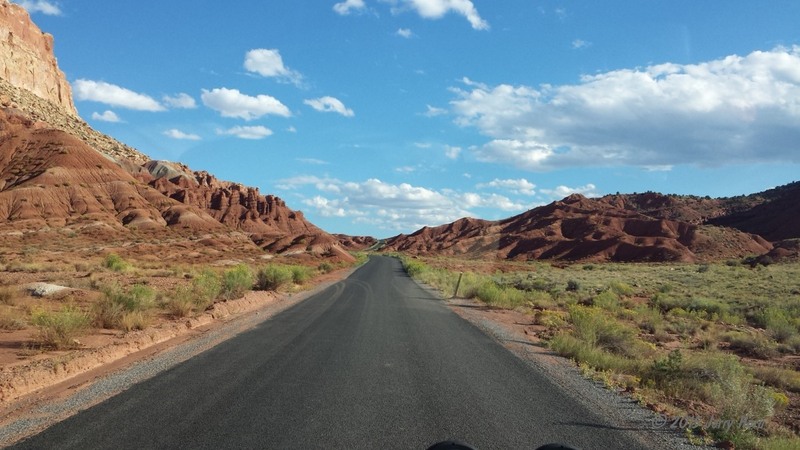 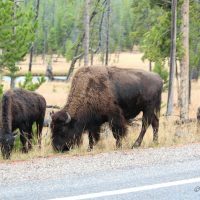 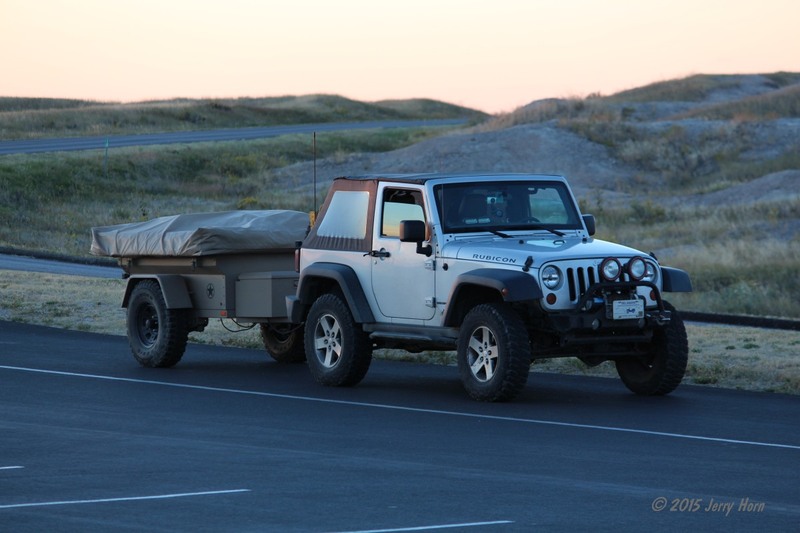 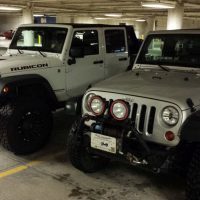 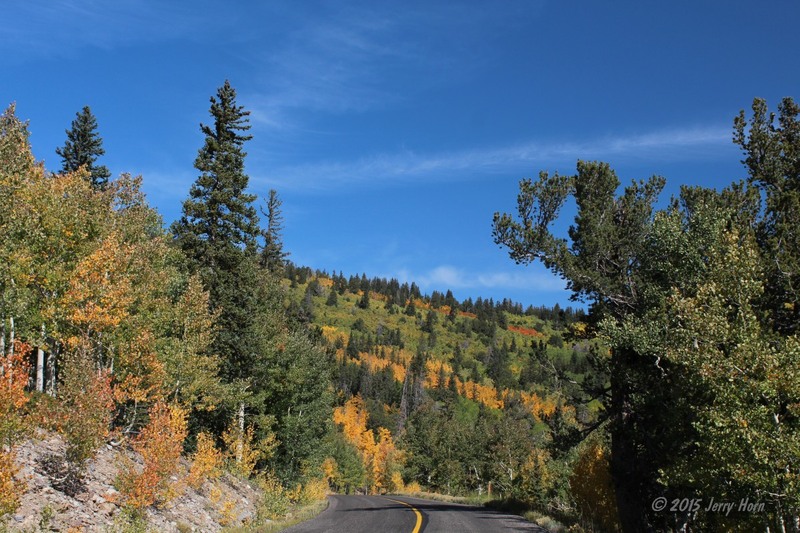 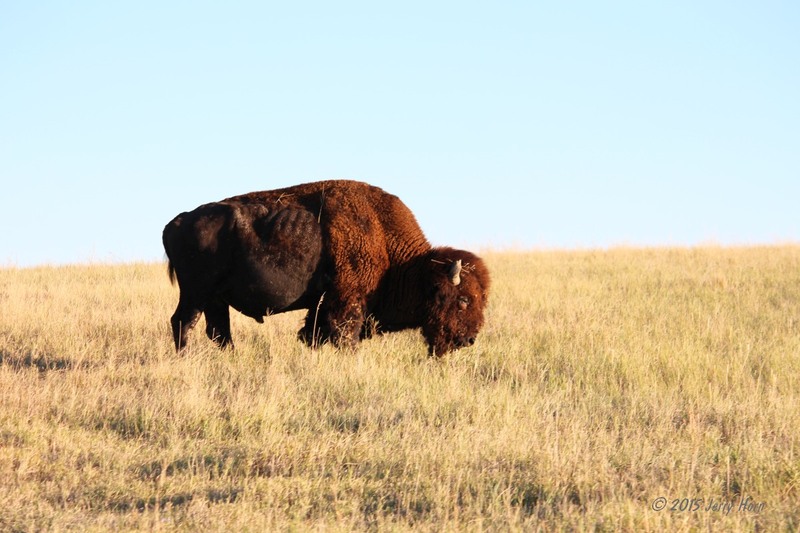 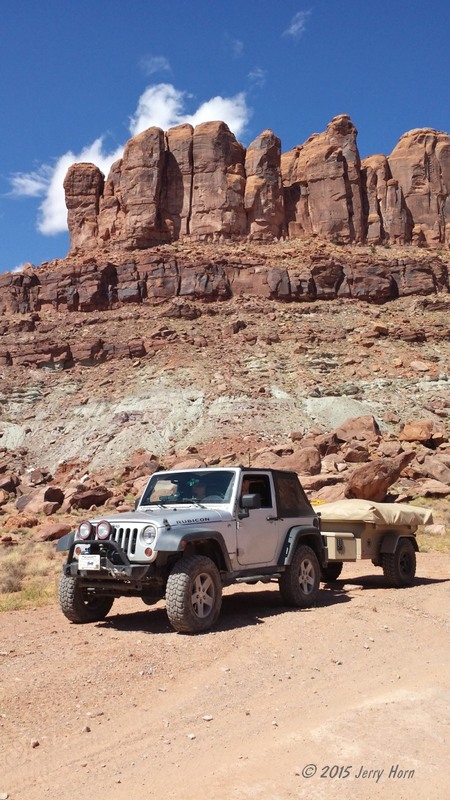 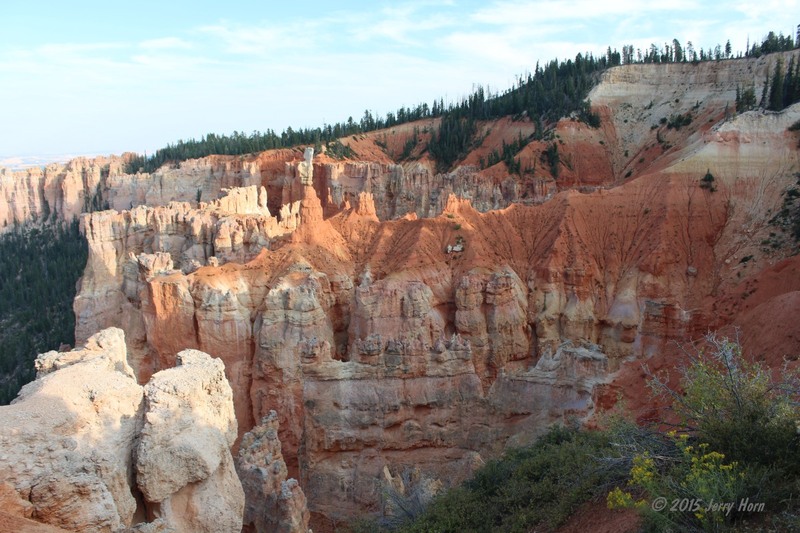 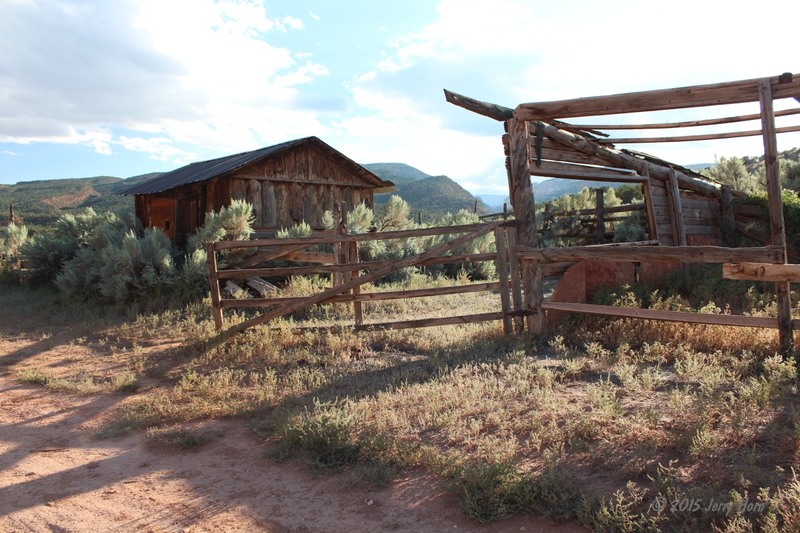 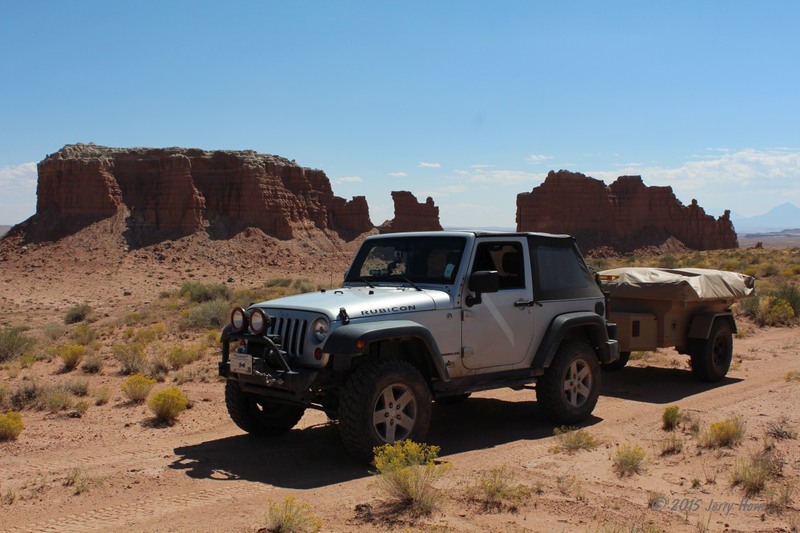 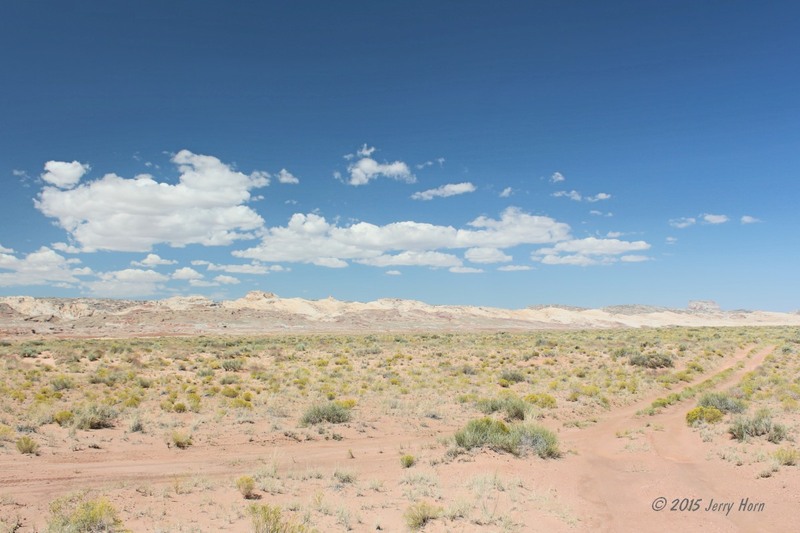 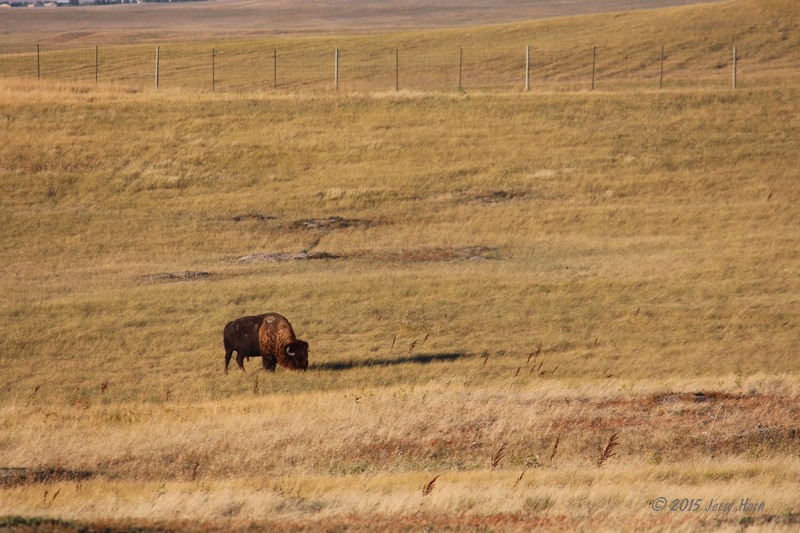 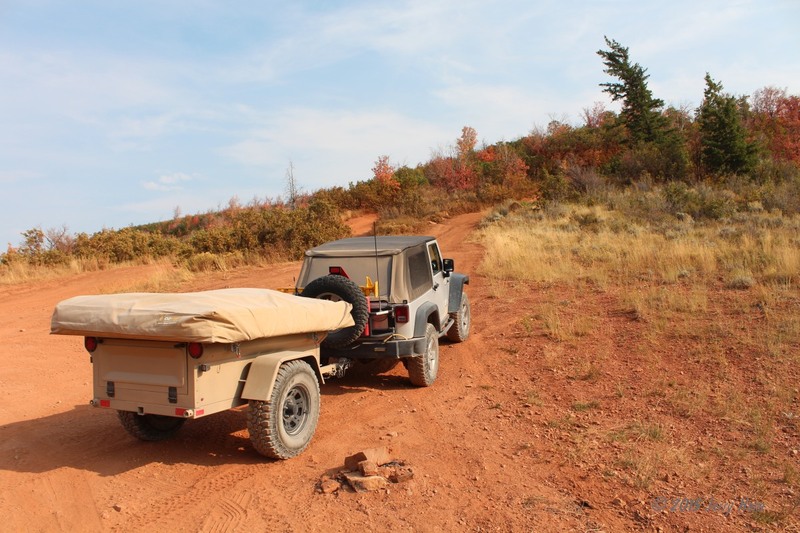 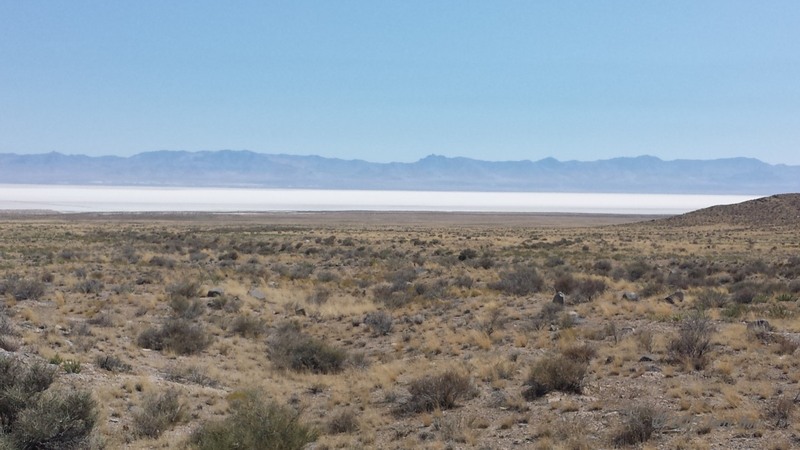 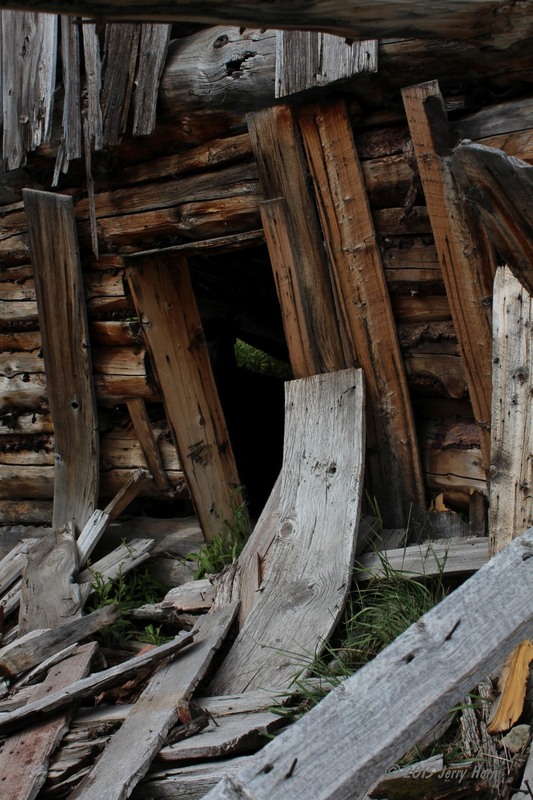 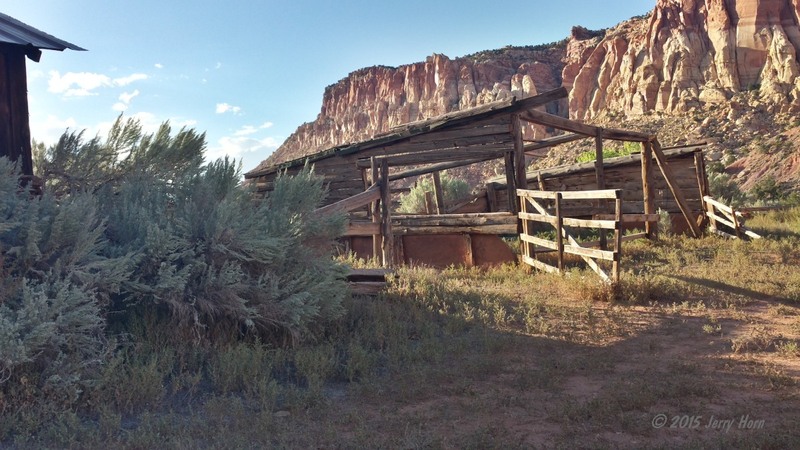 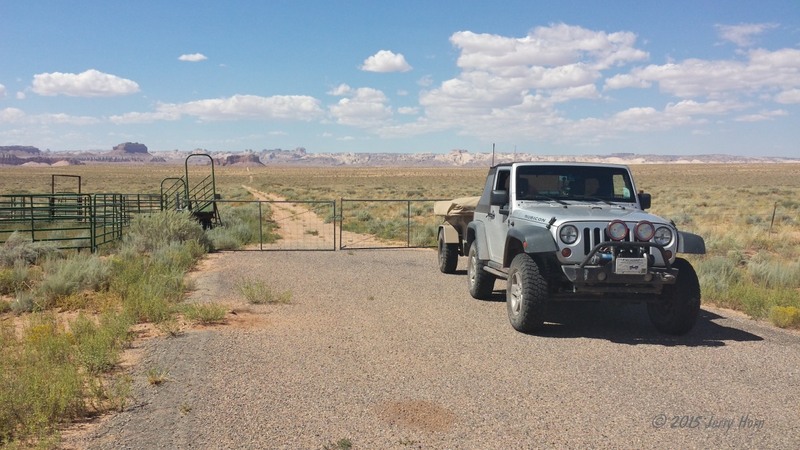 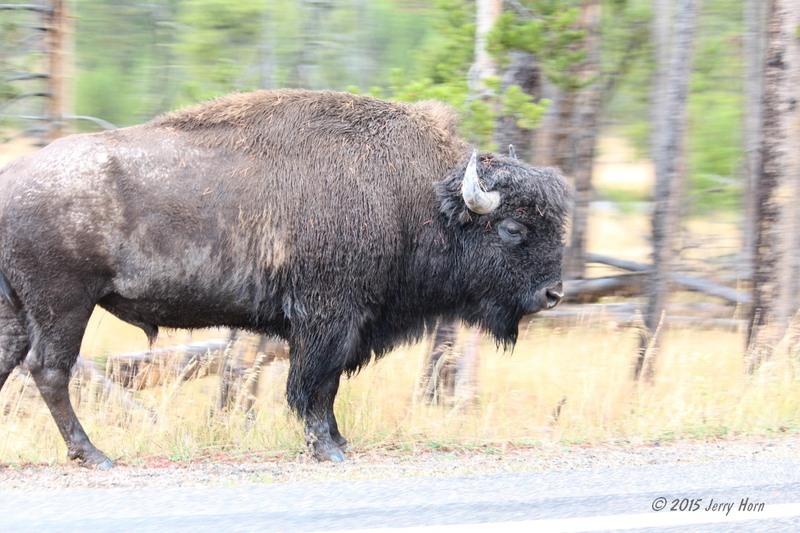 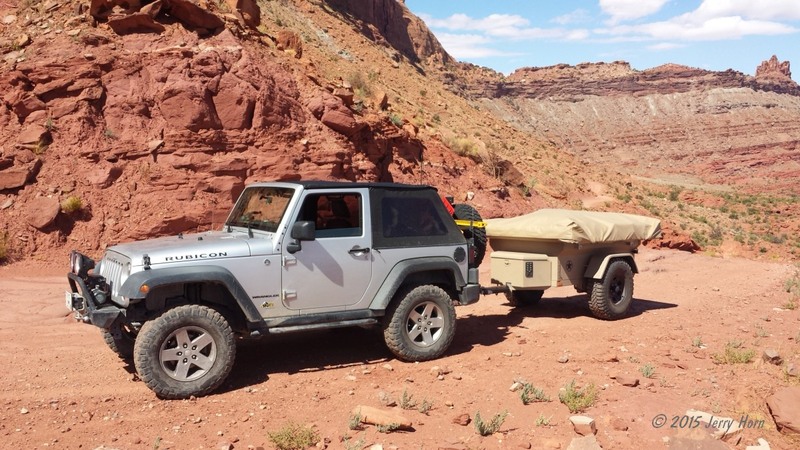 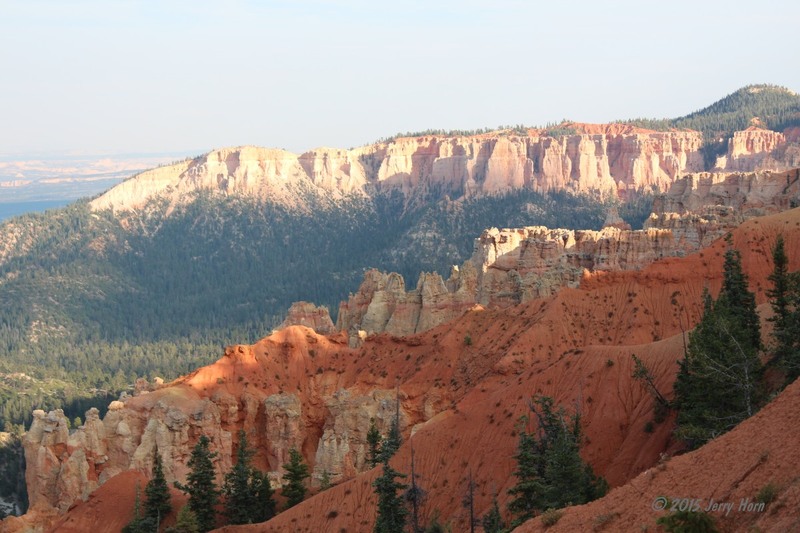 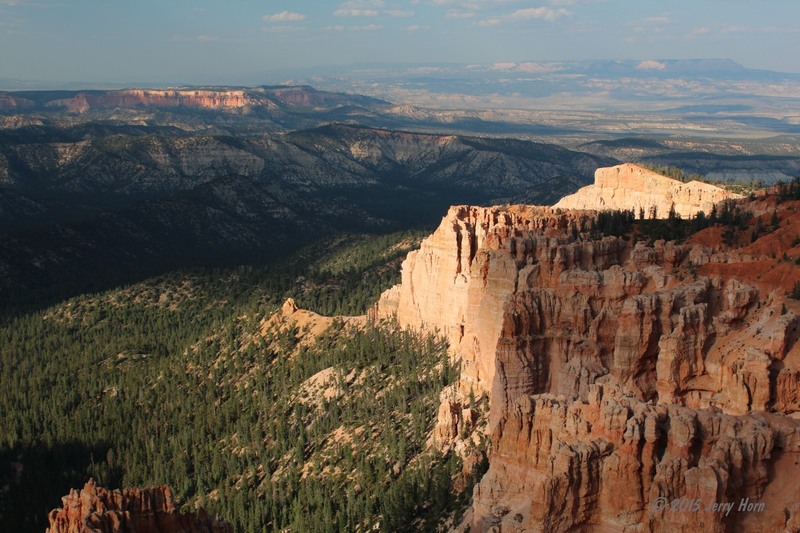 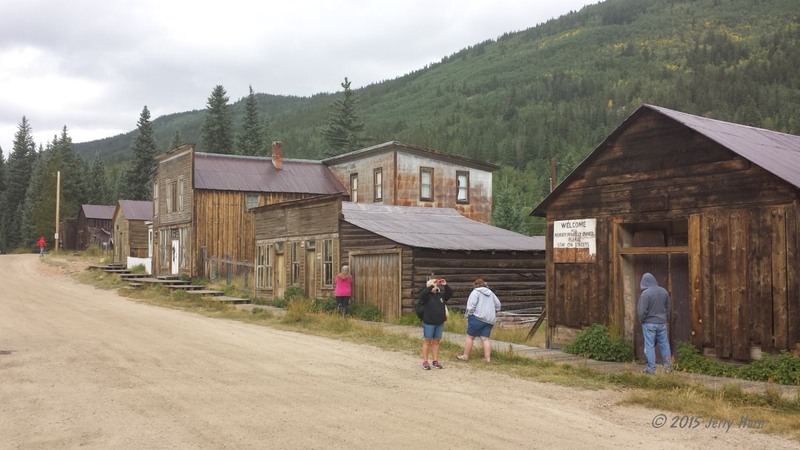 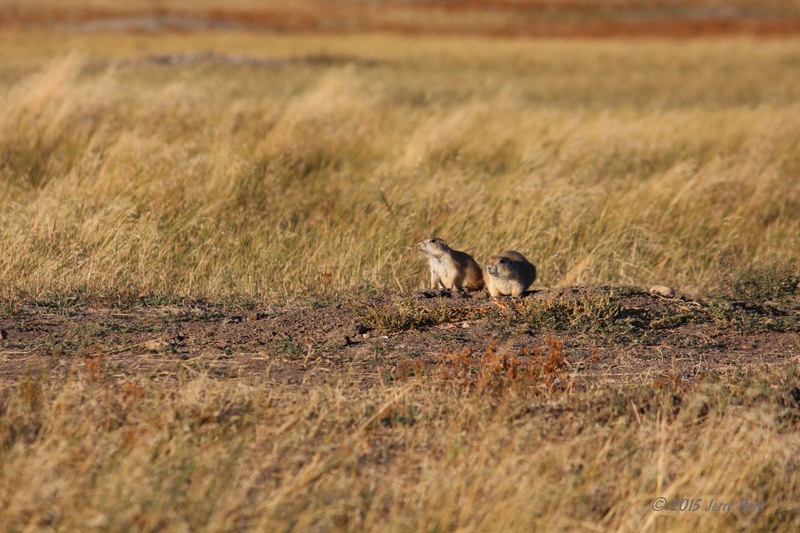 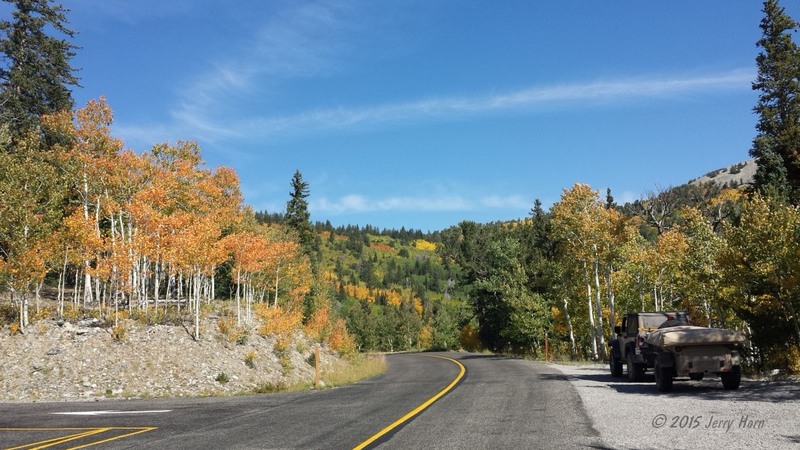 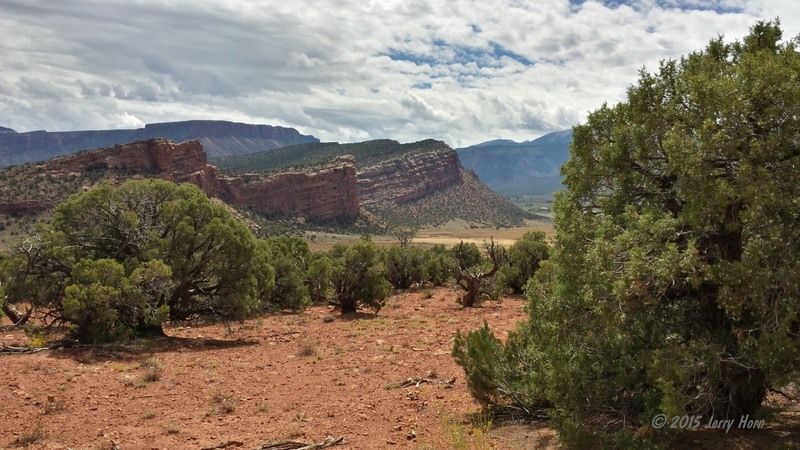 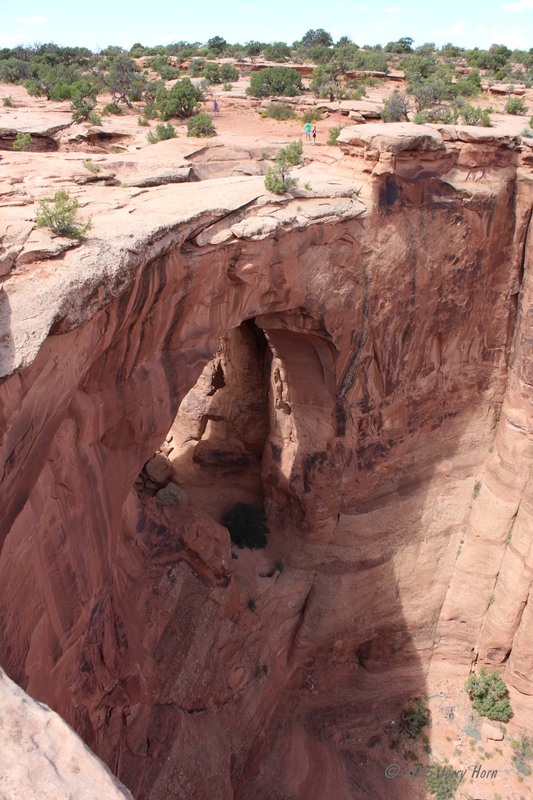 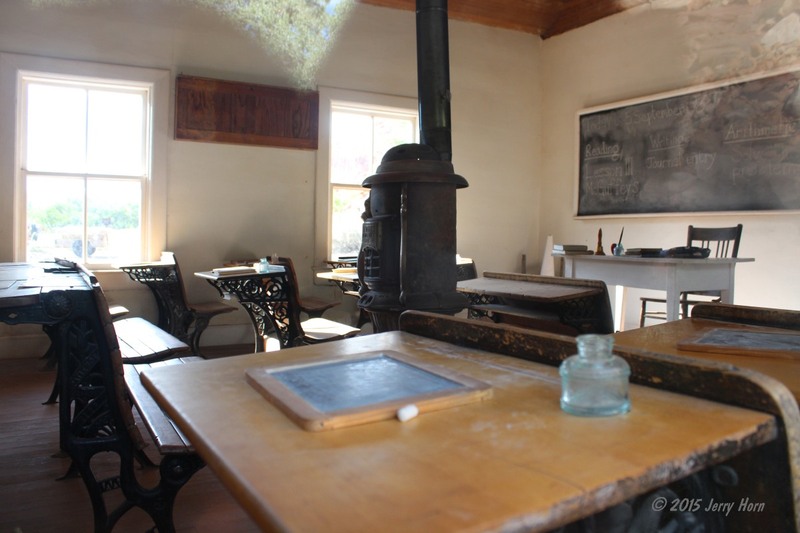 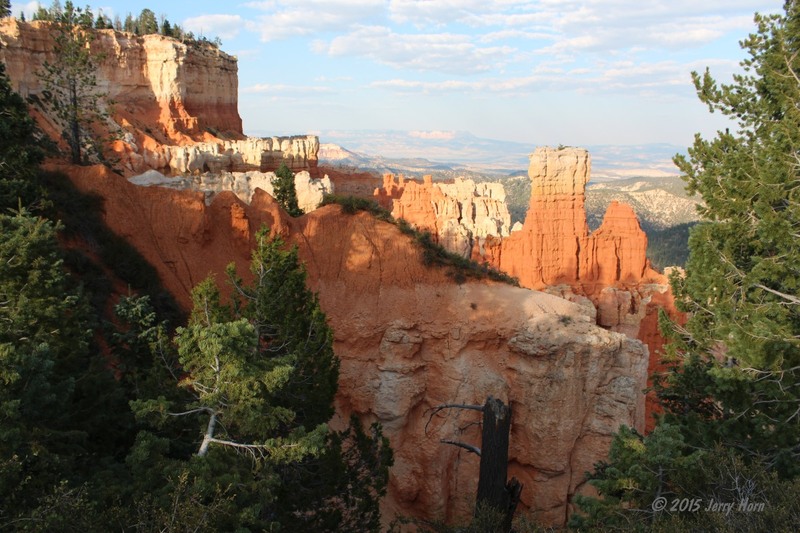 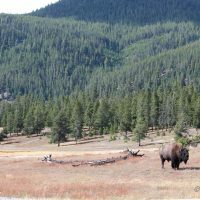 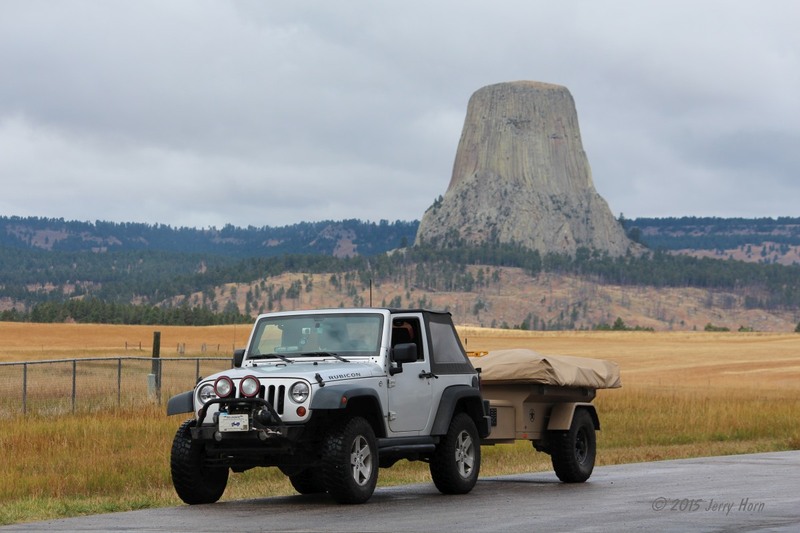 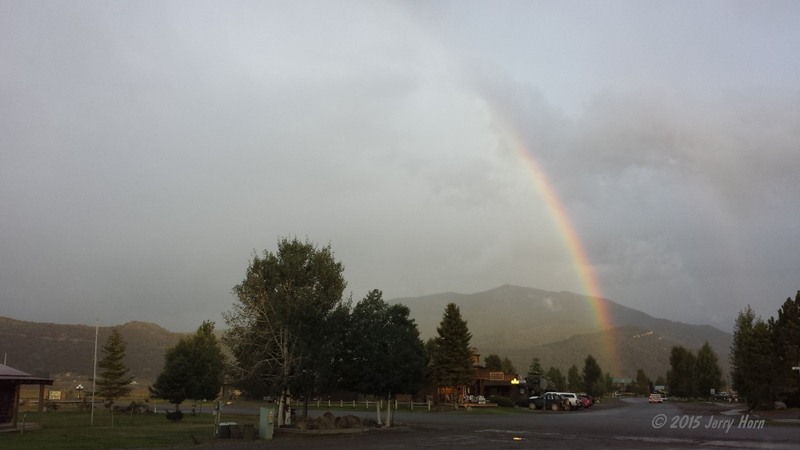 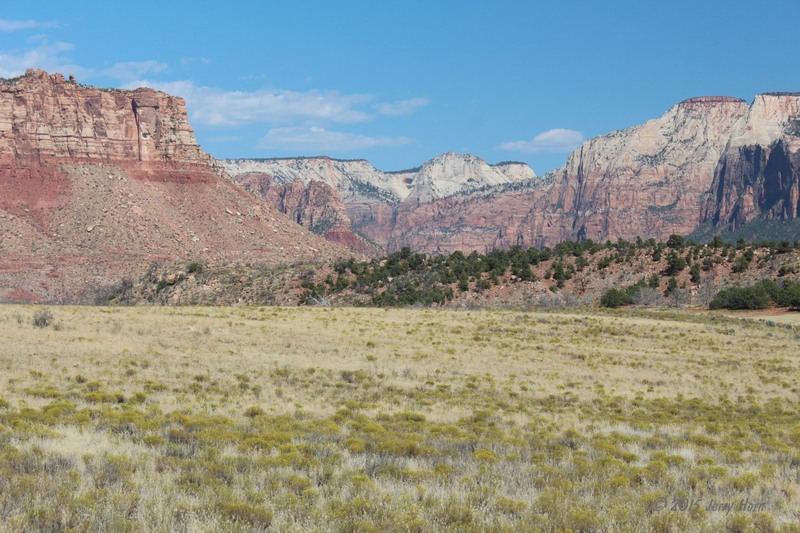 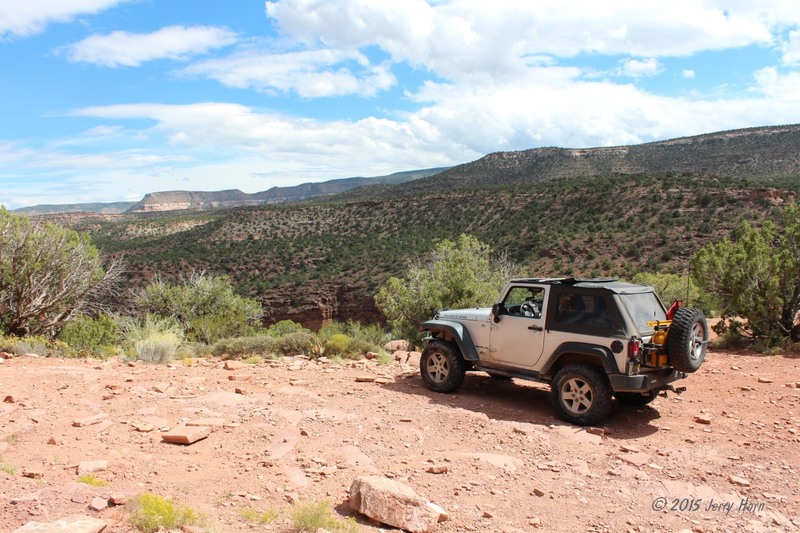 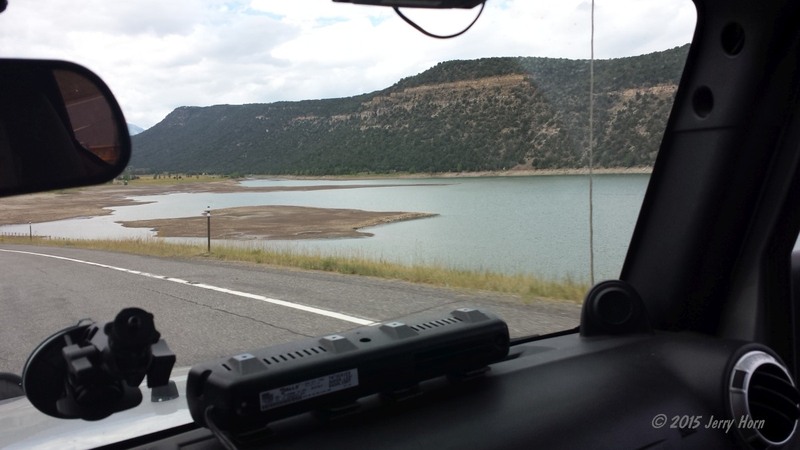 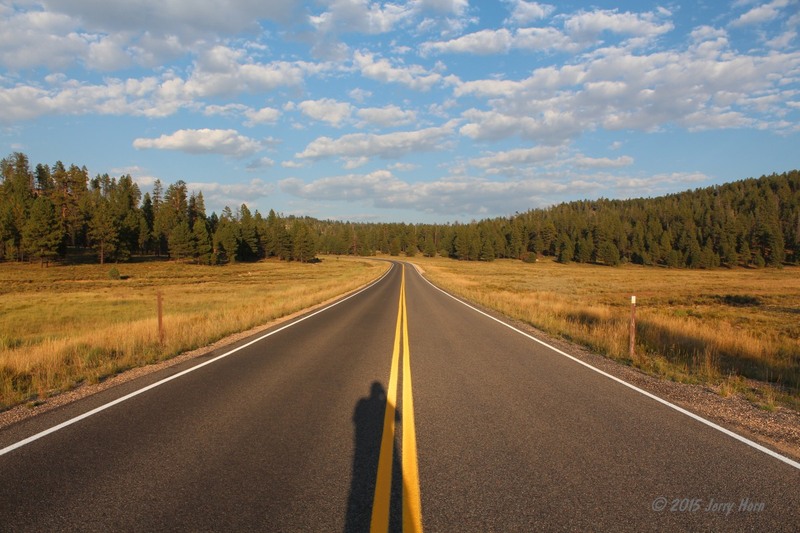 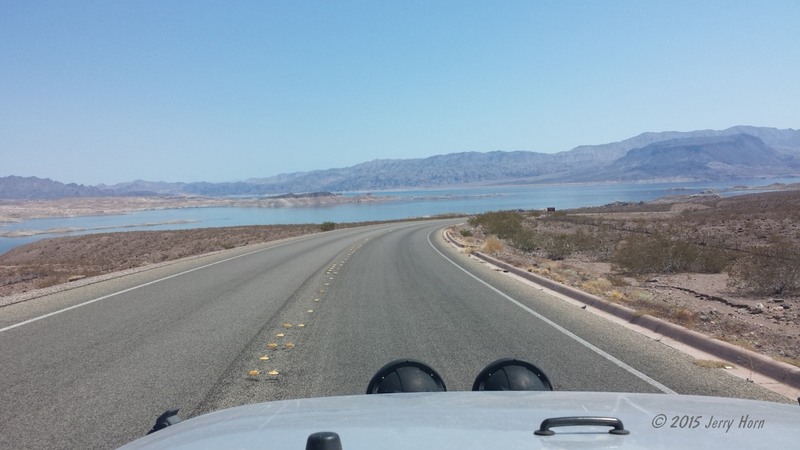 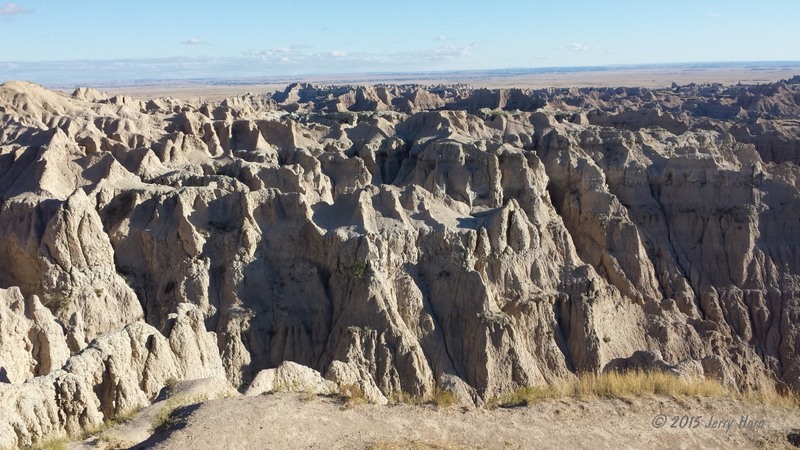 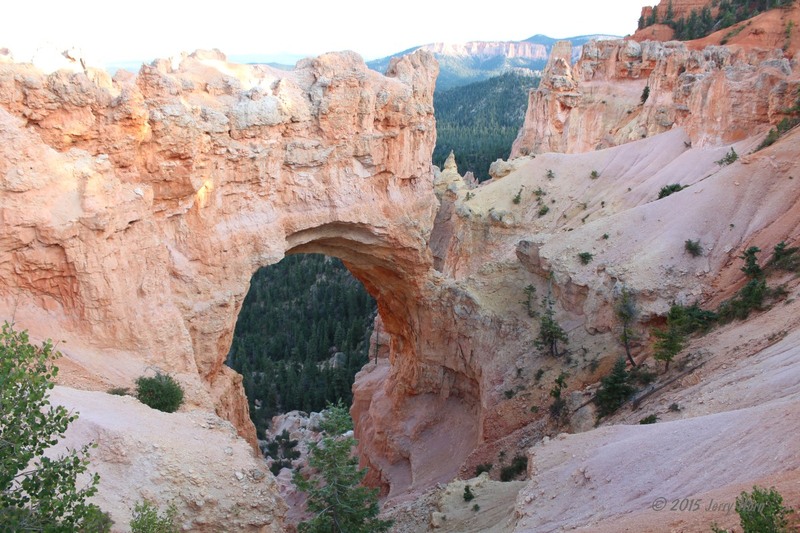 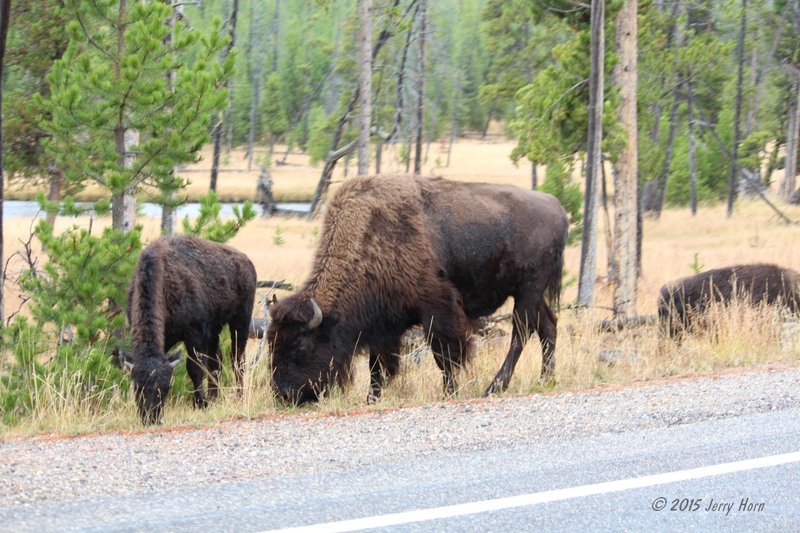 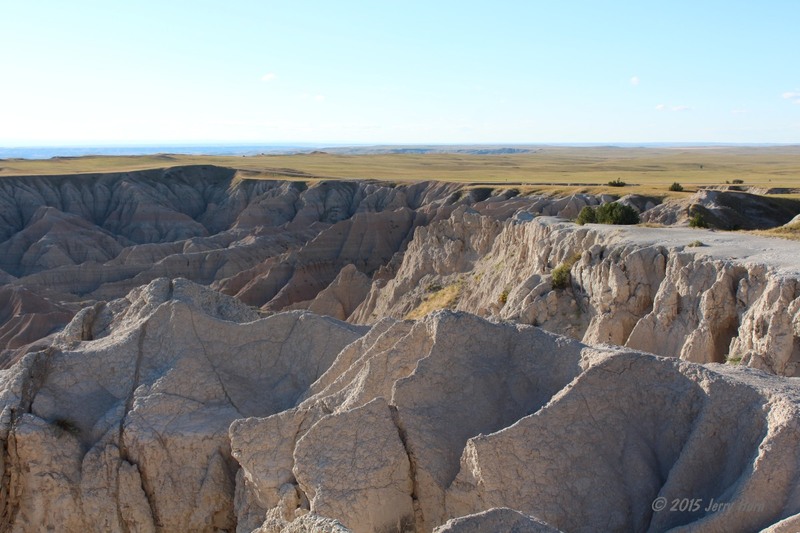 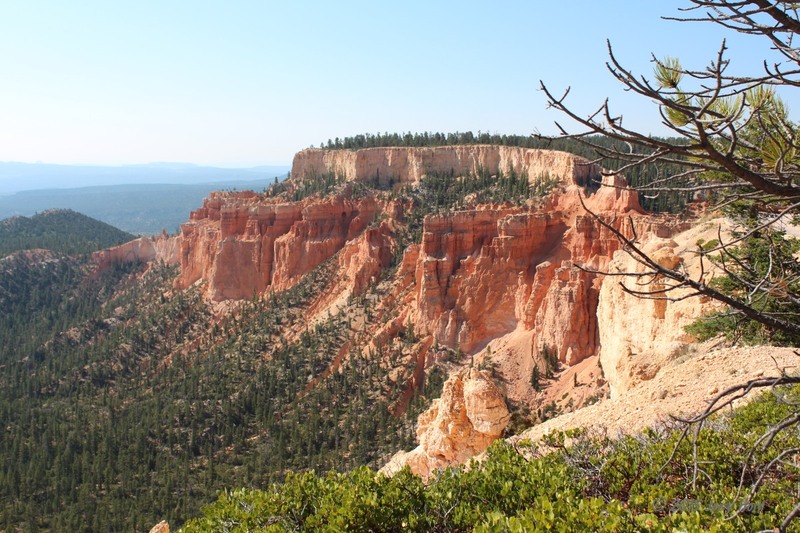 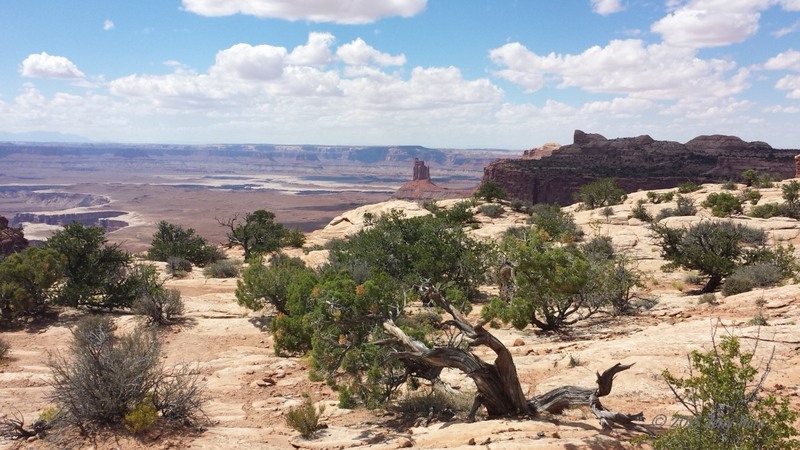 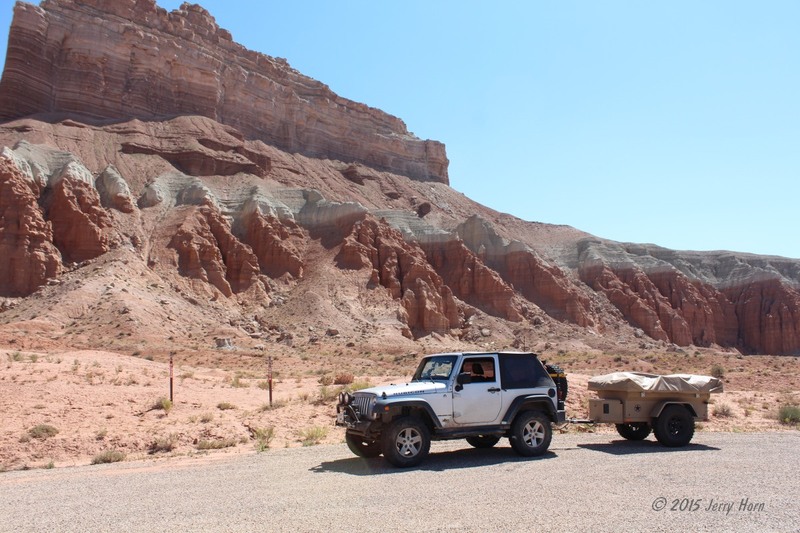 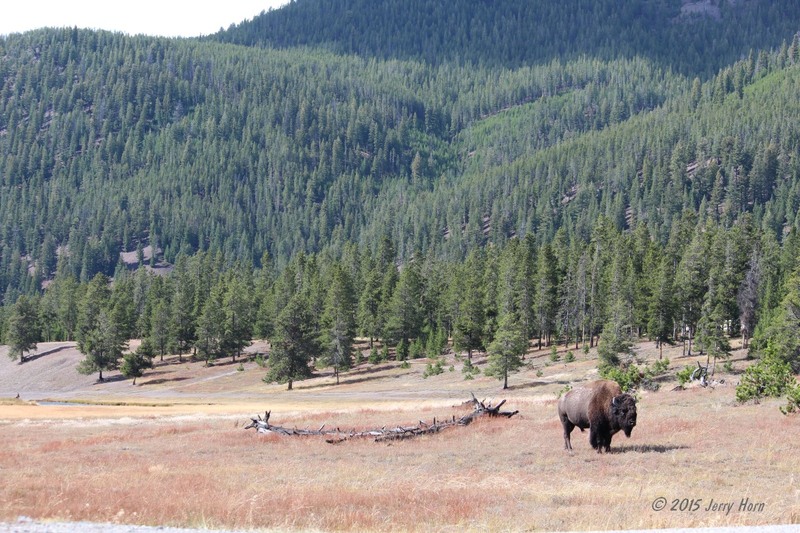 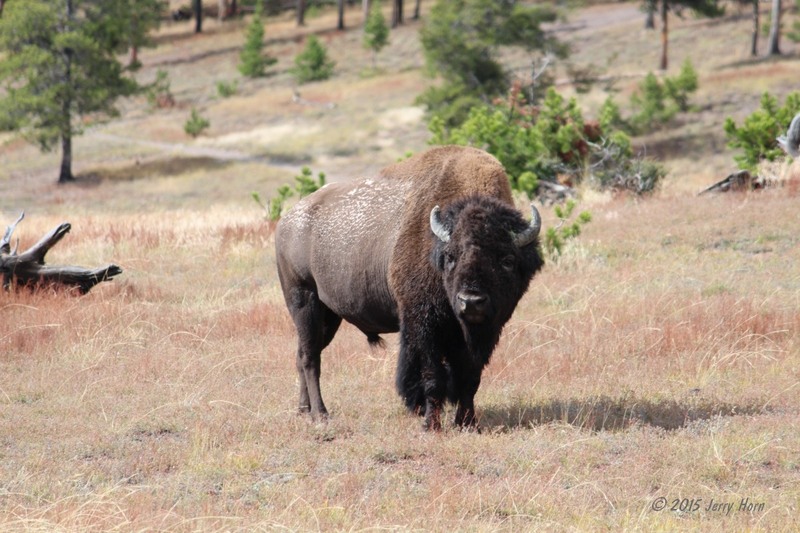 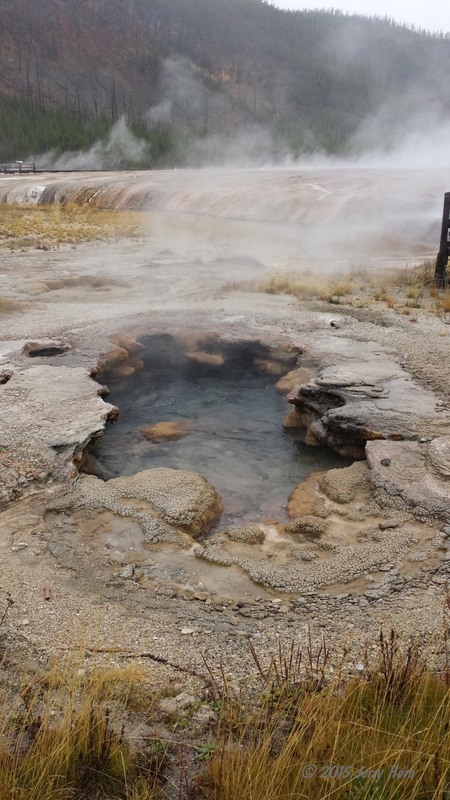 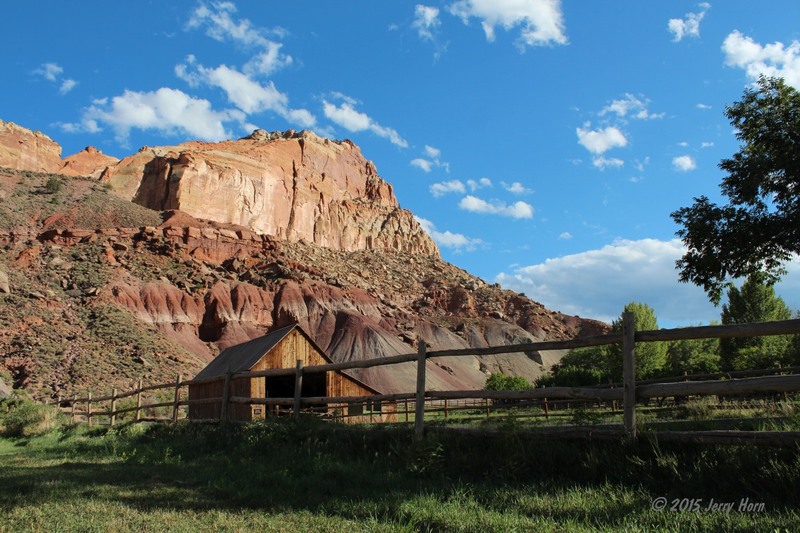 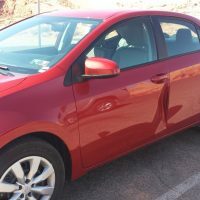 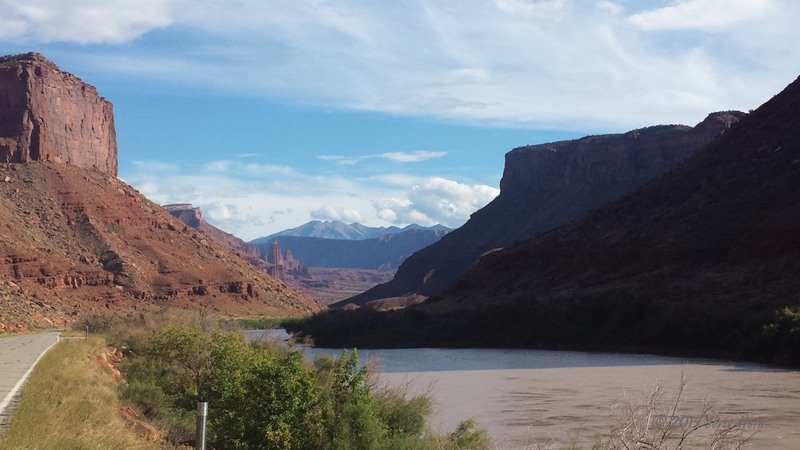 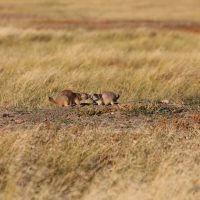 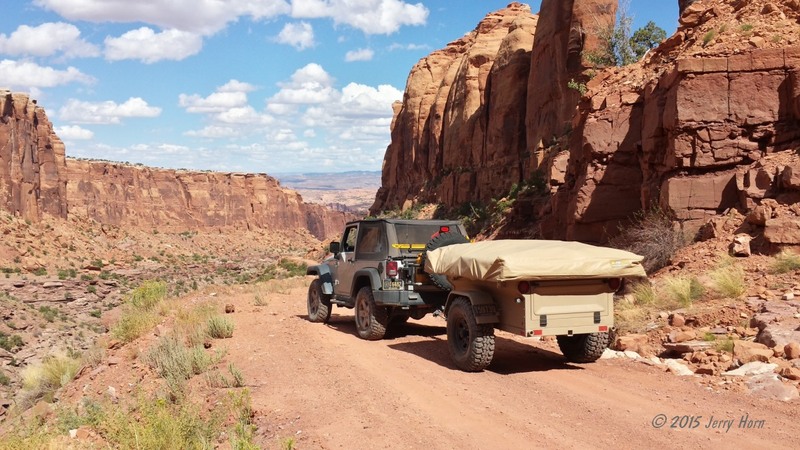 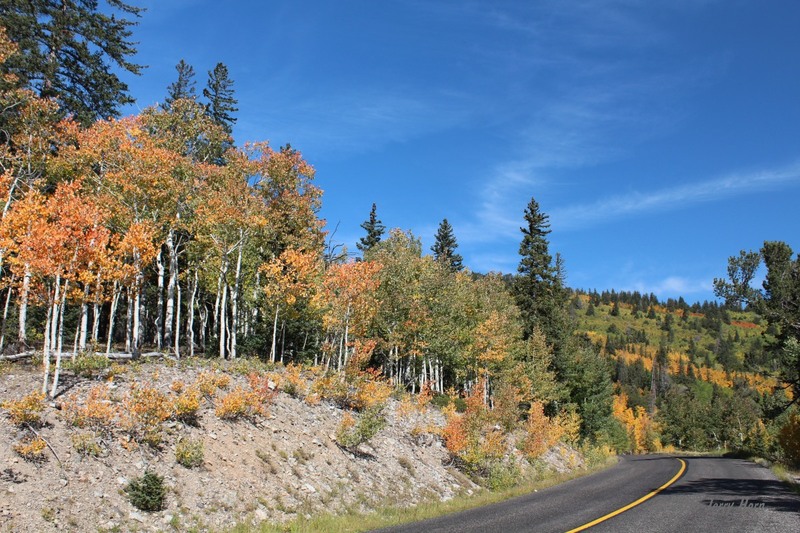 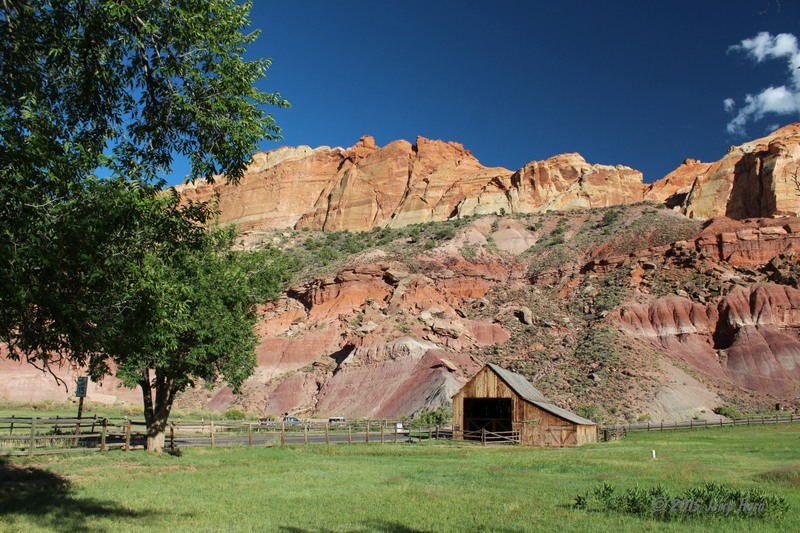 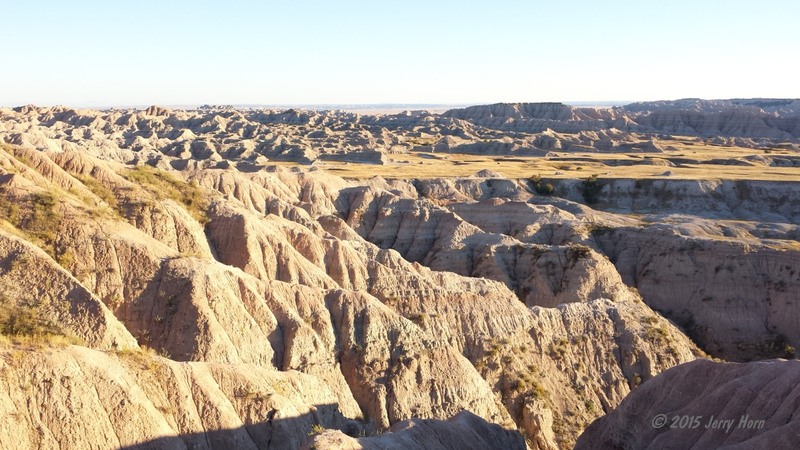 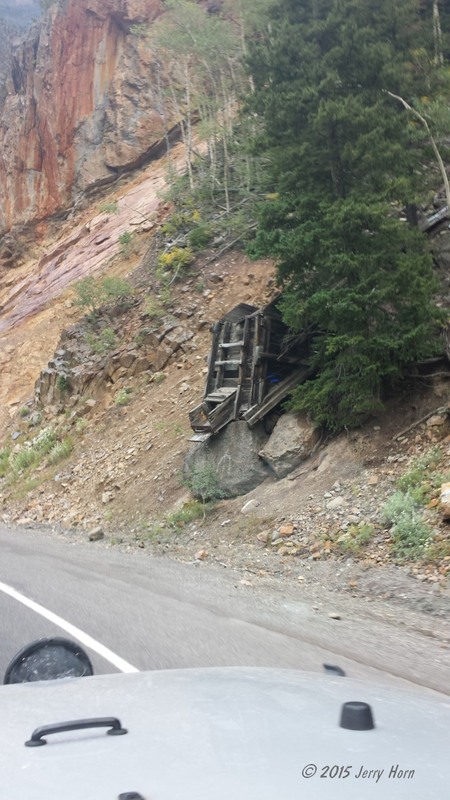 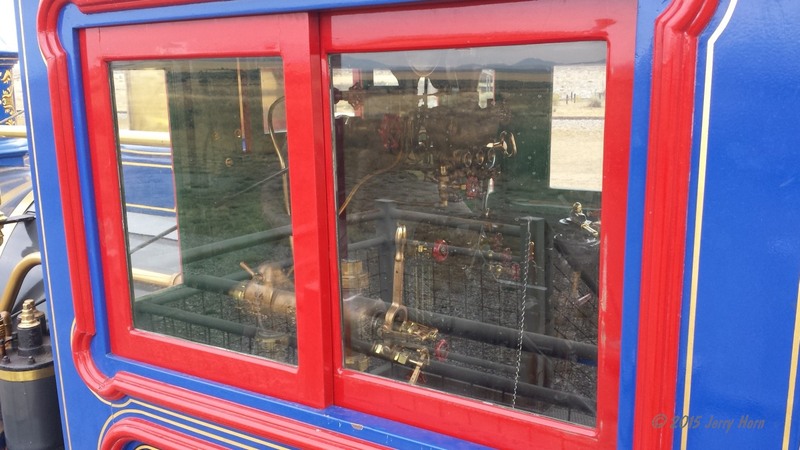 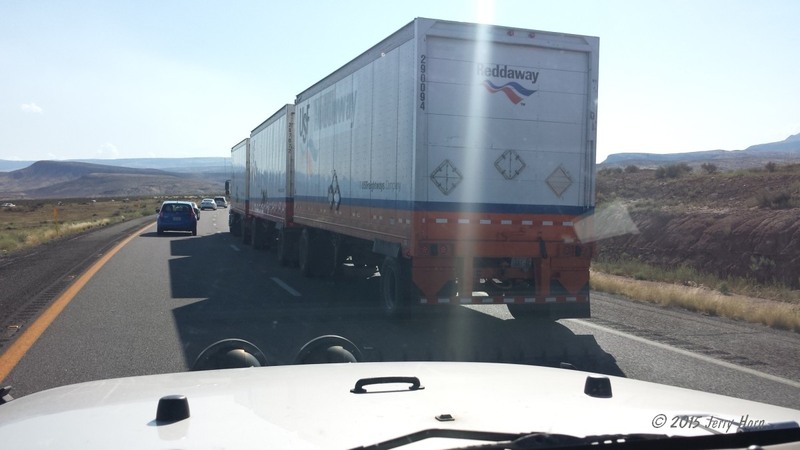 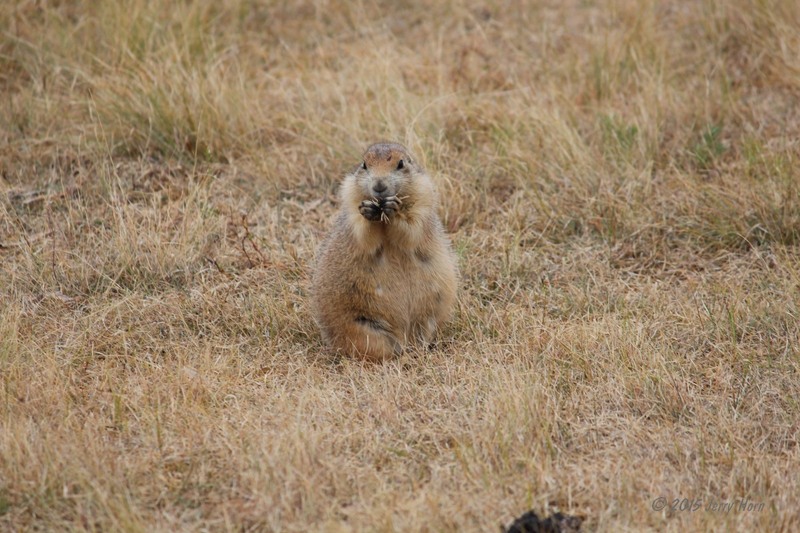 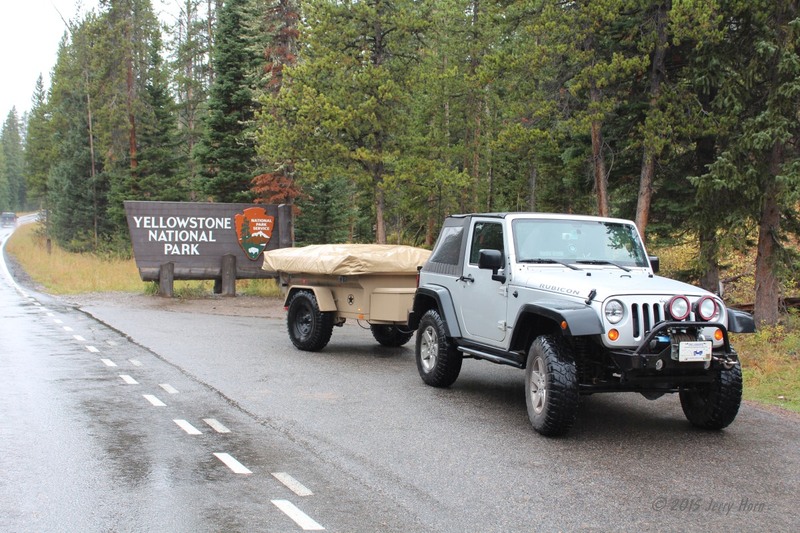 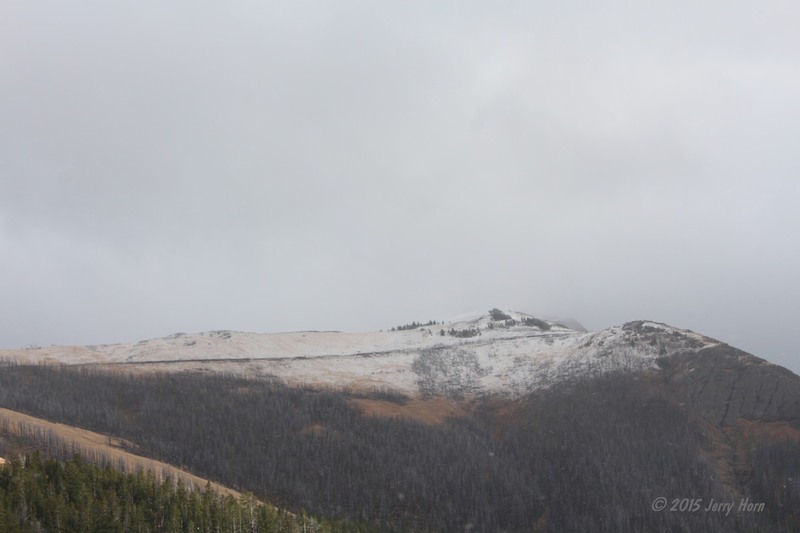 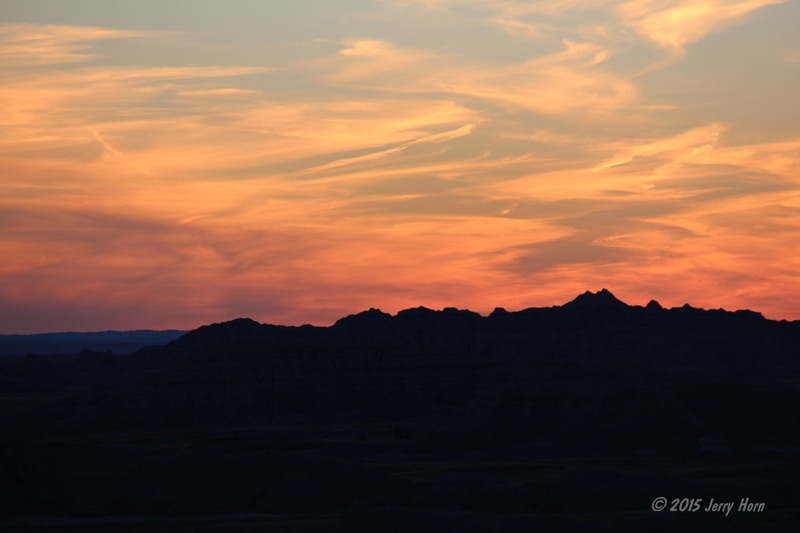 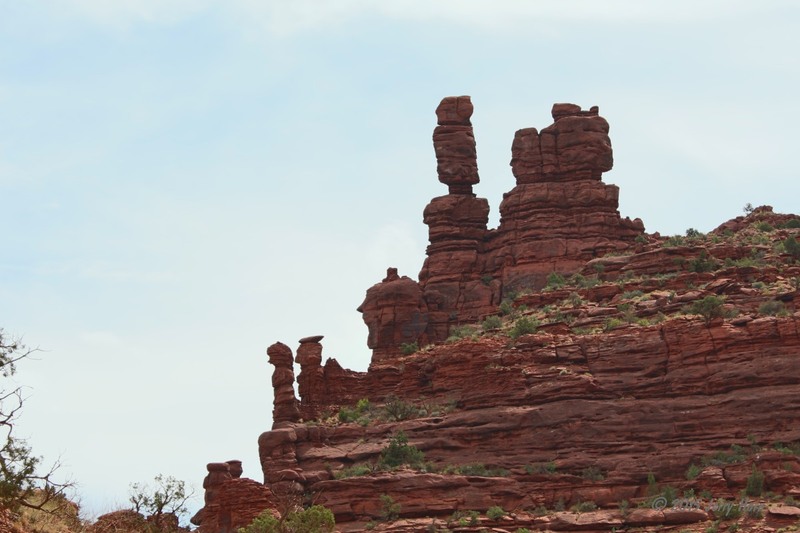 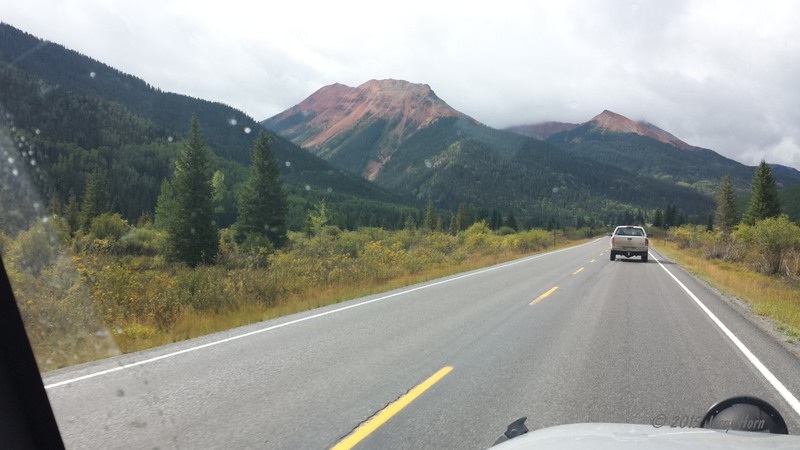 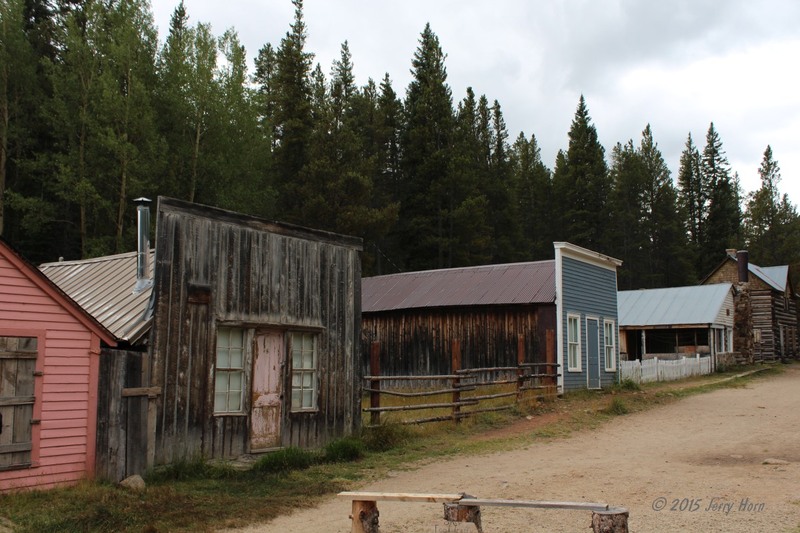 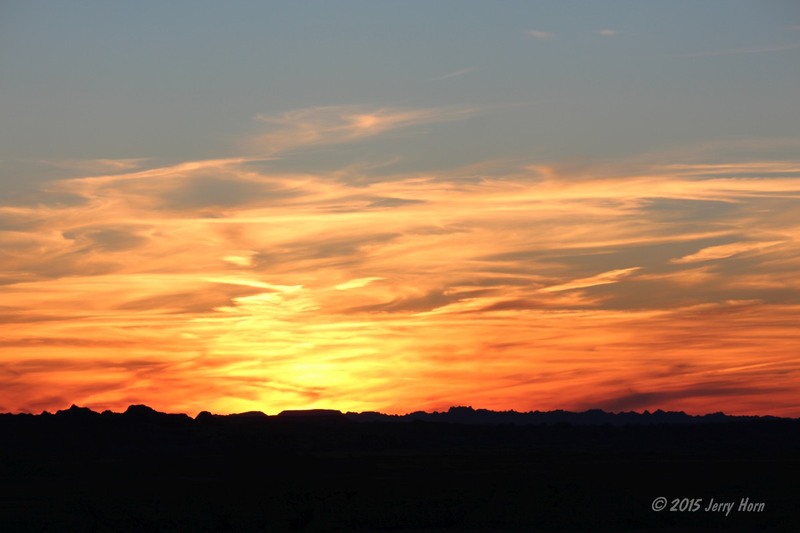 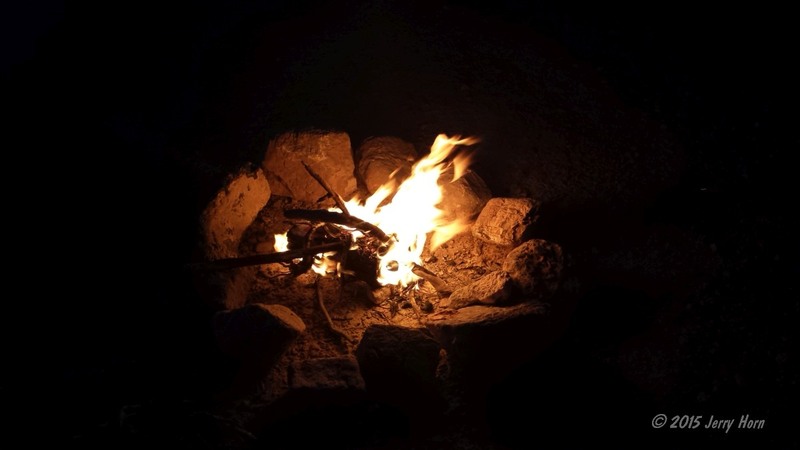 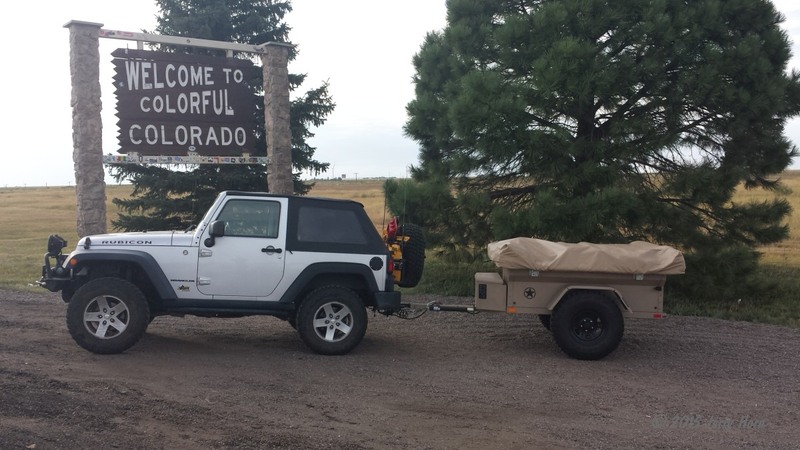 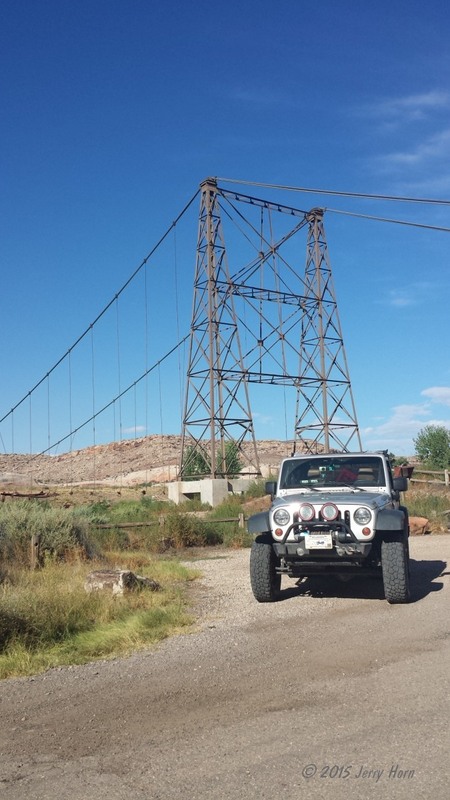 2015 trip to Colorado, Utah, Nevada, Wyoming and South Dakota | Whatevah! 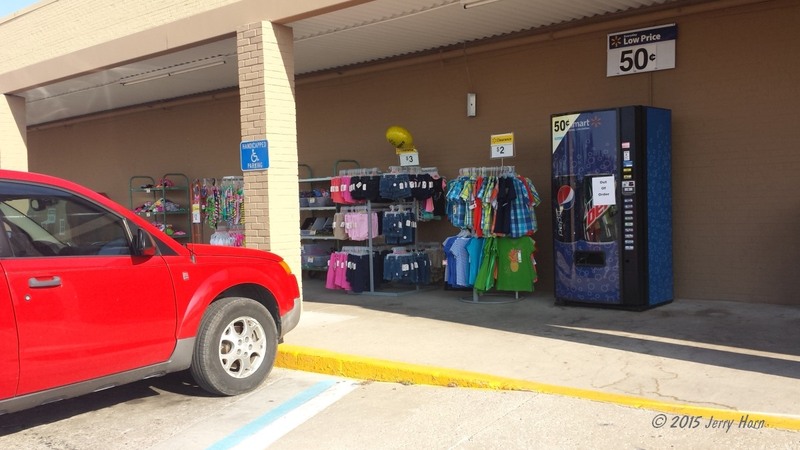 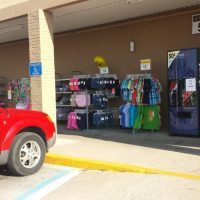 Sidewalk sale at a Walmart in Higginsville, MO. 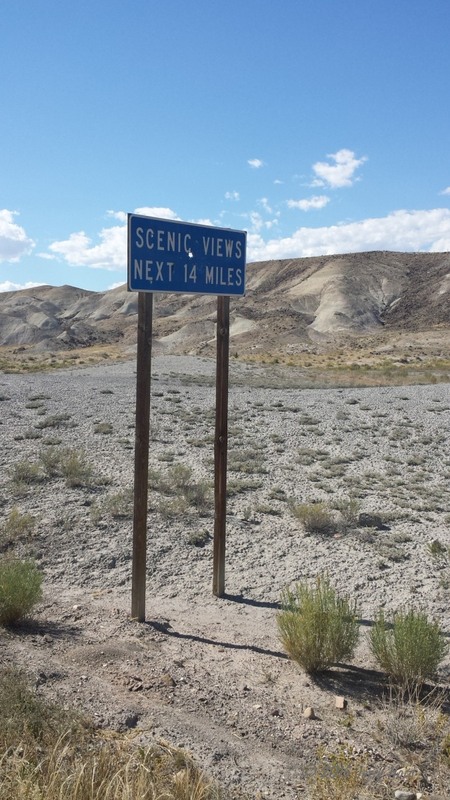 You’d never see that back home. 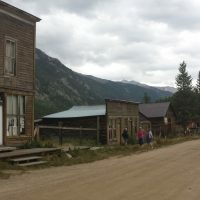 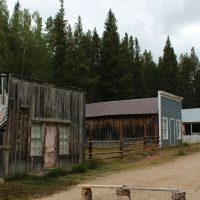 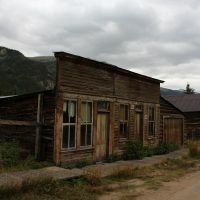 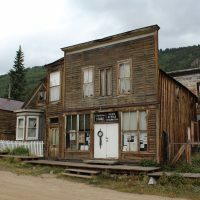 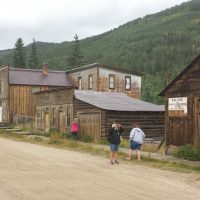 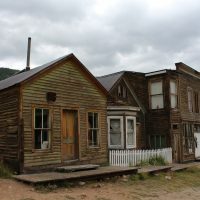 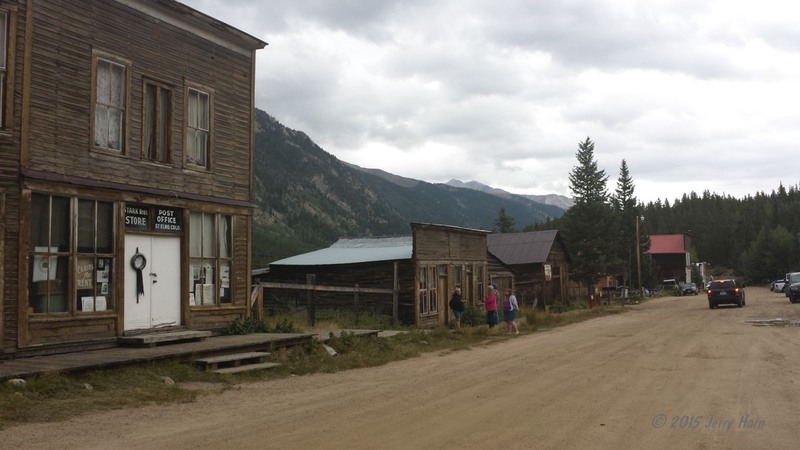 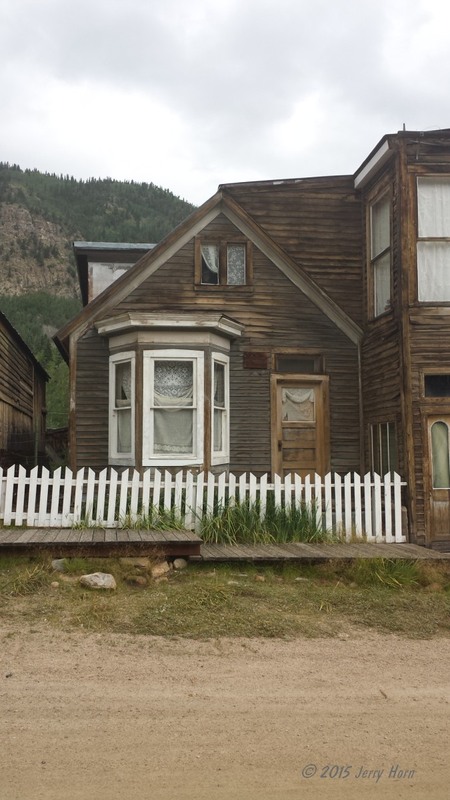 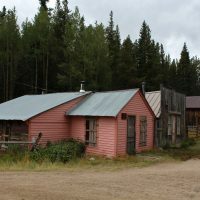 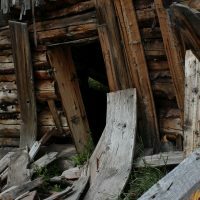 After 8 hours of much-needed sleep, I packed up on Friday the 4th and started down the mountain to Colorado Springs, with the plan to visit the ghost town of St Elmo, CO. That involved a pleasant 2 hour drive across the mountains and a cool valley that I’m sure has a name, however I don’t know it. 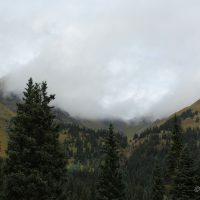 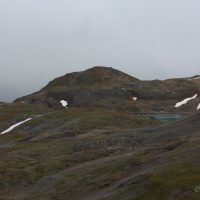 Finally reaching St Elmo, the rain also arrived, so I didn’t spend as much time as I’d hoped. 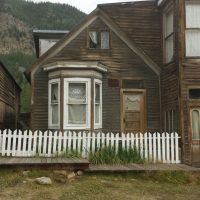 Look very closely and you’ll see a face in the upstairs window! 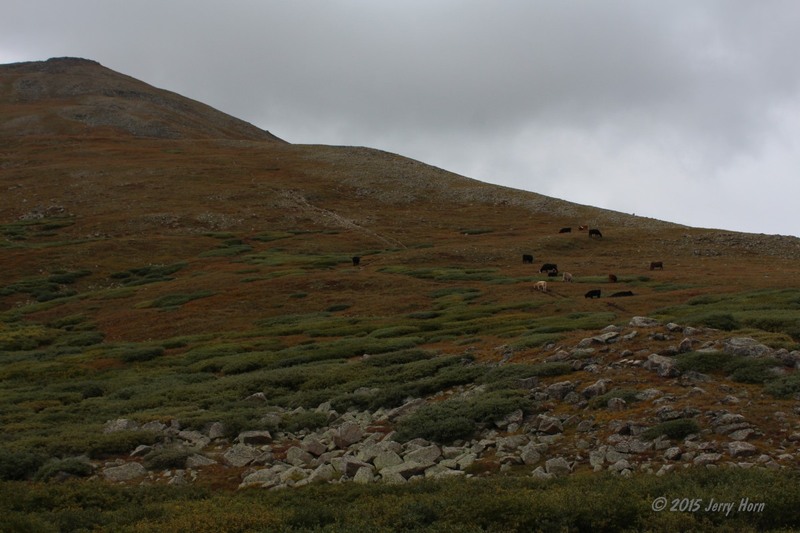 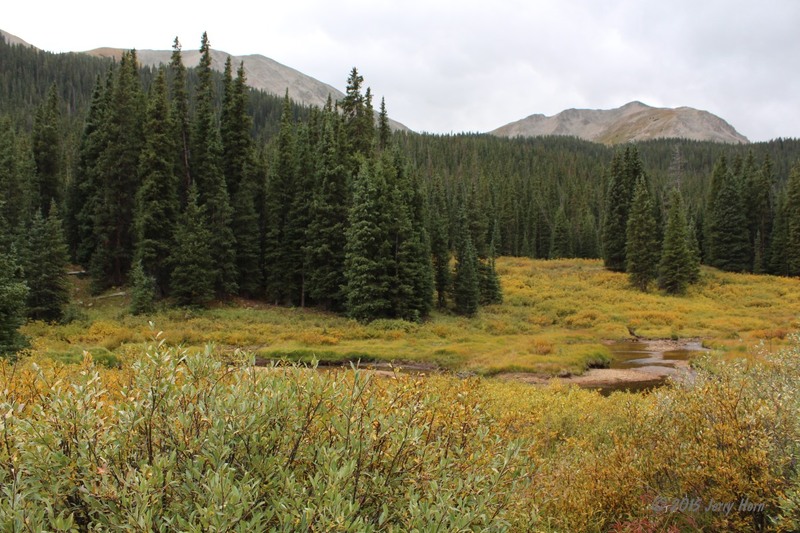 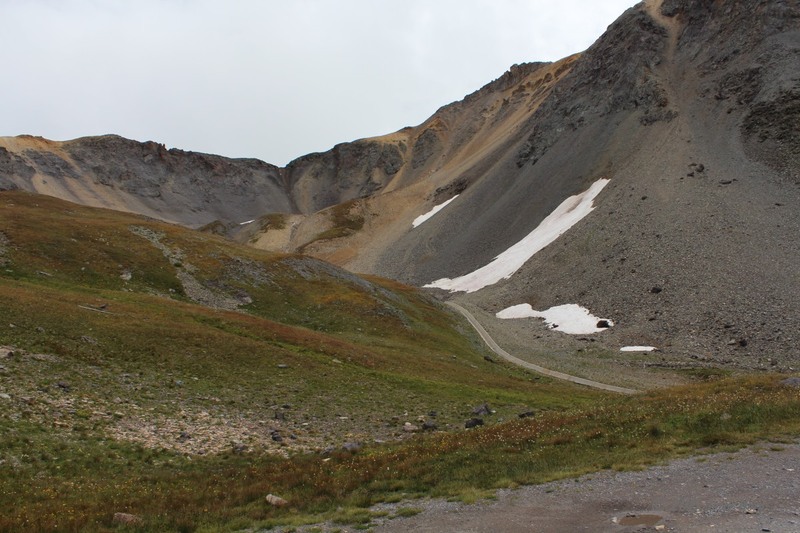 Checking the maps, I decide to take a trail up to Tincup Pass, elevation 12,154ft. 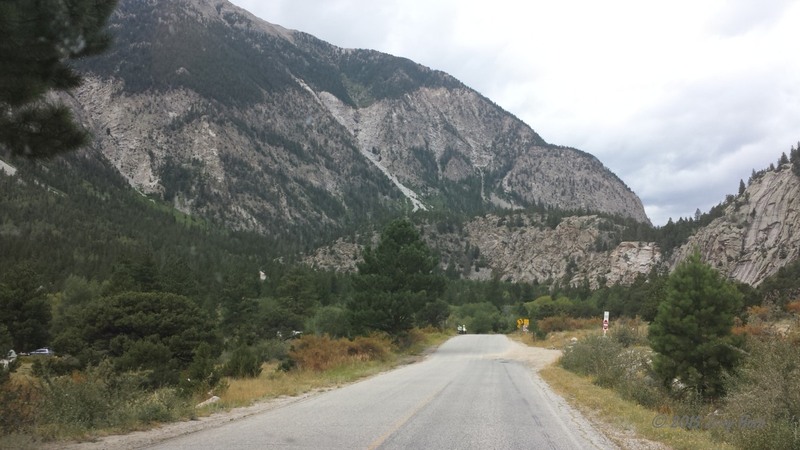 Most of it was fairly easy, although rough enough that I aired down right after leaving St Elmo. 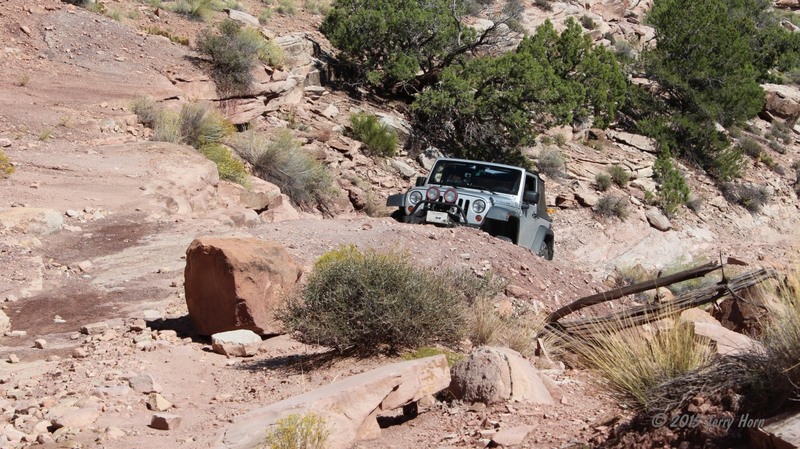 I did manage to find a few harder sections of trail to actually need 4-wheel drive. 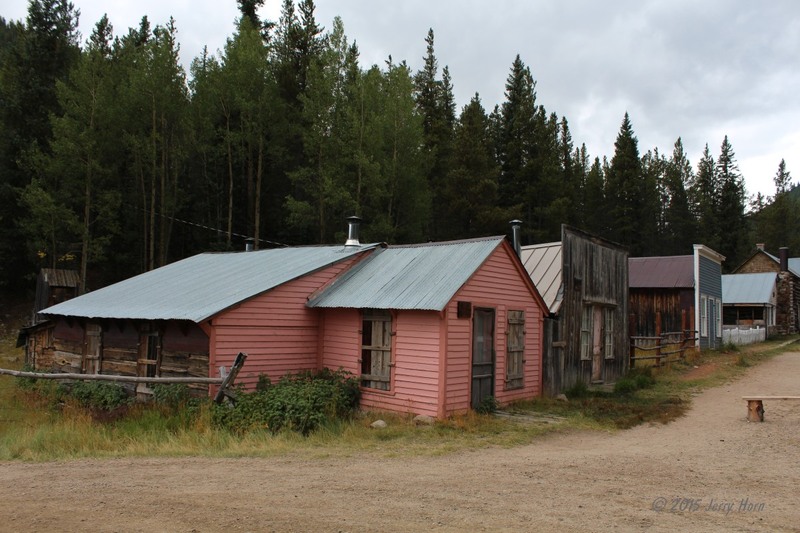 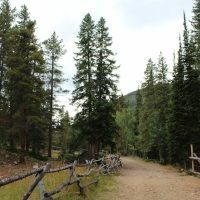 🙂 After spending a few minutes relaxing at the pass, I continued down the mountain to the tiny town of Tincup, CO and checked the map. 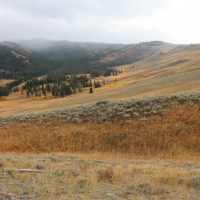 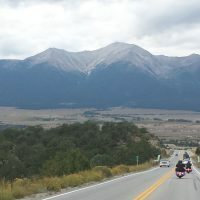 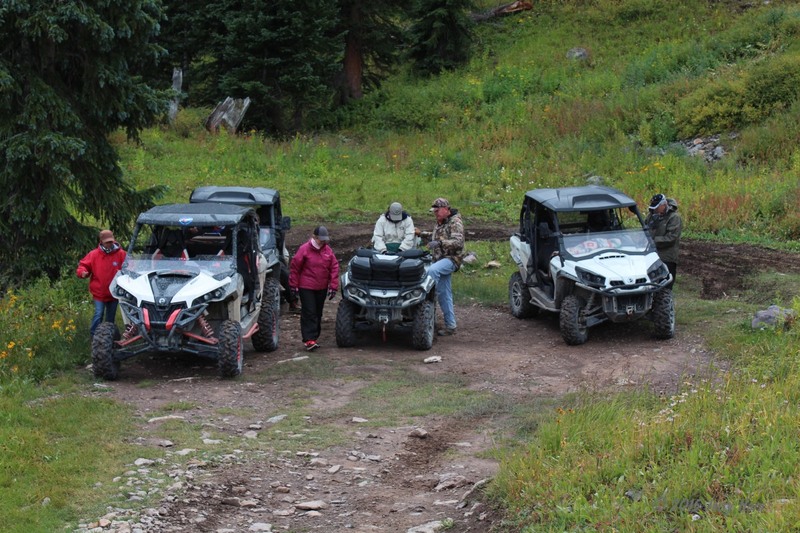 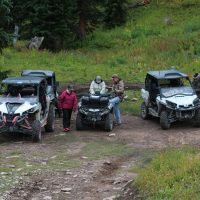 Decided to cross back over the mountains and that took me up to Cumberland Pass, elevation 12,015ft which was too windy and cold to hang out for long, although I did chat with a few folks on ATVs for a few minutes. 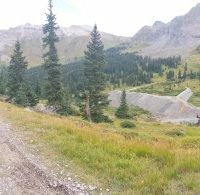 That trail took me to the town of Pitkin where I finally returned to pavement after 3 hours on dirt. 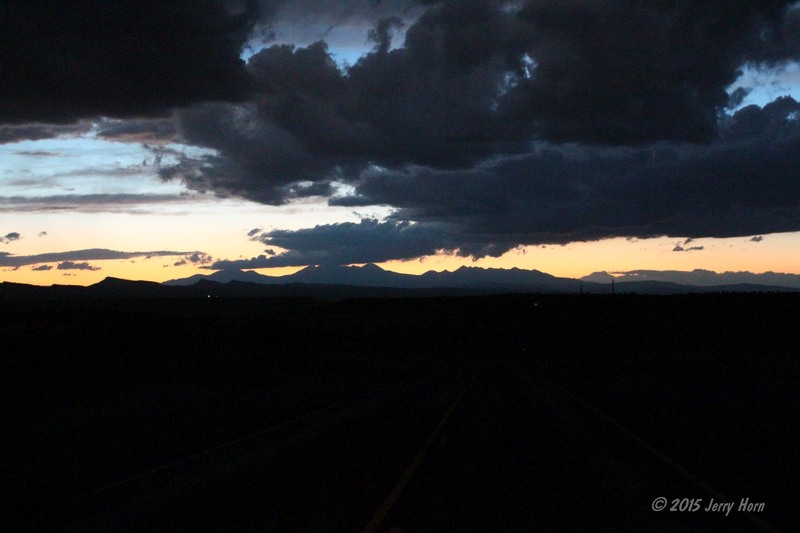 I set the GPS to Montrose, CO and raced toward/through incoming storms. 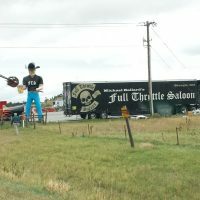 I got there just after 8pm and decided to stay the night at the local Days Inn. 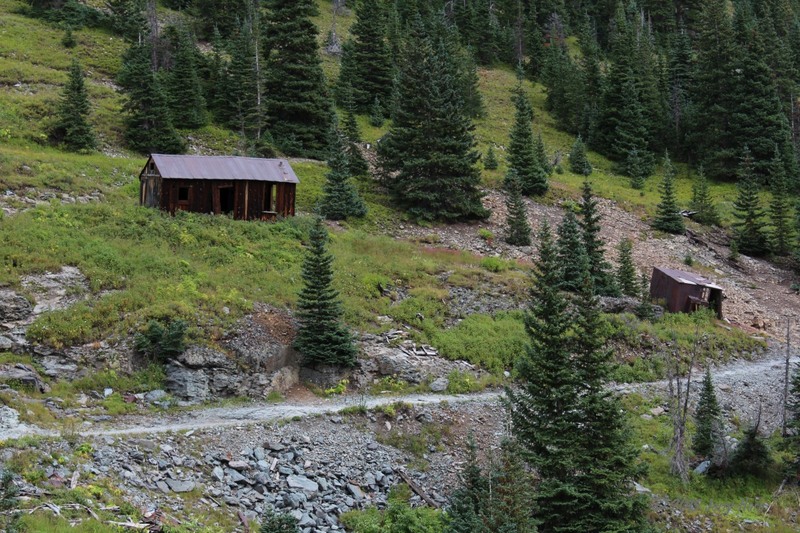 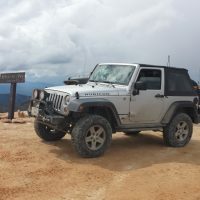 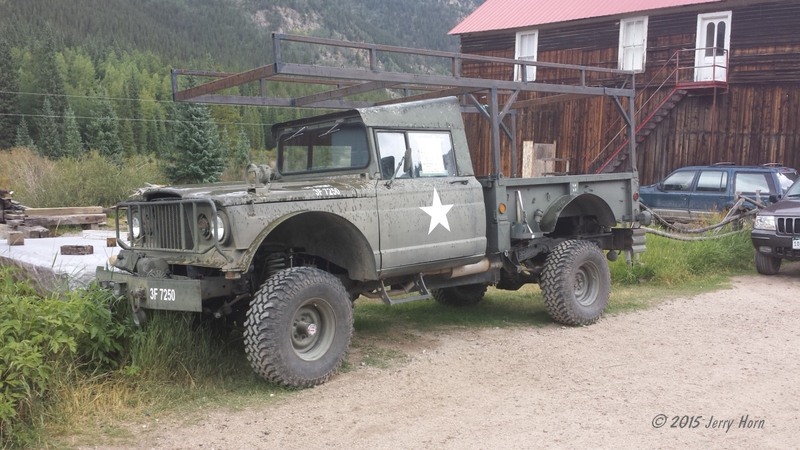 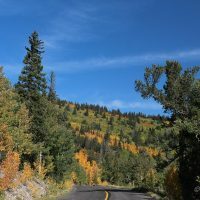 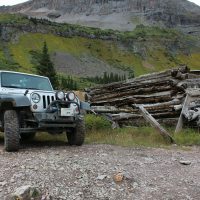 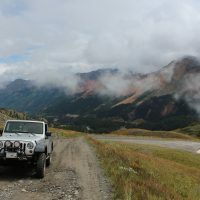 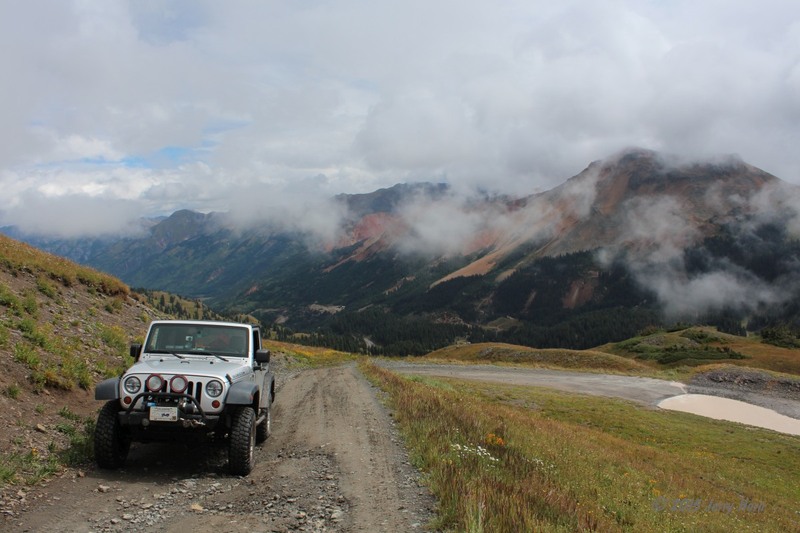 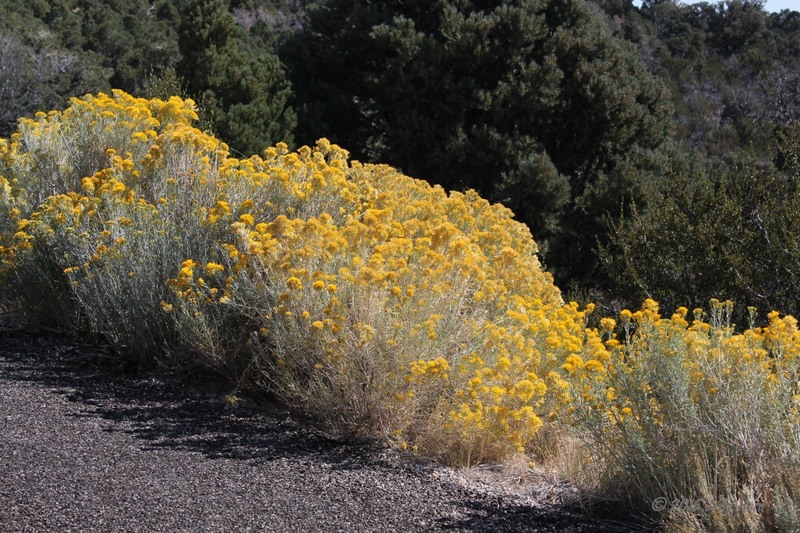 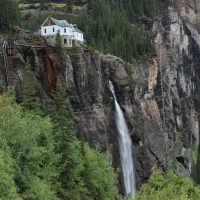 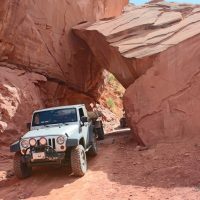 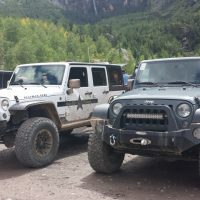 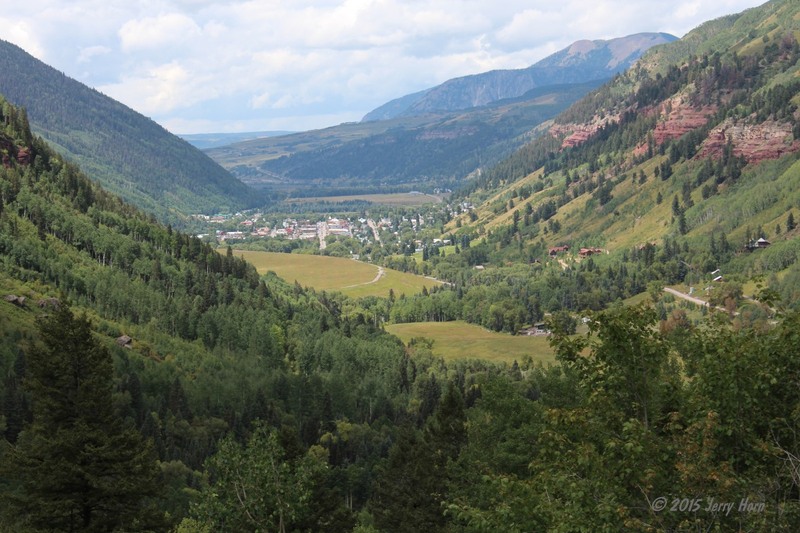 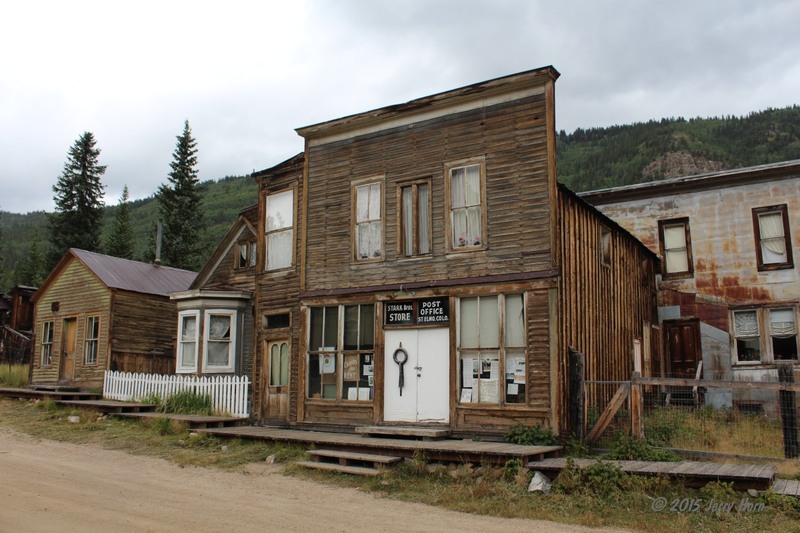 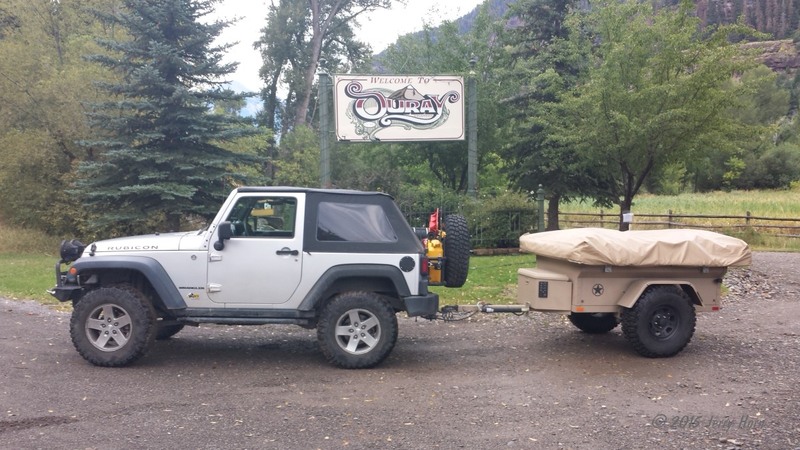 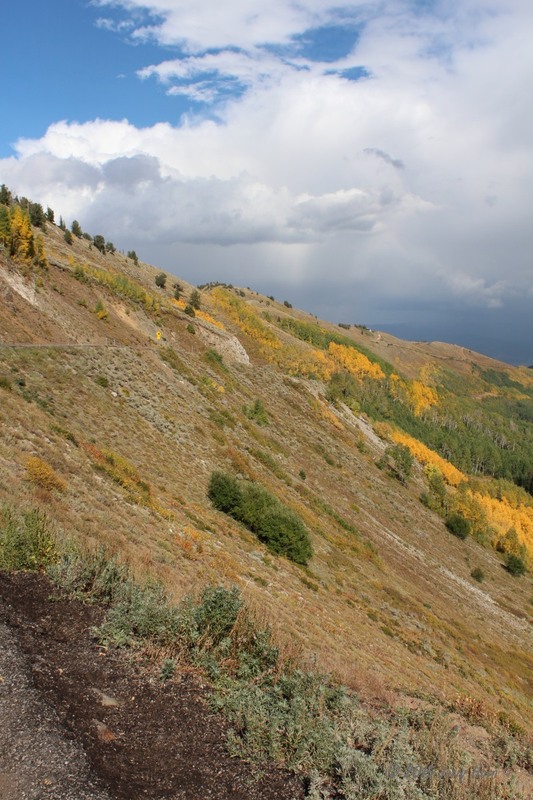 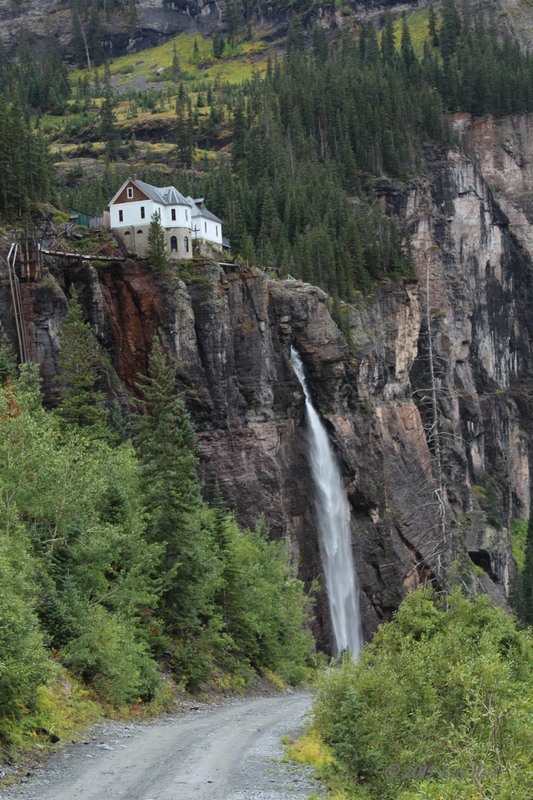 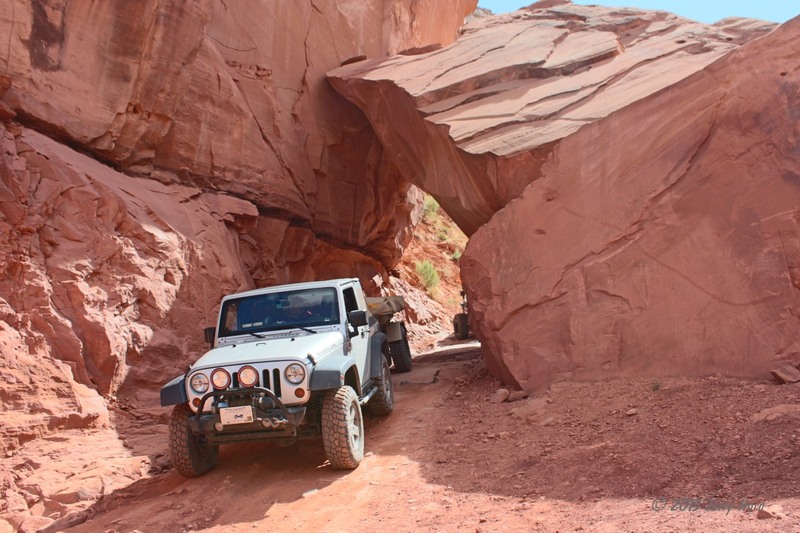 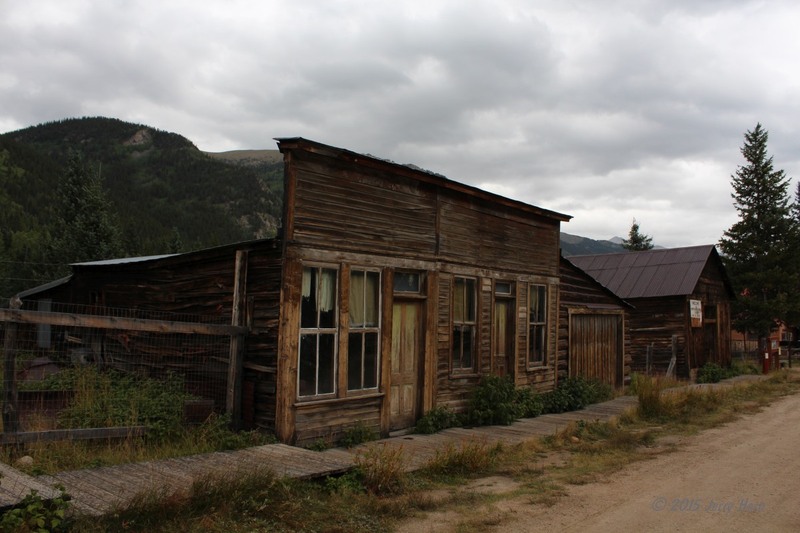 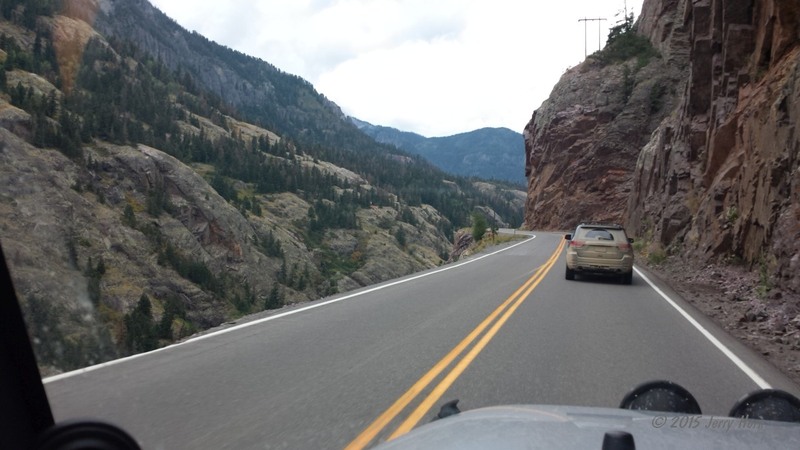 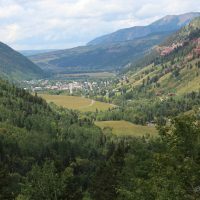 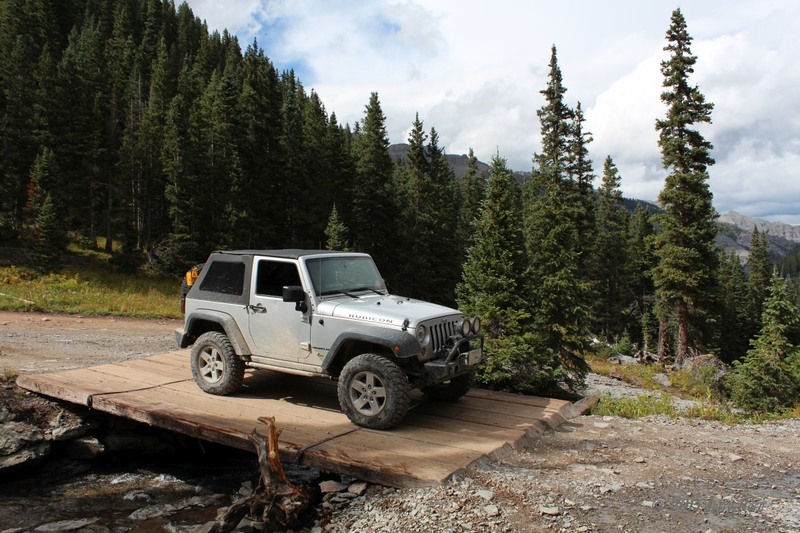 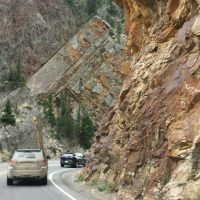 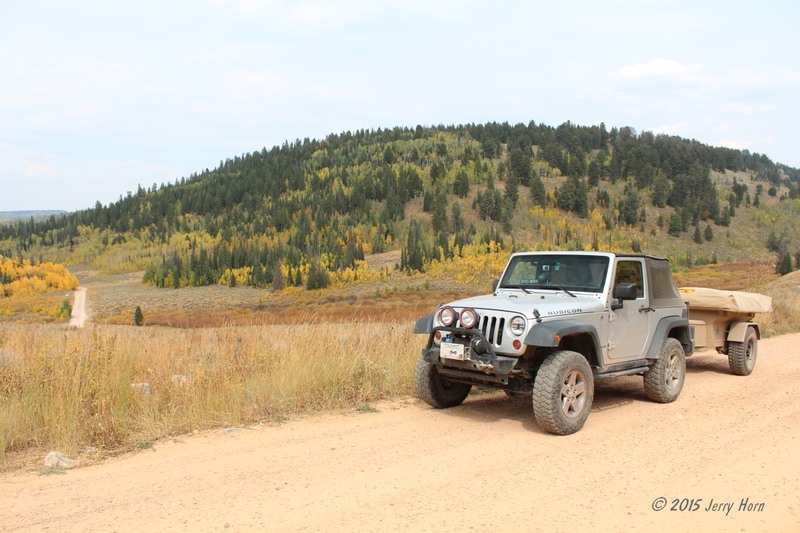 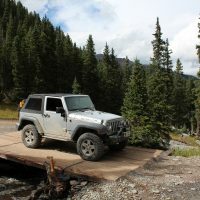 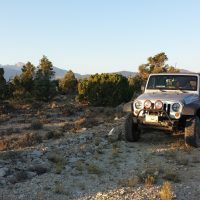 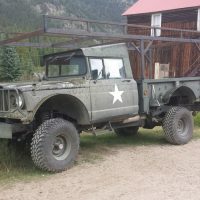 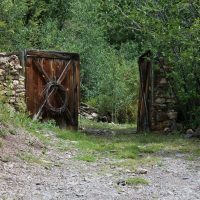 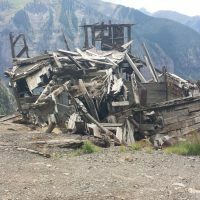 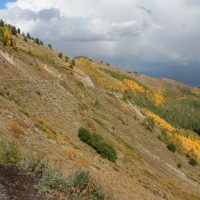 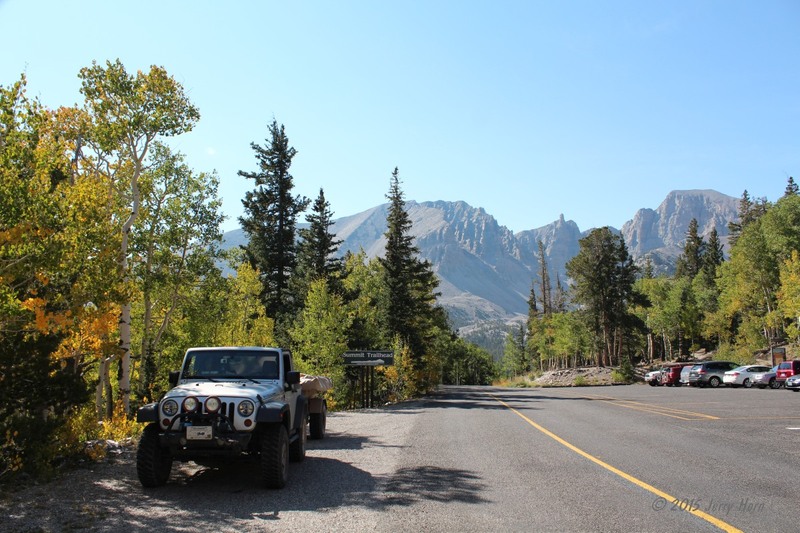 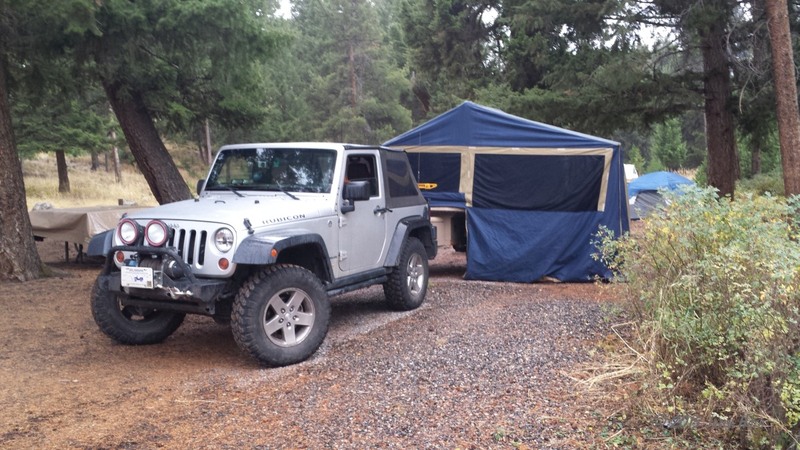 Now on Saturday the 5th, I point the Jeep south down the famous Rt 550 to Ouray. 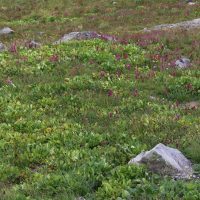 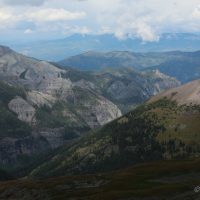 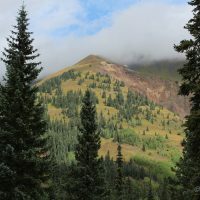 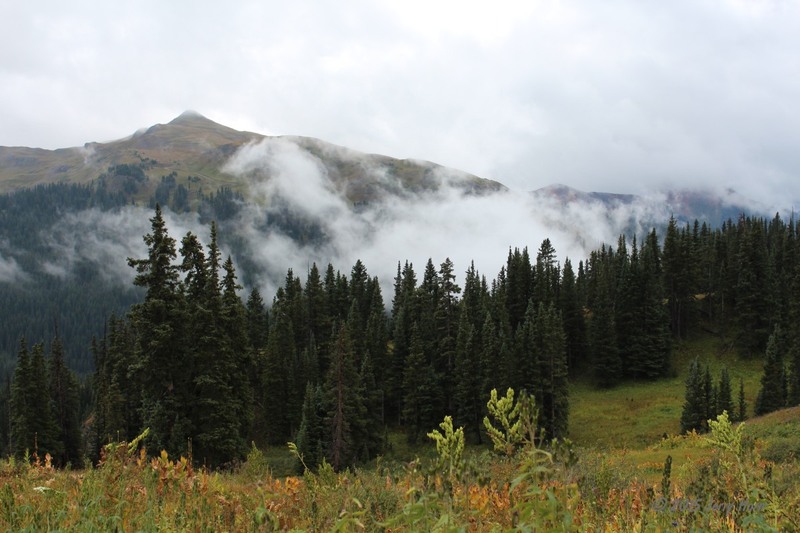 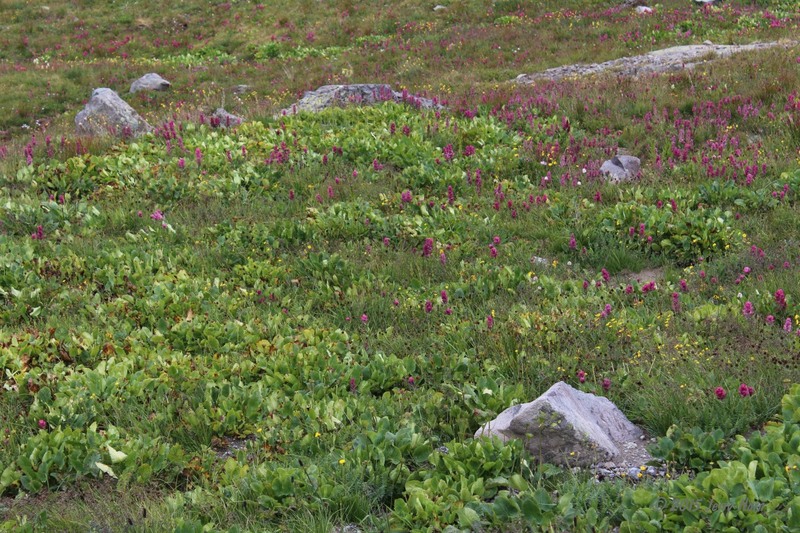 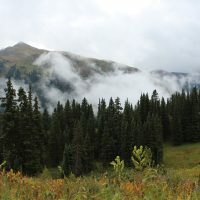 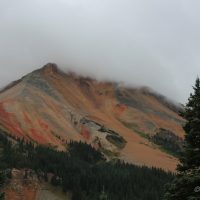 Today, my goal is to finally complete the Black Bear Pass trail. 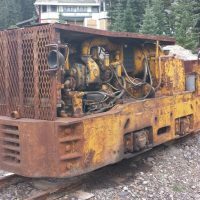 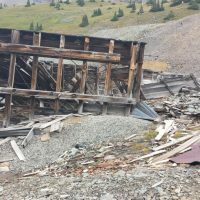 The last two years it’s been closed for snow or trail repairs. 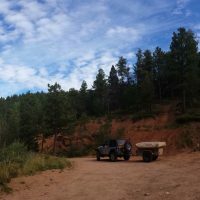 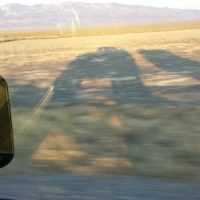 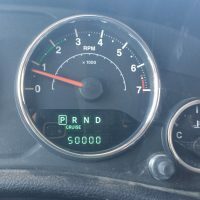 I parked the trailer at a pull-off near the trailhead, aired down, turned turned on the dash camera and started up the trail. 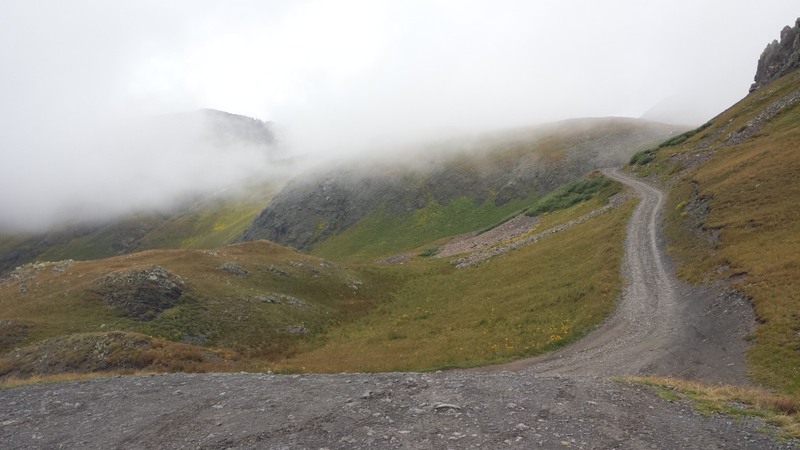 I passed through the clouds and enjoyed the views. 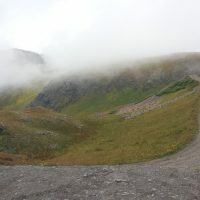 After cresting the pass (elevation 12,840ft) and starting the one-way downhill half, I caught up with a few vehicles and followed them through the switchbacks. 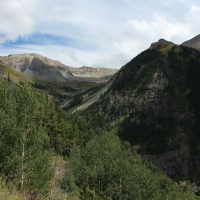 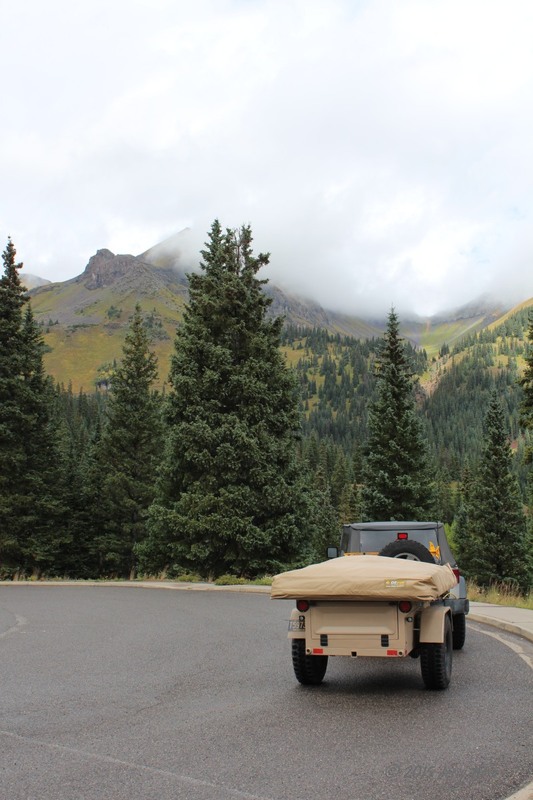 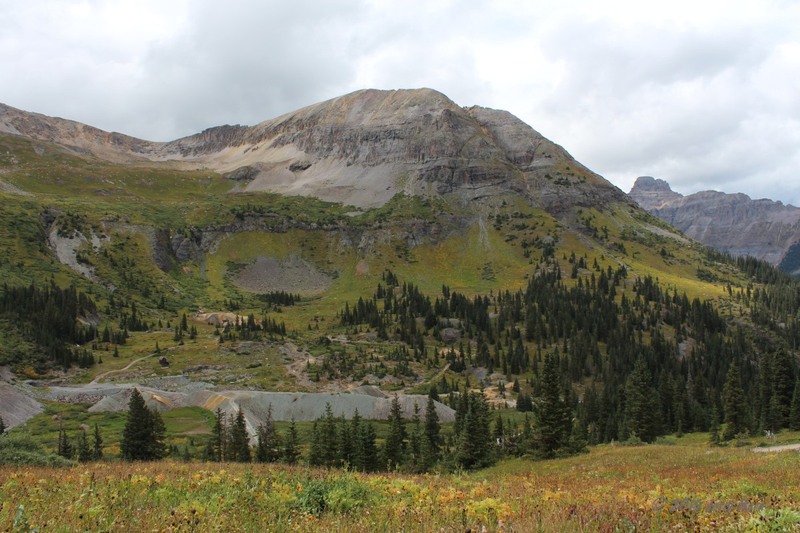 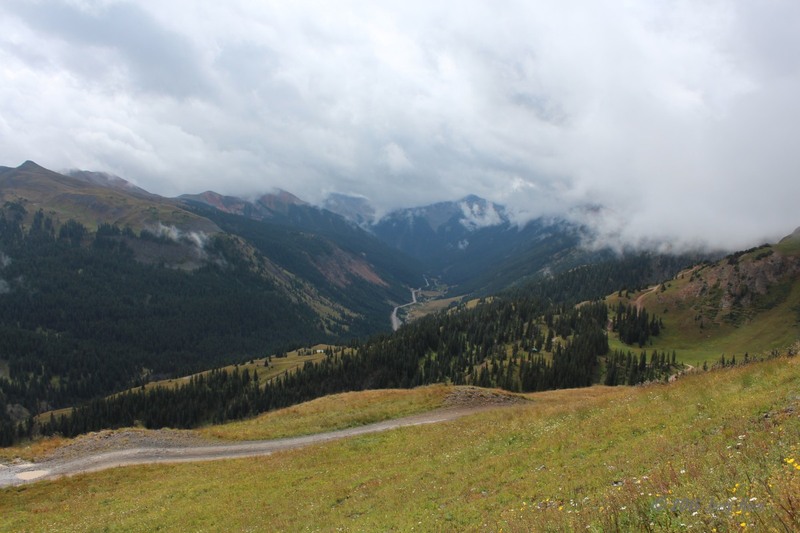 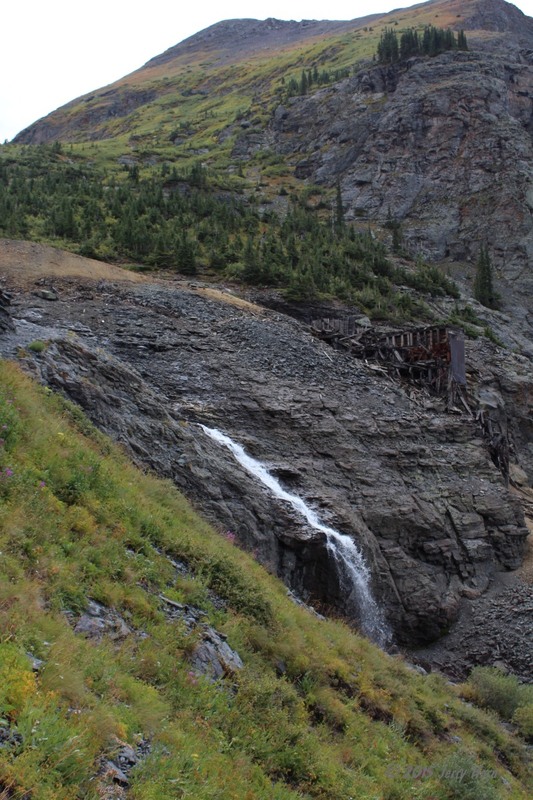 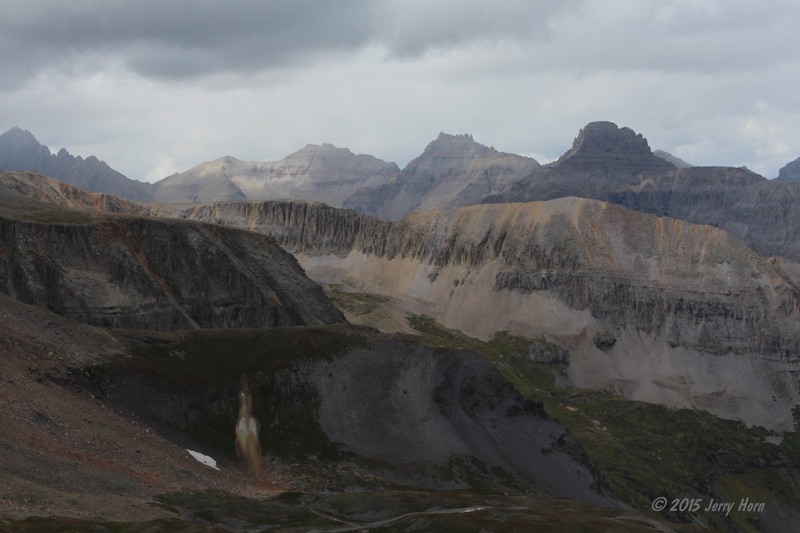 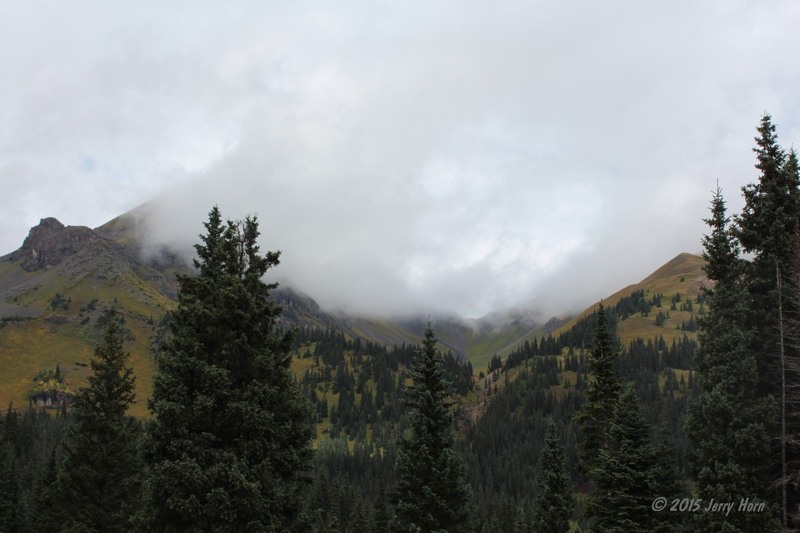 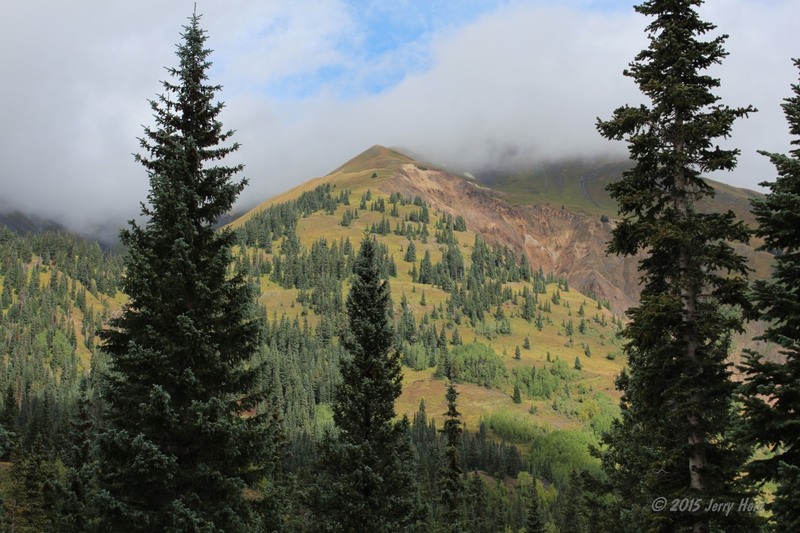 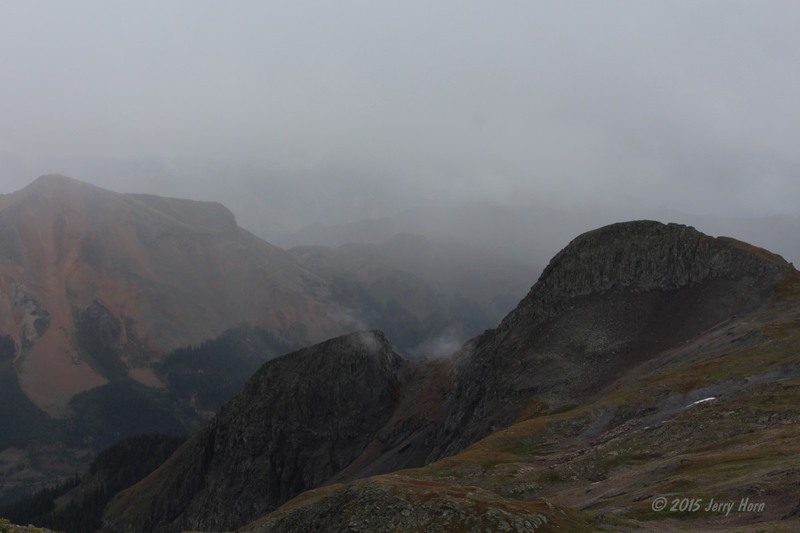 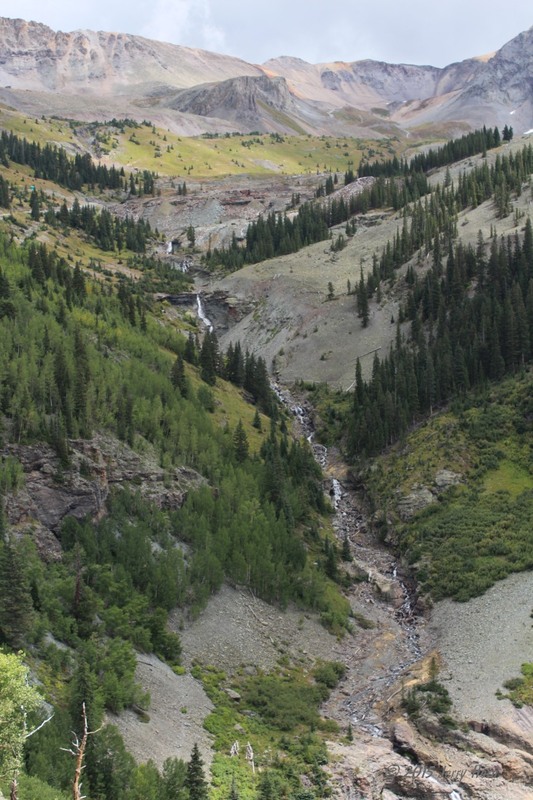 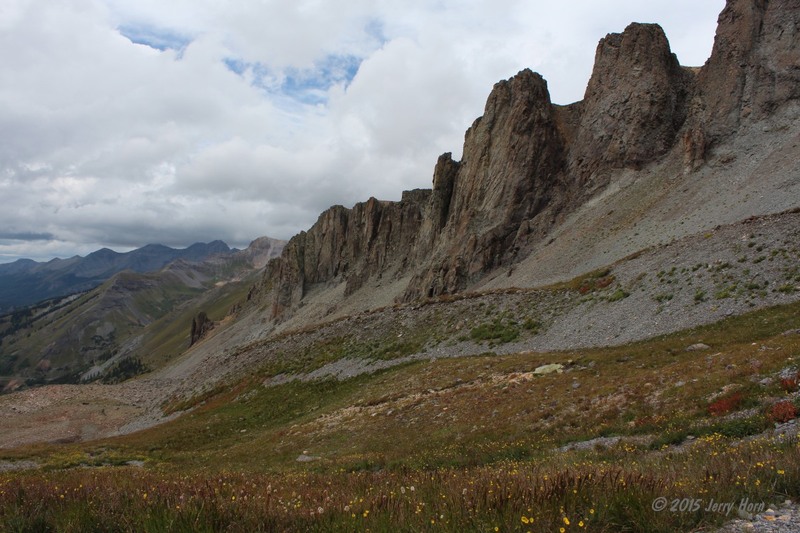 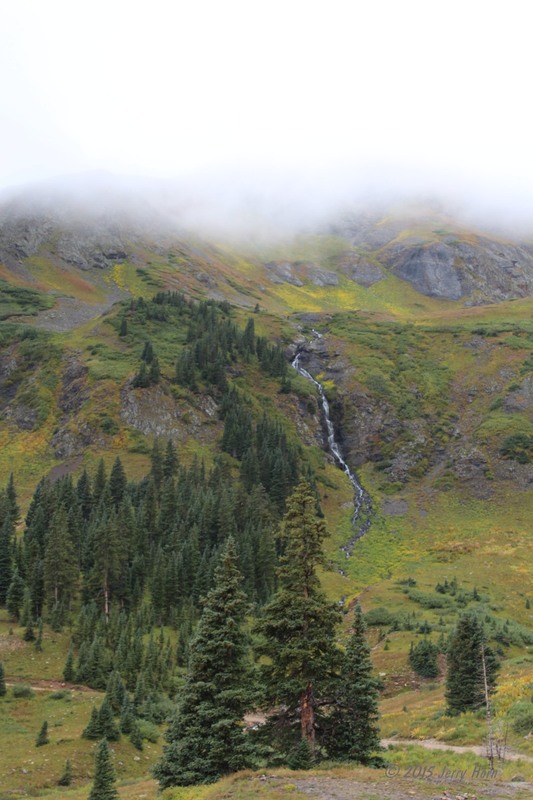 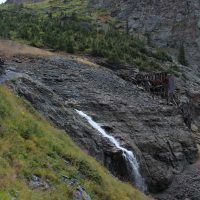 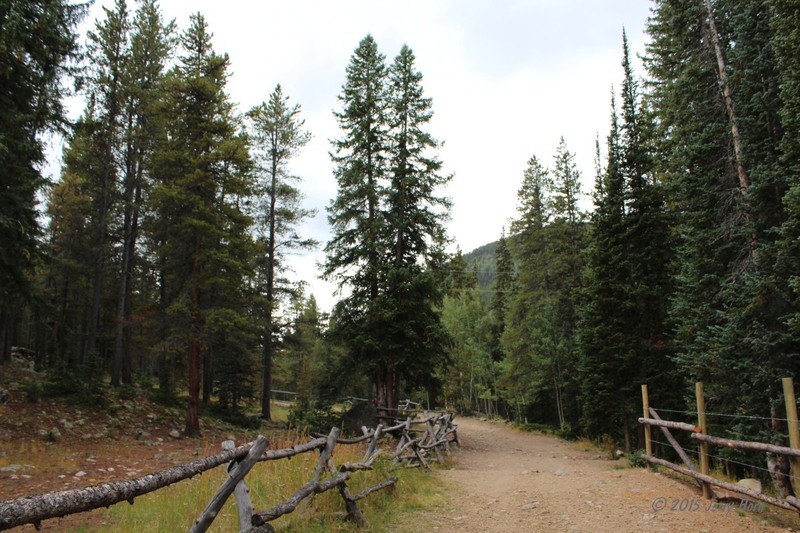 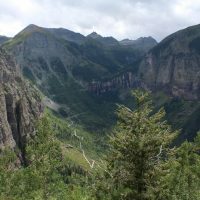 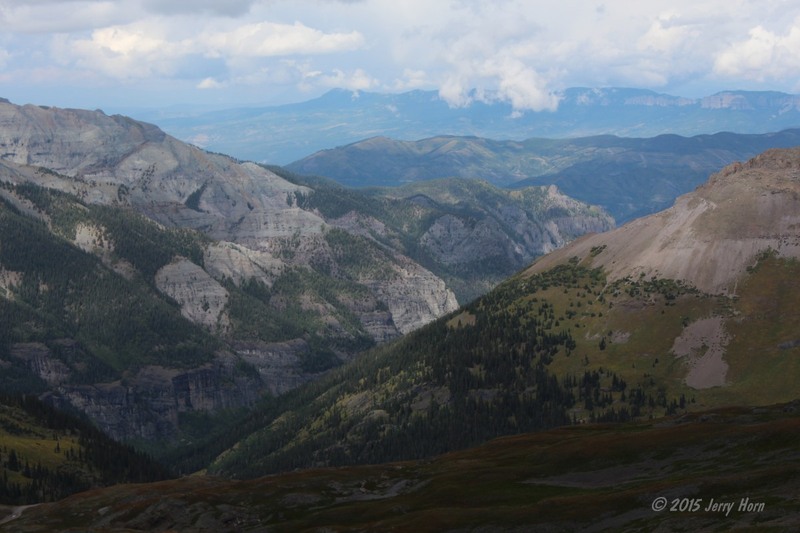 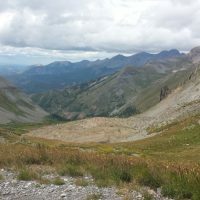 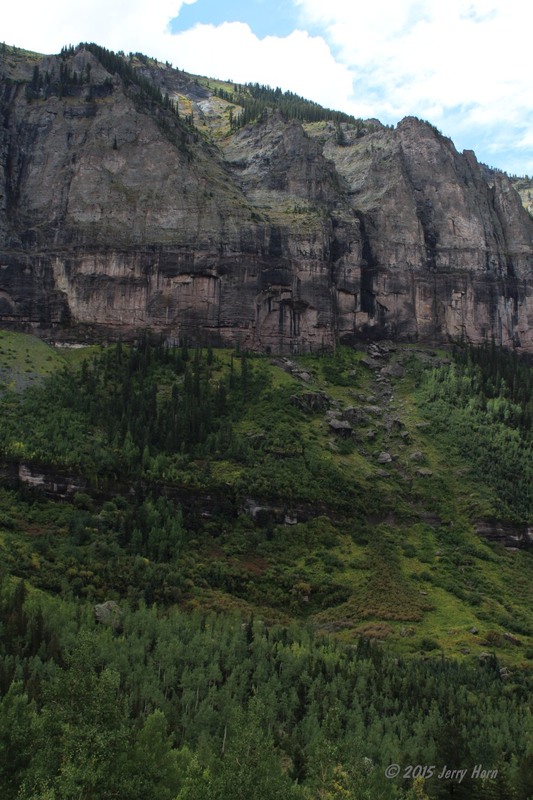 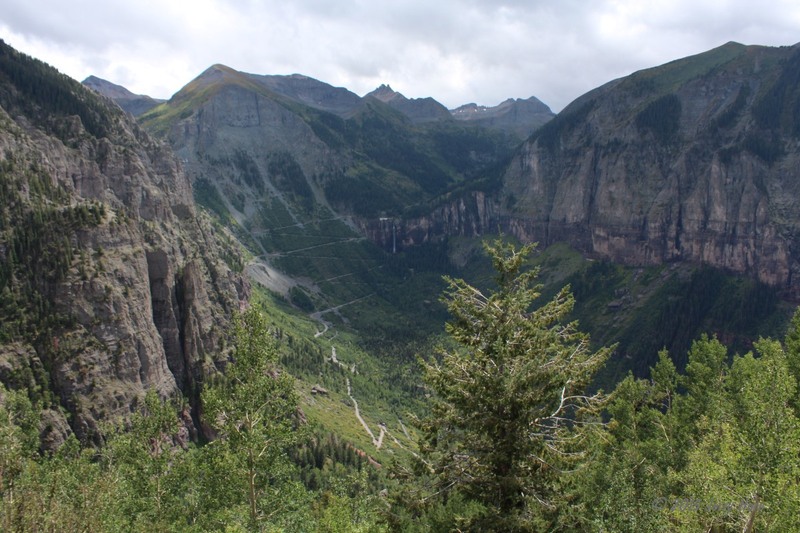 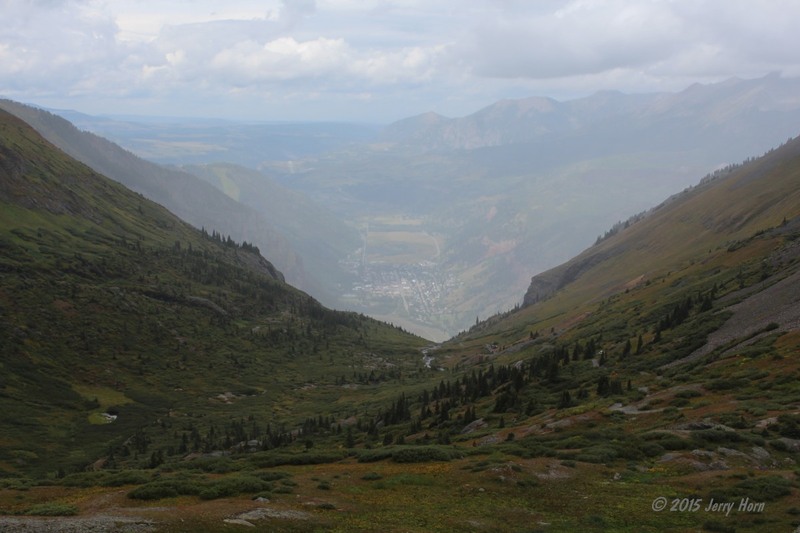 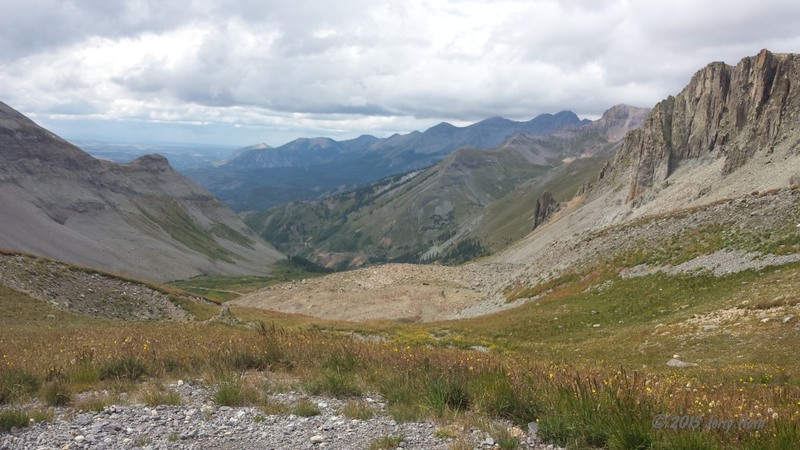 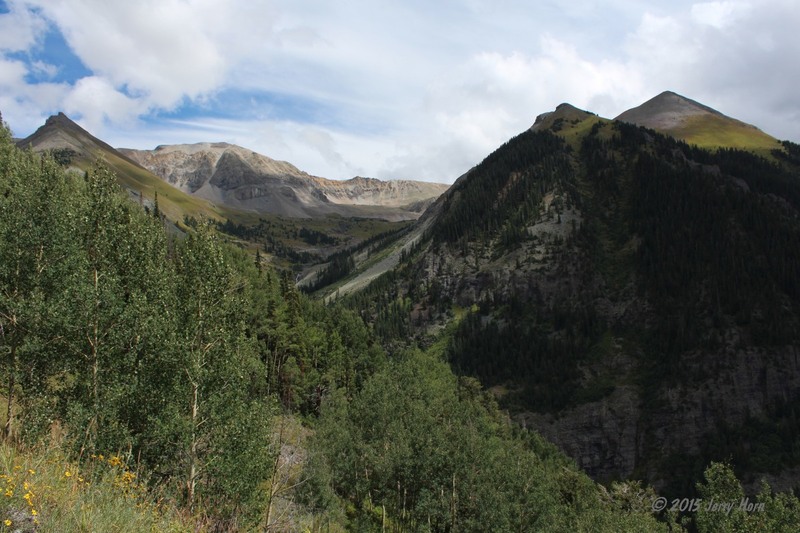 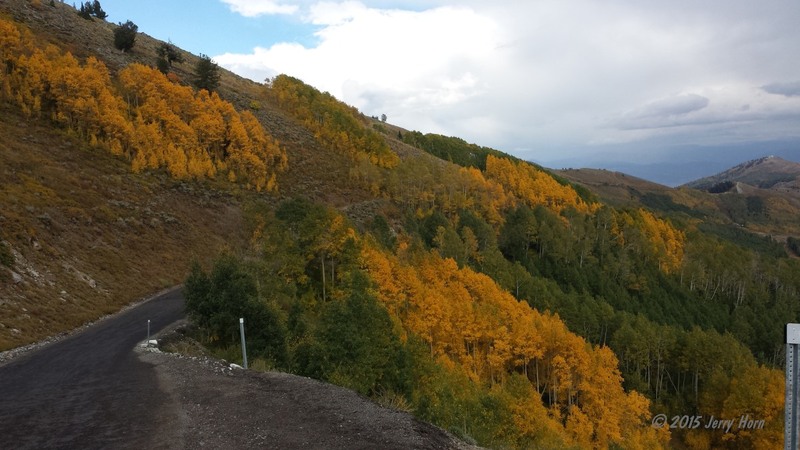 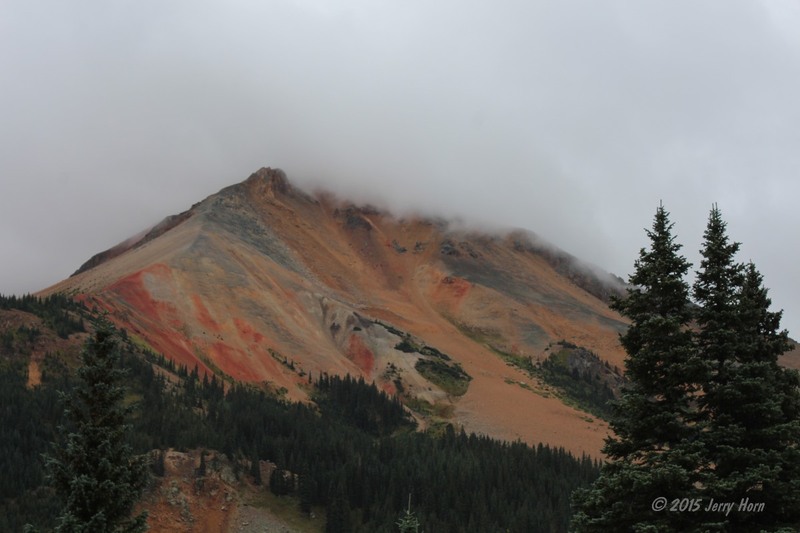 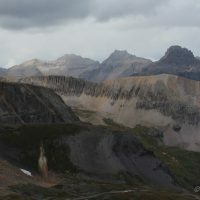 From there, I headed down to Telluride to pick up the Imogene Pass trail. 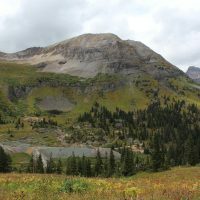 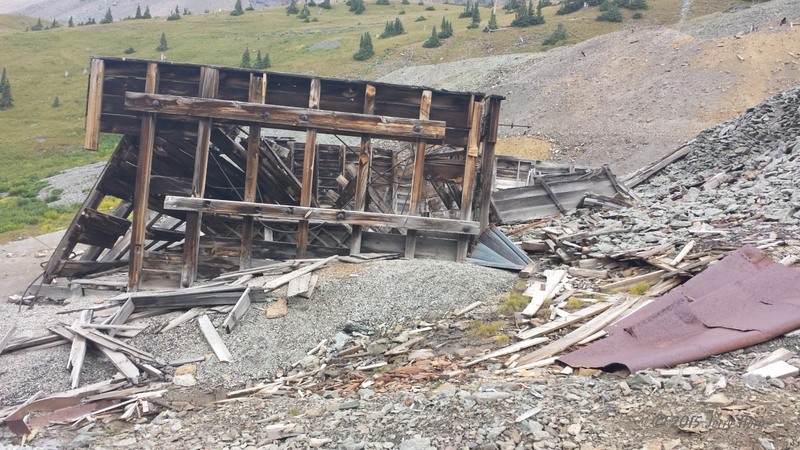 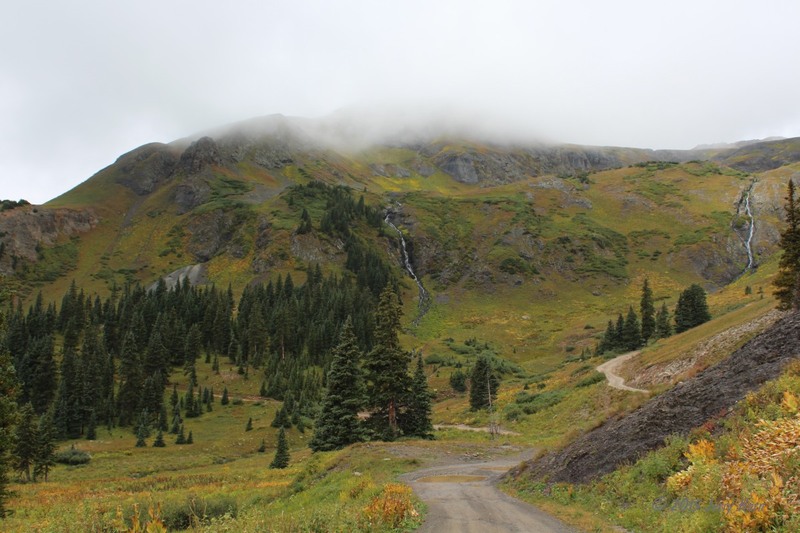 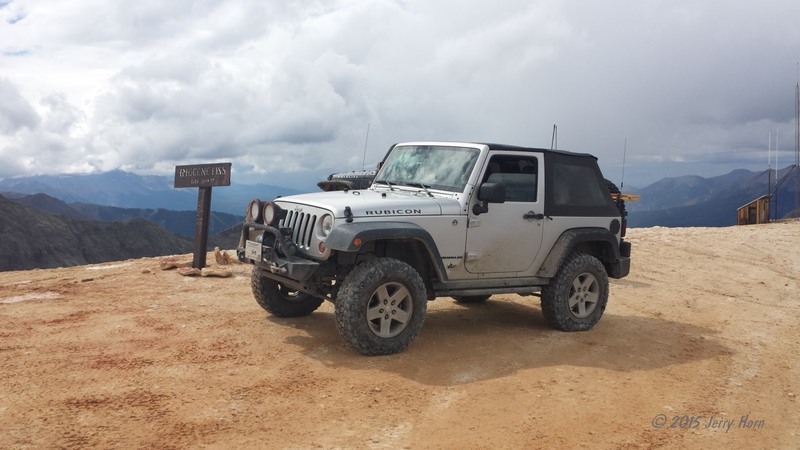 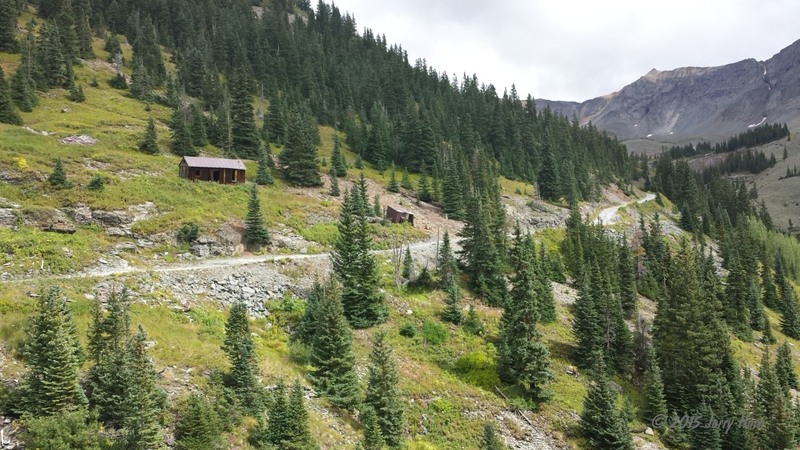 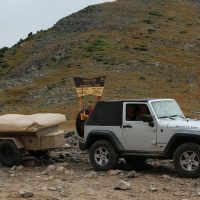 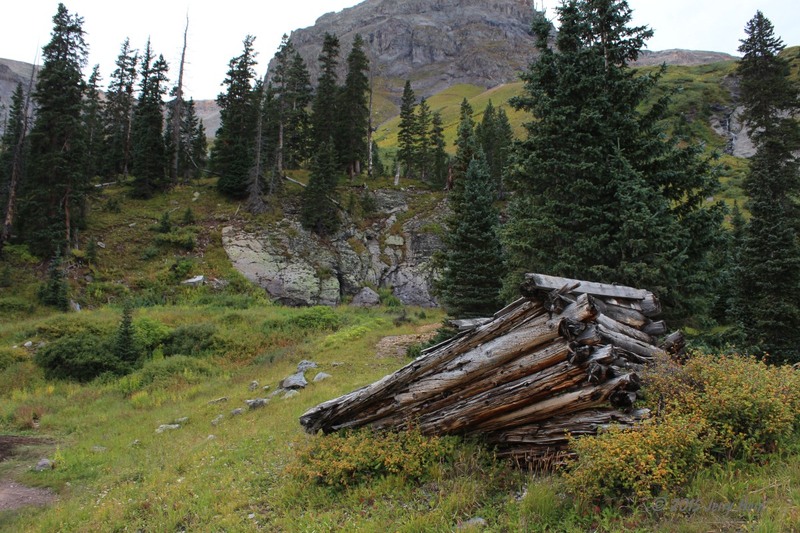 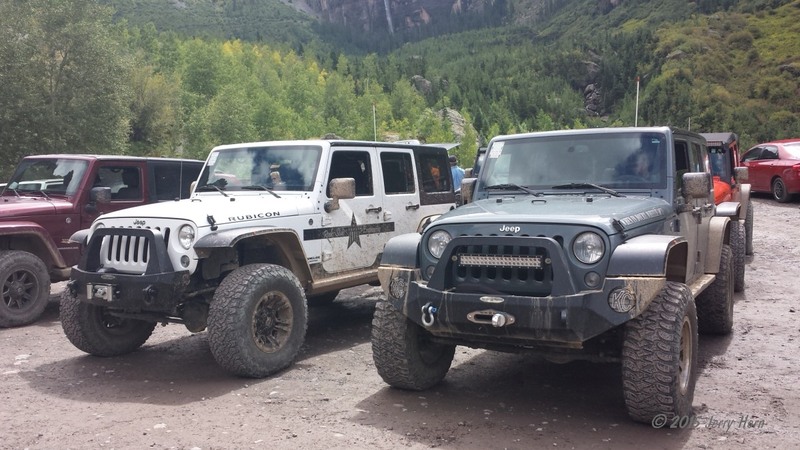 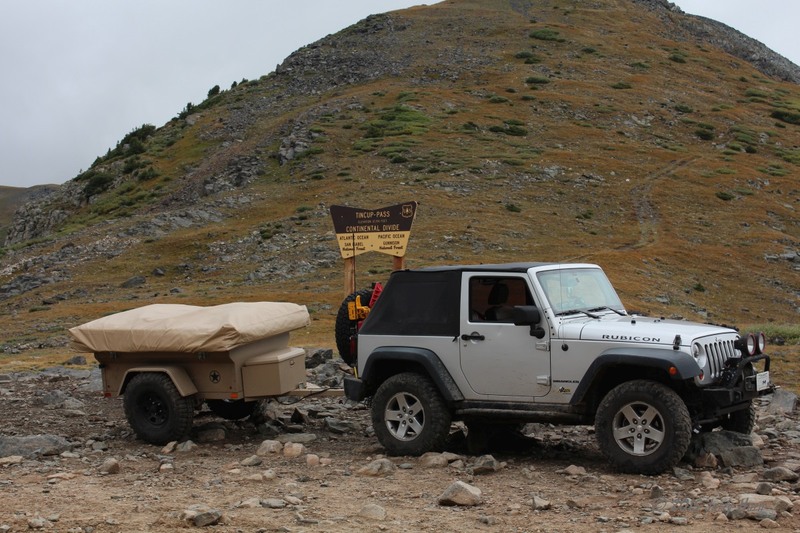 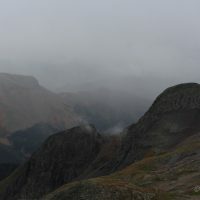 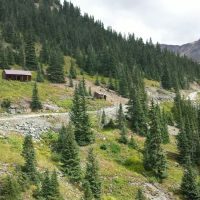 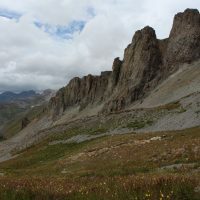 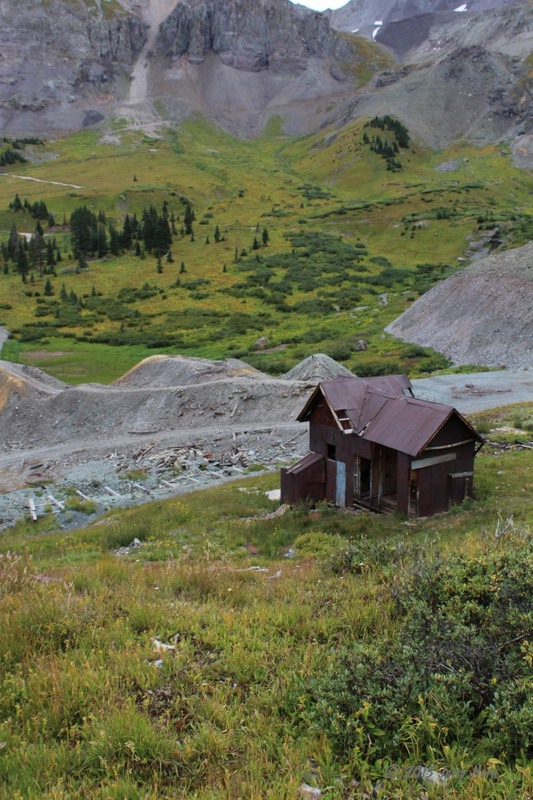 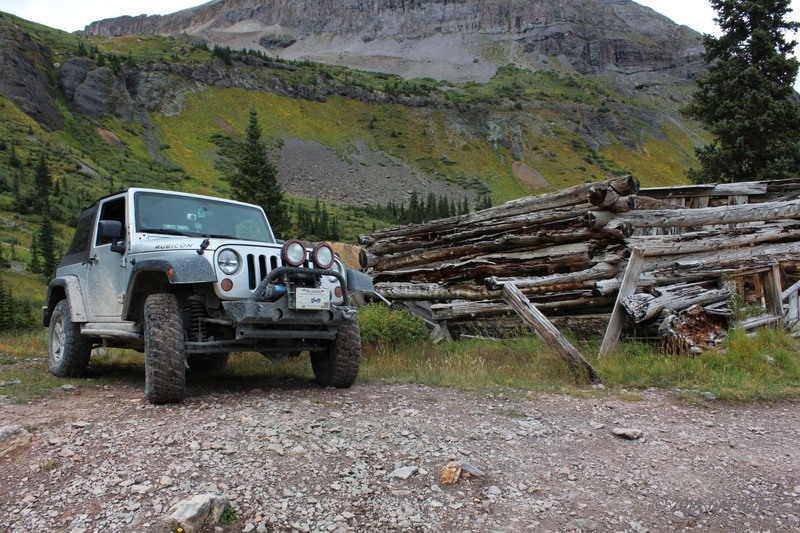 Imogene Pass is a great way to return to Ouray with a Jeep 17 miles and around 3 and a half hours to complete. 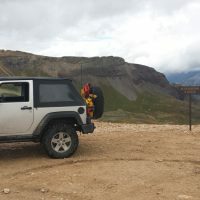 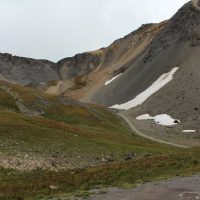 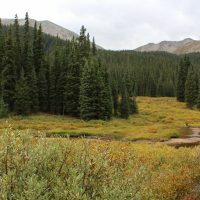 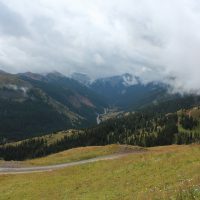 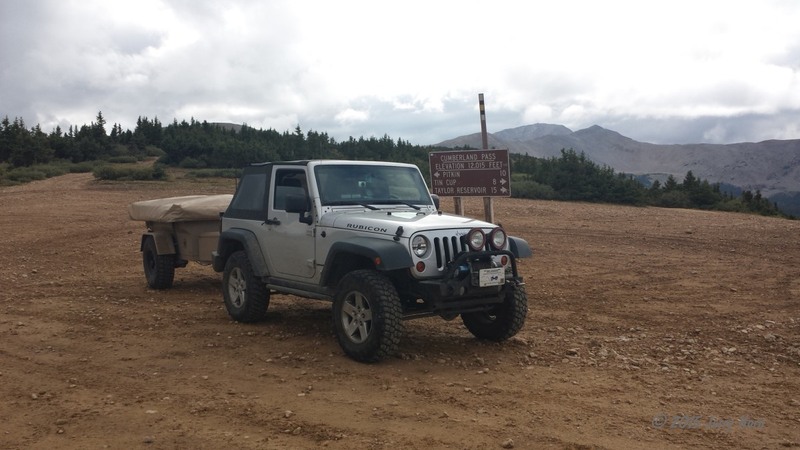 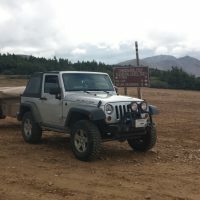 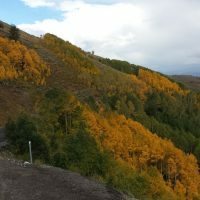 The trail isn’t challenging at all, but it’s a great drive and a bit higher at 13,114ft and there are a few photo spots where you can get even higher. 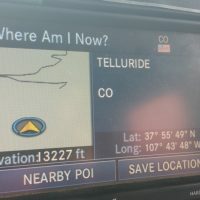 My GPS tracker topped out at 13,228ft. 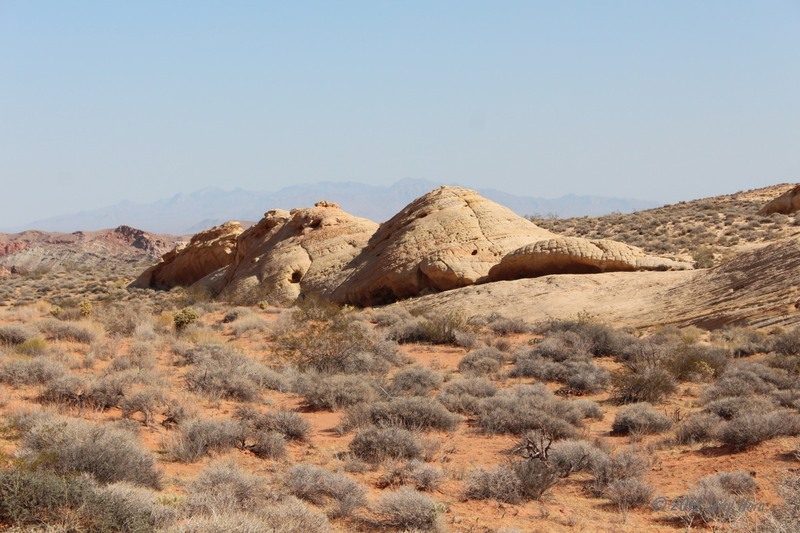 Towards the end of the trail, I noticed an off-shoot area that looked interesting and went to check it out. 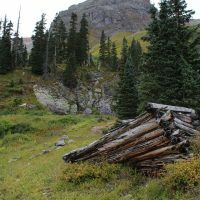 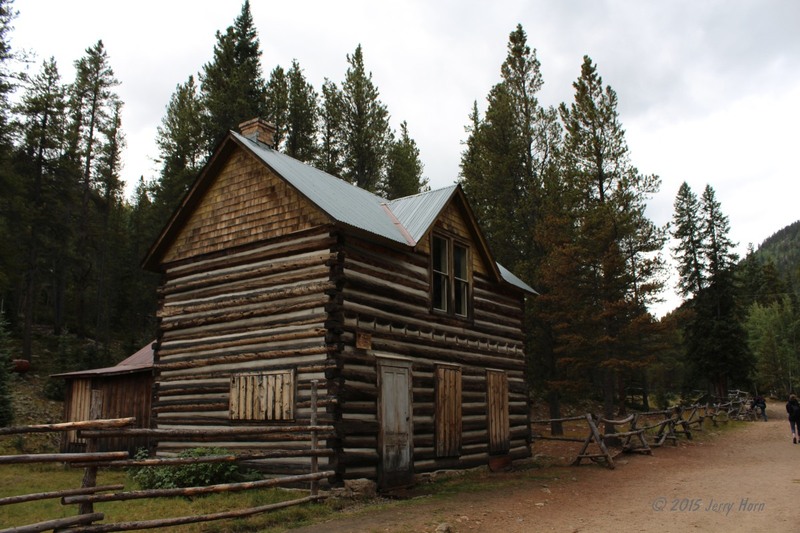 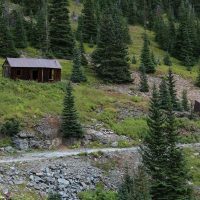 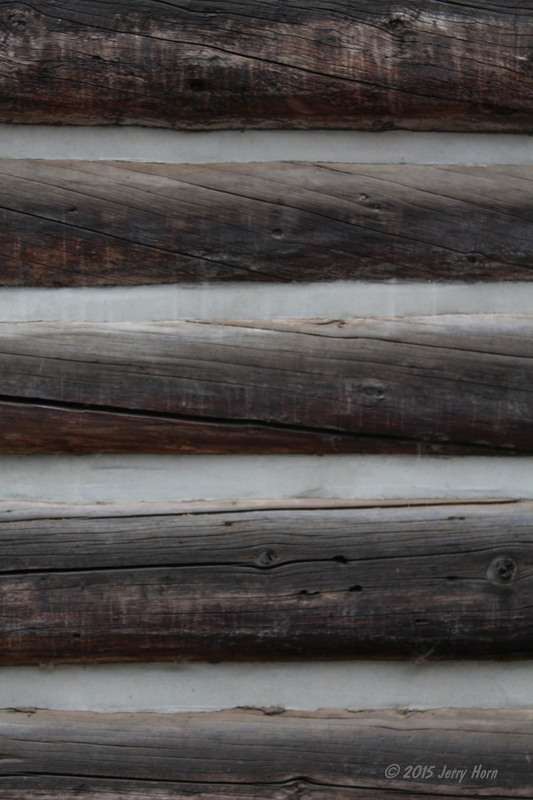 Nothing challenging trail-wise, but some old cabins worthy of a photo and some ATV folks to chat with. 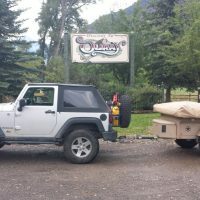 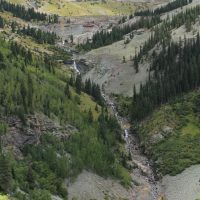 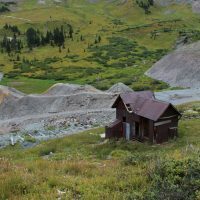 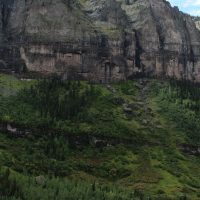 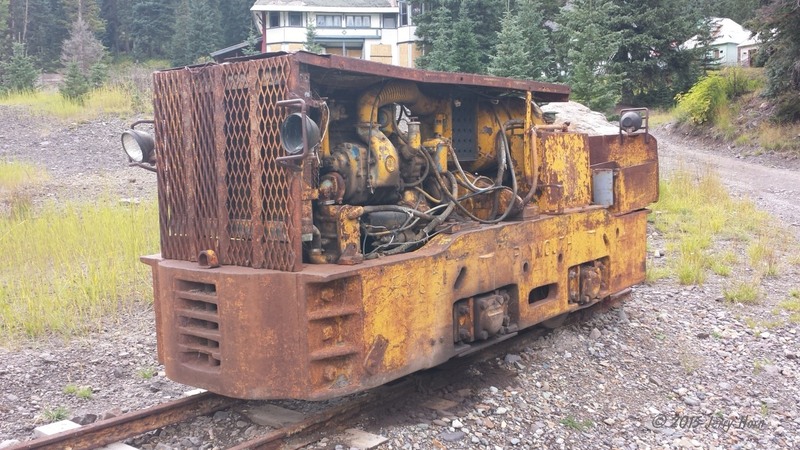 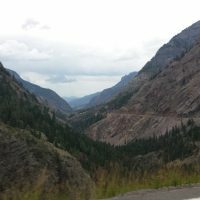 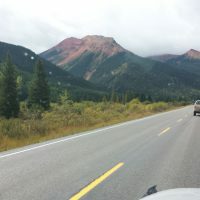 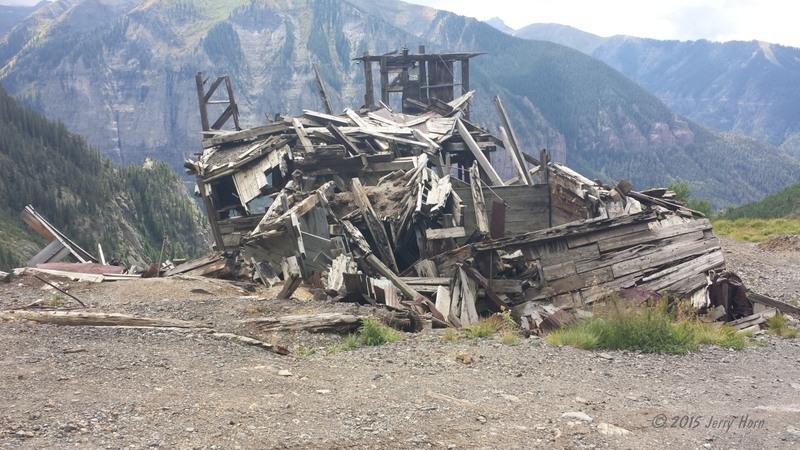 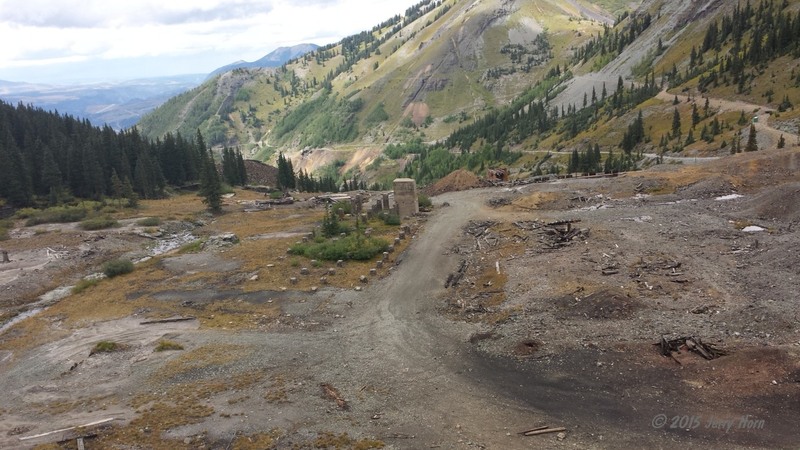 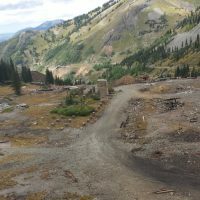 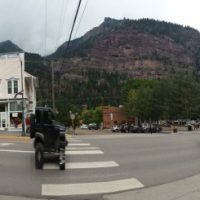 Once in Ouray, I back-tracked a little to retrieve my trailer and went back to Ouray for a few photos before continuing on to Ridgeway to refuel. 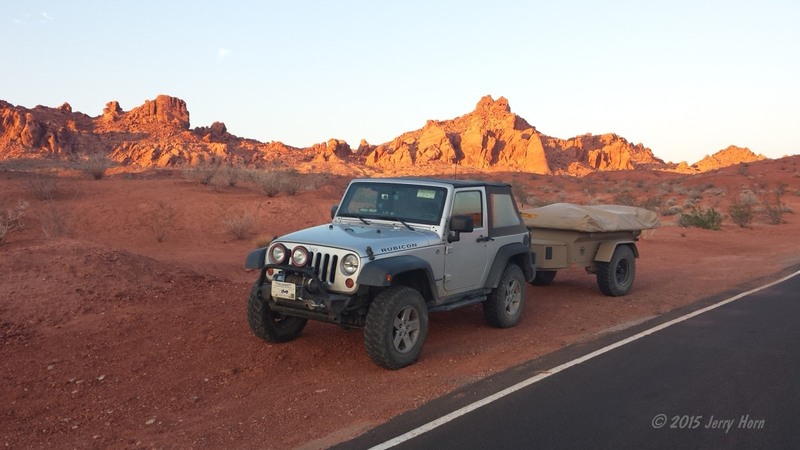 I caught a rainbow photo after fueling and set the GPS for Moab, UT. 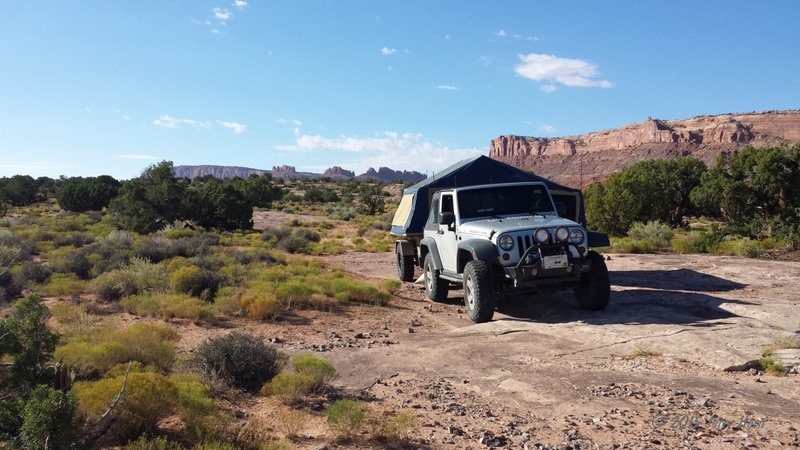 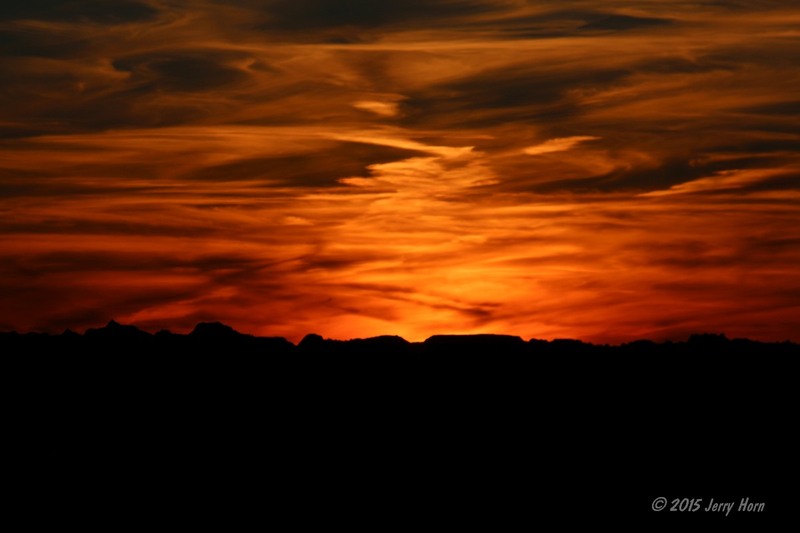 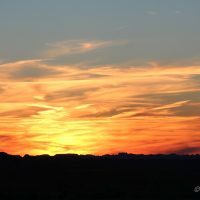 This had me traveling the night, crossing the state line at 9pm and made it to the campsite north of Moab at 10:55pm. 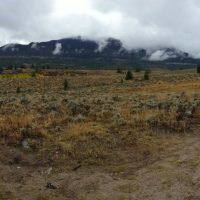 I set up camp and went straight to bed. 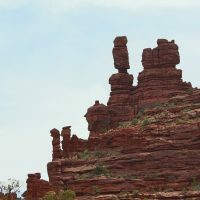 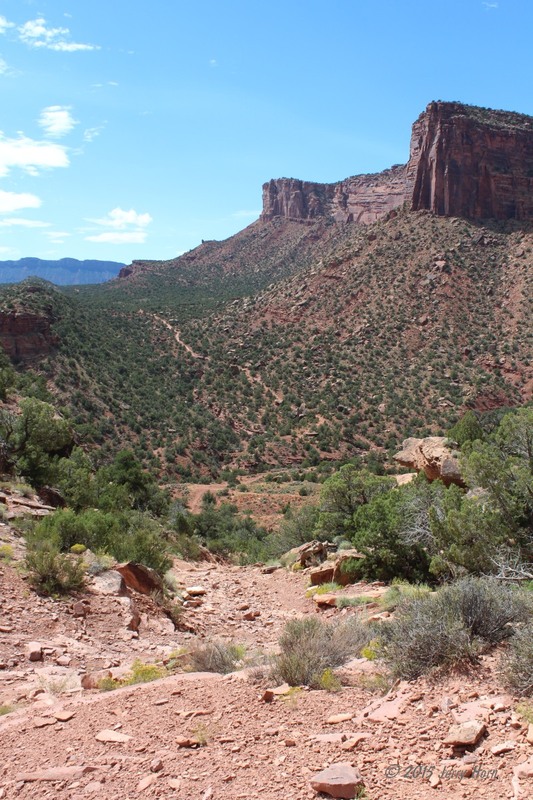 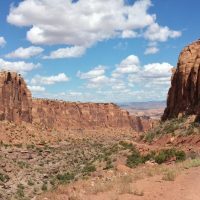 The plan for Sunday the 6th is to take the Gemini Bridges trail on the way to Canyonlands National Park and then do Long Canyon Rd and head back to Moab for supplies.Well, after a nice long rest and eating breakfast… I didn’t hit the road until 11:30. 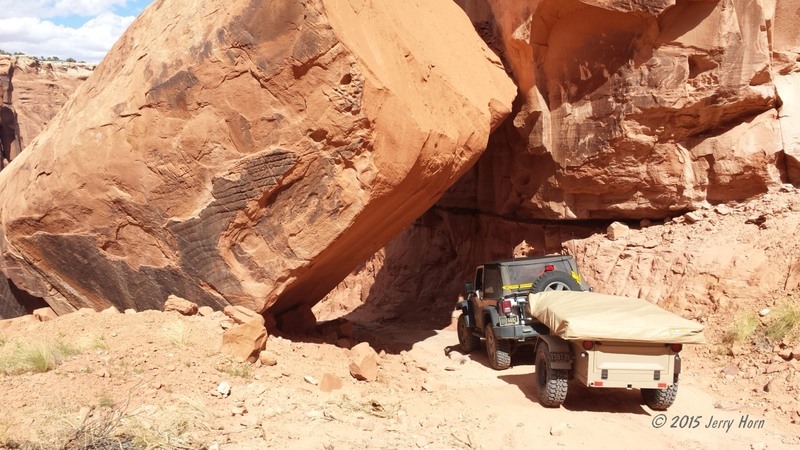 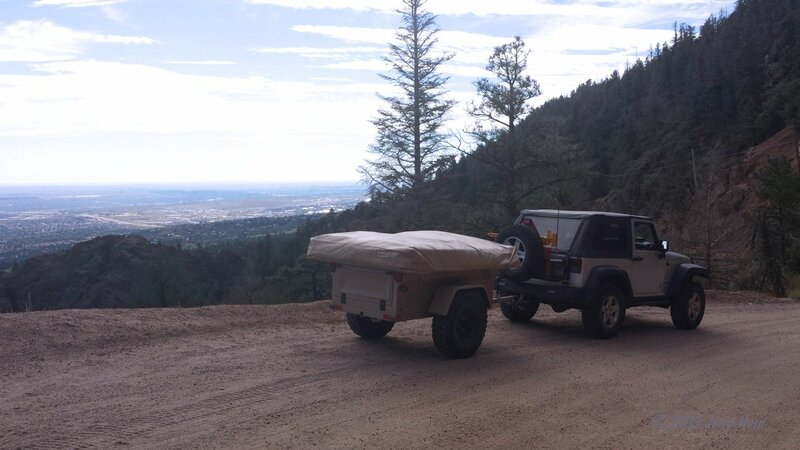 I took the trailer along with me, mainly for a photo op on Long Canyon Rd where the trail passes under a huge rock. 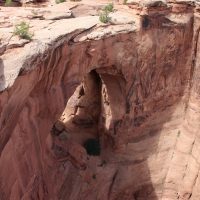 Gemini Bridges trail was easy and had a short hike to check out the bridges before continuing along the trail until I got back to pavement at Rt 313 which took me to Canyonlands. 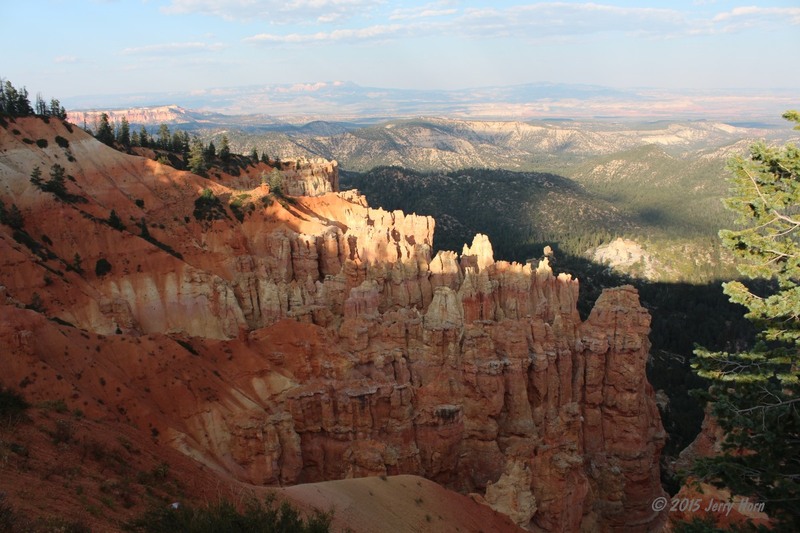 There, I finally got my new parks pass and went out to get a few photos at one of the overlooks since I was there. 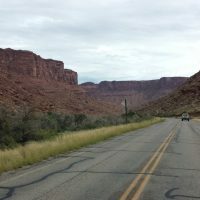 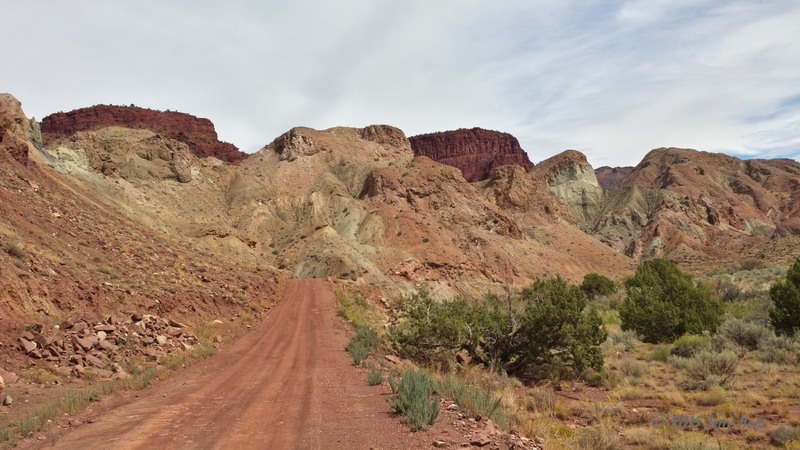 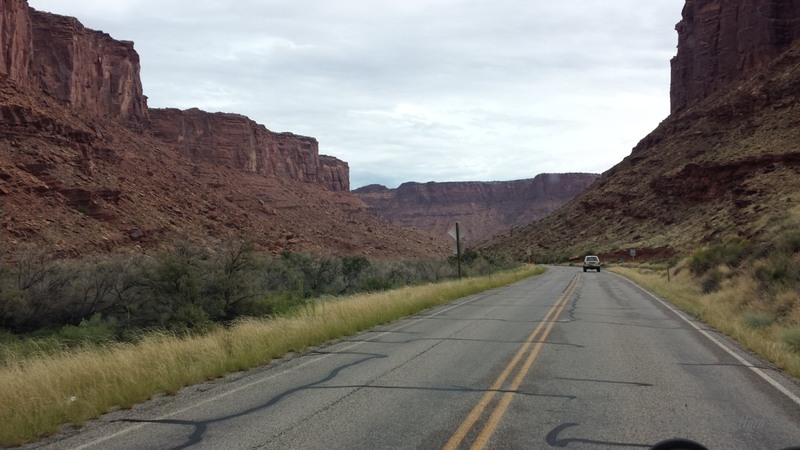 Now, I backtrack to Long Canyon Rd and follow that to pavement again at Rt 279, which is a nice winding road that follows the Colorado River back to Moab. 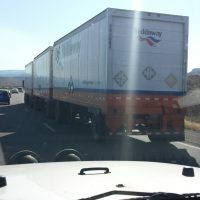 Here, I refuel and stock up on food and drinks. 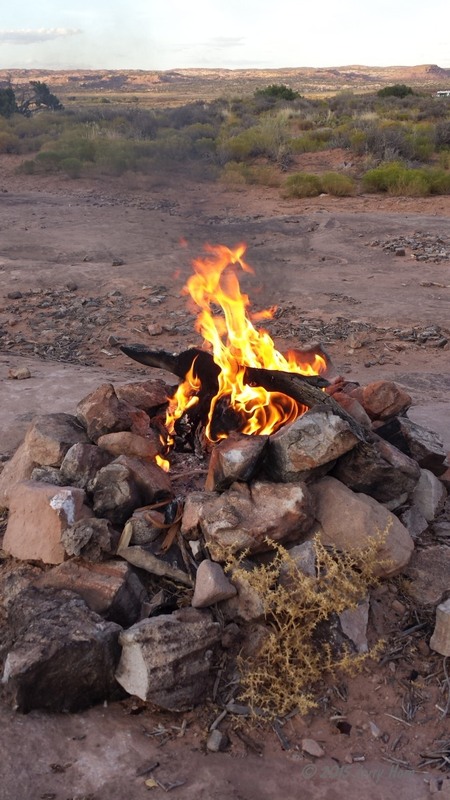 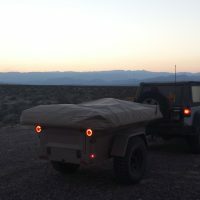 I make it back to camp around 5pm, make dinner and do some repairs to the plug for my 12v fan by a small campfire then look at the maps to figure out a plan for tomorrow. 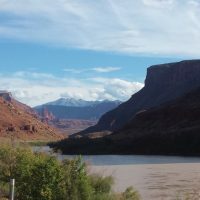 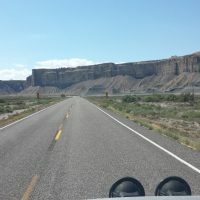 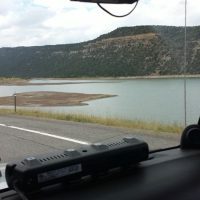 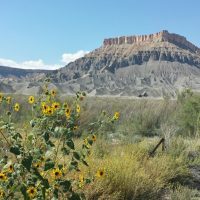 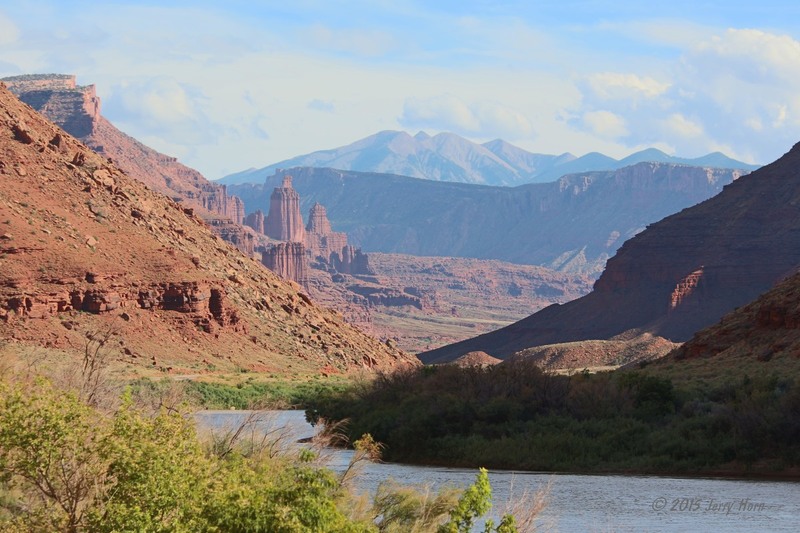 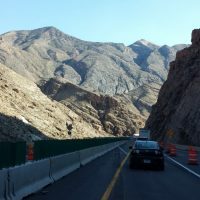 On Monday the 7th, I leave the trailer at camp and head down the highway to Rt 128, which is a nice road through the canyons following the Colorado River. 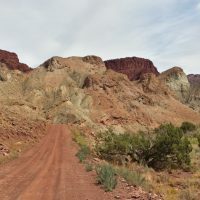 I took that for 20 miles until the turnoff for the Onion Creek trail, which is an easy fun trail that criss-crosses the Onion Creek multiple times. 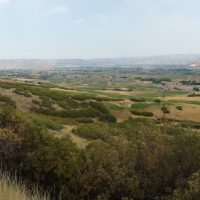 That trail led me to a turnoff for the Rose Garden Hill trail, which will be the hardest trail of the trip. 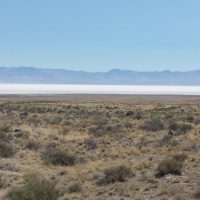 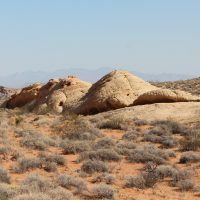 Most if it was fairly easy, winding through the desert, across debris in a wash or two then up the hill from which the trail is named. 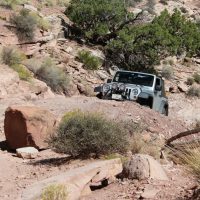 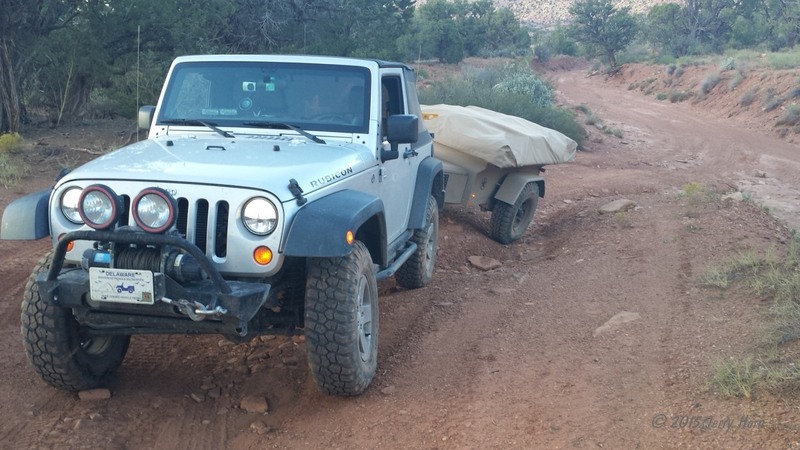 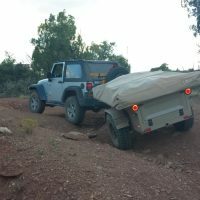 There, I ran into a few problems… got myself severely off-camber and then ran up against some very high ledges that required a little rock stacking and horsepower to complete. 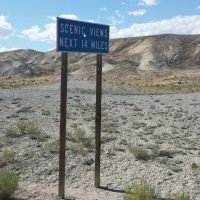 That half-mile hill took me 20 minutes to do, although I’m sure with a good spotter, it would have taken only half of that time. 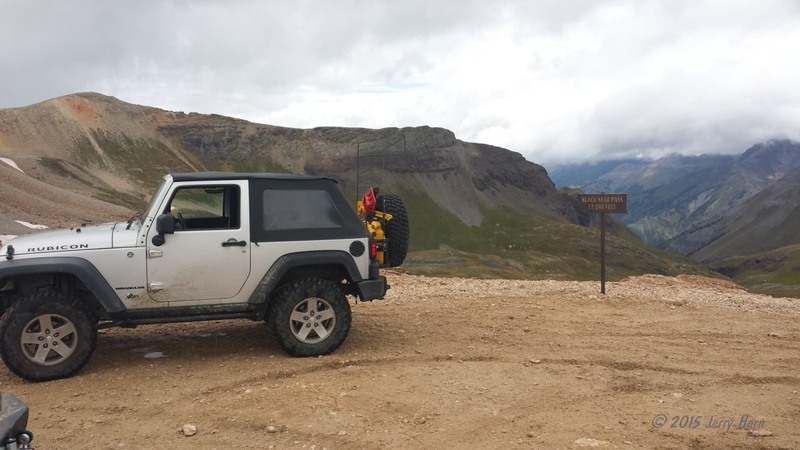 Once at the top, I stopped for a well-earned lunch break. 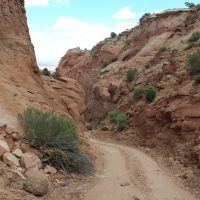 After lunch, I took the rest of the trail back to pavement. 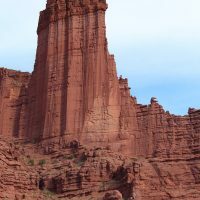 After a quick photo at the old Dewey Bridge, I traveled back down Rt 128 towards Moab, but took a turnoff for Fisher Towers to get a few photos. 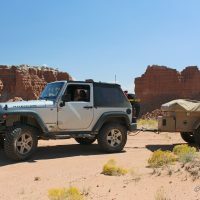 After the photo stop, back to Moab for fuel and a stop at the visitor center, then to camp for dinner by the fire. 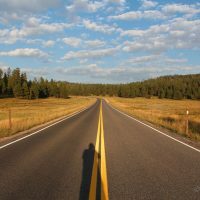 I slept in again on Tuesday the 8th, and hit the road at 10:22. 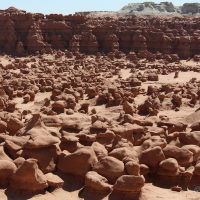 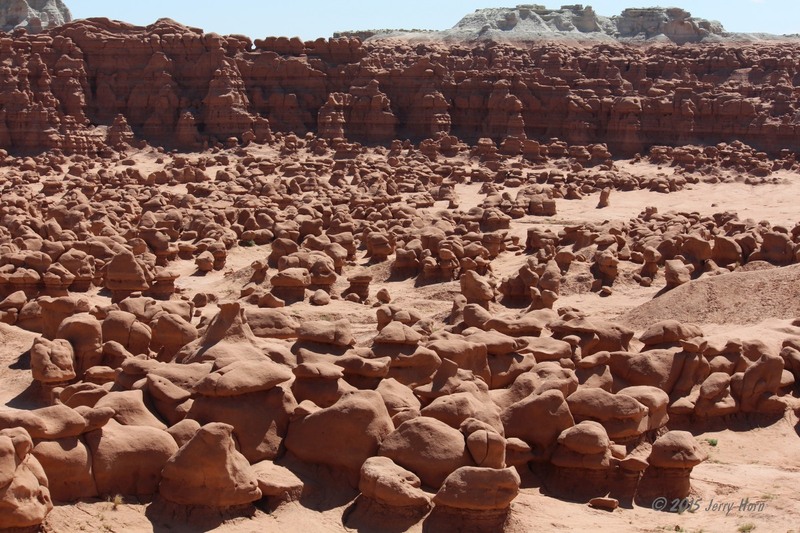 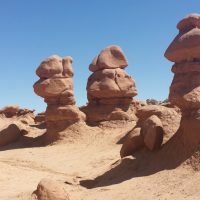 Today, I’m heading across the canyons to stop at the Goblin Valley State Park, on the recommendation of the Moab visitor center. 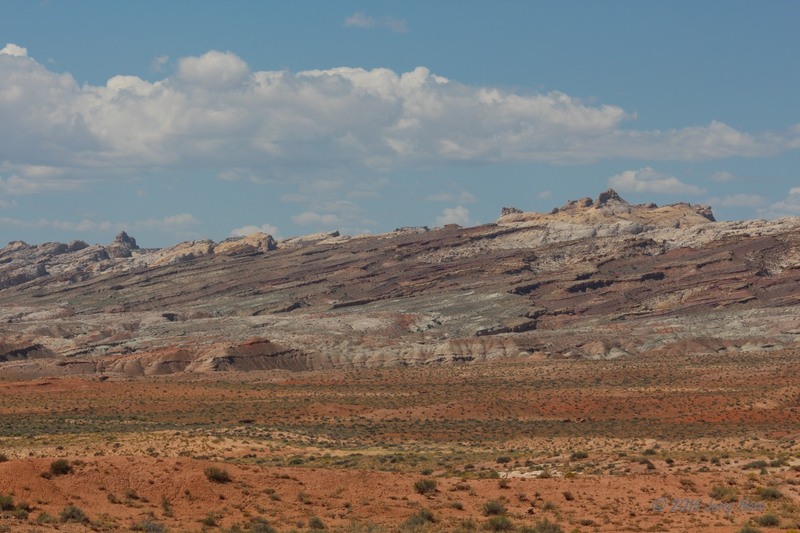 This area is fairly desolate, even more so than Moab. 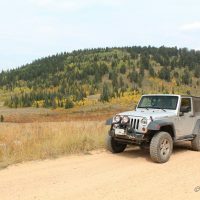 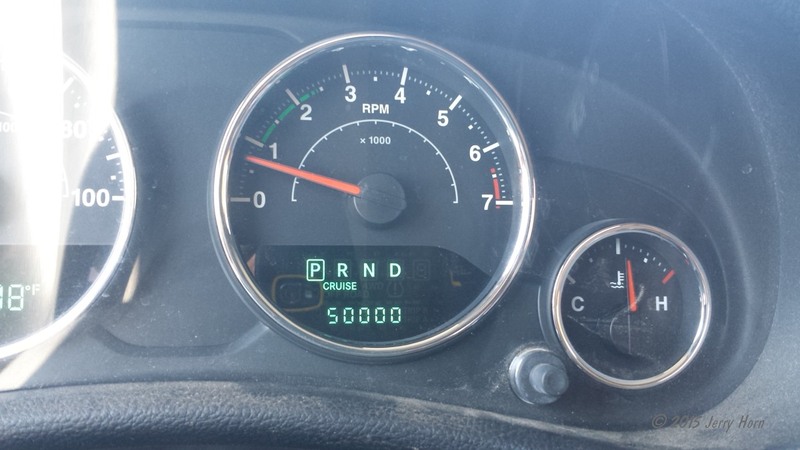 I spent a little time at the park before taking a “shortcut” 4×4 road back to the highway. 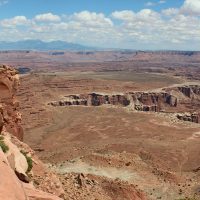 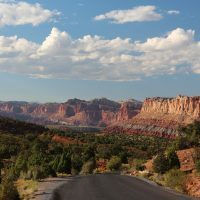 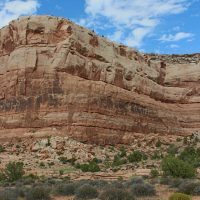 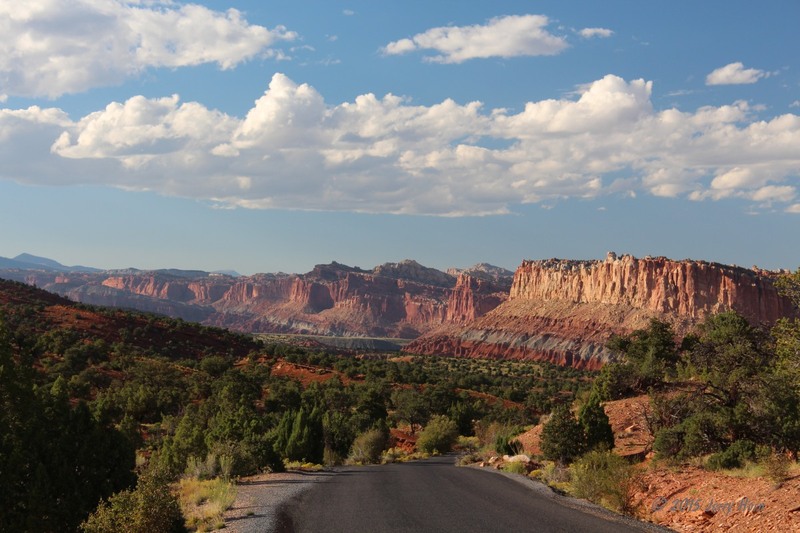 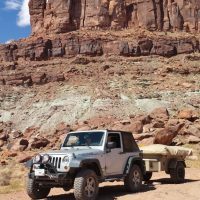 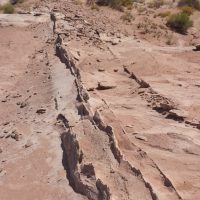 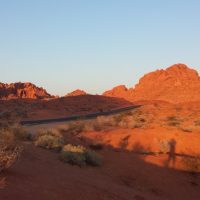 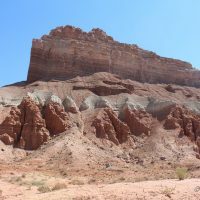 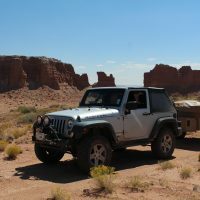 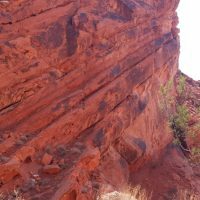 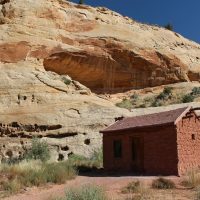 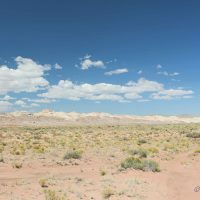 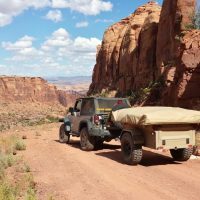 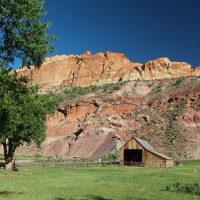 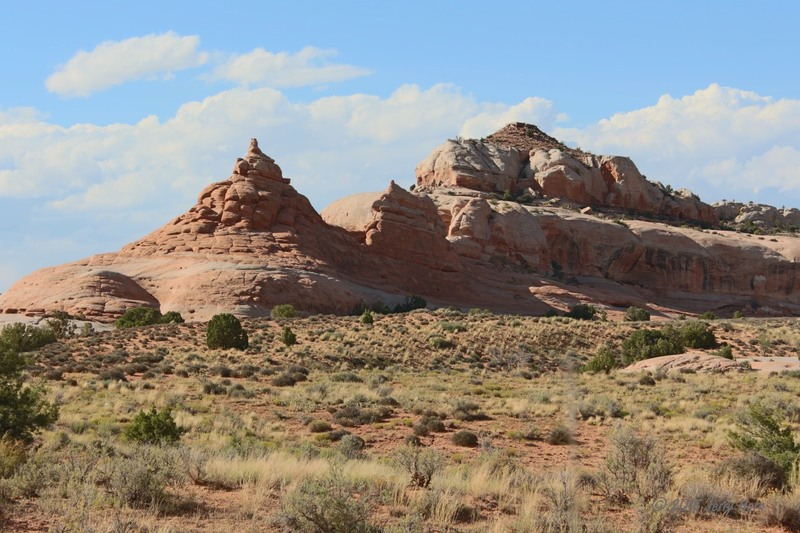 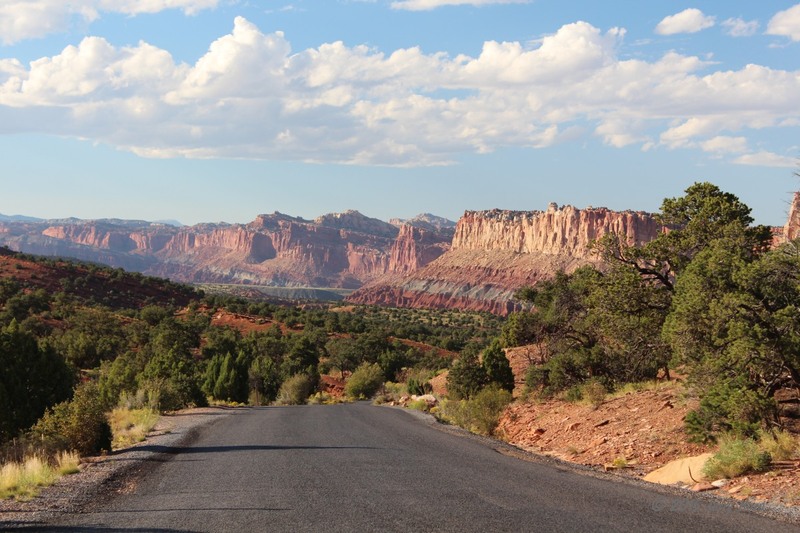 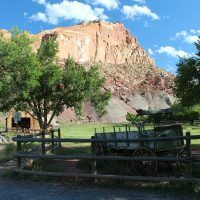 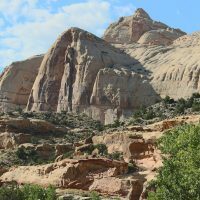 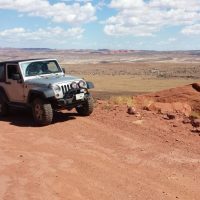 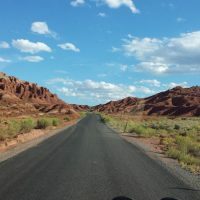 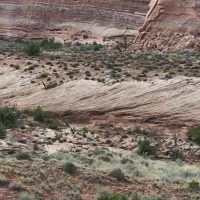 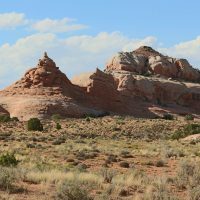 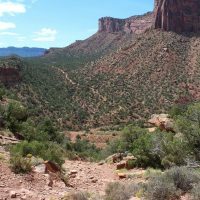 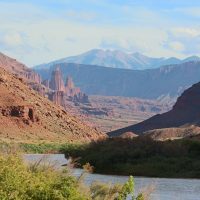 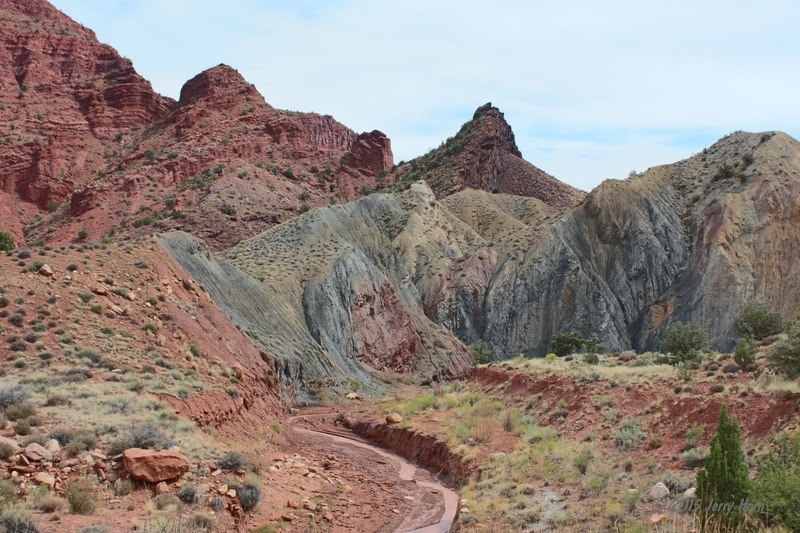 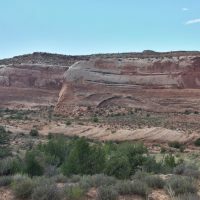 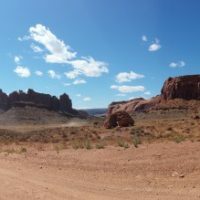 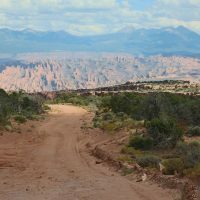 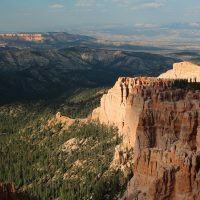 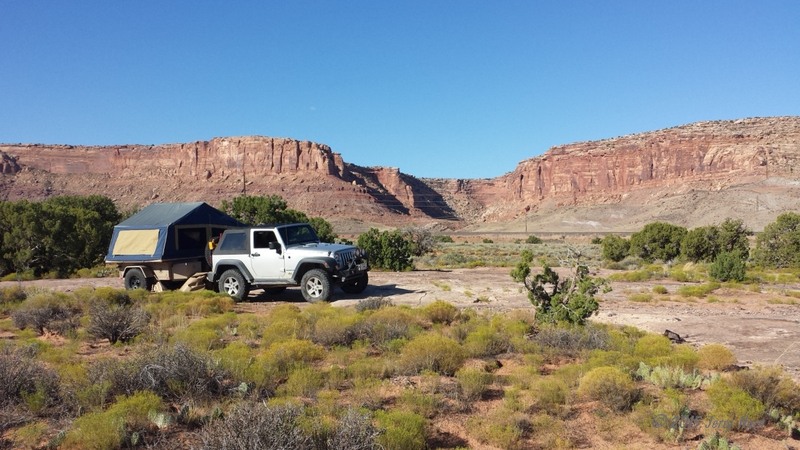 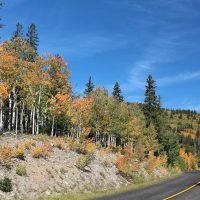 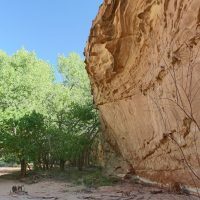 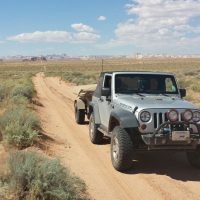 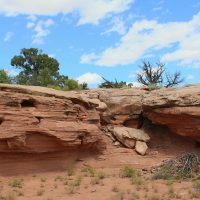 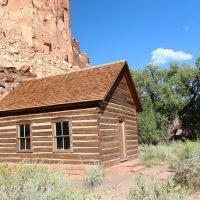 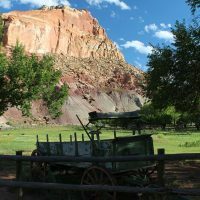 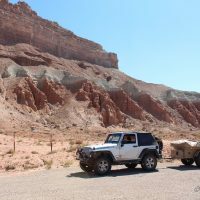 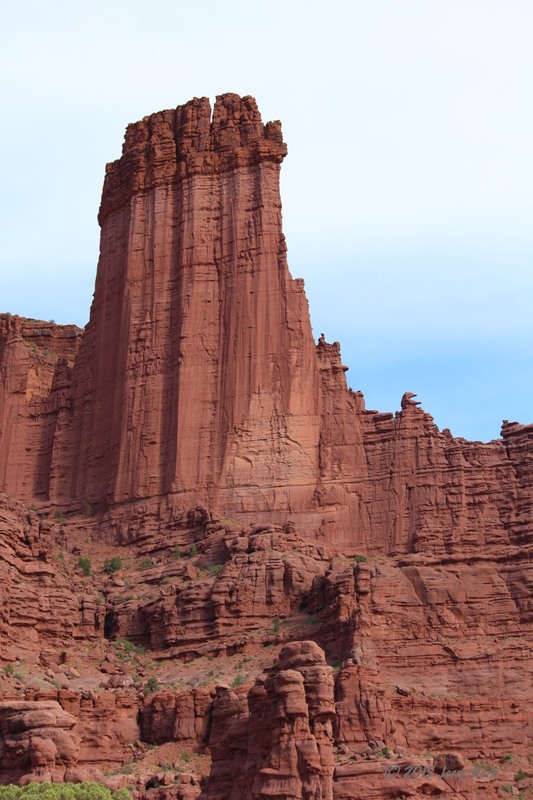 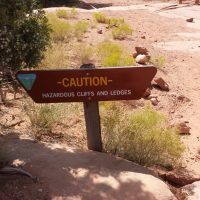 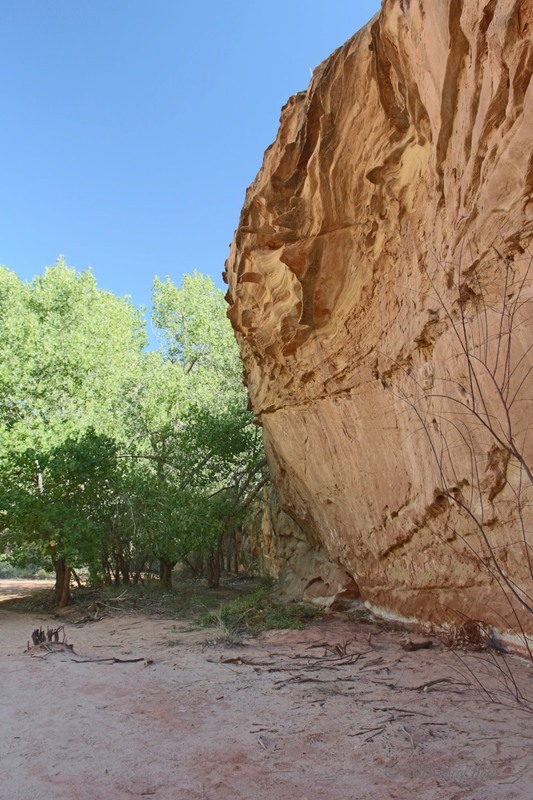 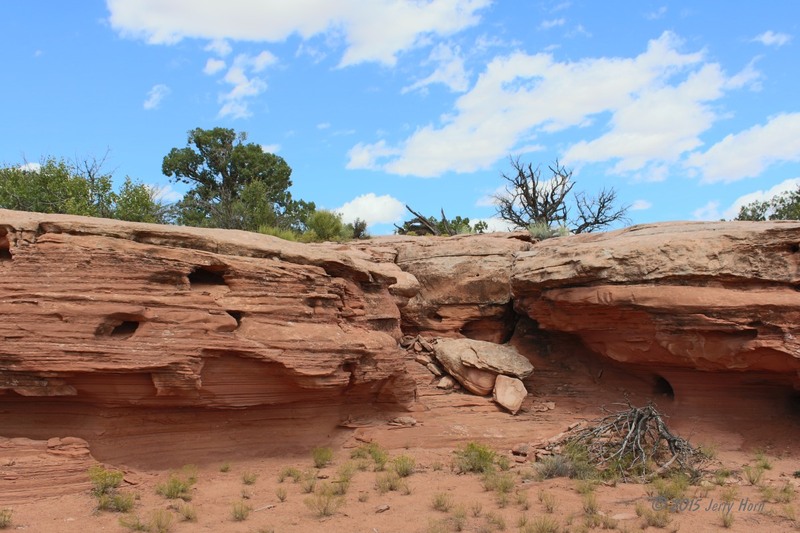 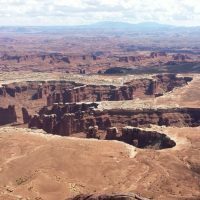 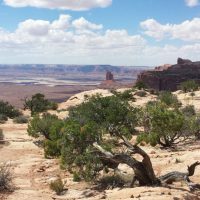 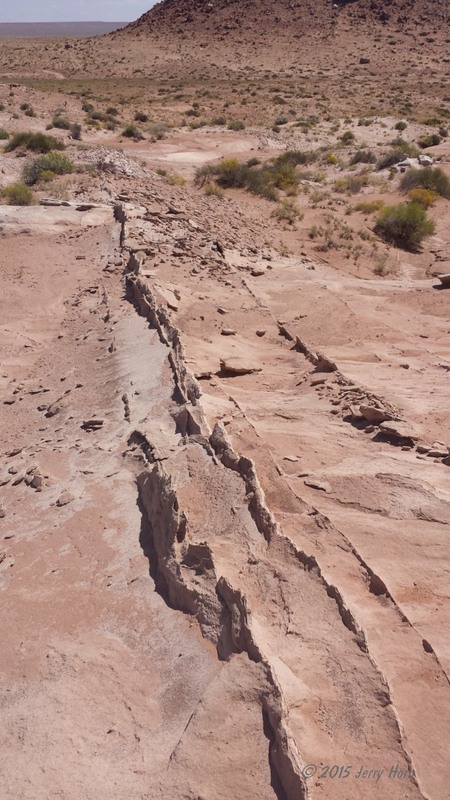 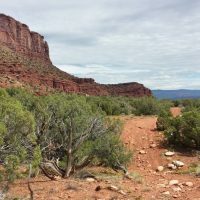 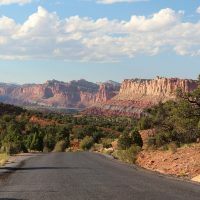 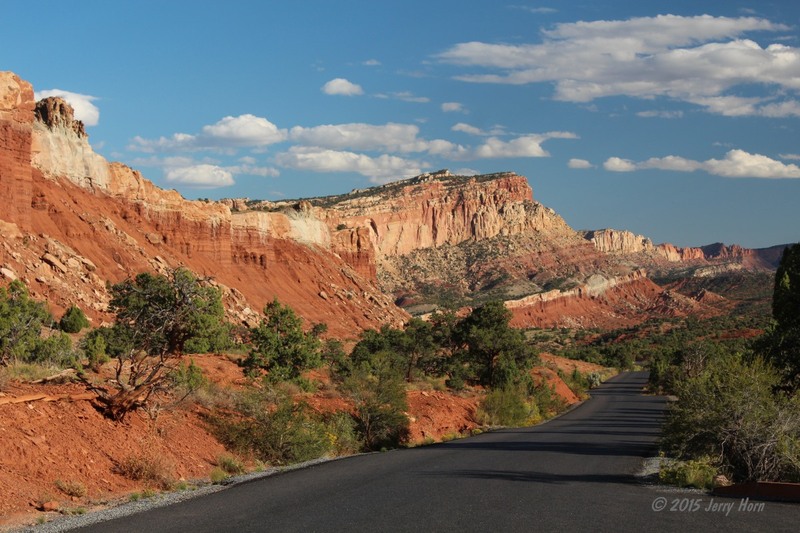 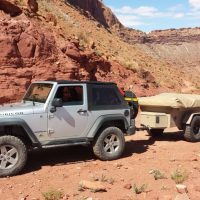 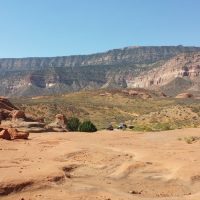 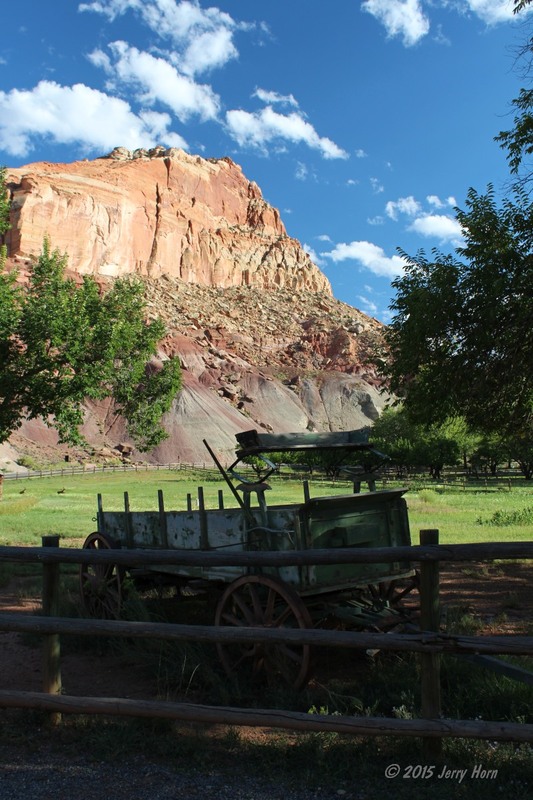 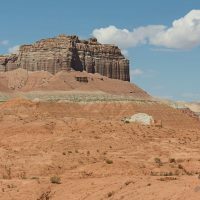 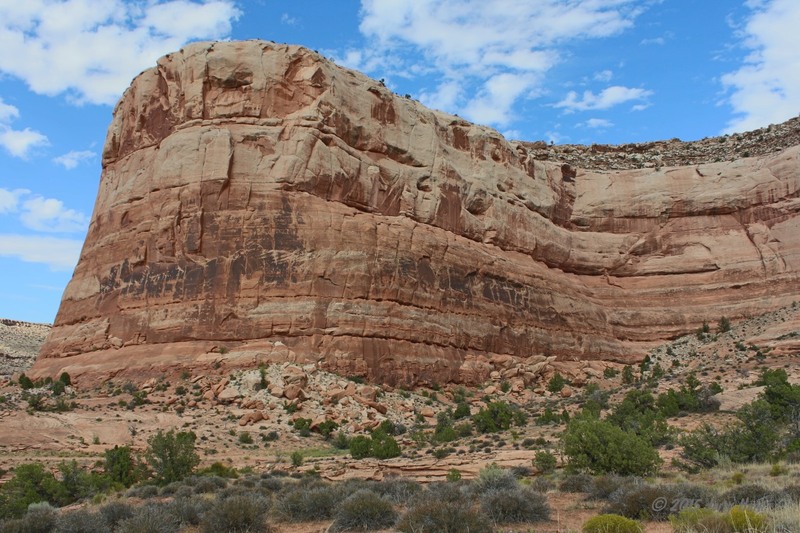 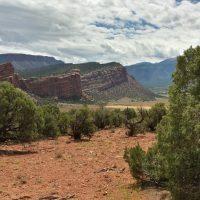 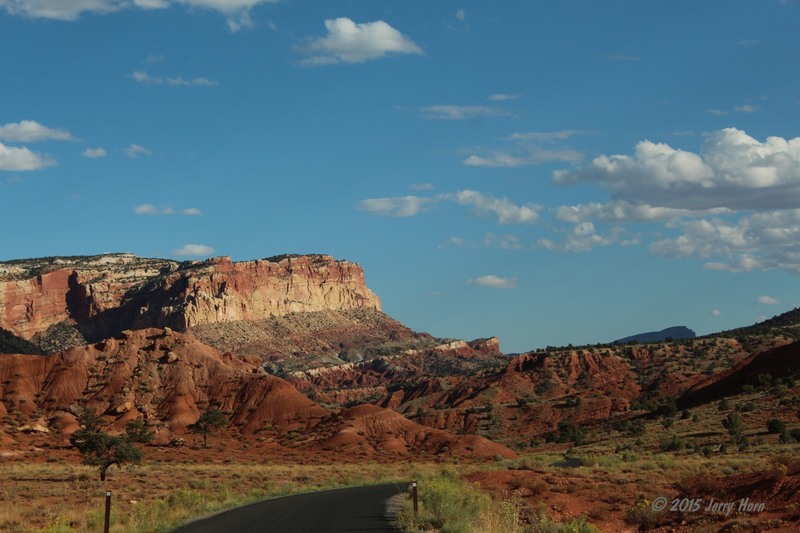 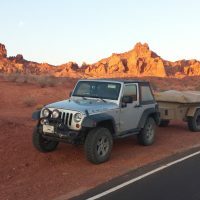 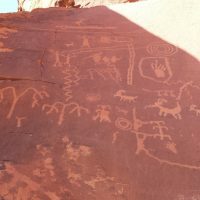 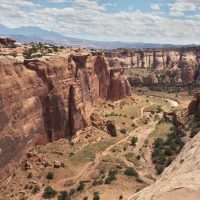 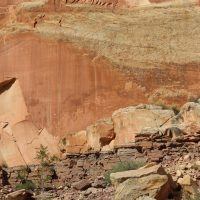 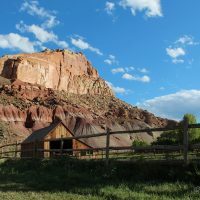 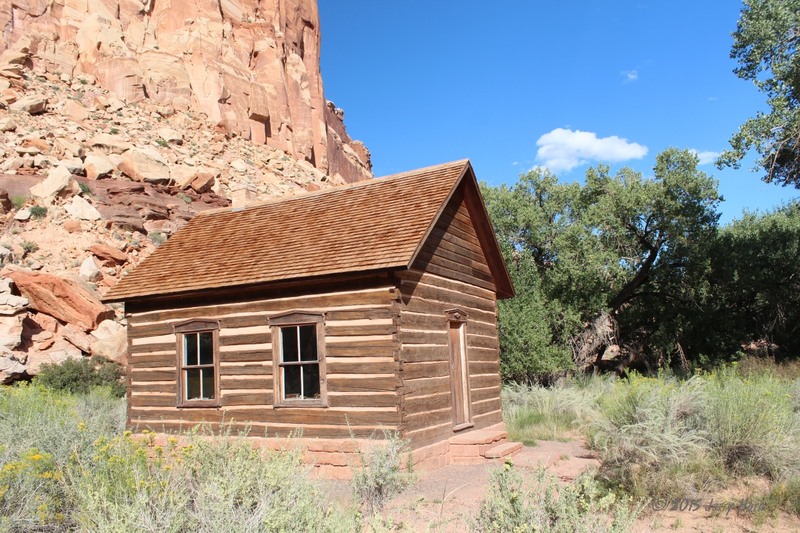 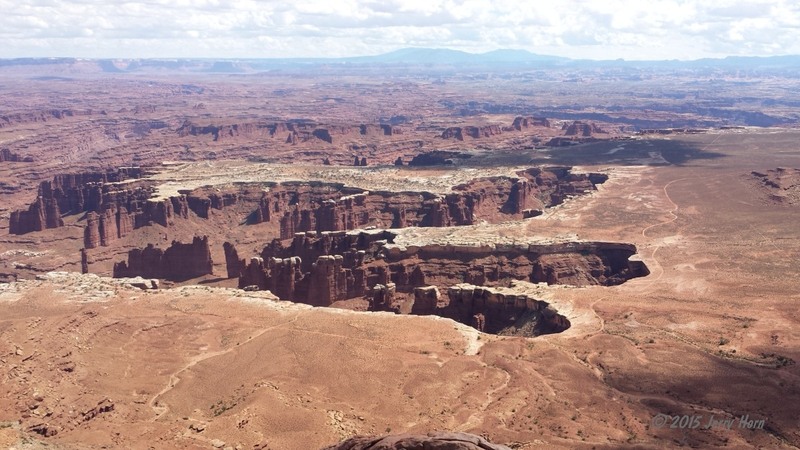 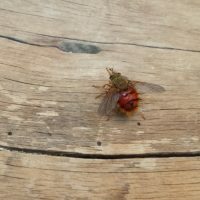 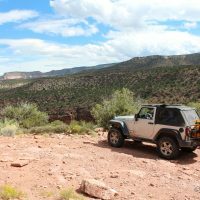 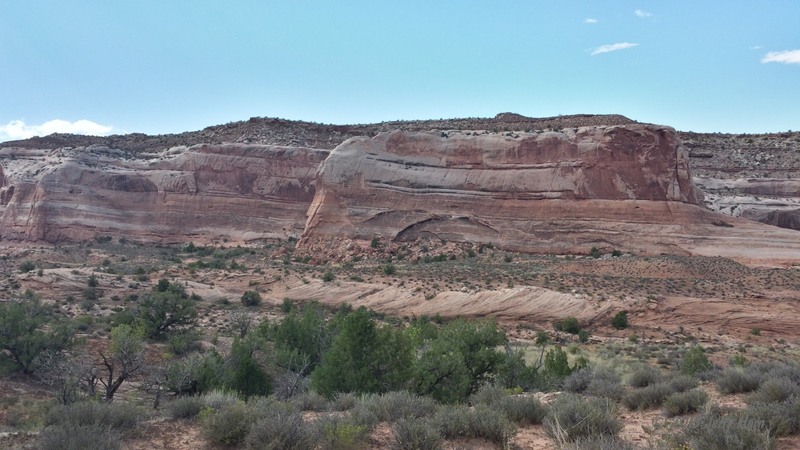 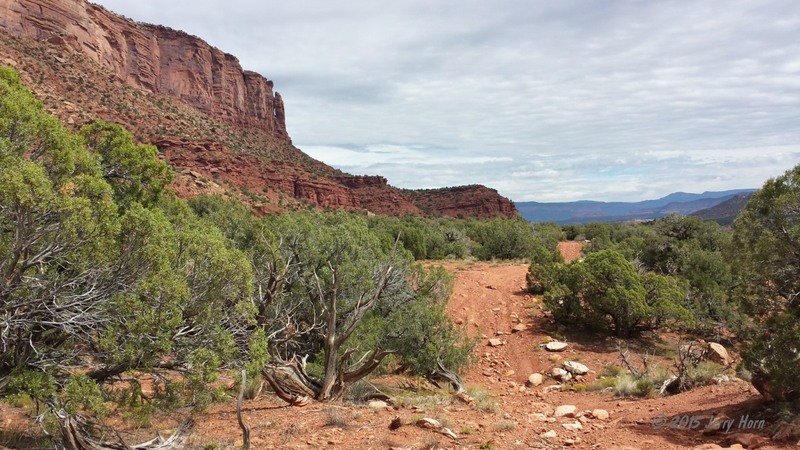 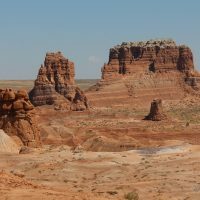 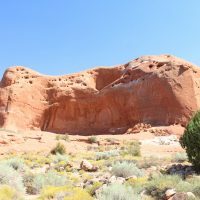 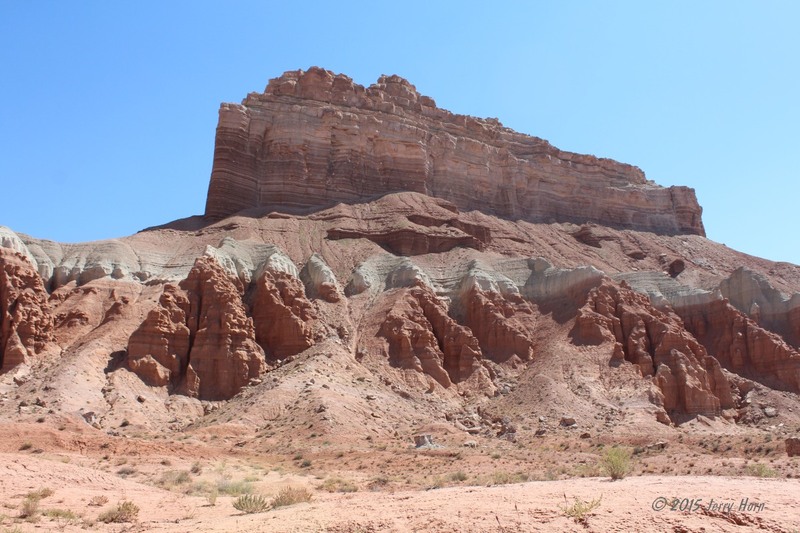 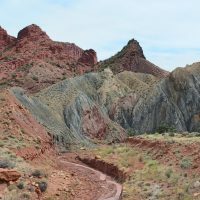 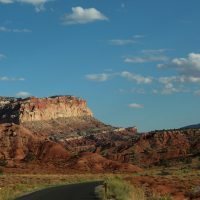 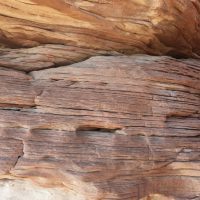 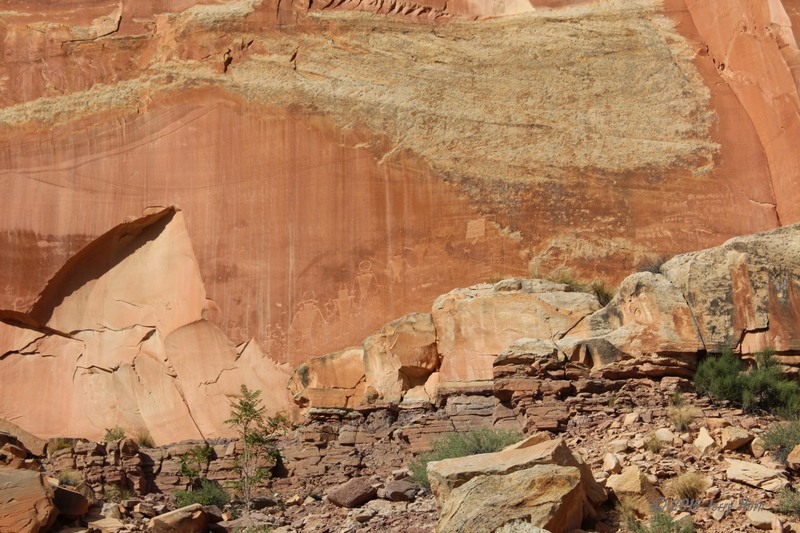 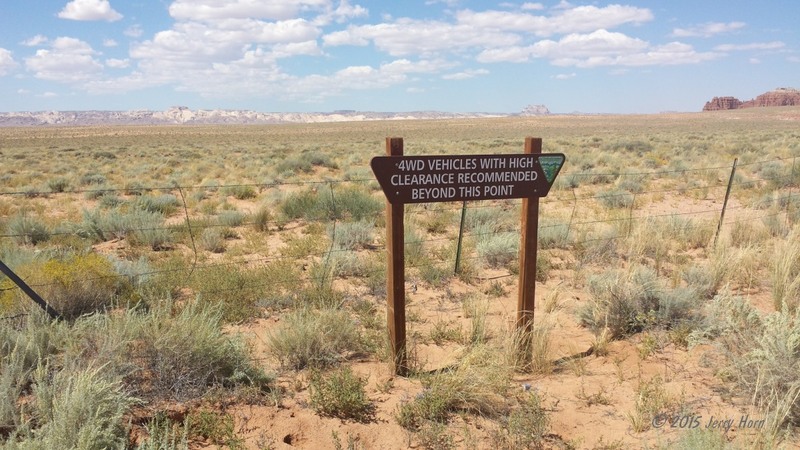 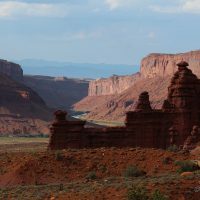 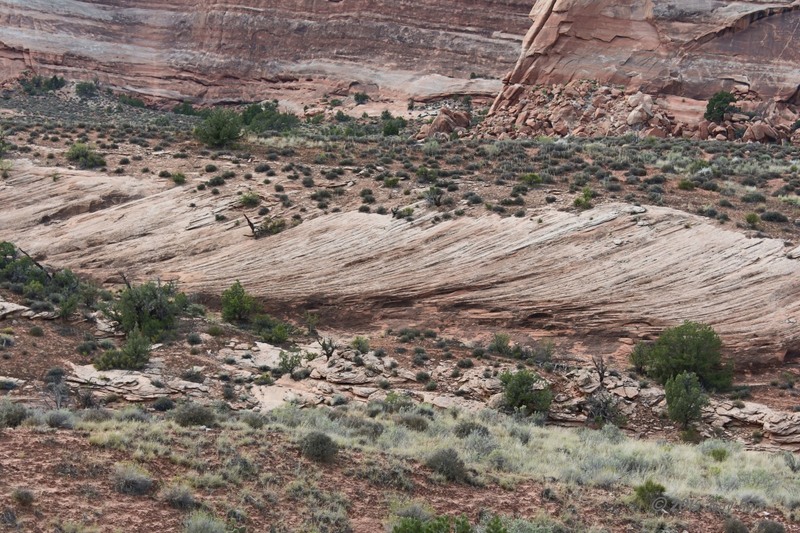 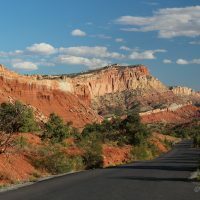 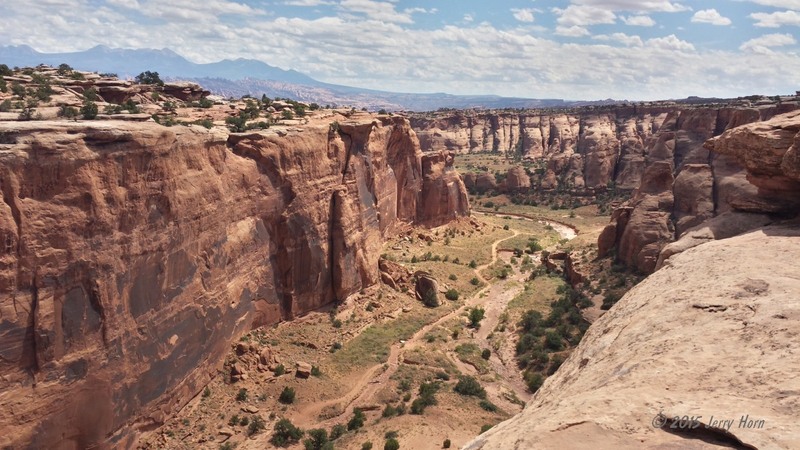 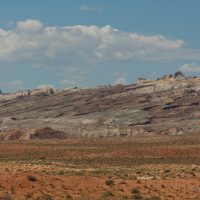 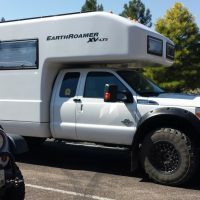 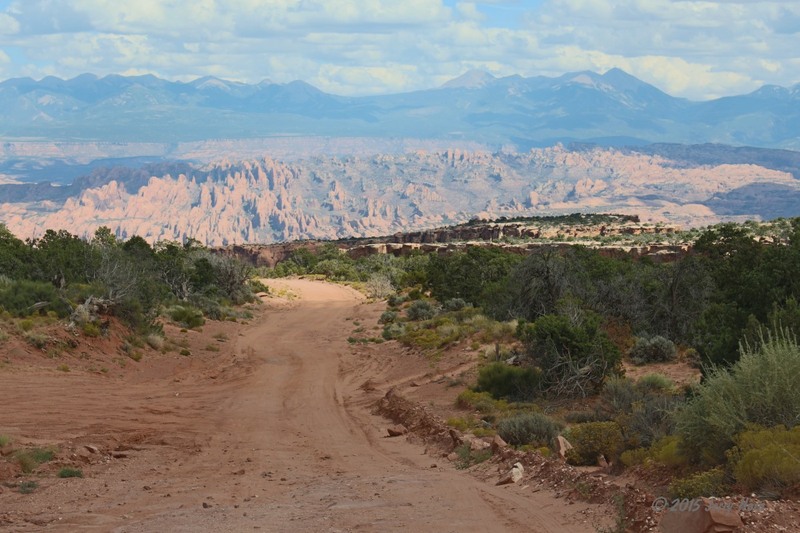 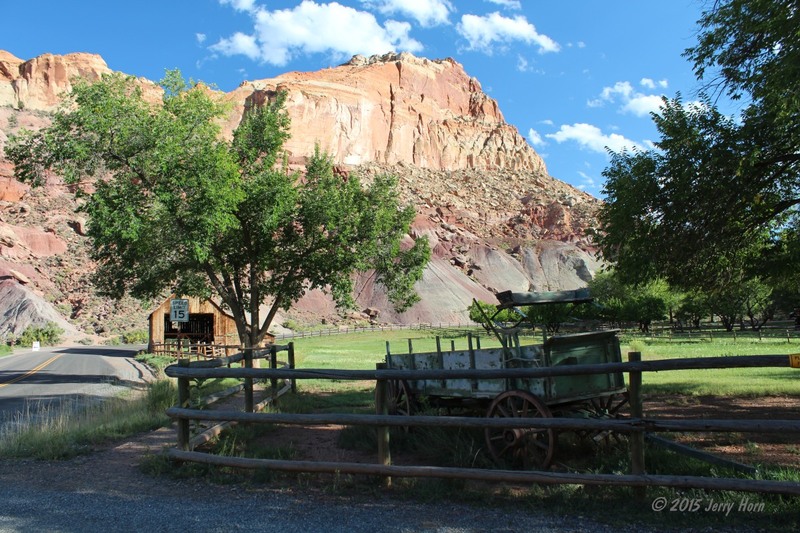 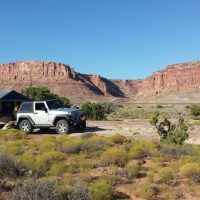 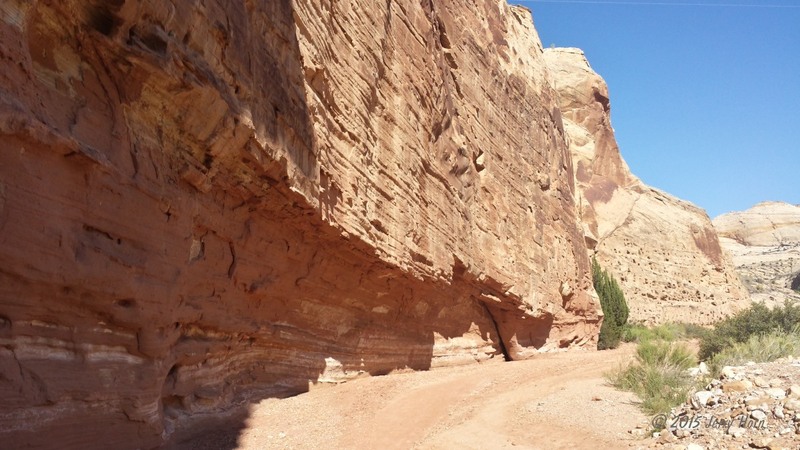 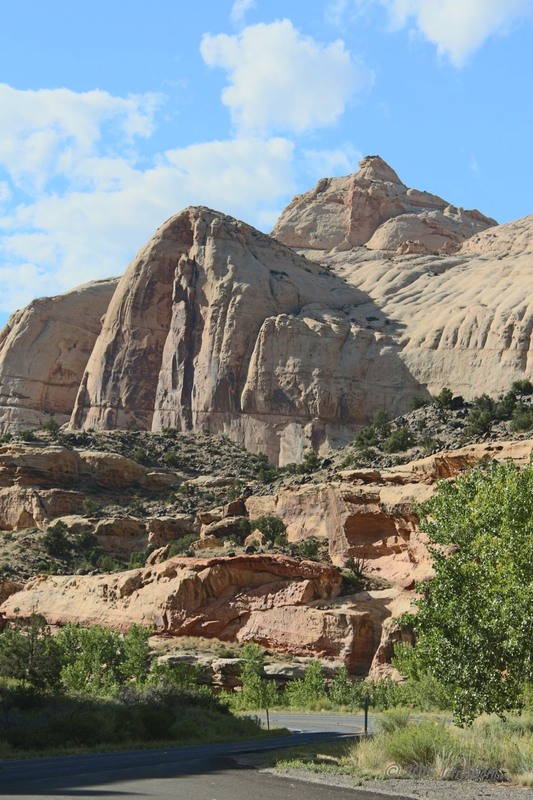 I had kinda intended to camp in the remote Maze section of Canyonlands National Park, but the timing just wasn’t right, so I decided to head more southwest… I ended up spending a little time at the Capitol Reef National Park and left via a 4×4 road. 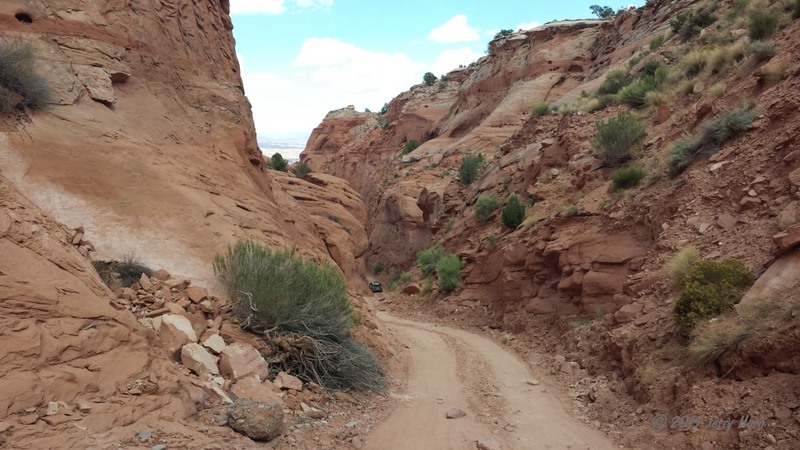 That road tested me a little bit, as it included a steep hill climb with some bad erosion. 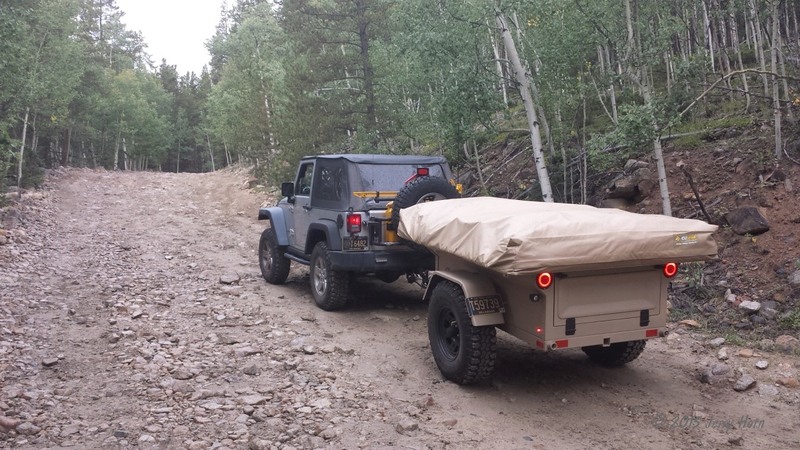 Thankfully, the mud tires on the trailer did their job and kept it from sliding into the ruts. 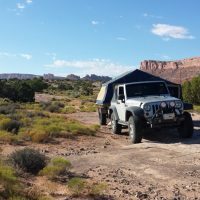 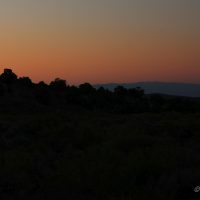 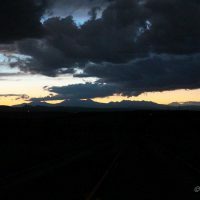 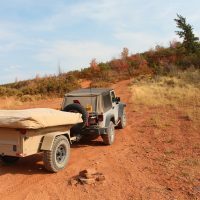 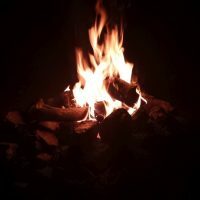 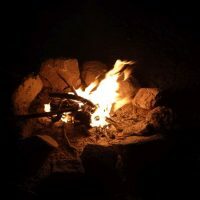 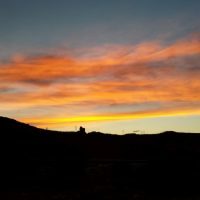 It was dark before I made it to pavement, and pointed the Jeep toward Escalante, UT and found a campsite in the Grand Staircase-Escalante National Monument. 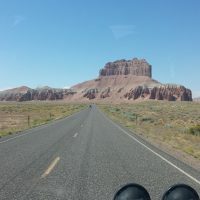 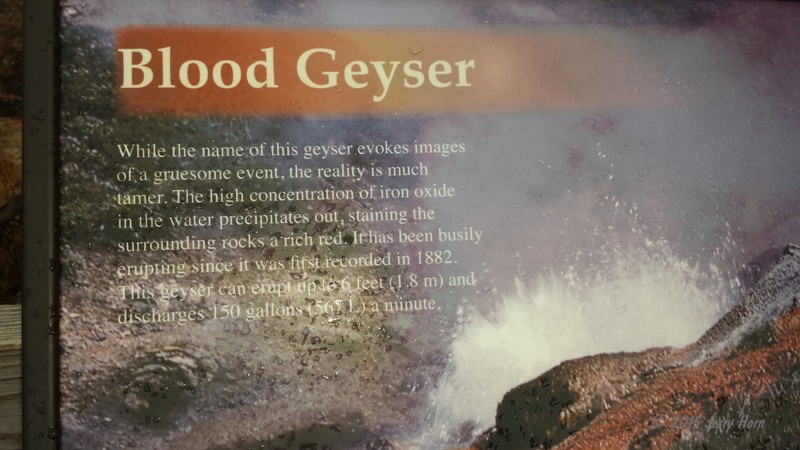 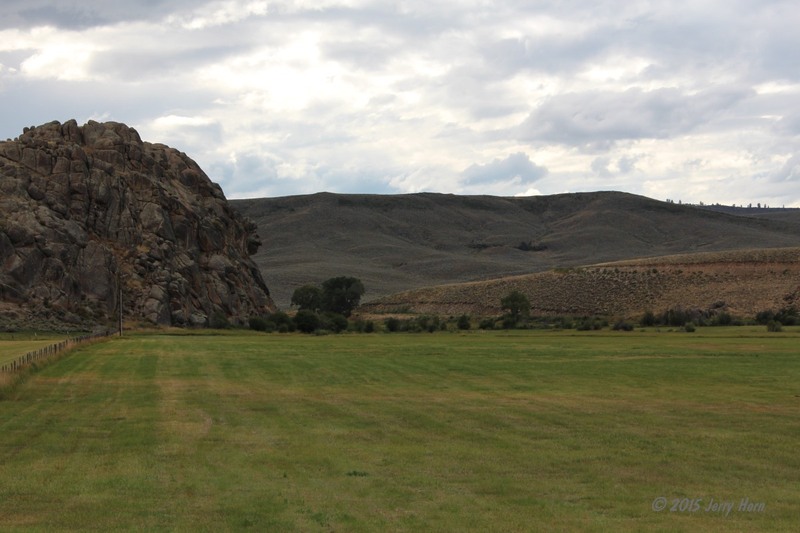 On Wednesday the 9th, I got moving pretty quickly and headed for the Hole-in-the-rock Road, which is a 50+ mile road to an interesting part of history, where the Mormon explorers carved a trail into the rock down to the water level so they could cross the river and continue on. 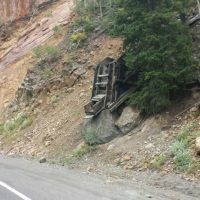 Unfortunately for me, the road is not maintained very well, it had the worst washboard I’ve ever seen. 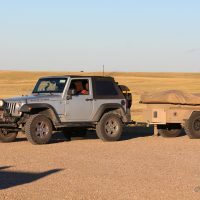 I was being rattled to the point of tears and passing 2 graders with their blades up didn’t help matters. 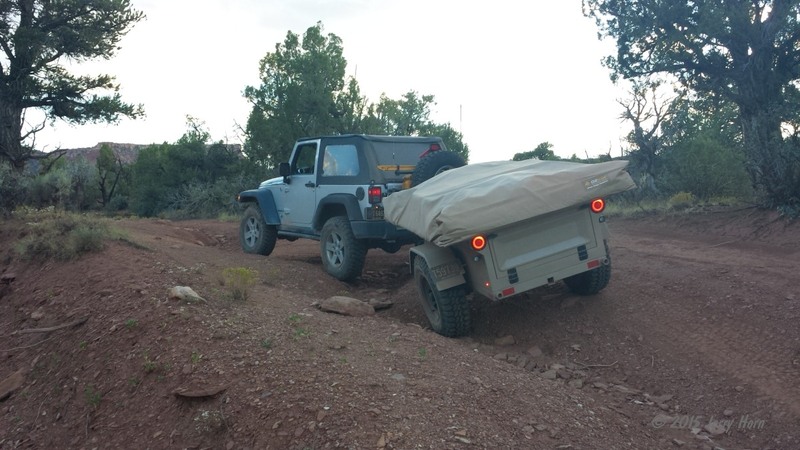 They were only there to push a little dirt away from a washout. 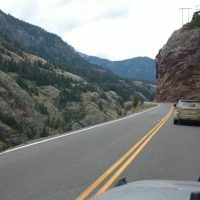 Around 25 miles in on this dead-end road, I decided to turn around after I reached “Dance Hall Rock”. 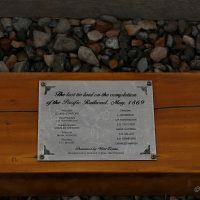 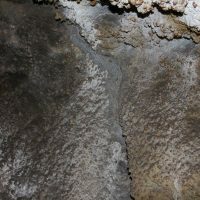 That is a neat feature that was used as a gathering point for the explorers while they worked on digging through the rock. 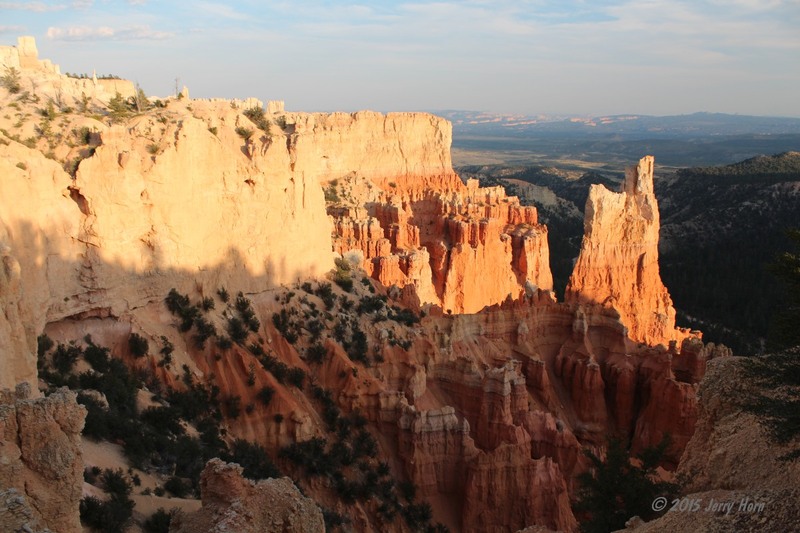 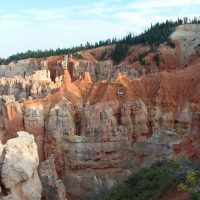 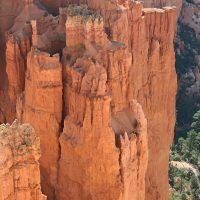 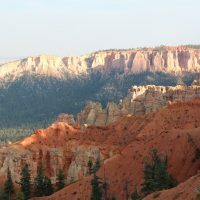 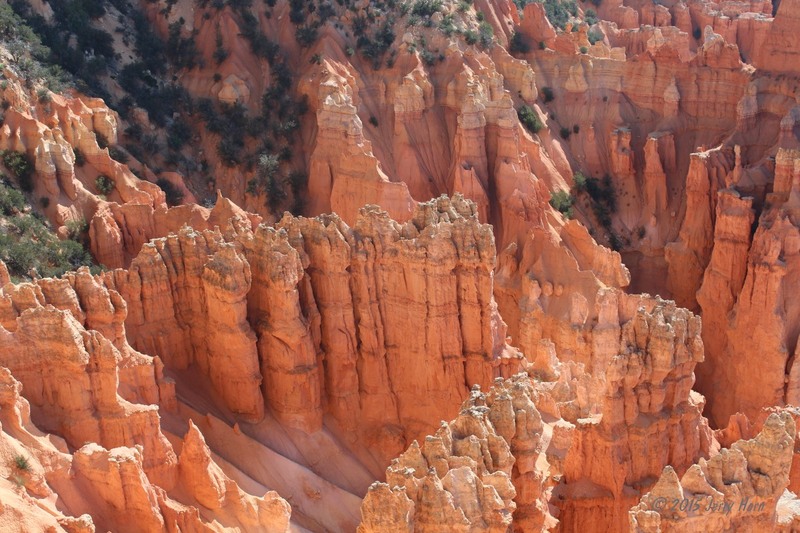 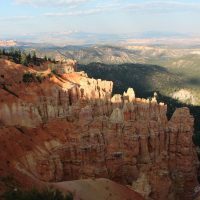 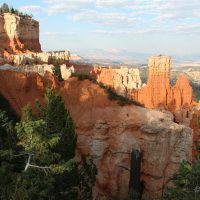 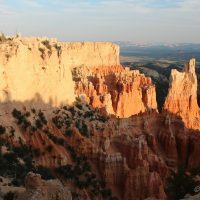 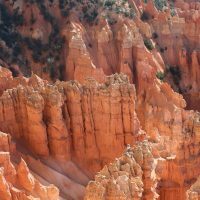 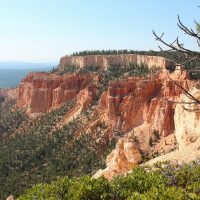 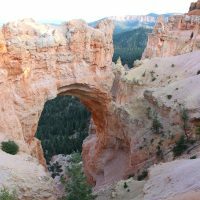 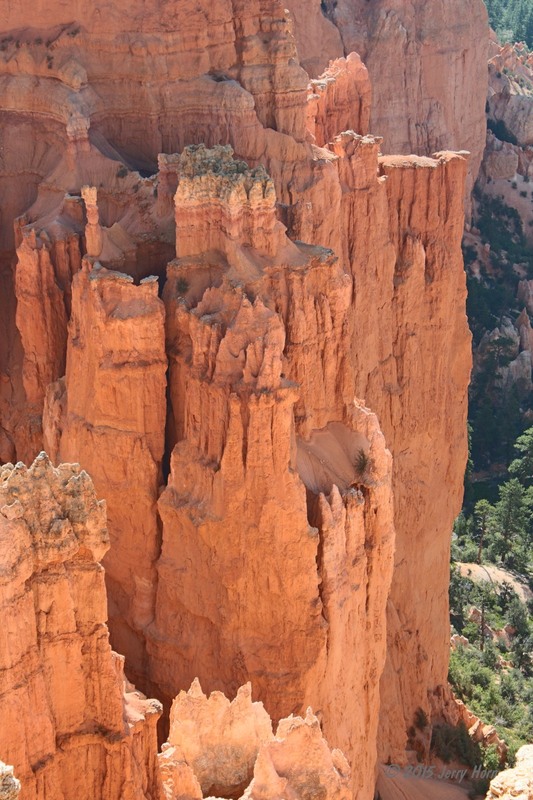 After turning around at Dance Hall Rock, I decided to go to Bryce Canyon National Park and got there around 5pm. 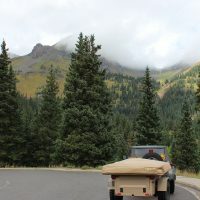 I was rudely greeted by a sarcastic ranger at the entrance booth “you’re parking that trailer, right?” Apparently, they don’t allow long vehicles or trailers after a certain point on the road to the overlooks, but he didn’t tell me that, I had to read it in the park guide. 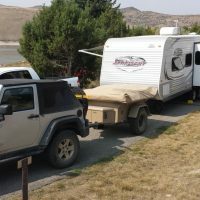 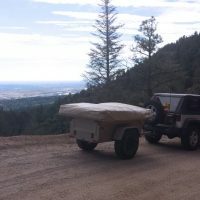 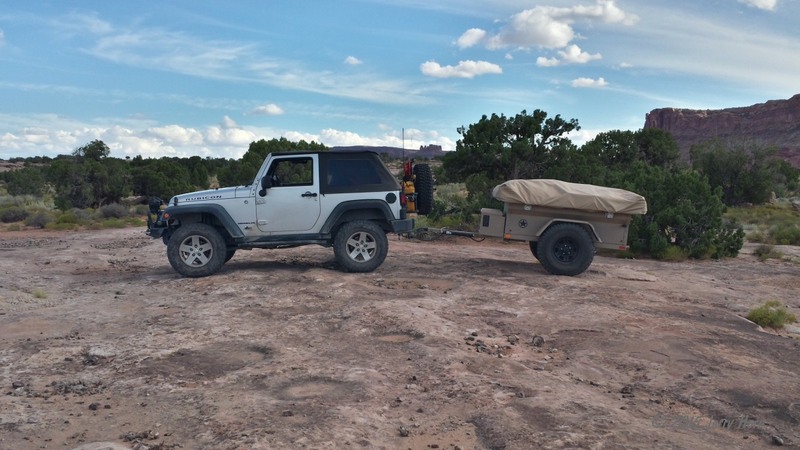 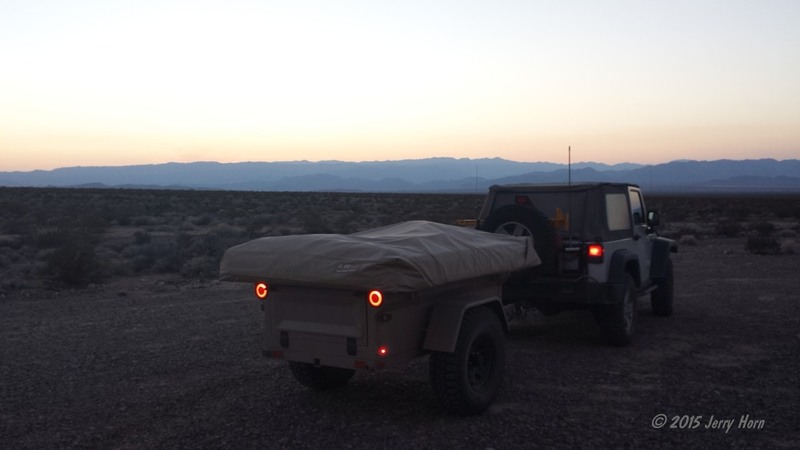 At any rate, my first priority was to find a good campsite, so I looked and found one that would work with my trailer and unhooked before heading out to the overlooks for a few photos. 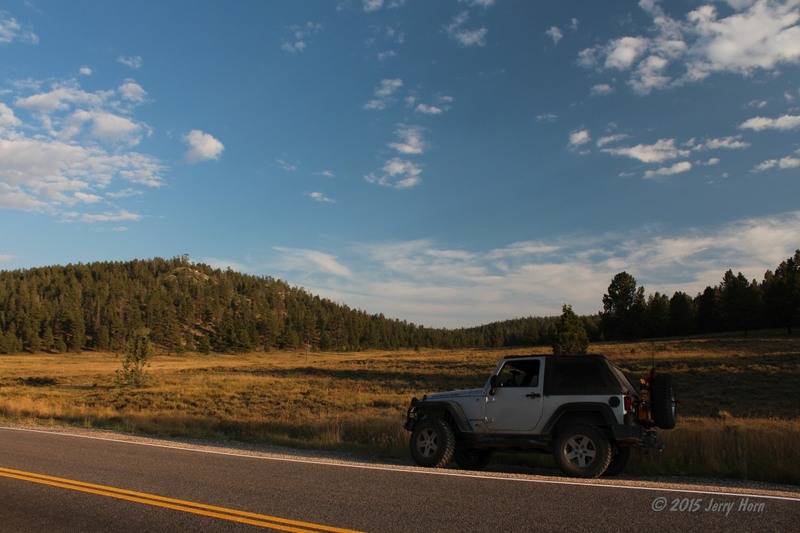 A nice drive through some meadows and pine forests. 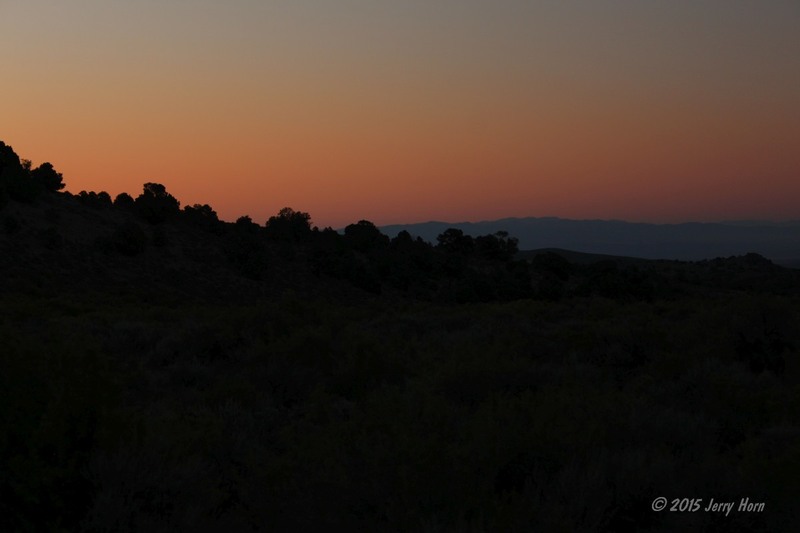 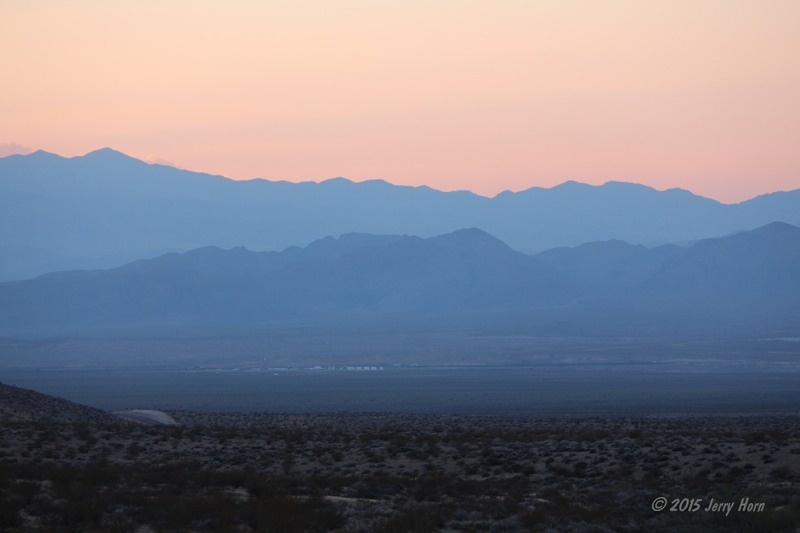 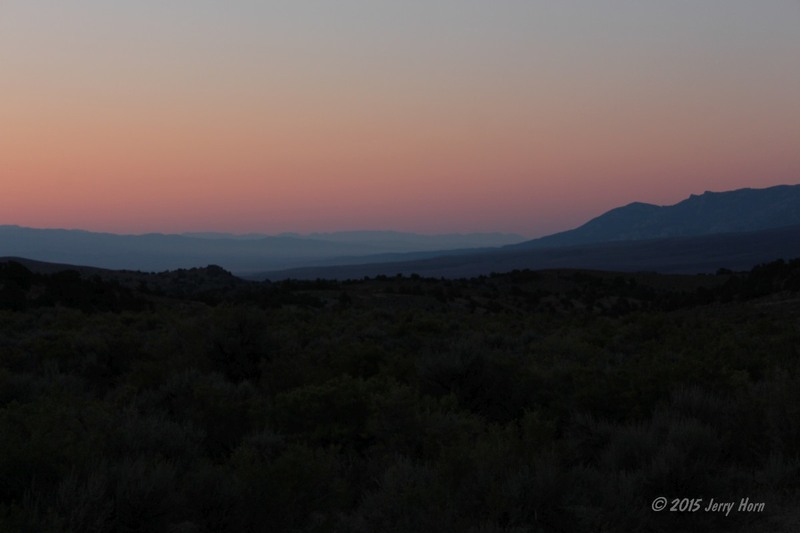 The sun was setting as I was taking photos, so I retreated to the campsite for dinner and sleep. 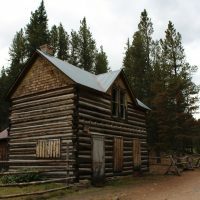 Now on Thursday the 10th, I took my time at camp and went out to get some more photos before leaving the park around noon. 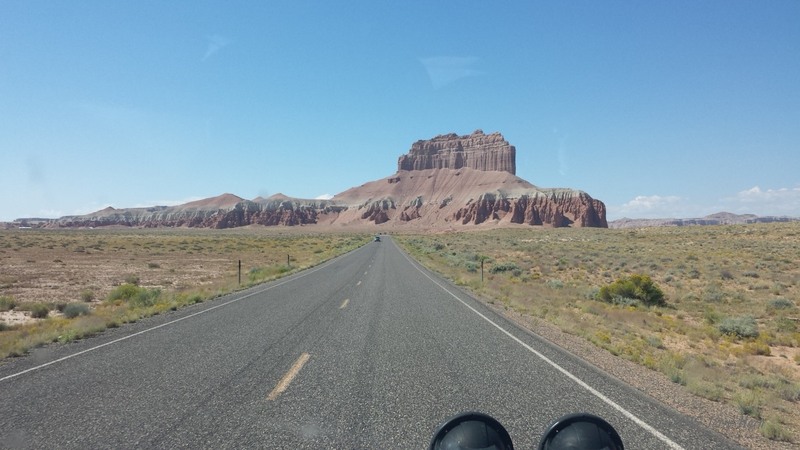 I didn’t have a plan set in stone, just head further west. 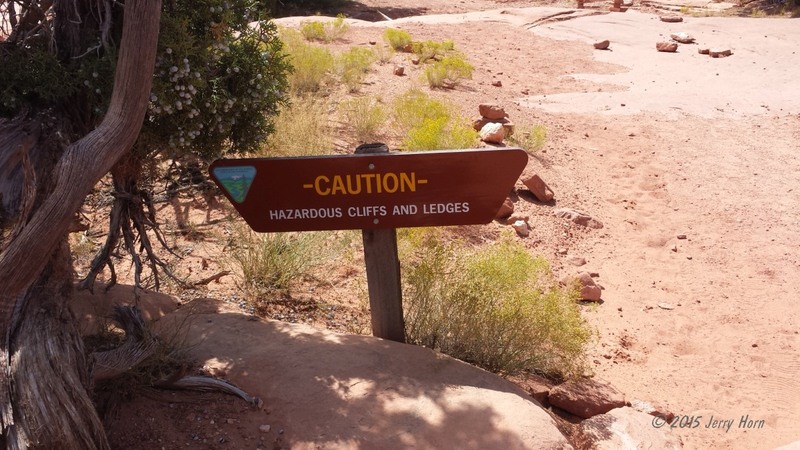 I stopped at the Red Canyon visitor center for a few minutes and continued on and aimed for Zion National Park. 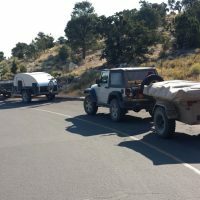 Zion was busy, in fact, too busy for me… the RV/trailer parking lot was 2/3rd filled with cars, leaving no room for the folks that could only use that lot to park. 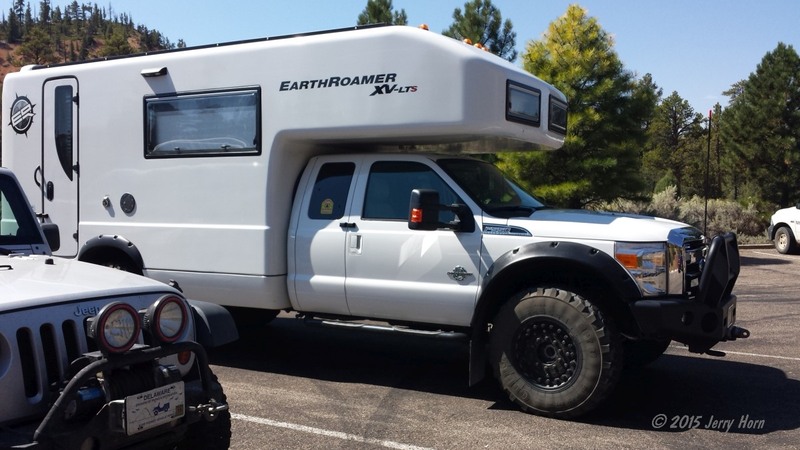 I could have parked in town and taken a shuttle, but I’m not big on crowds, so I kept going. 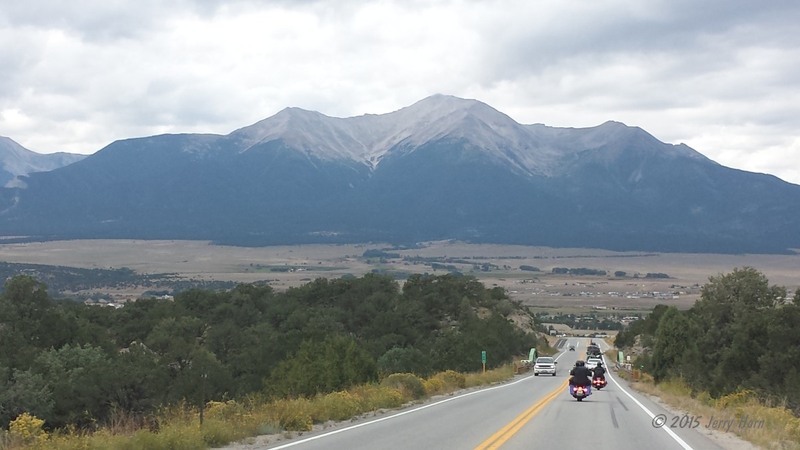 The views on the through-road were awesome, though. 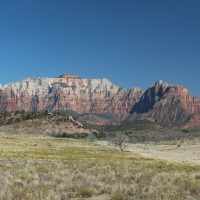 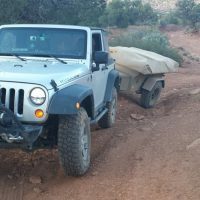 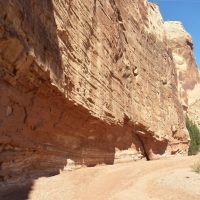 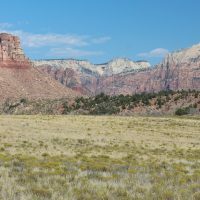 I found a dirt road that led to the back side of Zion where I stopped for a bite to eat and enjoy a few that most visitors would never see. 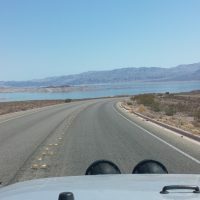 After that, I decided to head toward Las Vegas. 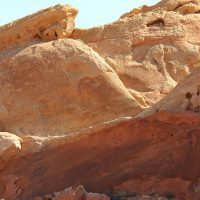 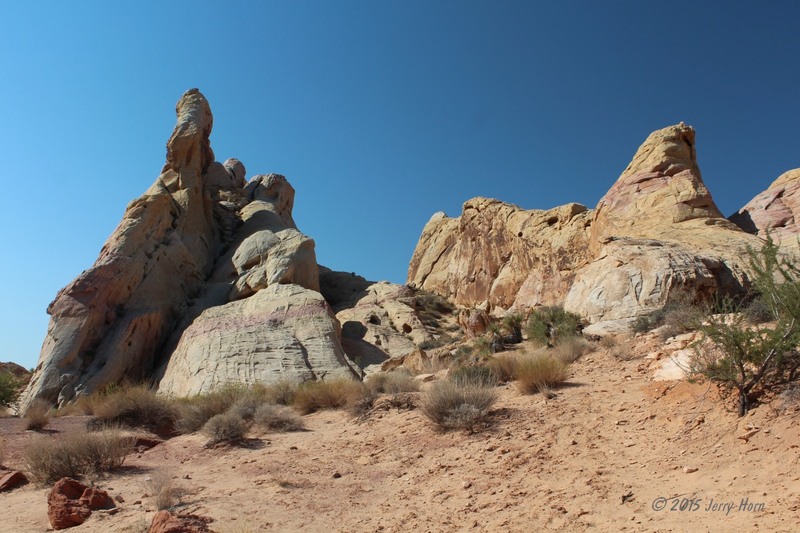 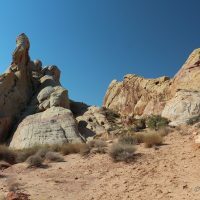 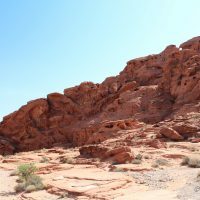 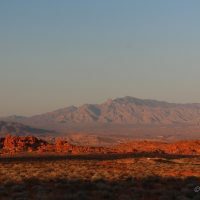 On the way, I looked up camping areas and found that there were several around the Valley of Fire State Park, so I set the GPS. 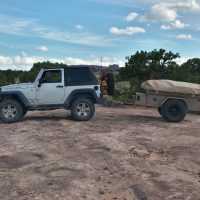 I explored a dried out fishing/camping/waterfoul area for possible camping and continued on to the park. 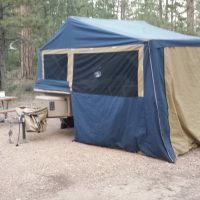 I got there at sunset and it had been closed for several hours, so I drove through and found a nice campsite and ate dinner by a small fire. 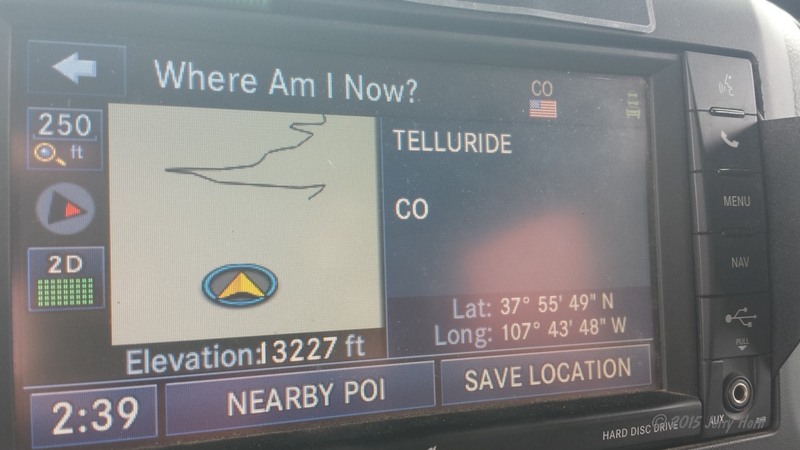 It was quite warm here, I believe it cooled down to around 90* at midnight. 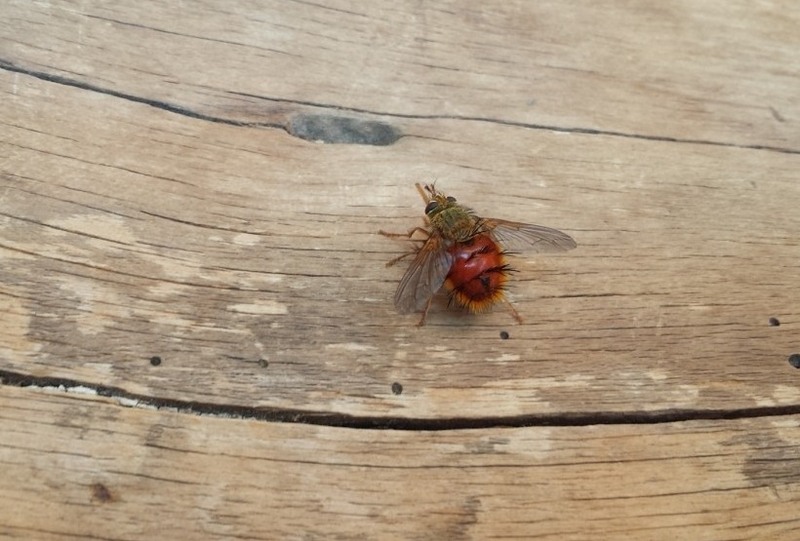 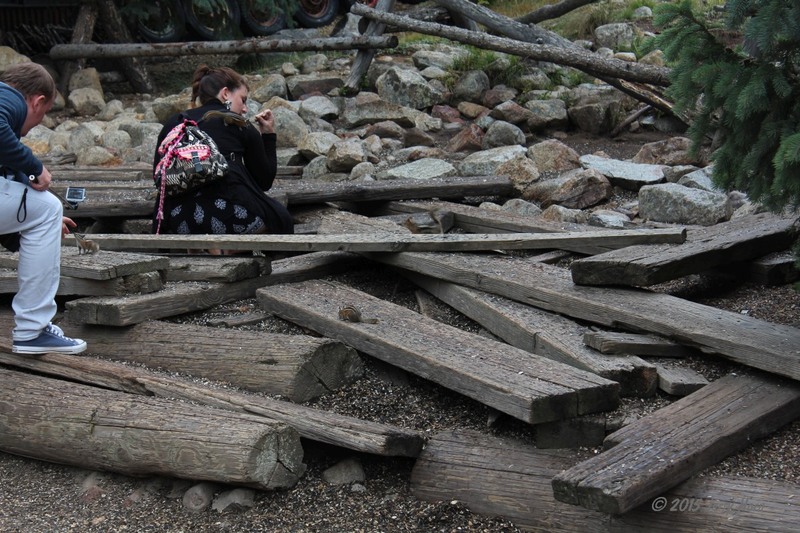 It was also quite windy, which helped to keep the flying ants at bay. 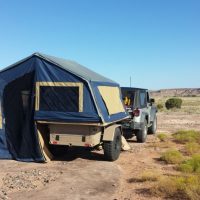 The mesh on my tent is fairly thick, so it wasn’t breezy inside the tent, and while I had the 12v fan, it was only blowing around very hot, dry air. 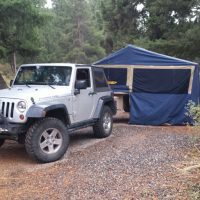 The worst nights sleep of the trip, but at least I’m not at home! 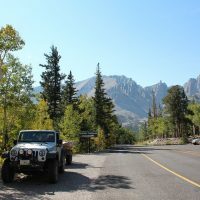 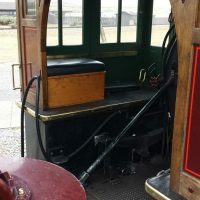 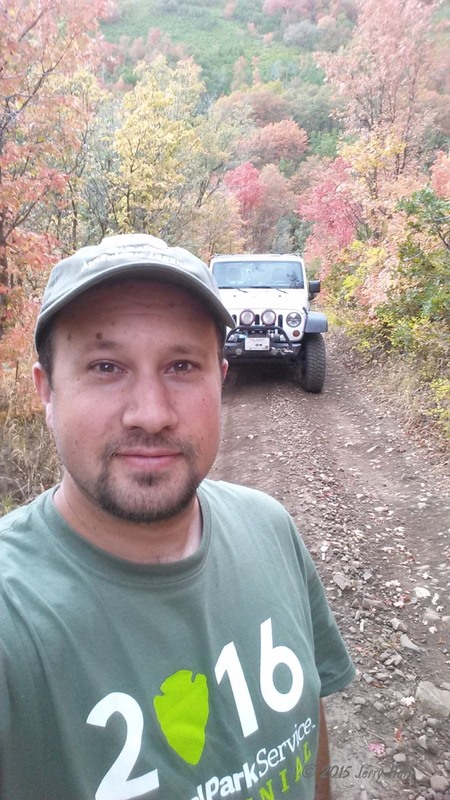 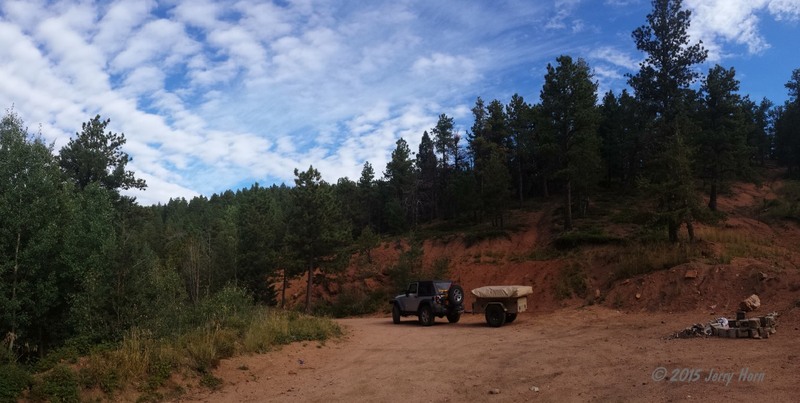 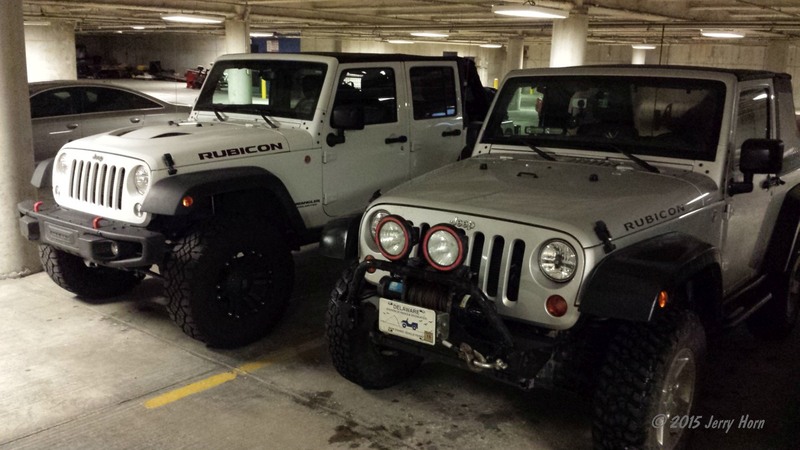 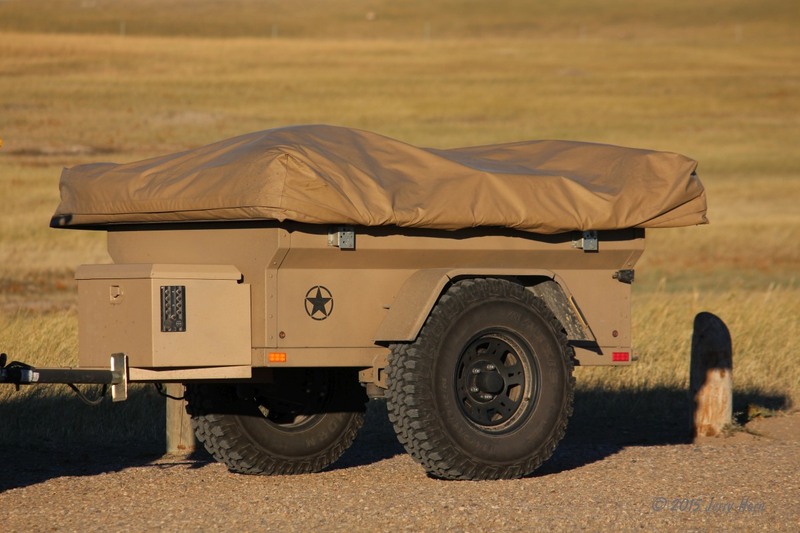 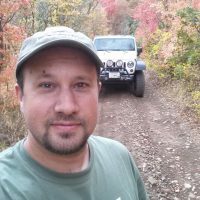 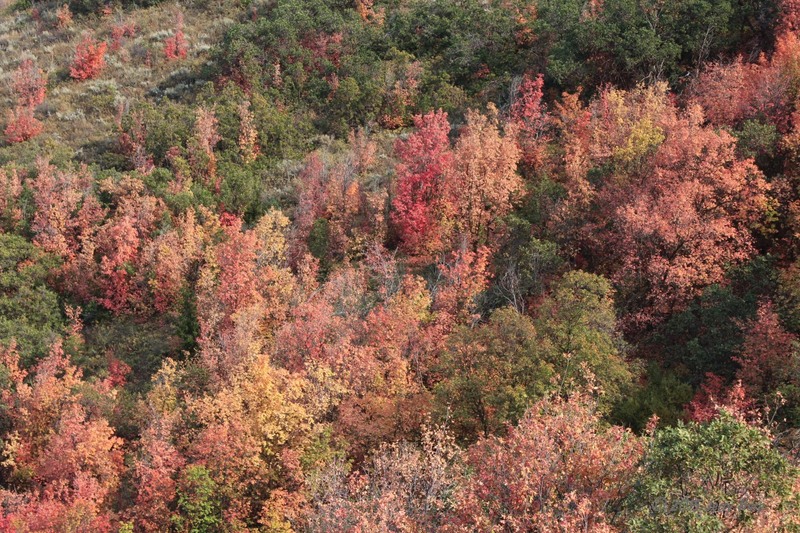 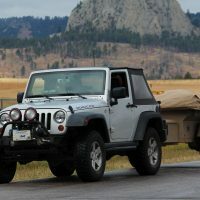 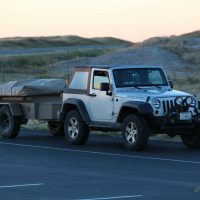 Friday morning, the 11th, I fire up the Jeep around 9am and head into the park. 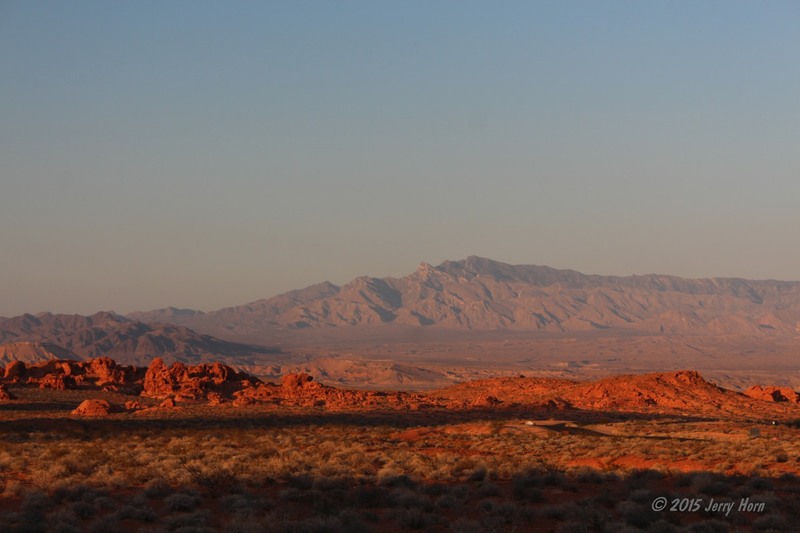 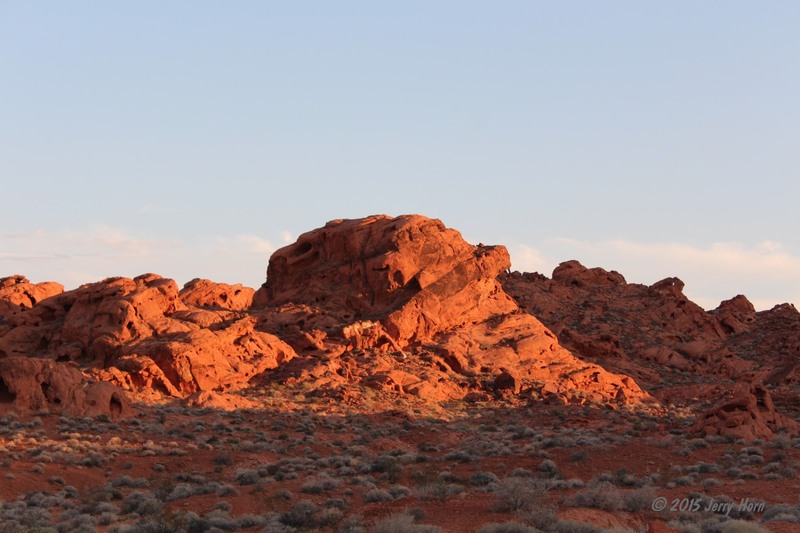 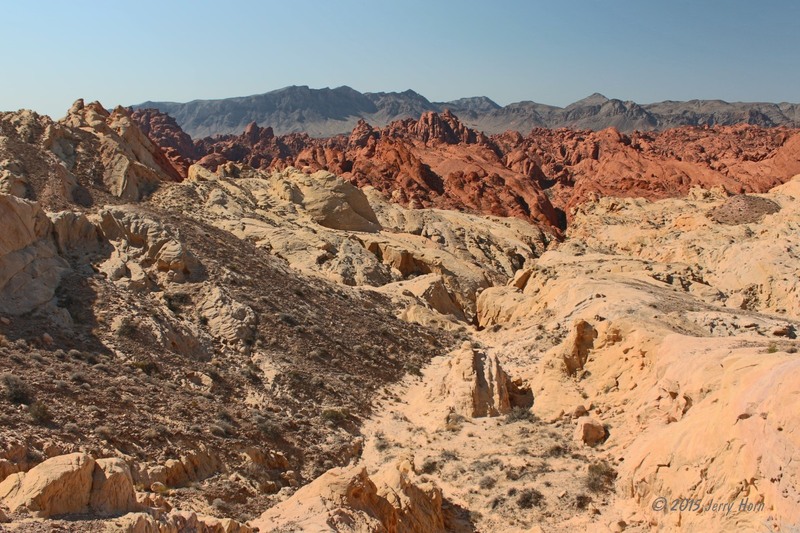 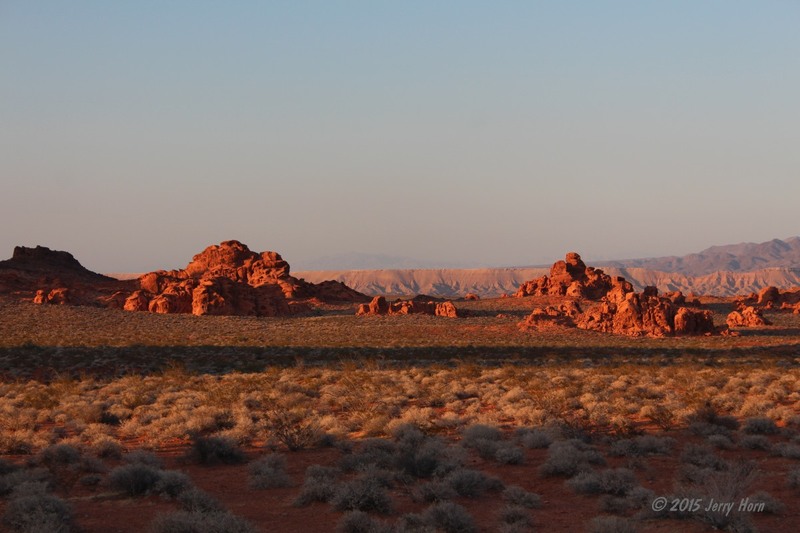 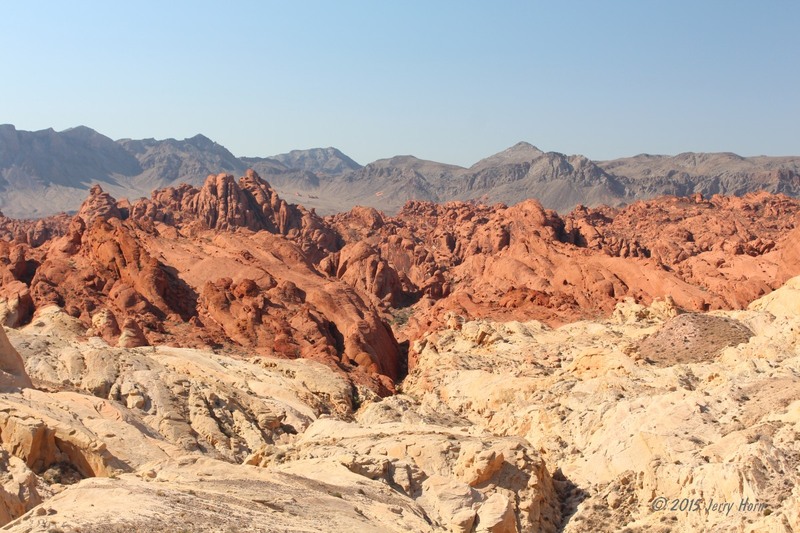 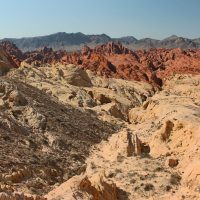 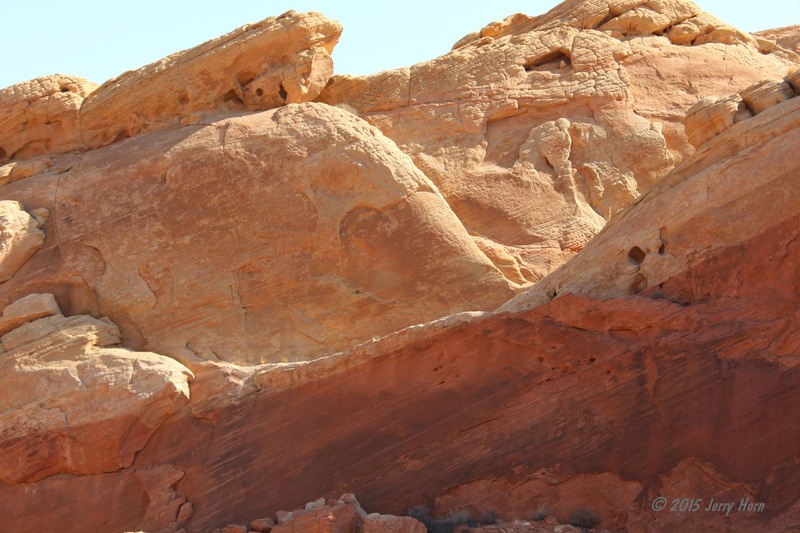 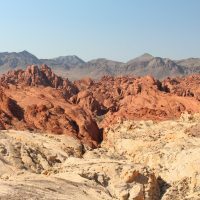 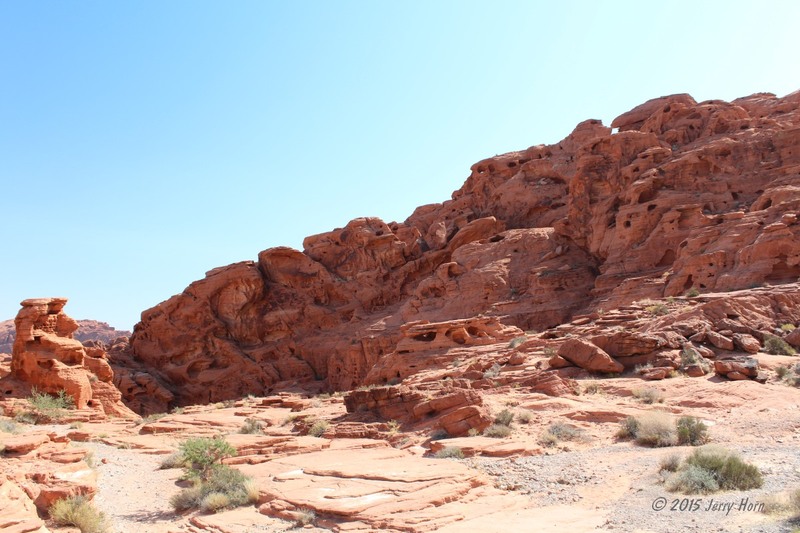 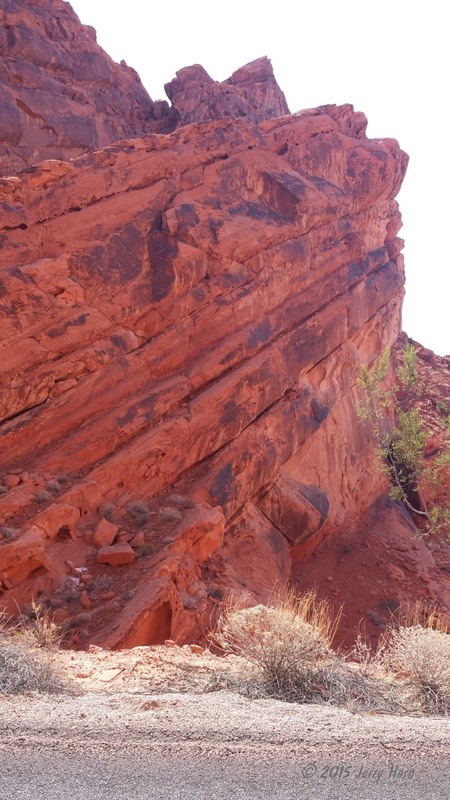 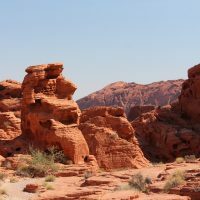 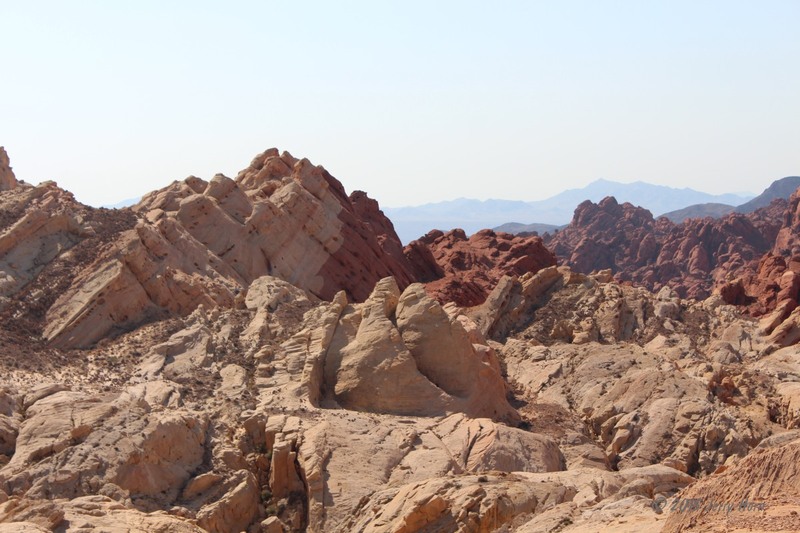 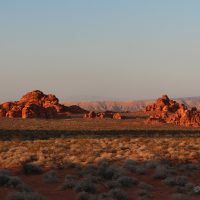 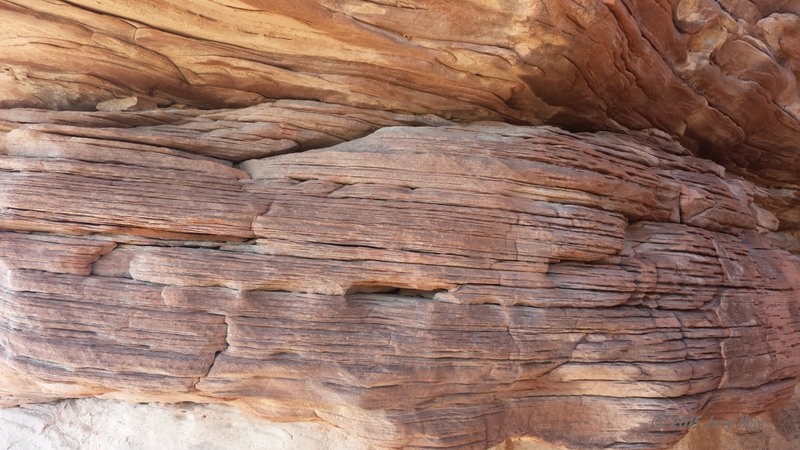 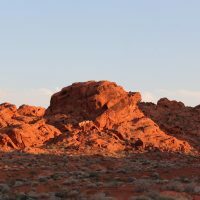 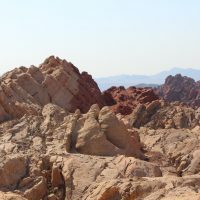 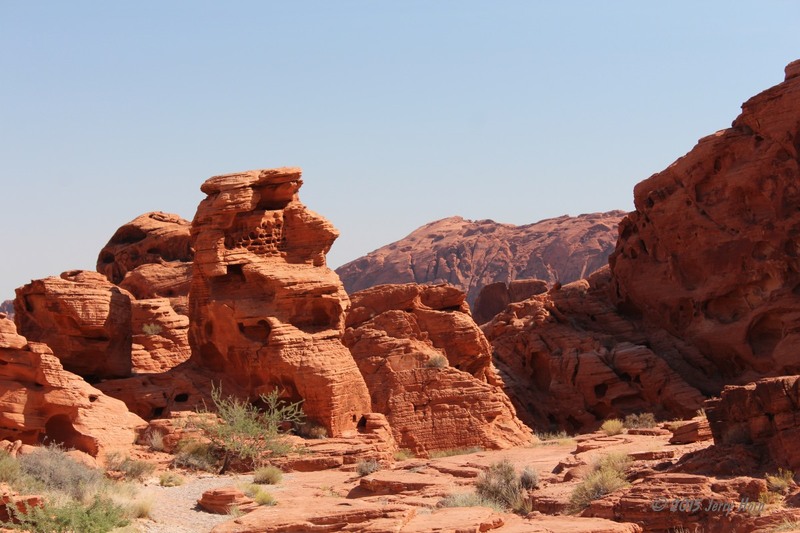 Valley of Fire is a unique place, dark red terrain with rough rock features and extreme heat. 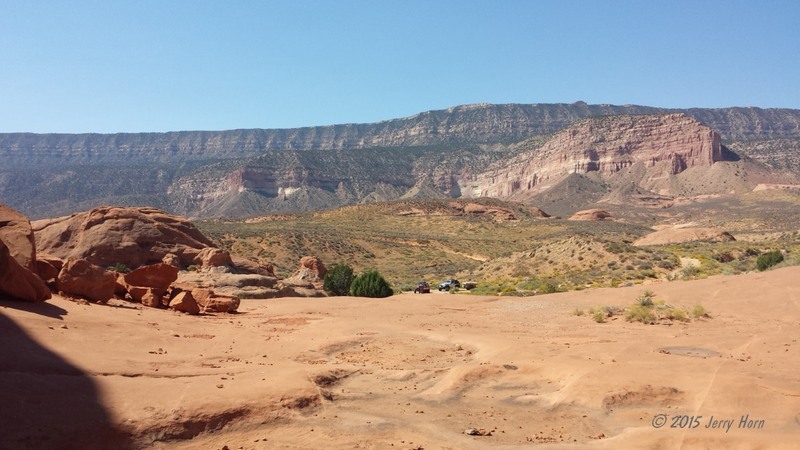 A few movies and TV shows have been filmed here, including the secret base in the show “Airwolf”. 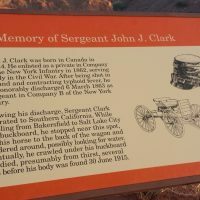 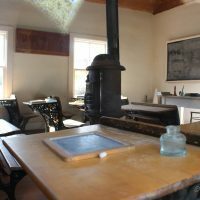 I first stopped at the visitor center to learn a little about the place before heading deeper into the park. 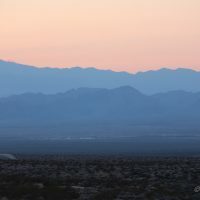 The forecasted high temperature for the day was 106* and I’m sure that it was reached quickly. 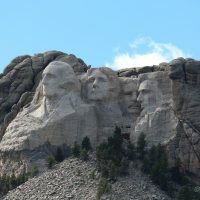 The park wasn’t very busy, I guess due to the heat and being a weekday. 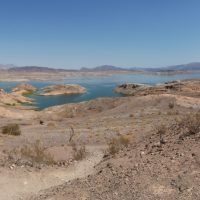 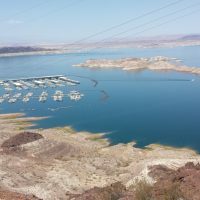 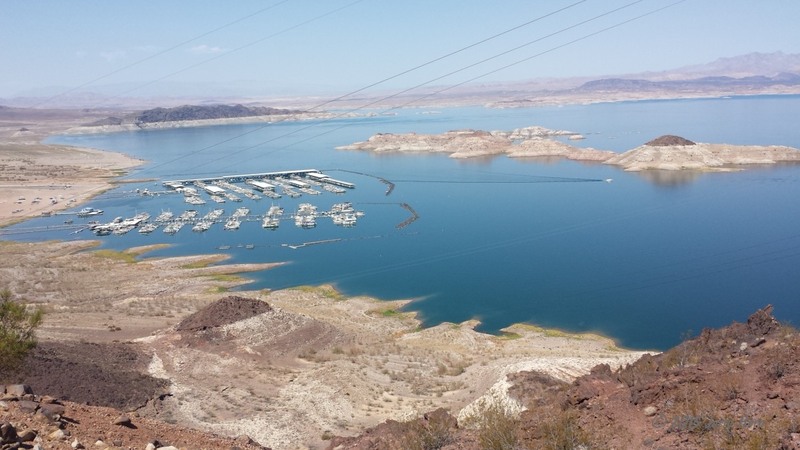 I explored the park a bit, before leaving and heading to the Lake Mead National Recreation Area. 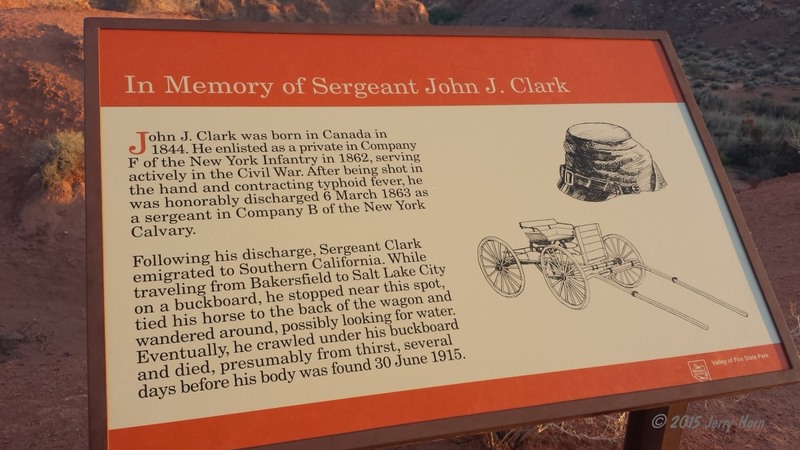 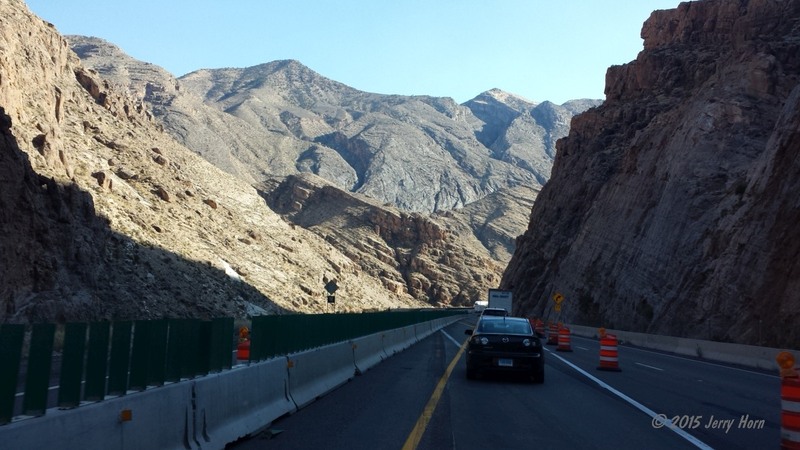 I drove through that heading toward the Hoover Dam, but had to turn around at the security checkpoint. 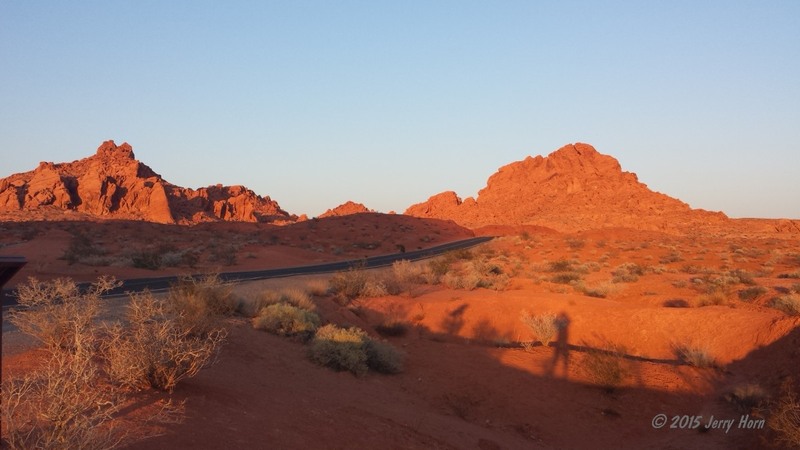 Now, I jumped on the highway to Las Vegas and drove a few blocks in the city, just to say that I’ve been there. 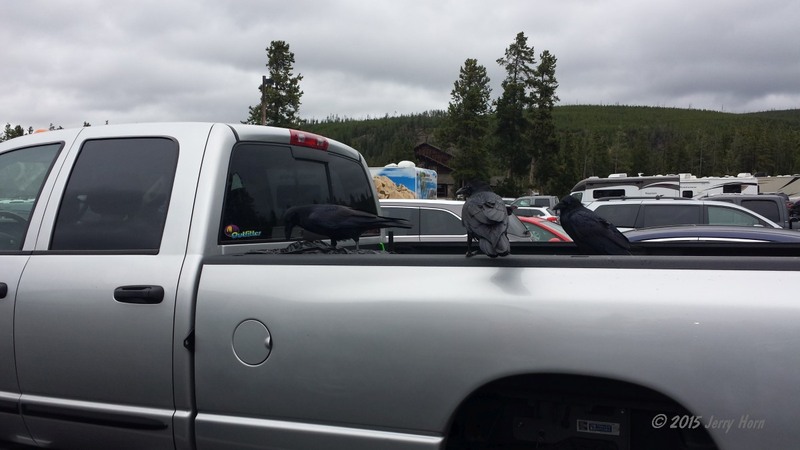 I hope they got the rental insurance! 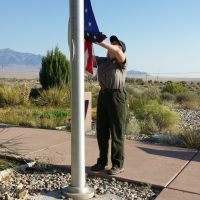 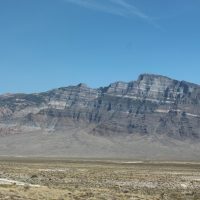 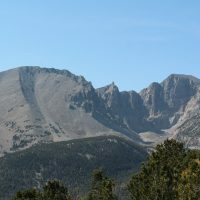 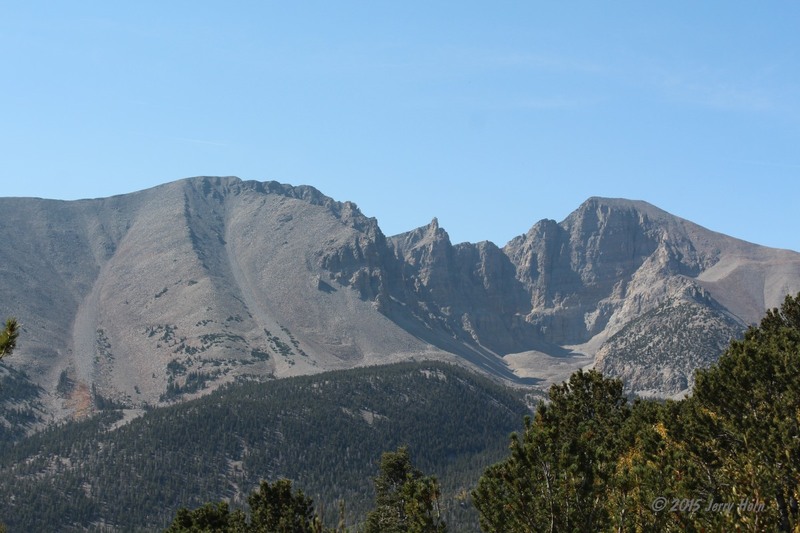 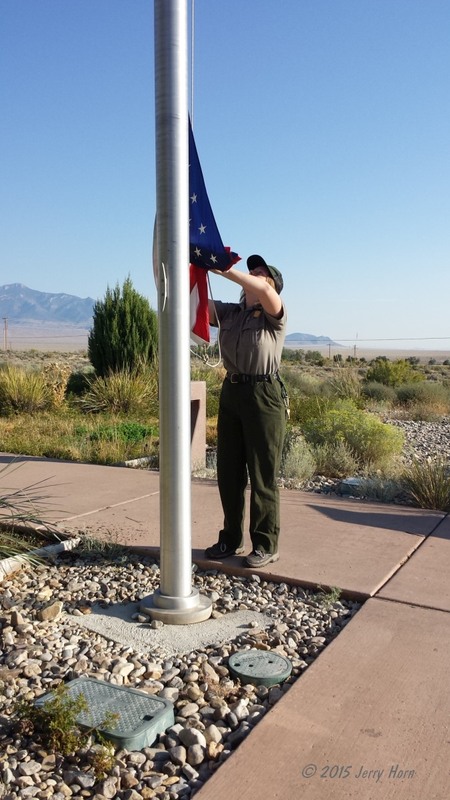 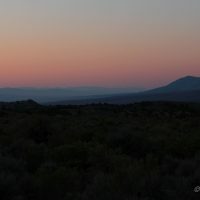 Saturday the 12th finds me waking up before dawn (at least when surrounded by mountains) and I make it to the Great Basin National Park before they open the visitor centers, which allows me to watch a ranger raise the Flag. 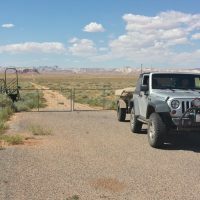 Sadly, all of the cave tours (the main attraction here) are sold out for the day and so I browse the visitor center and grounds for a while before heading out via an old 4×4 road. 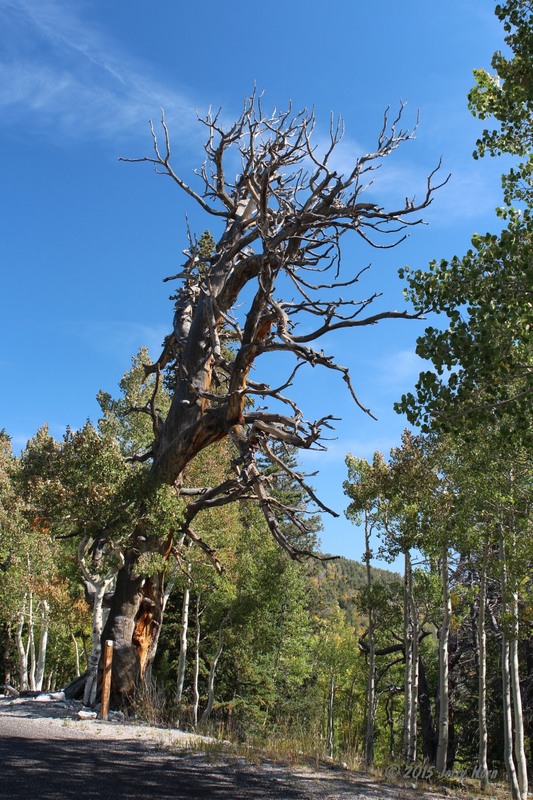 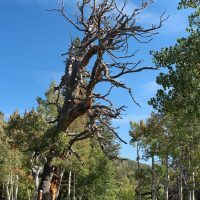 The park is home to some ancient Bristlecone Pine trees, and once was home to the oldest living tree (4900 years old) before it was cut down. 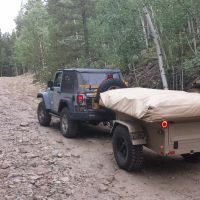 While the 4×4 road is on the park map, it’s clearly not used very often but that just made it more fun pushing through the bush and pulling the trailer across a small creek. 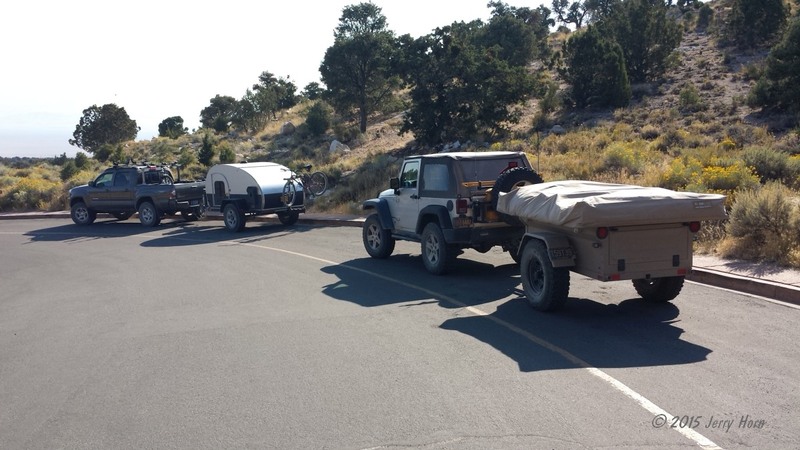 Back on pavement, I headed north to meet up with friends camping at the Rockport State Park east of Salt Lake City, around 4 hours away. 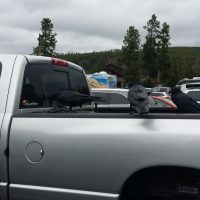 I parked next to them for the night, set up my tent and enjoyed dinner and a campfire with them. 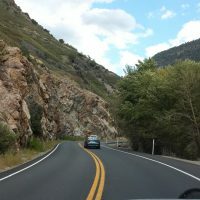 On Sunday the 13th, I explored a few areas nearby before heading to meet my friends at their home in Heber City and going out to a local BBQ place for dinner. 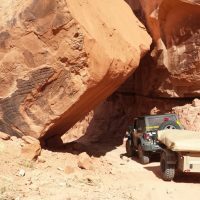 Nothing really special about the areas I explored, but some good photos. 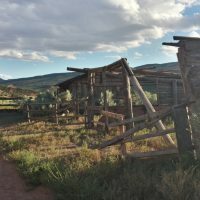 I spent the night in their guest room and gave their cat somebody new to rub against. 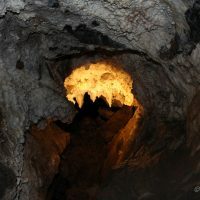 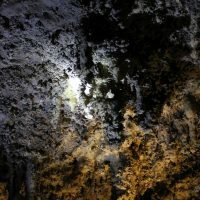 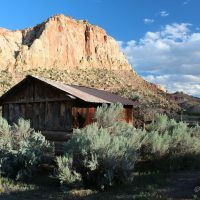 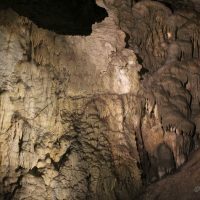 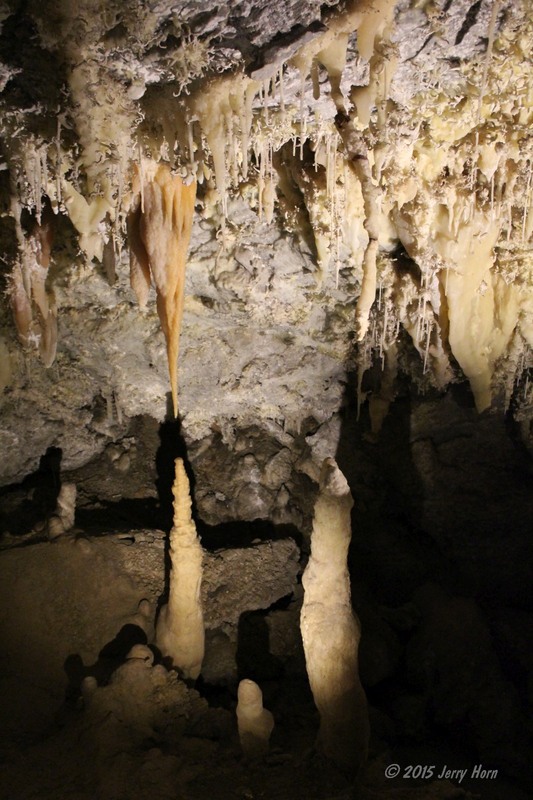 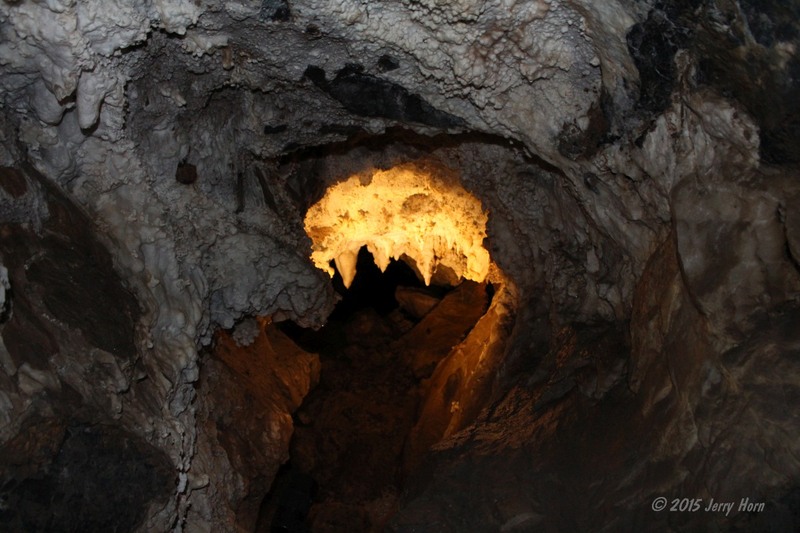 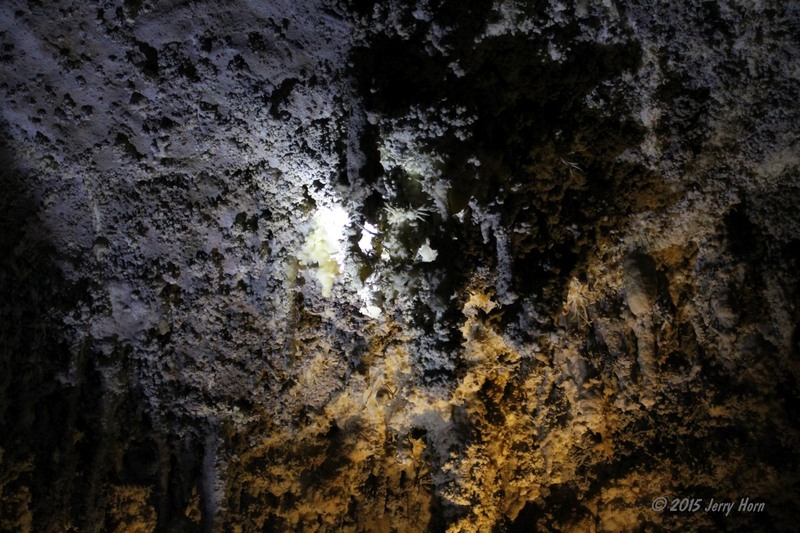 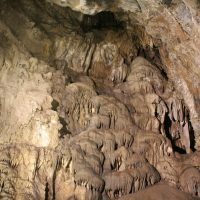 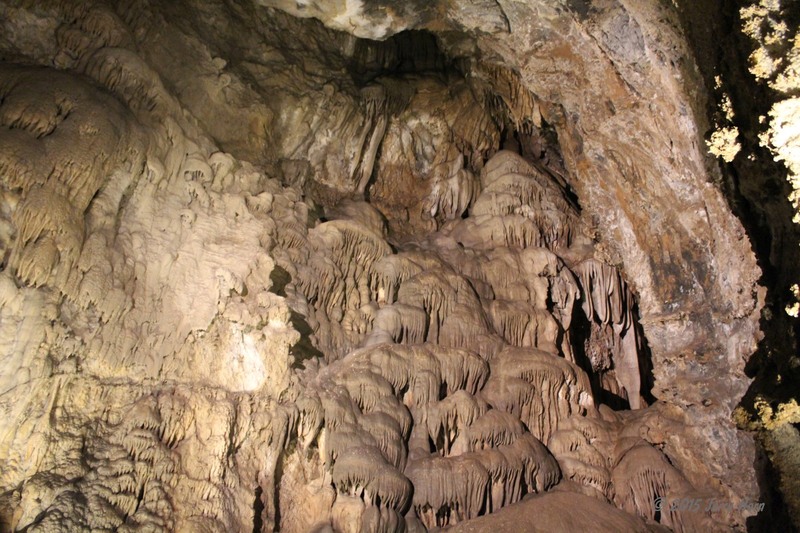 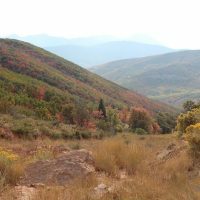 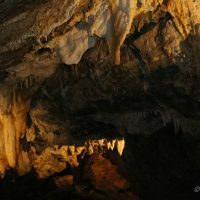 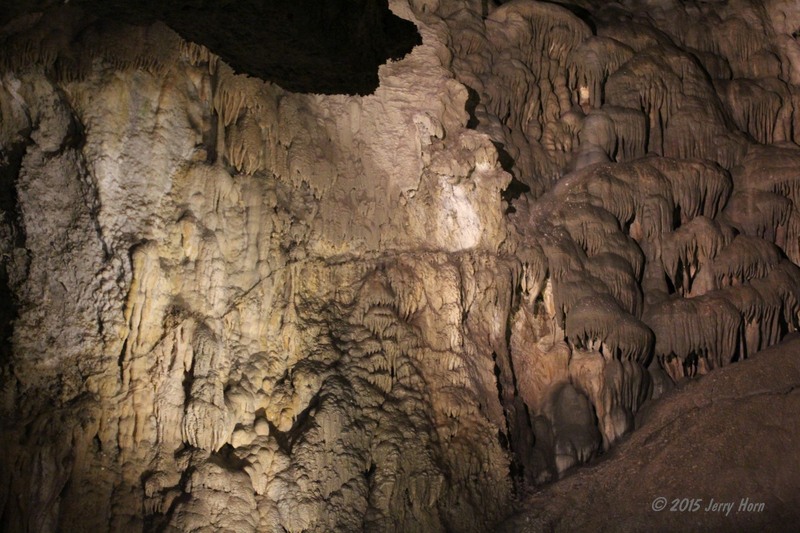 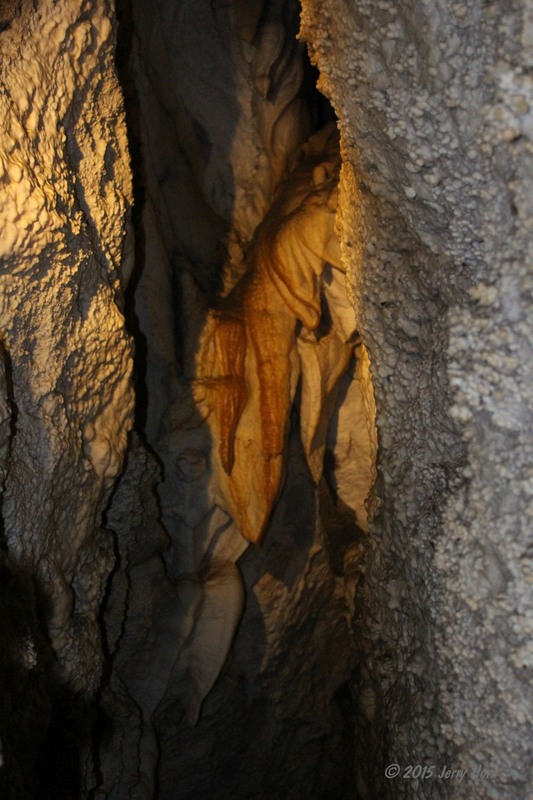 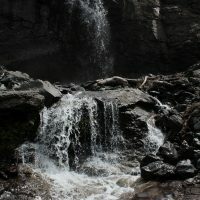 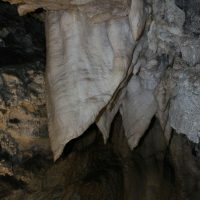 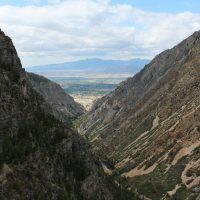 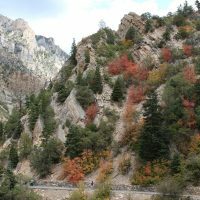 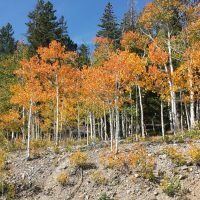 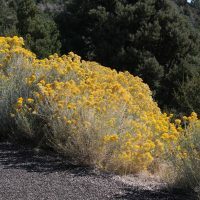 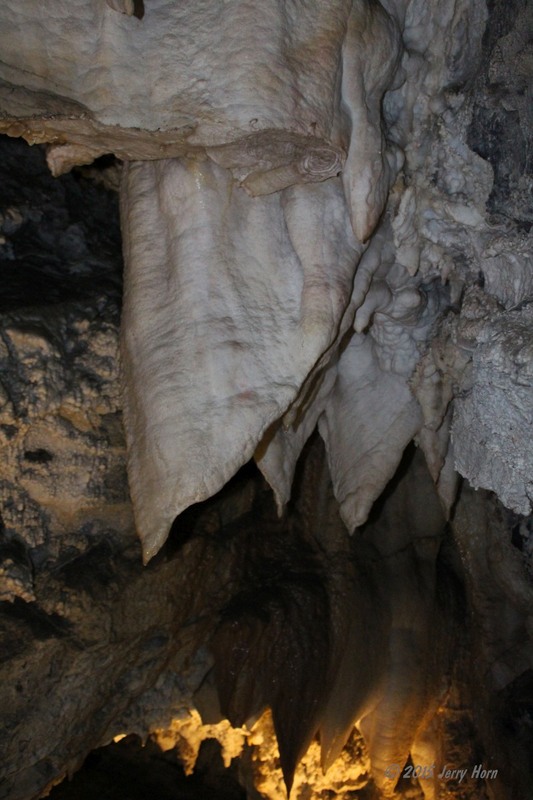 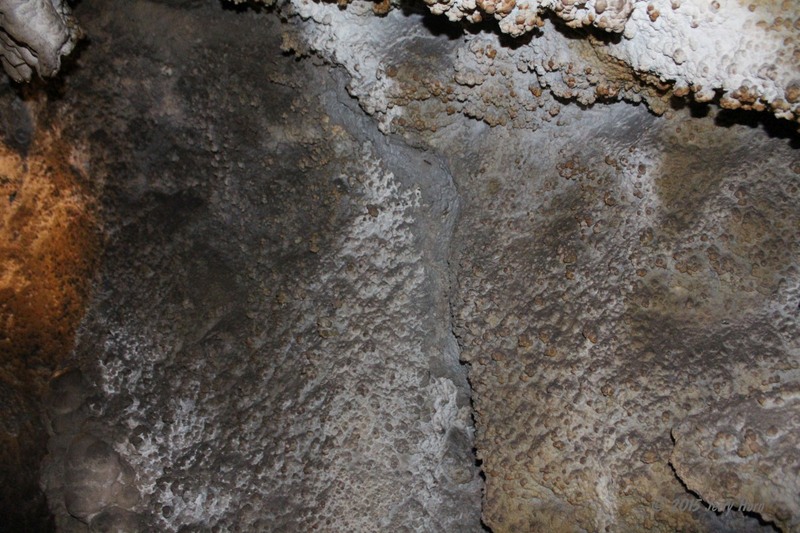 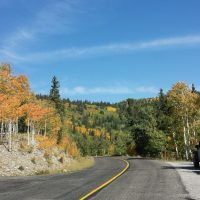 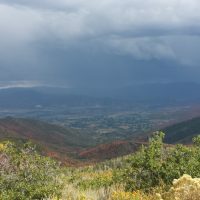 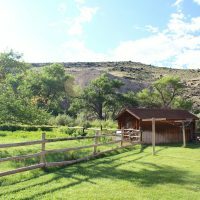 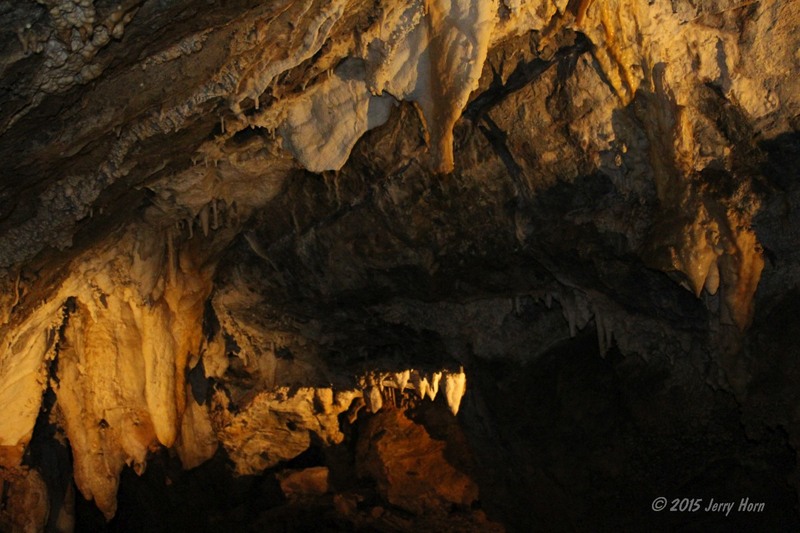 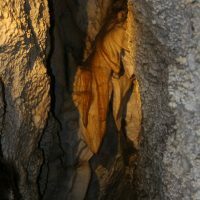 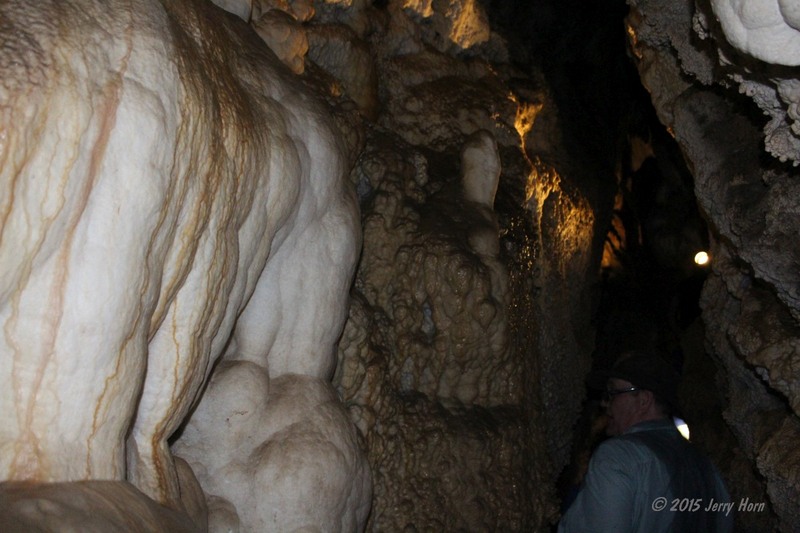 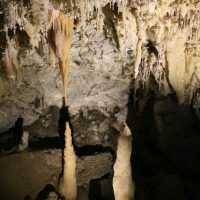 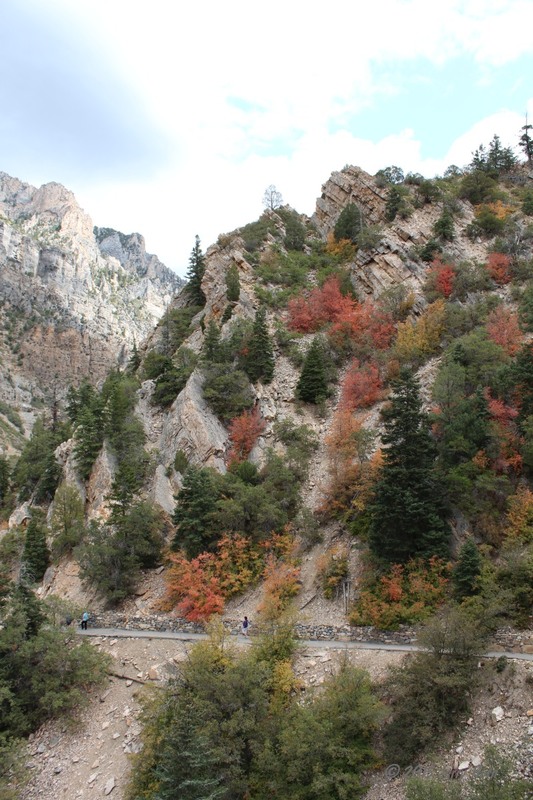 On Monday the 14th, I unhooked the trailer and headed to Timpanogos Cave National Monument, which took me on a winding road in a canyon between the mountains and past the Sundance Resort. 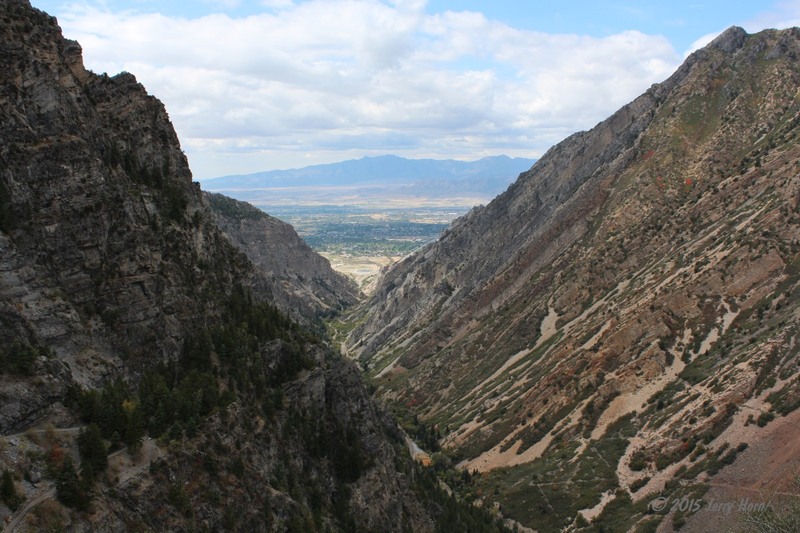 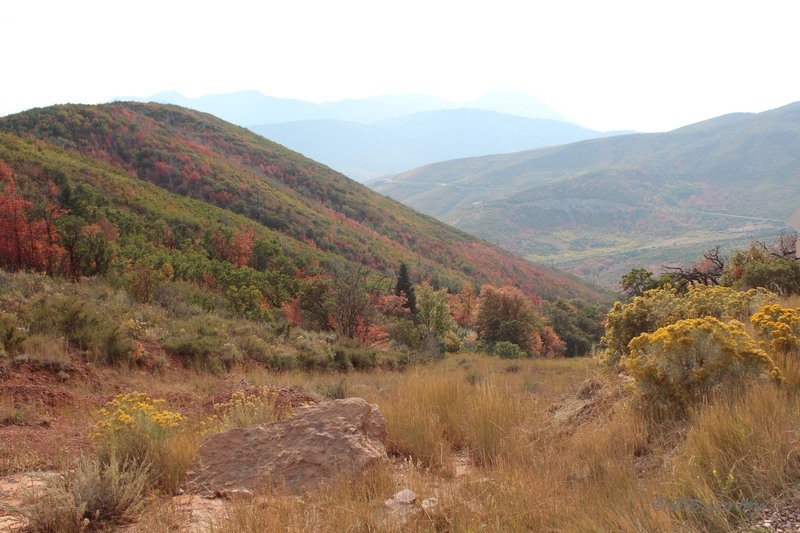 The cave is located at the top of Mount Timpanogos which is only reachable by foot, a mile and a half hike that gains 1000ft of elevation. 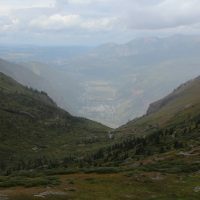 On the hike to the top, I teamed up with a local couple for mutual support and chat. 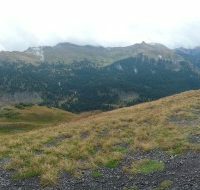 During the hike, we were passed (repeatedly) by locals doing a powerwalk up the mountain for exercise. 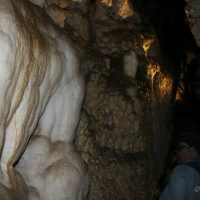 Amazing… The tour was pretty cool, but difficult for photography. 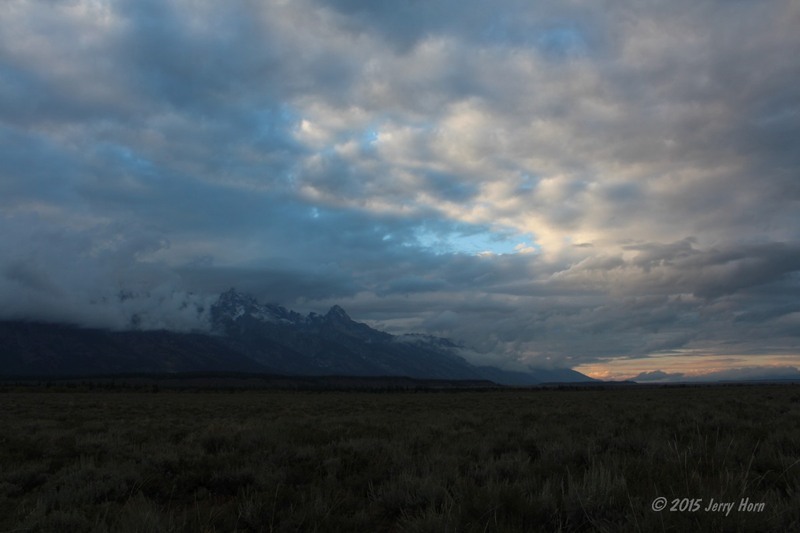 Toward the end of the tour, a lady started feeling unwell and my new friend walked out to fresh air with her. 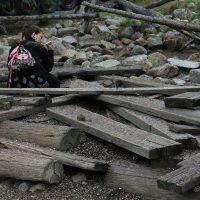 I caught up a few minutes later when the tour finished and we waited with her until she felt well enough for the walk down the mountain. 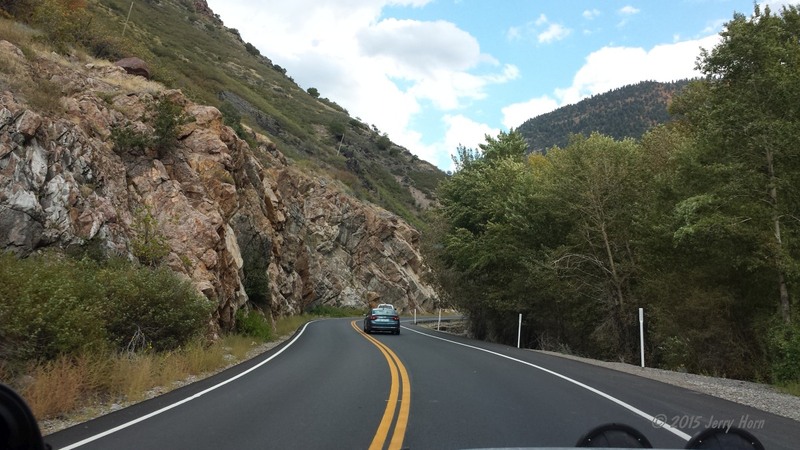 After that, I headed west and north to take a scenic route back to my friends home. 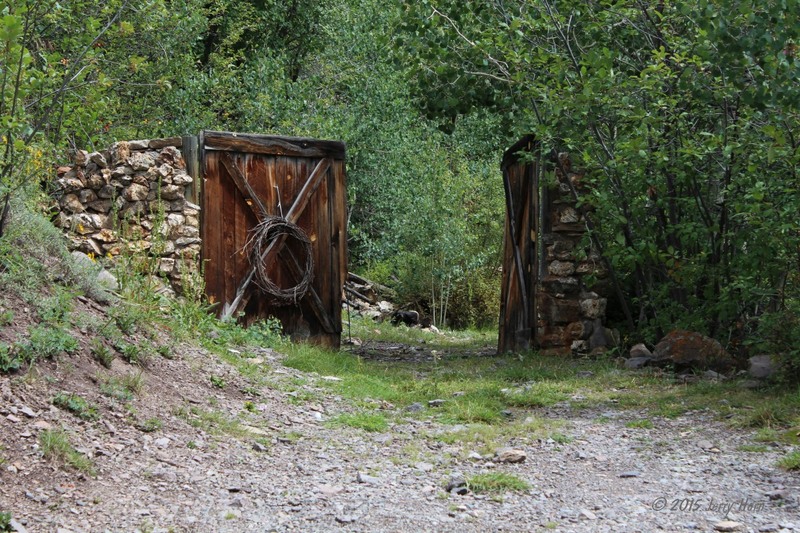 During the scenic ride, I explored a bit and got a little lost behind locked gates as it started raining. 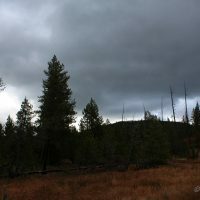 I finally made it back to my friends home as darkness set in. 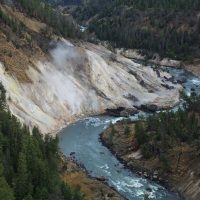 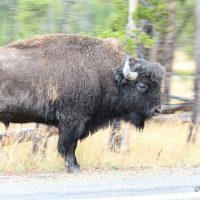 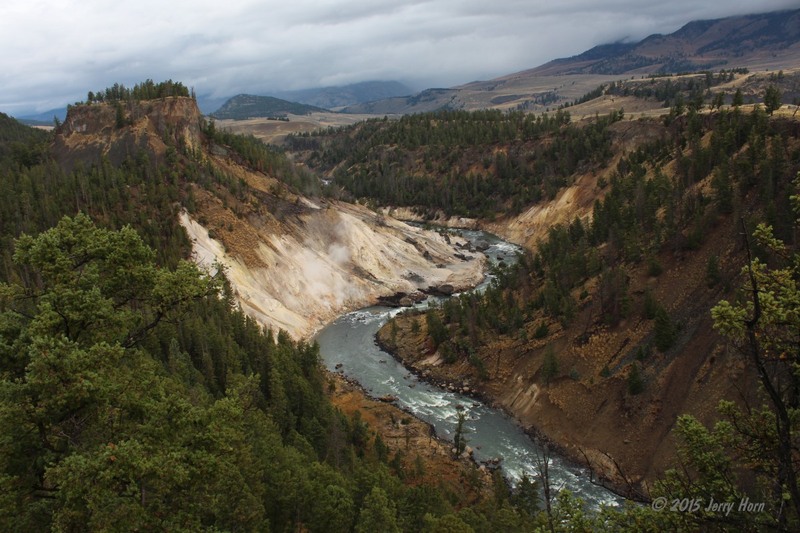 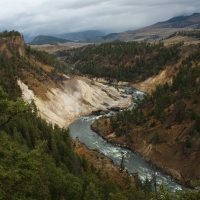 On Tuesday the 15th, I bid my friends farewell and headed north around 8:30, aiming for Yellowstone. 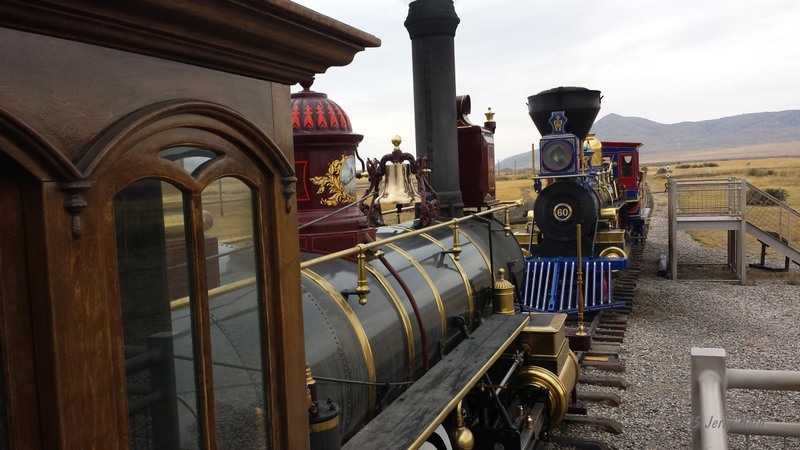 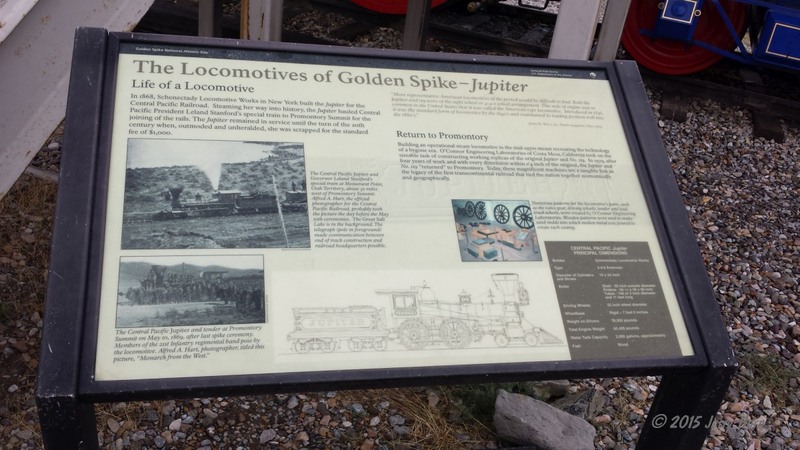 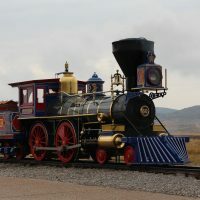 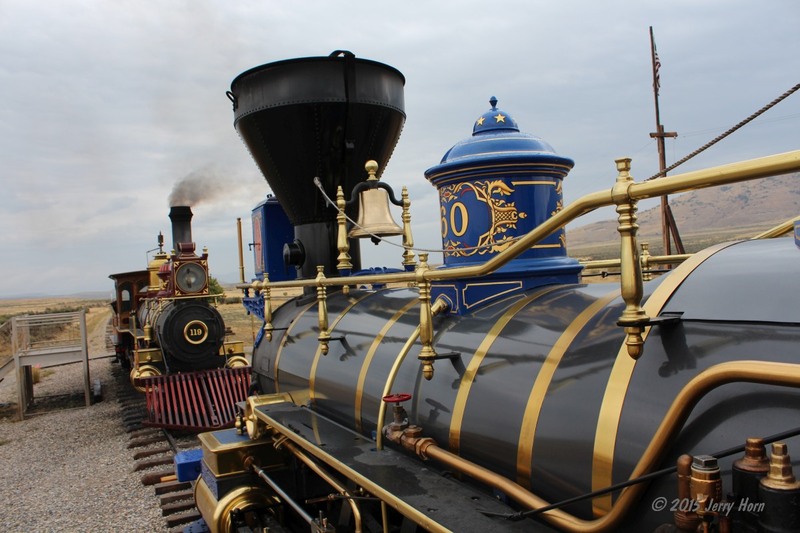 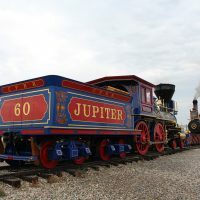 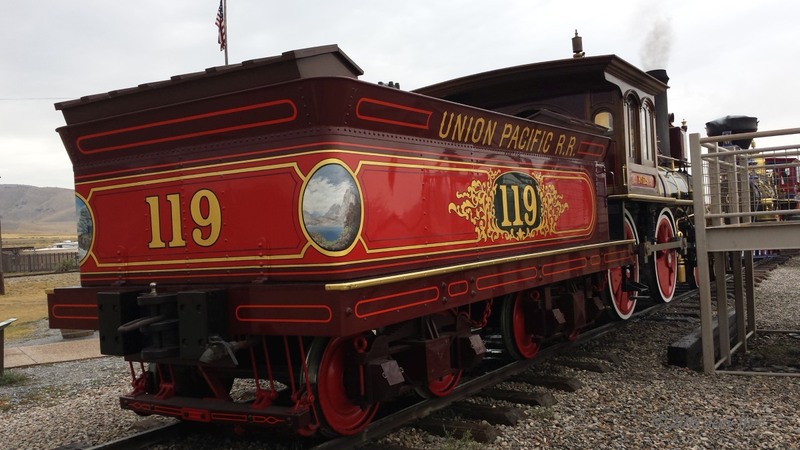 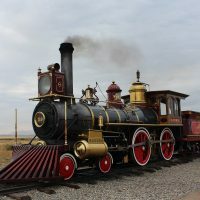 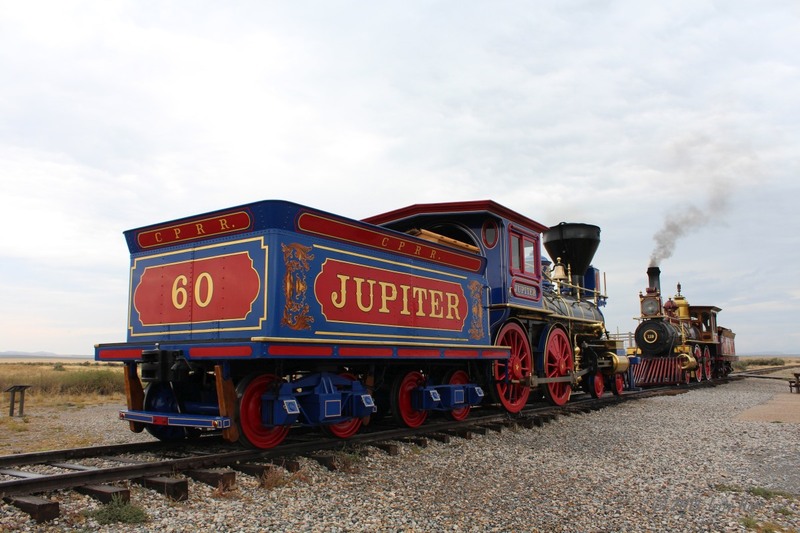 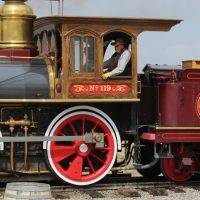 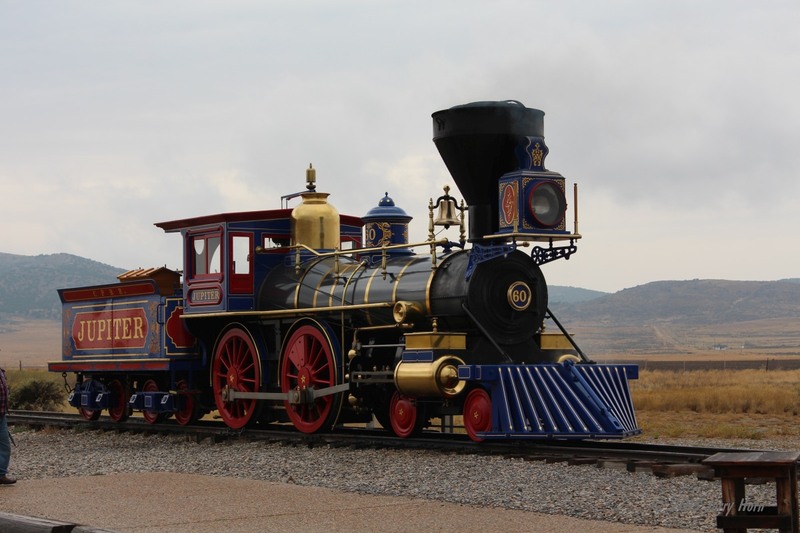 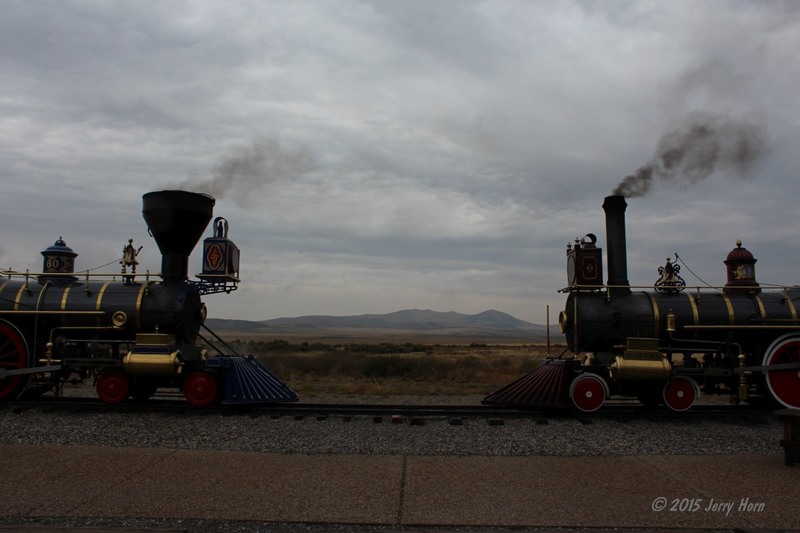 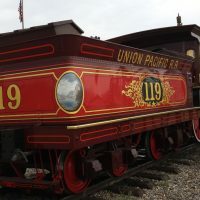 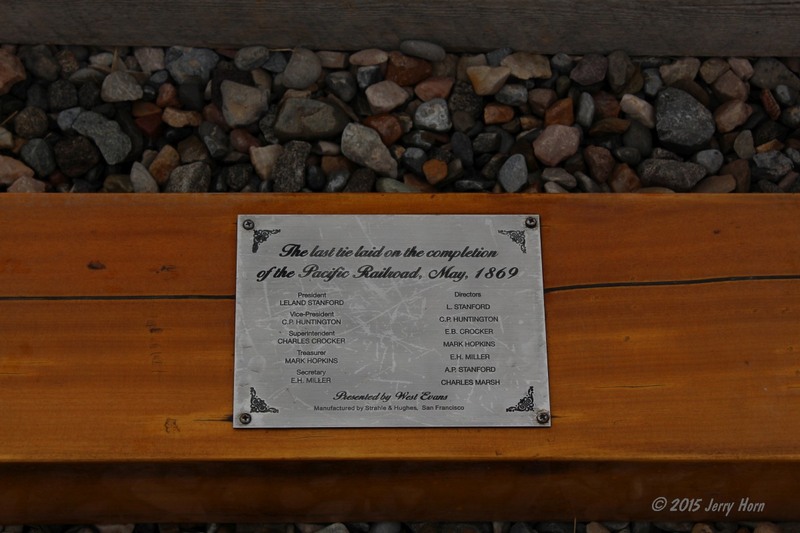 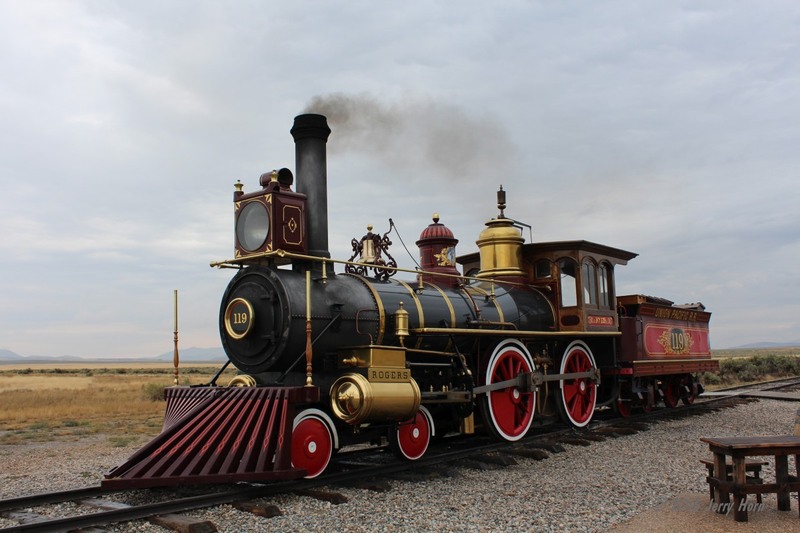 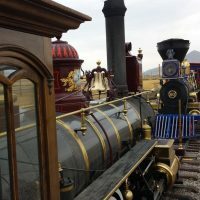 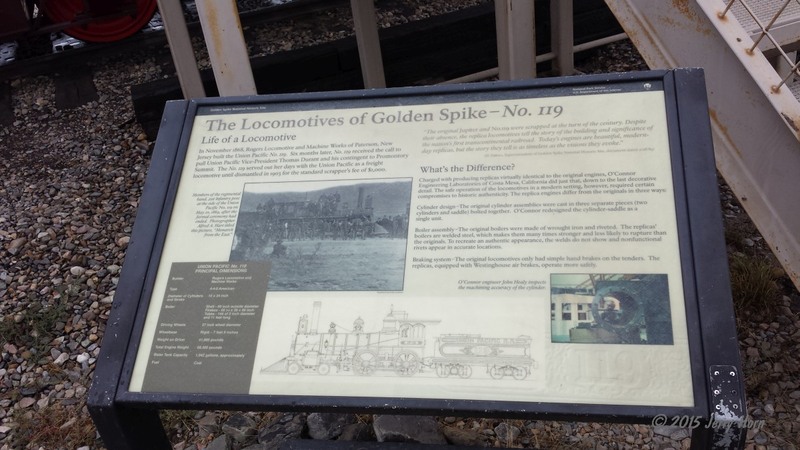 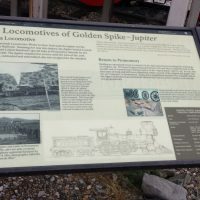 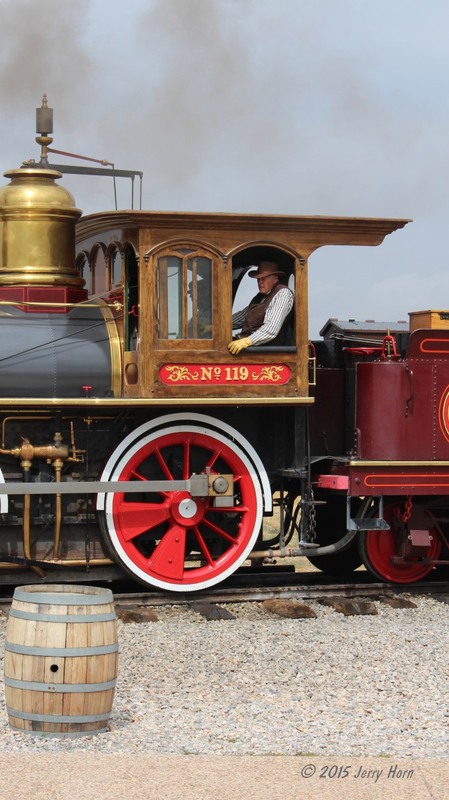 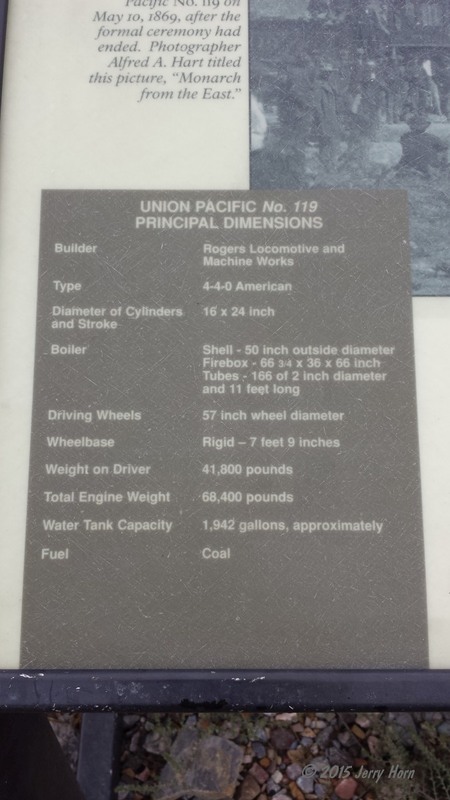 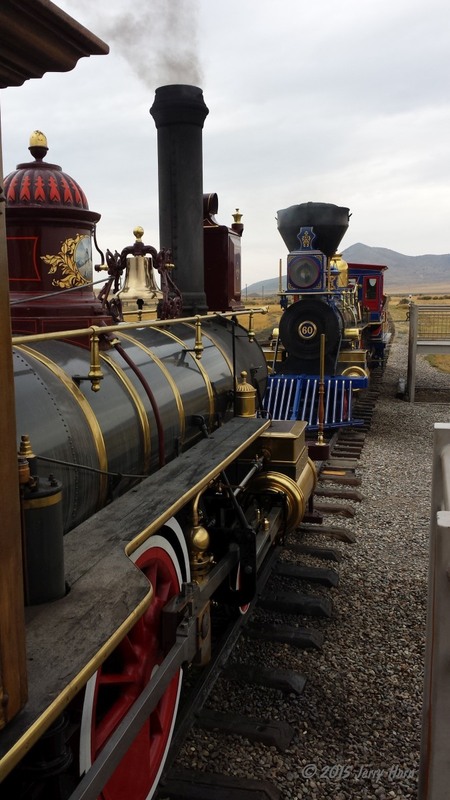 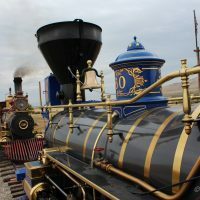 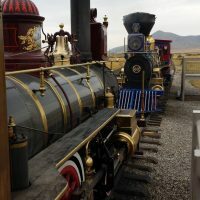 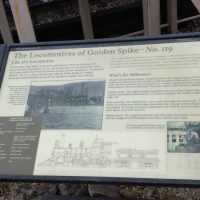 On the way, I stopped at the Golden Spike National Historic Site where the Union and Central Pacific Railroads officially met, marking the completion of the first transcontinental railway. 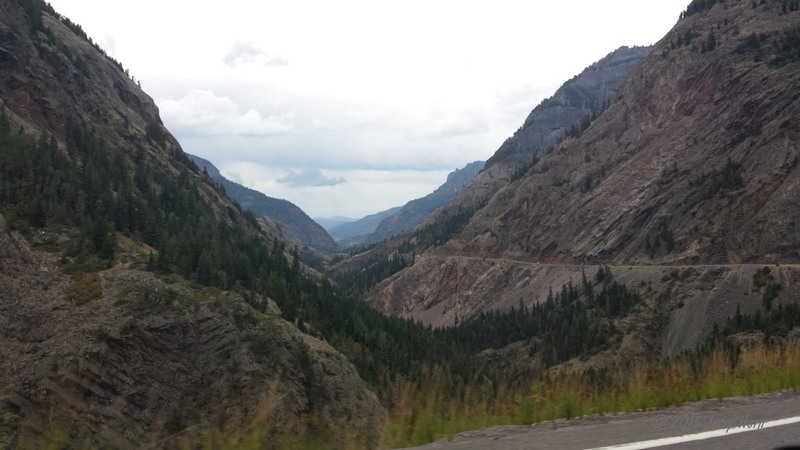 I spent around 2 hours there and continued north into Idaho and later into Wyoming. 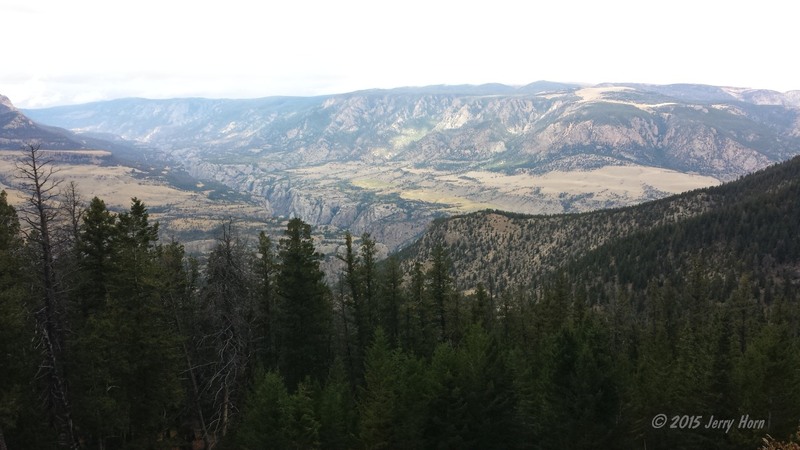 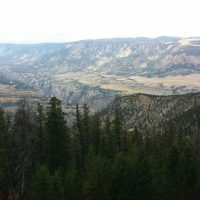 I reached Jackson, WY around 6pm and found a campsite for the night in the Gros Ventre Wilderness. 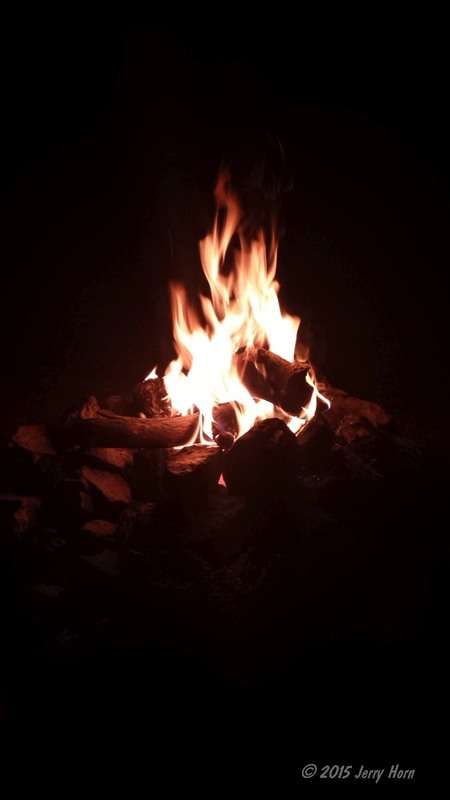 Rain came as I was attempting to start a fire, so that didn’t end well. 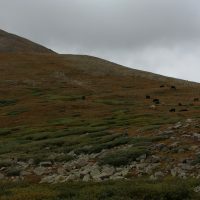 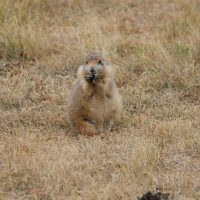 I slept pretty well, hoping I didn’t make friends with a grizzly during the night. 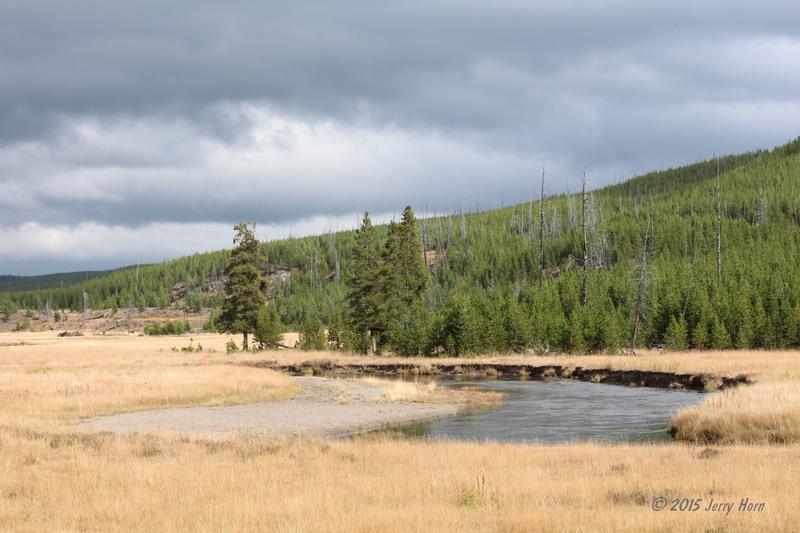 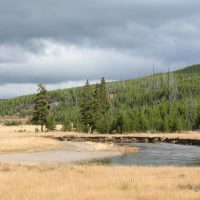 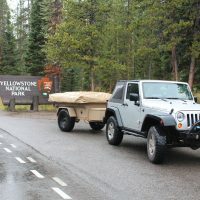 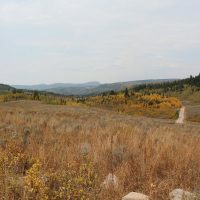 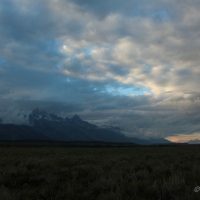 Wednesday, the 16th, found me breaking camp and heading north to Yellowstone after getting some photos looking toward the Grand Tetons National Park. 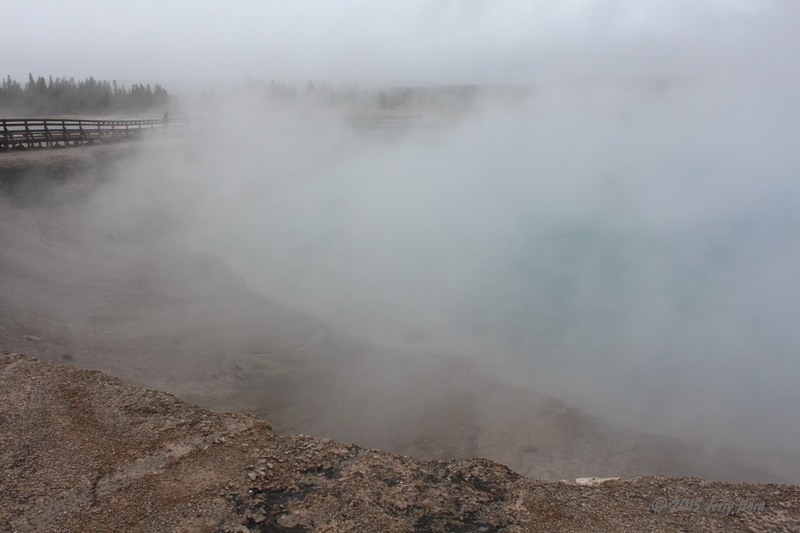 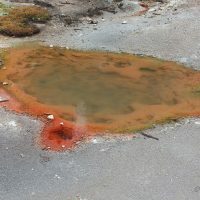 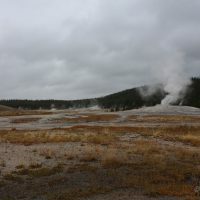 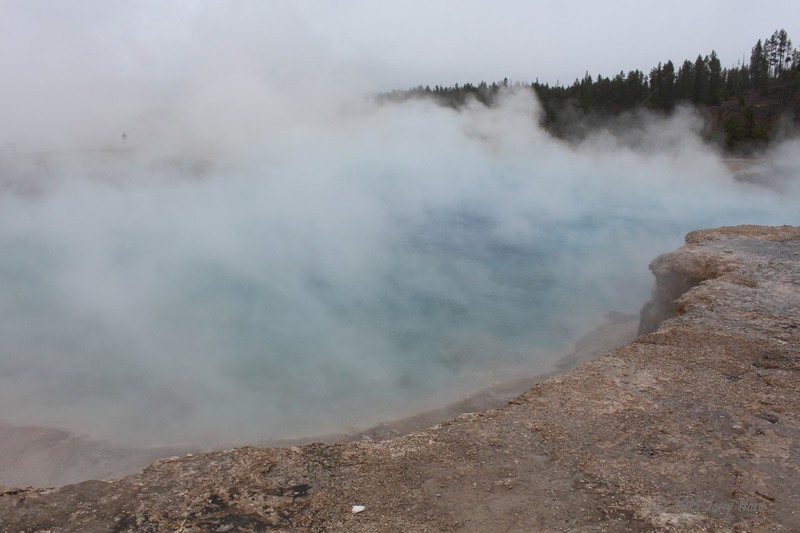 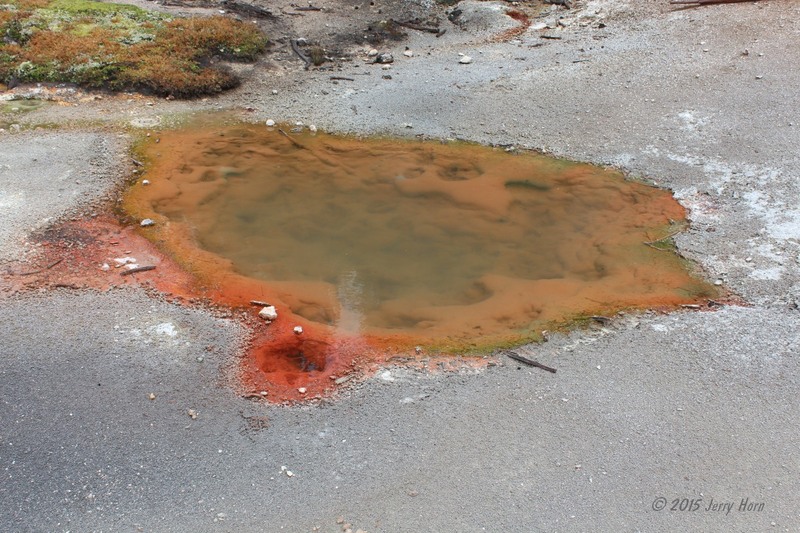 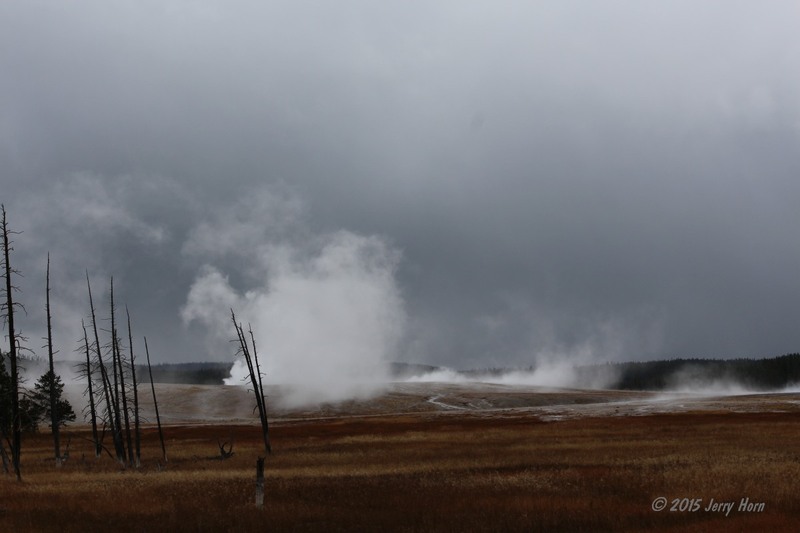 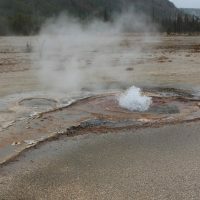 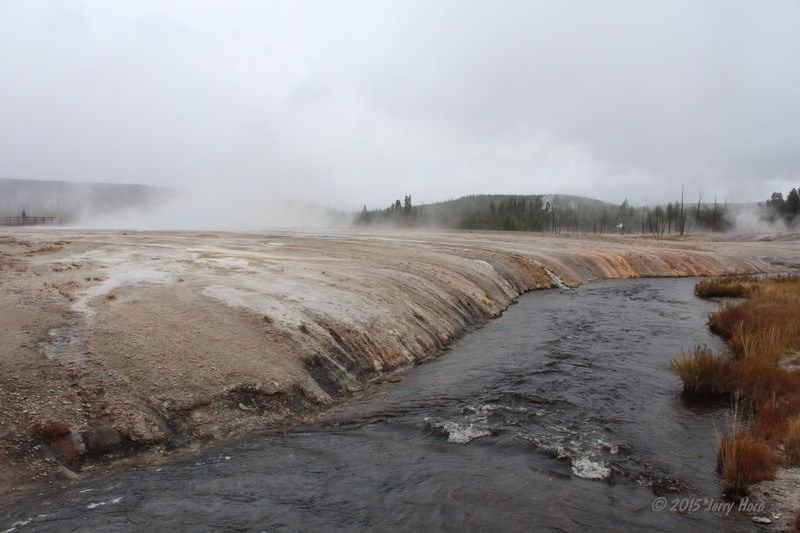 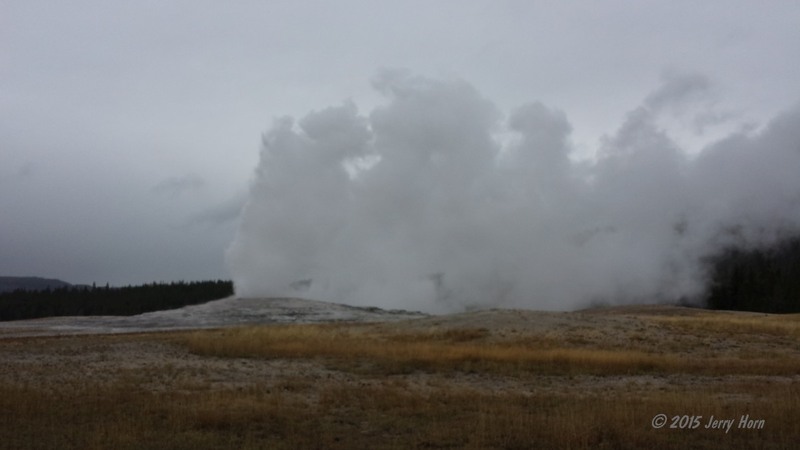 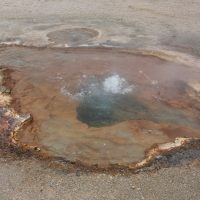 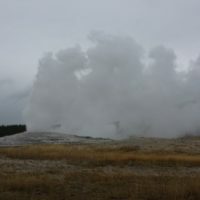 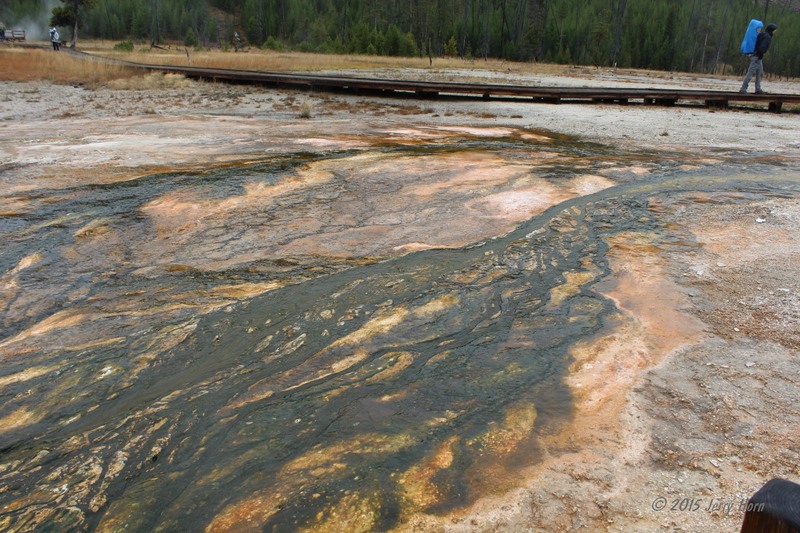 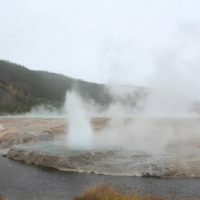 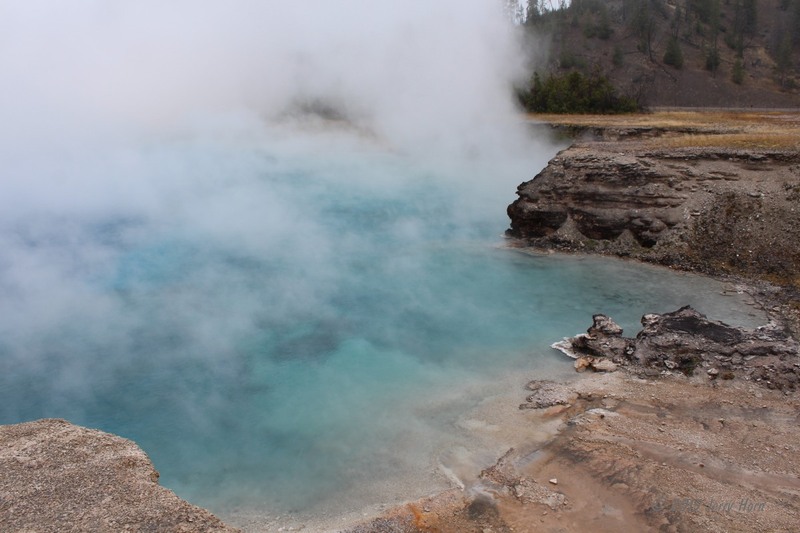 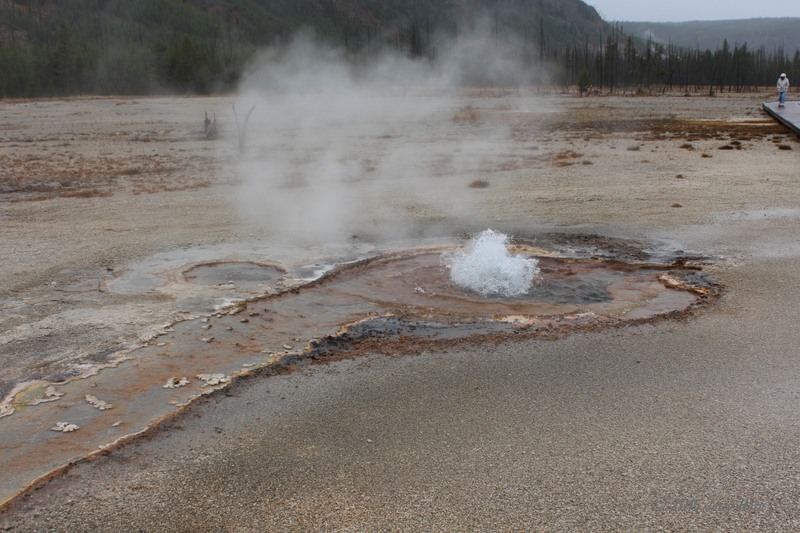 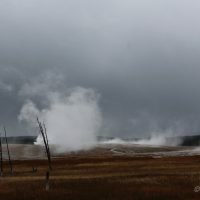 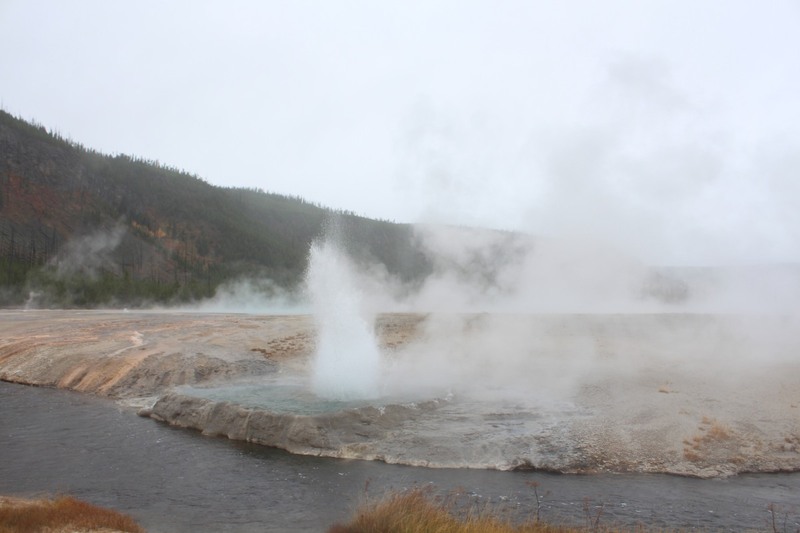 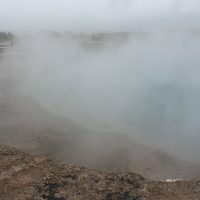 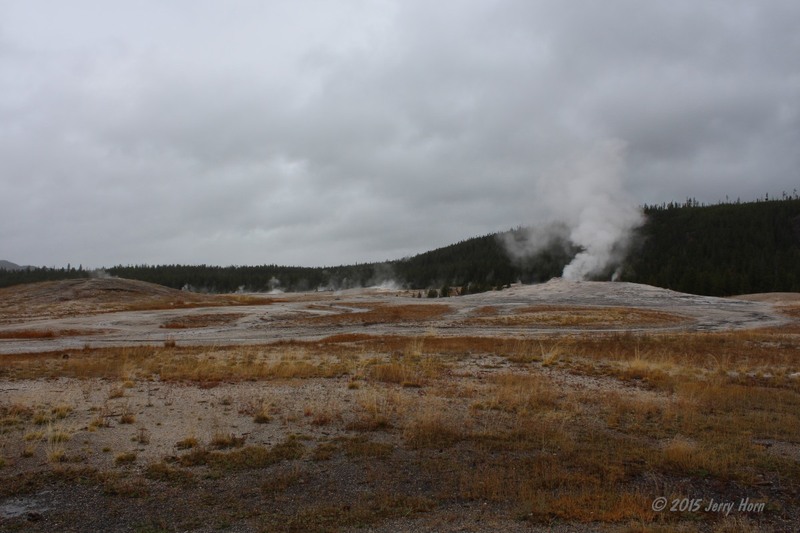 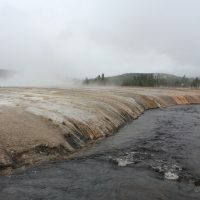 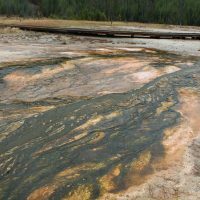 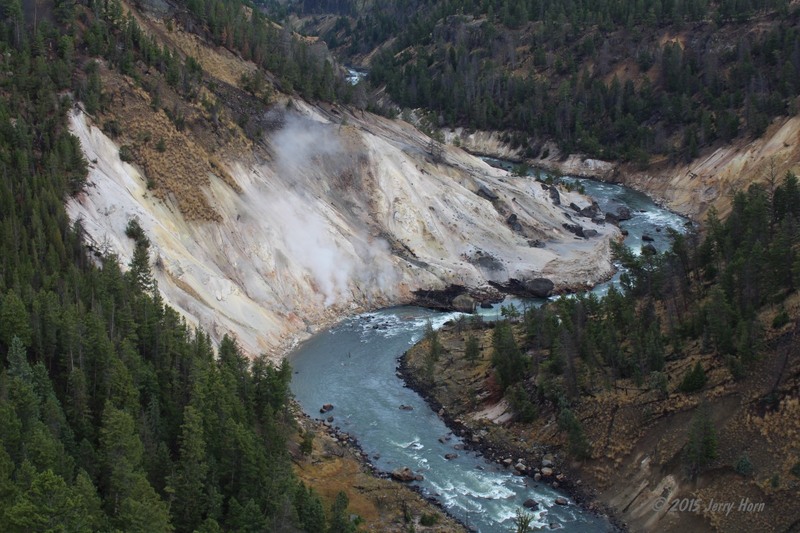 Once inside Yellowstone, I first stopped at Old Faithful and hung around until it erupted. 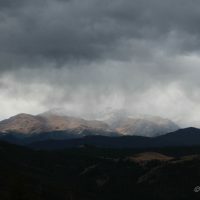 Sadly, due to the cold temps and the bad weather, I didn’t get any good photos. 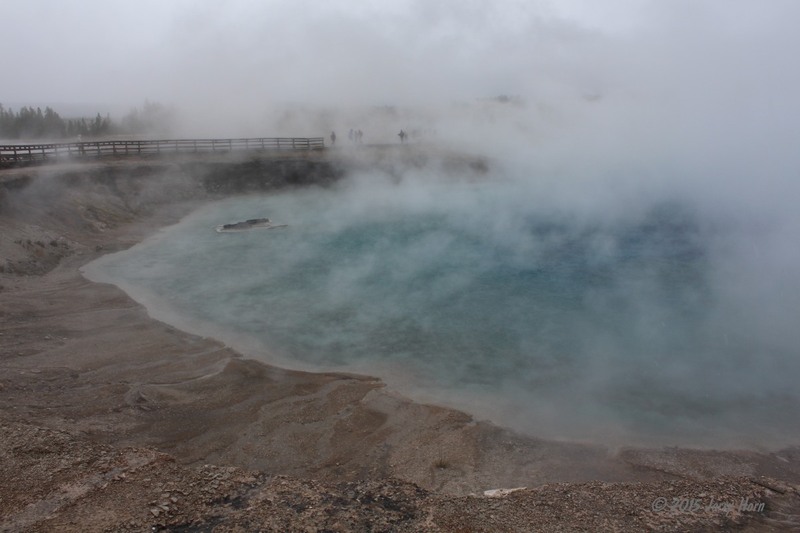 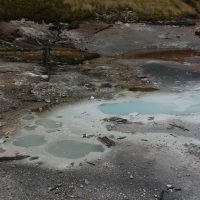 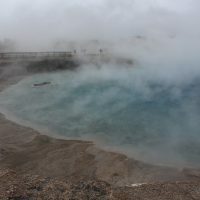 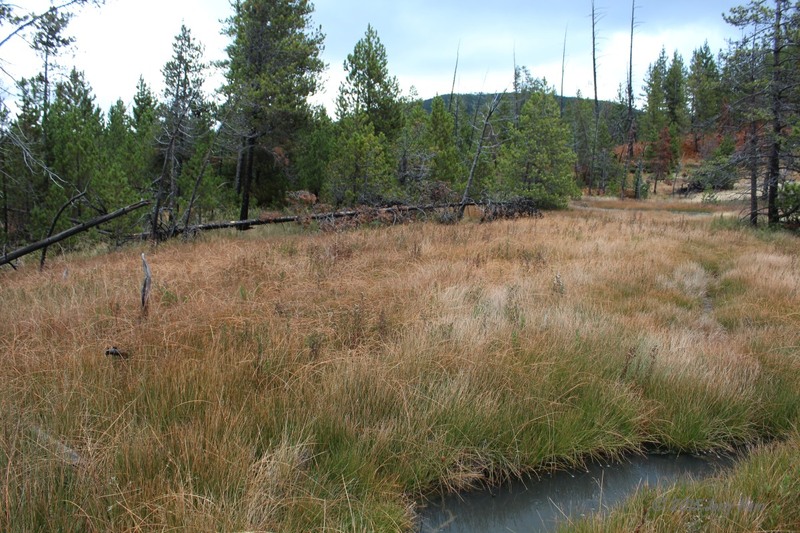 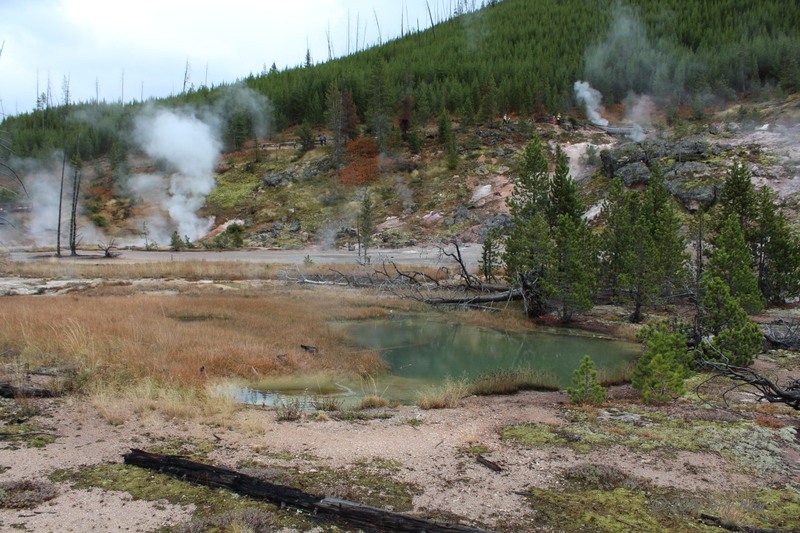 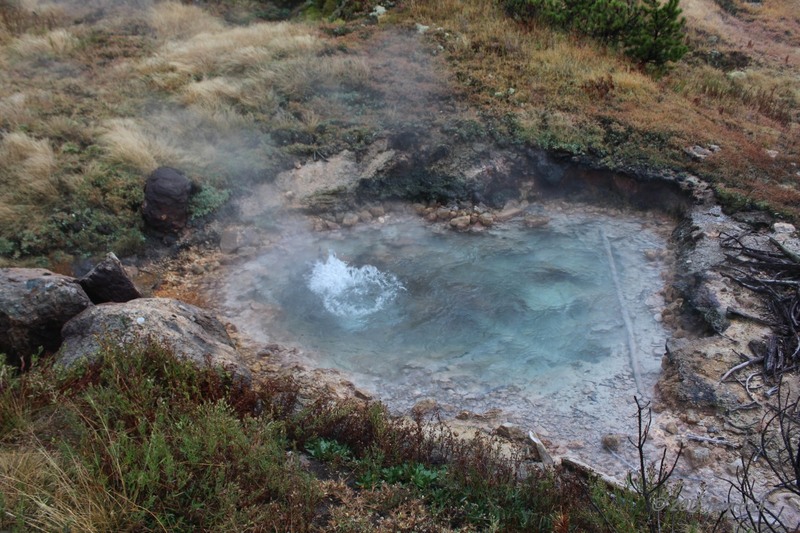 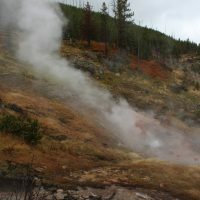 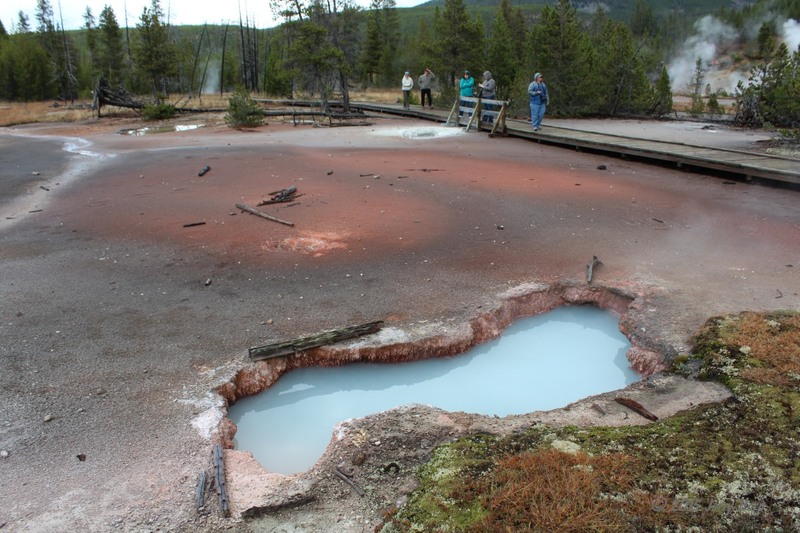 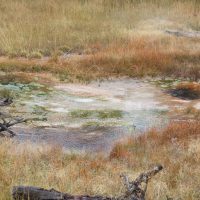 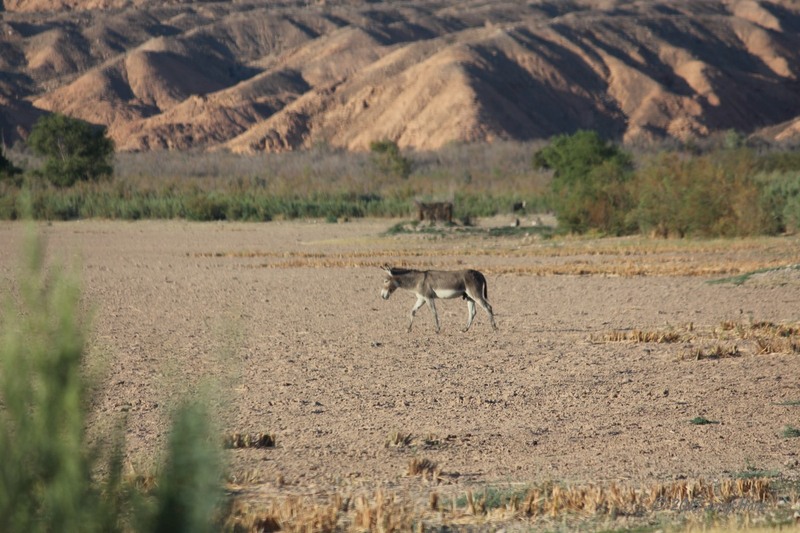 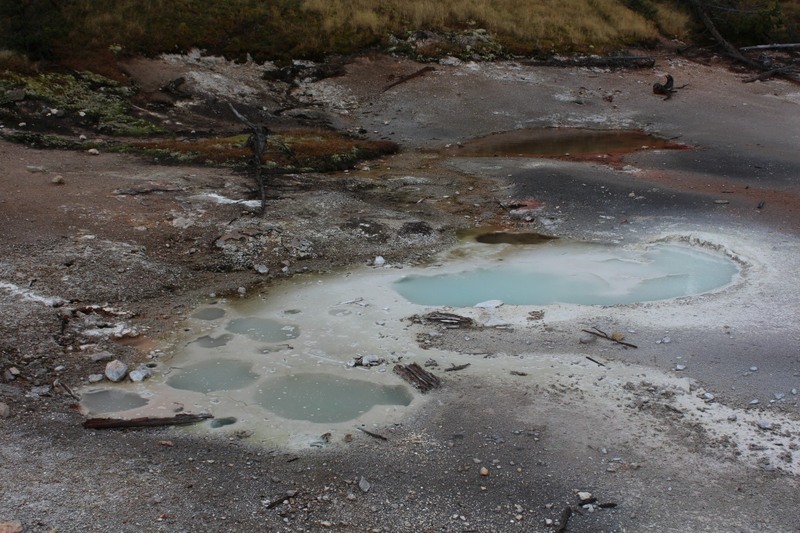 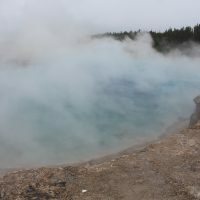 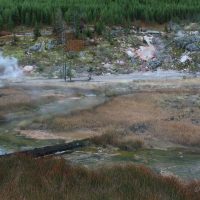 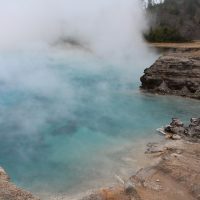 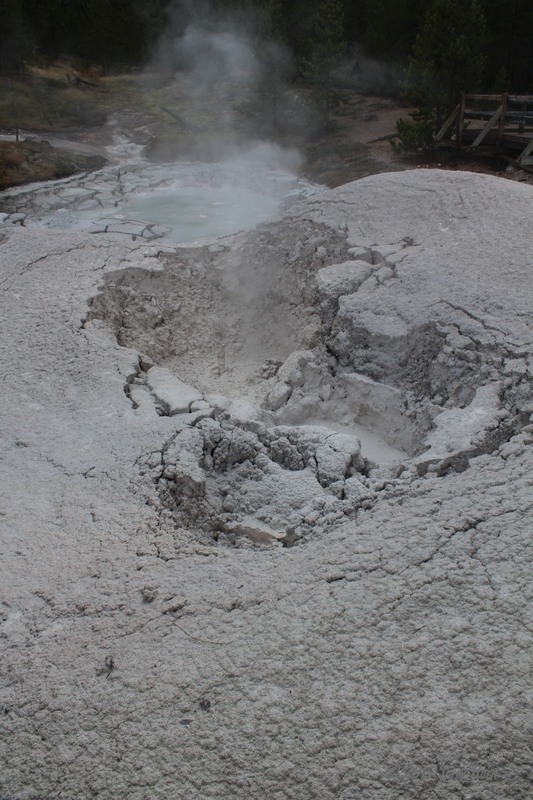 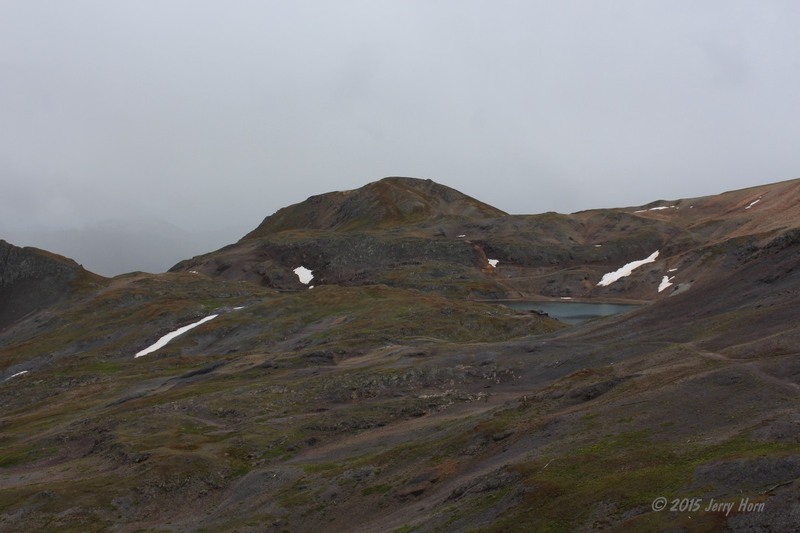 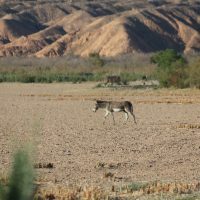 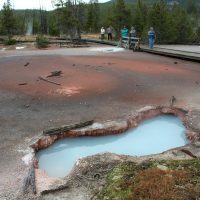 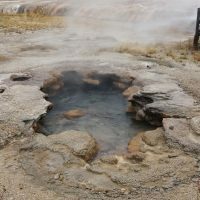 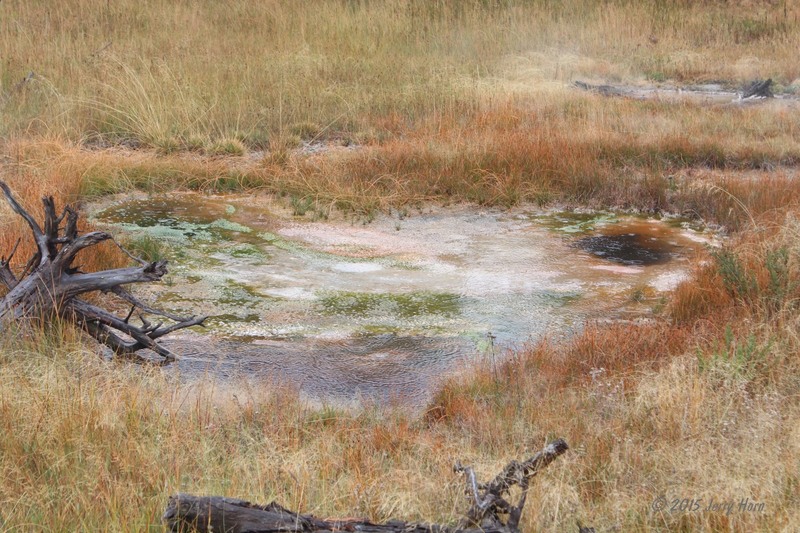 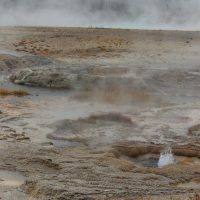 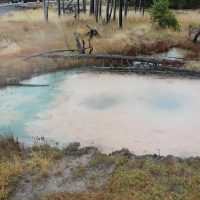 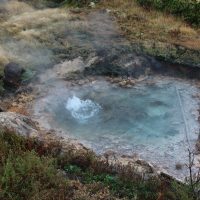 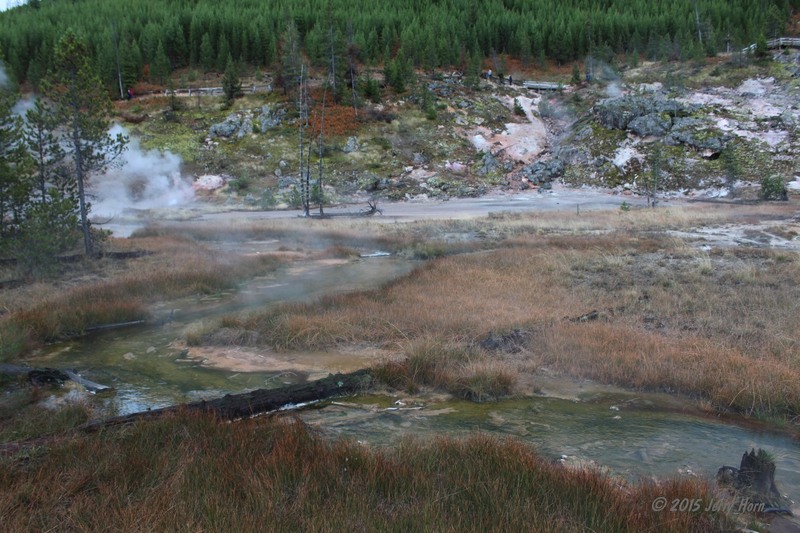 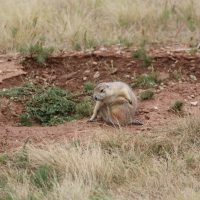 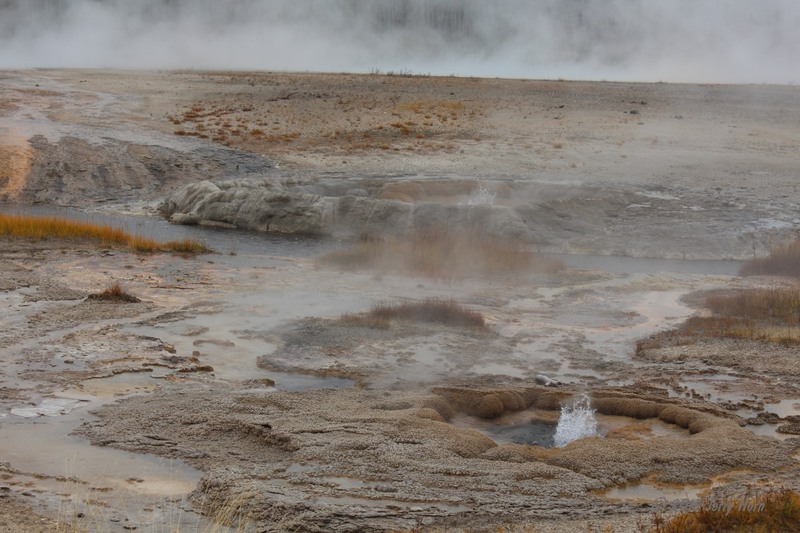 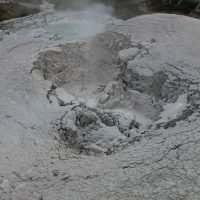 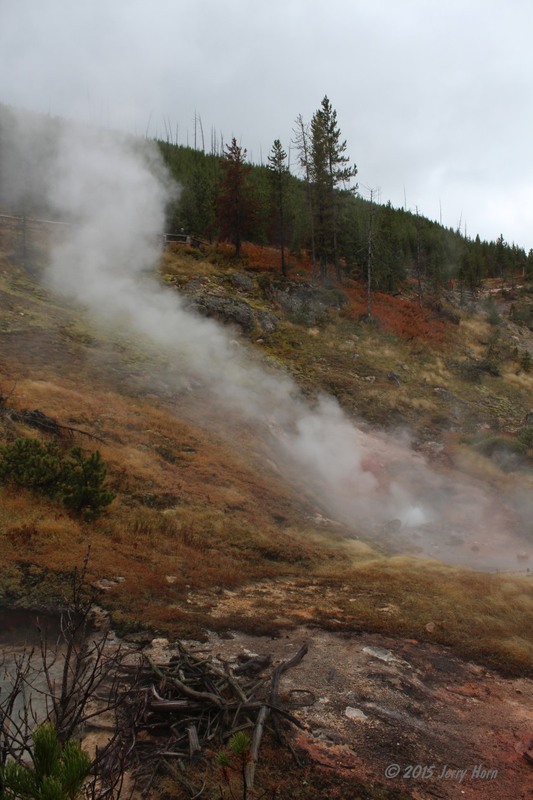 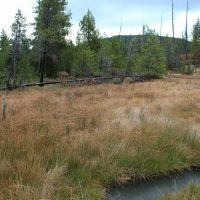 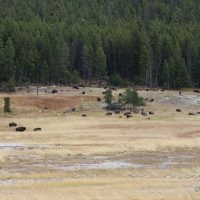 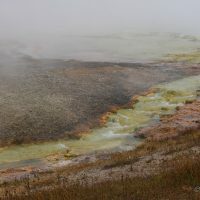 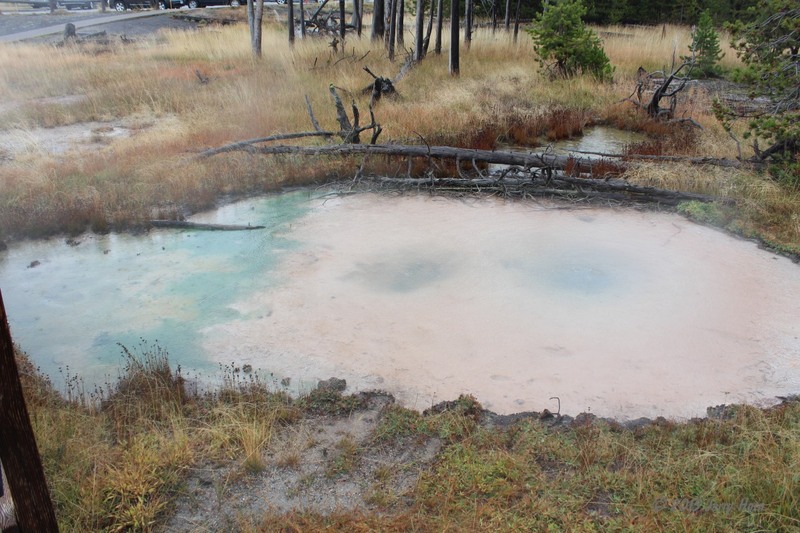 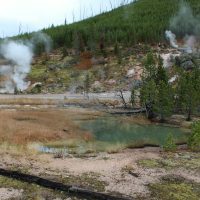 I continued clockwise around the park, stopping to explore the hot springs and mudpits. 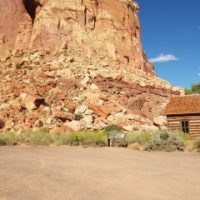 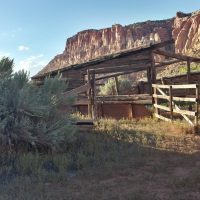 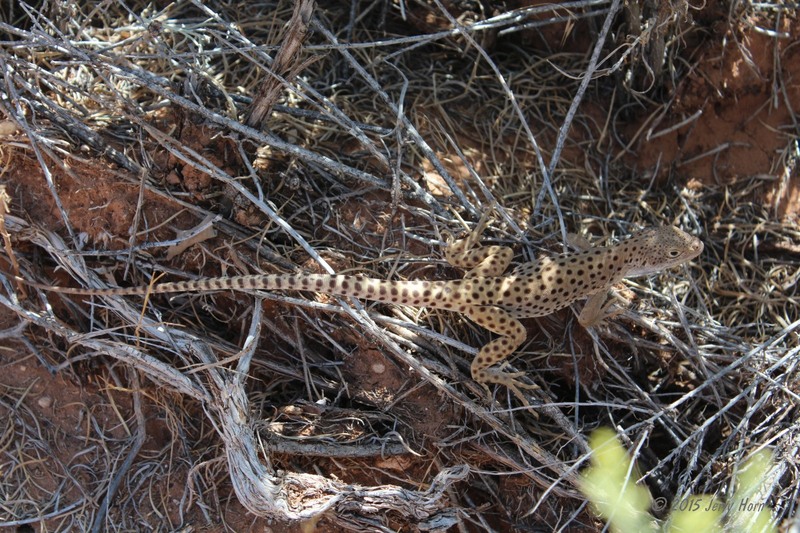 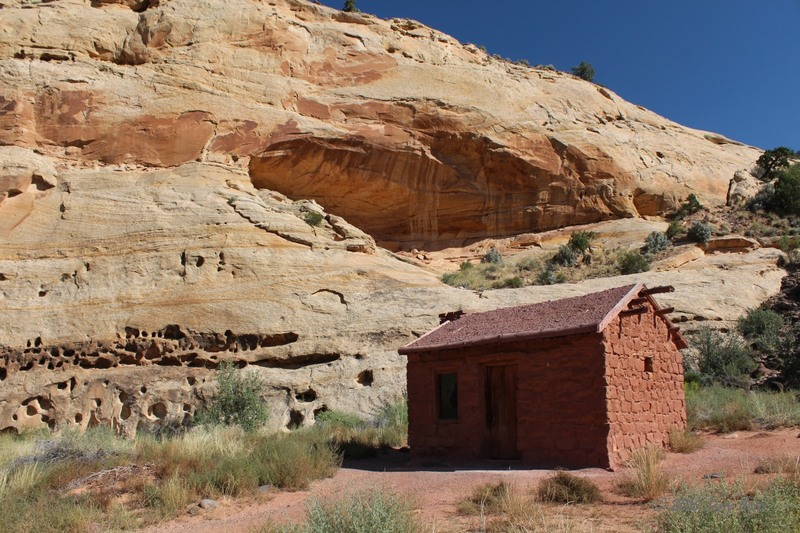 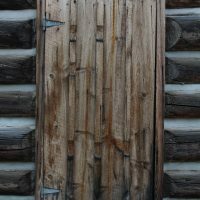 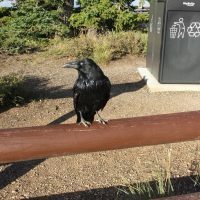 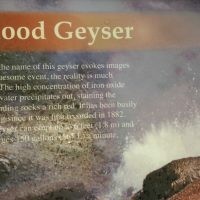 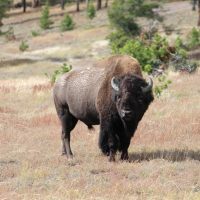 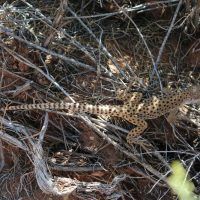 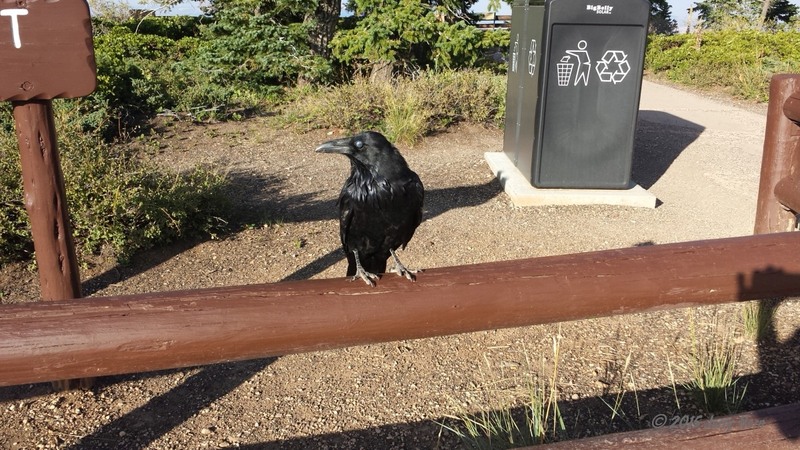 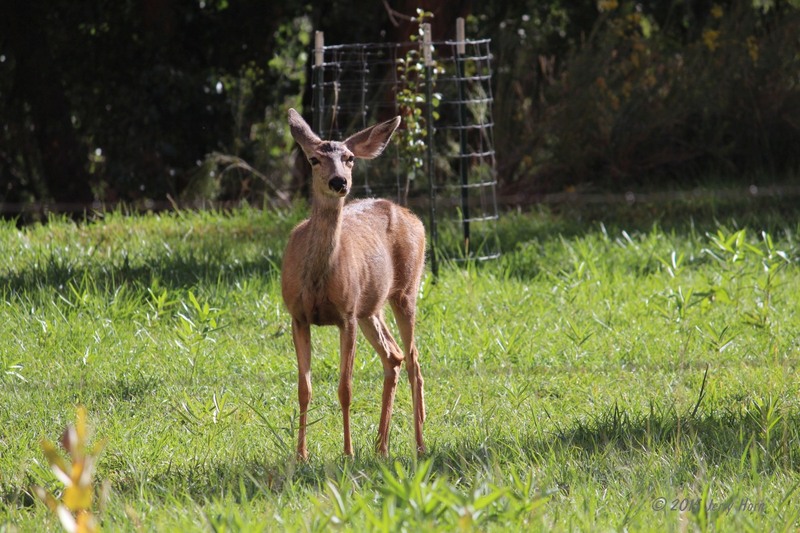 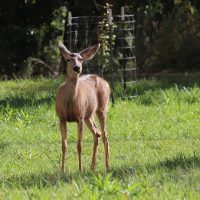 I stopped at the Canyon Village visitor center, browsed a bit and asked for camping advice. 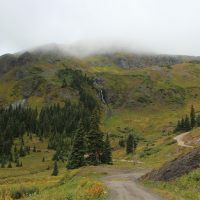 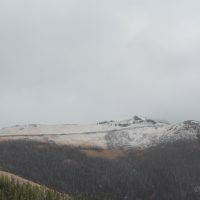 I headed up to the Tower Fall campground by crossing the Dunraven Pass (8878ft) where the rain changed to snow and snagged the last campsite. 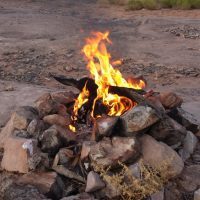 I made dinner and tried making a campfire, but the rain had other plans. 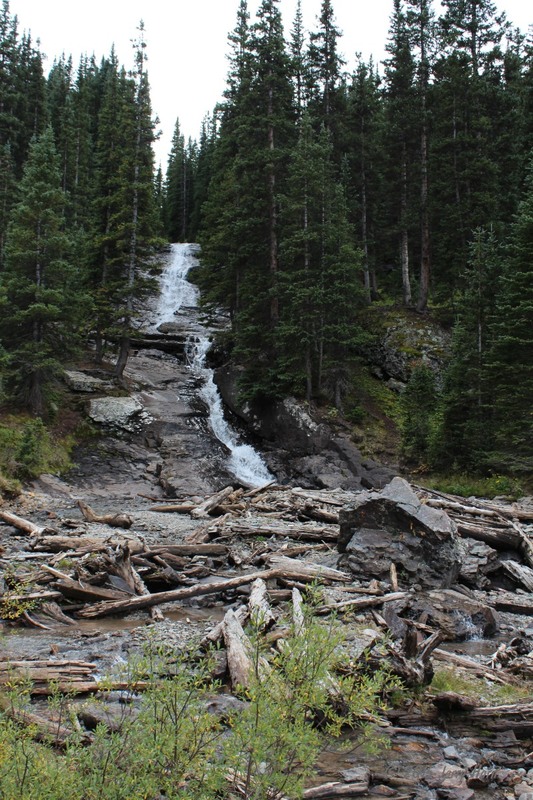 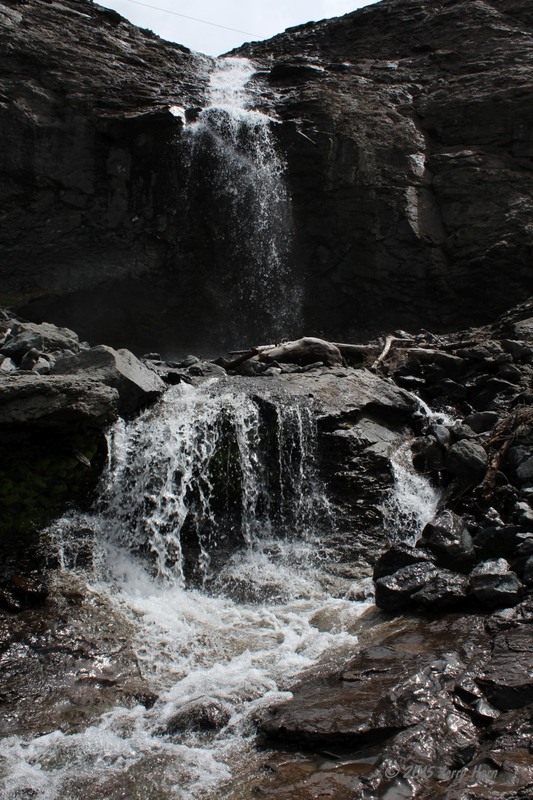 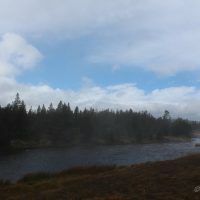 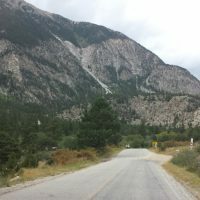 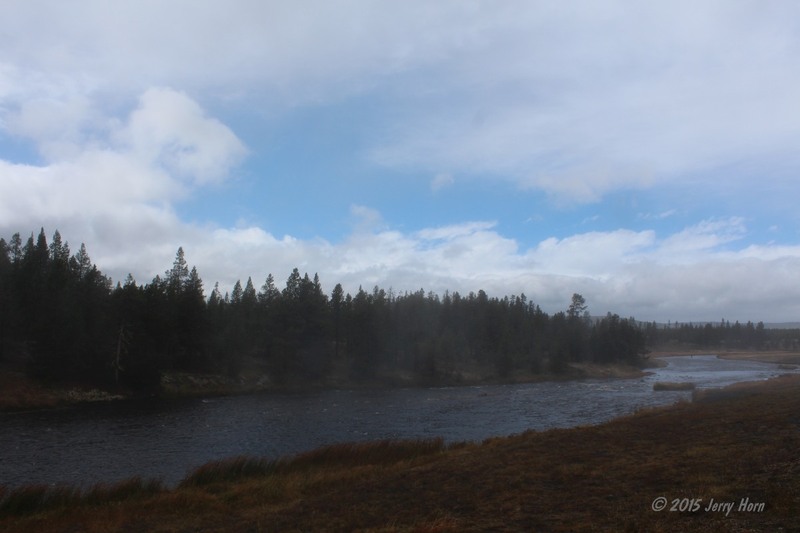 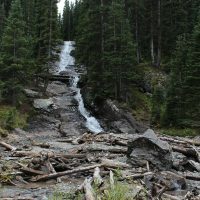 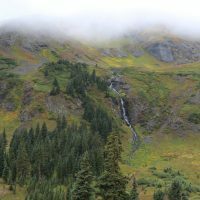 On Thursday, Sept 17, I packed up camp and tried heading back to Canyon Village to hike along the river and famous waterfalls, but the road was closed due to ice and snow from the night. 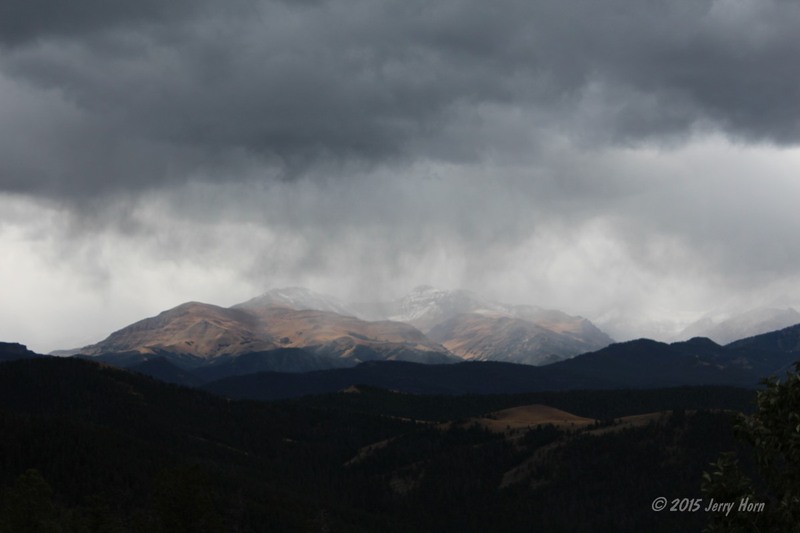 Yeah, the weather and I didn’t get along so well on this trip. 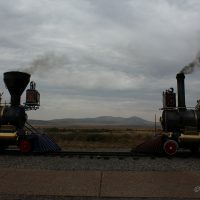 I decided to leave the park and start heading east, taking a few photos on the way. 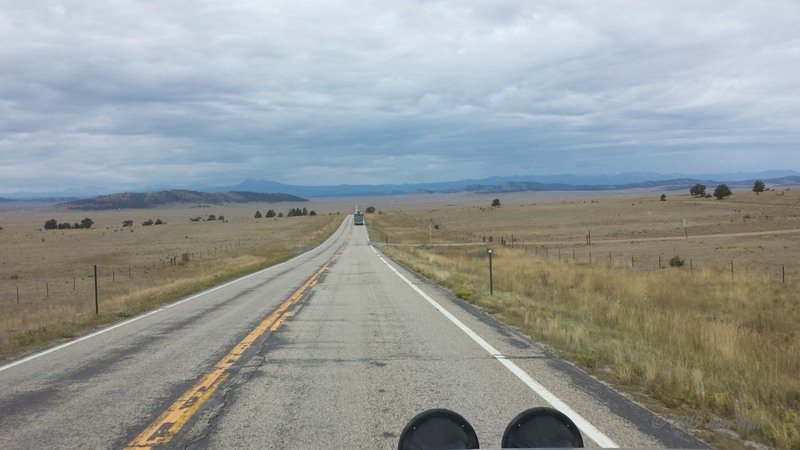 I left via the Northeast gate, which put me briefly into Montana before dropping back into Wyoming. 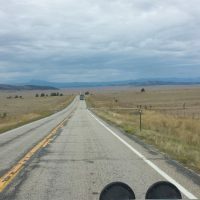 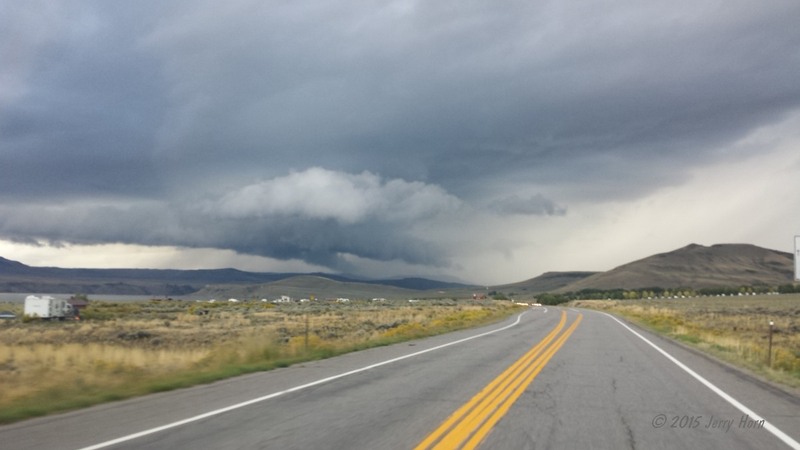 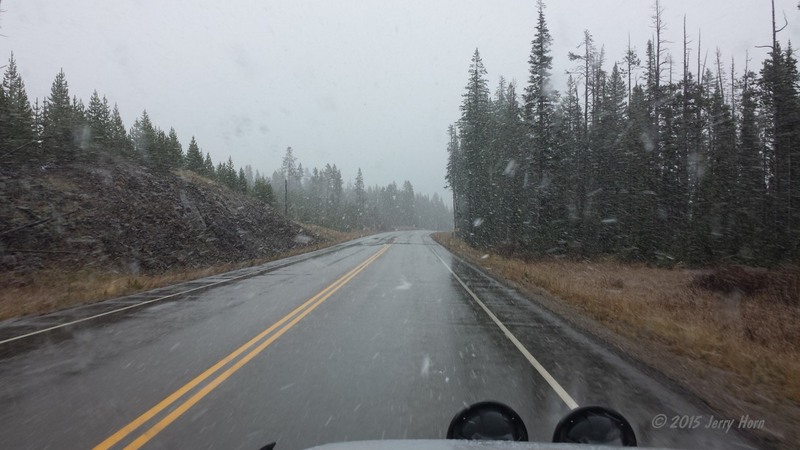 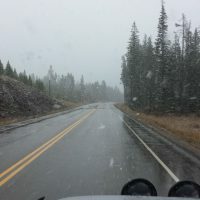 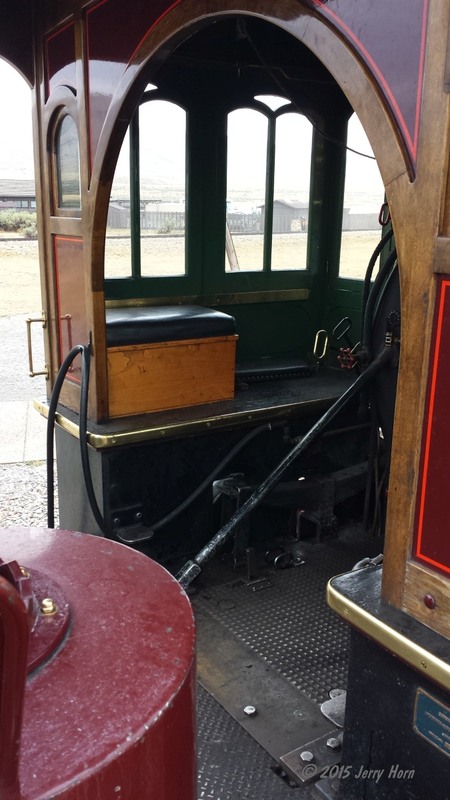 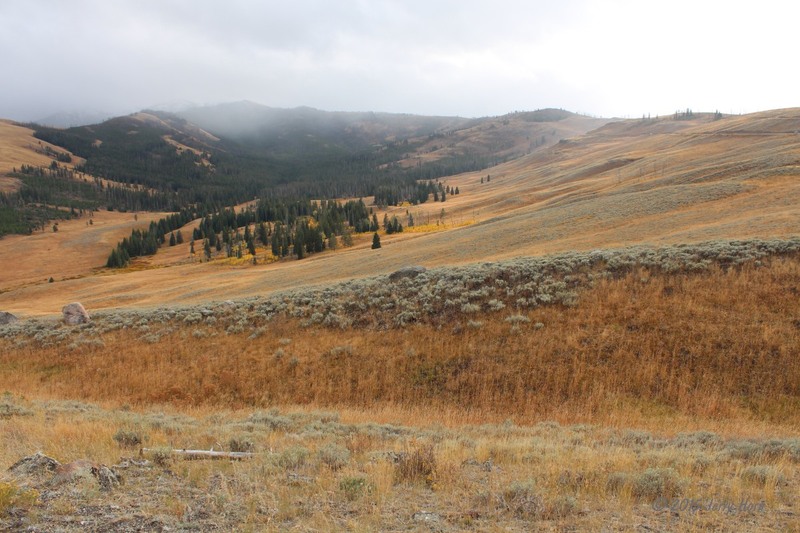 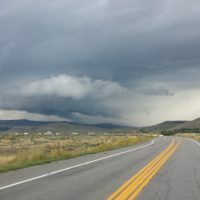 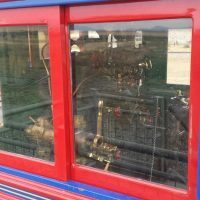 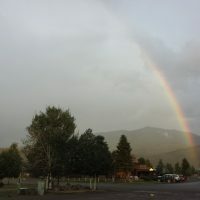 Once I got out of the park, the rain and snow stopped, and I headed for Cody, WY. 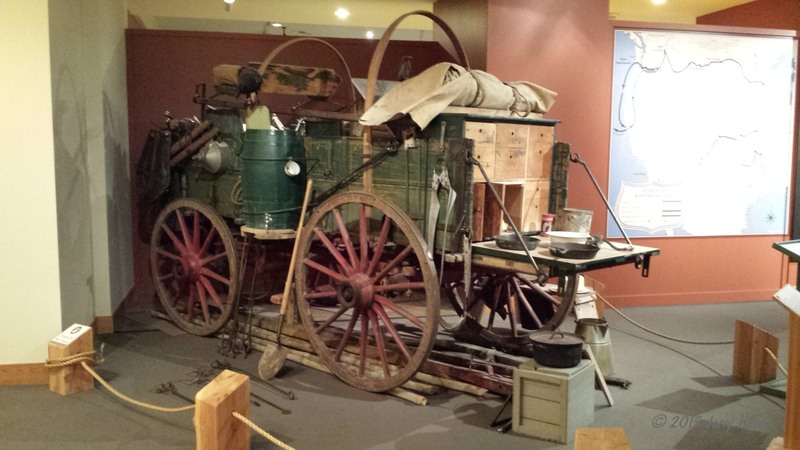 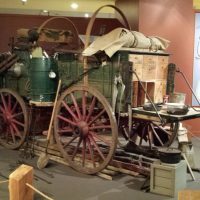 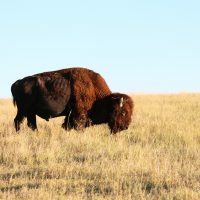 Several folks had recommended the Buffalo Bill Center of the West, a great place to visit, with 5 museums linked together. 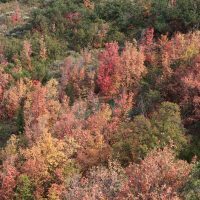 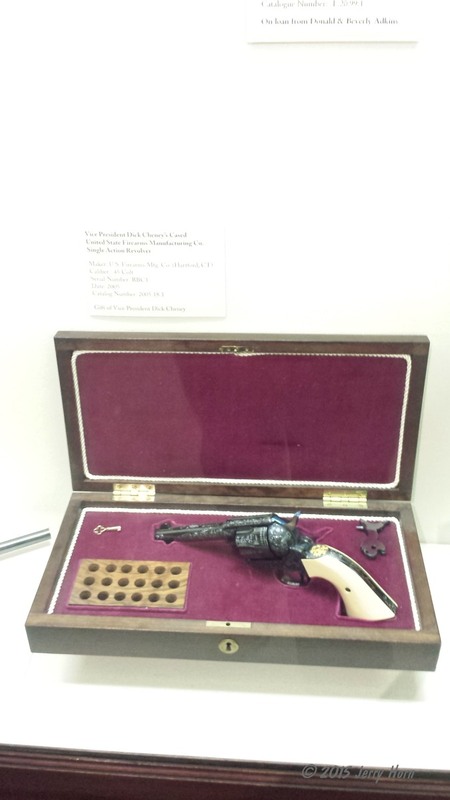 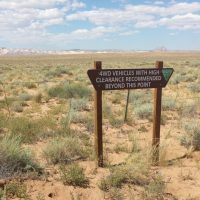 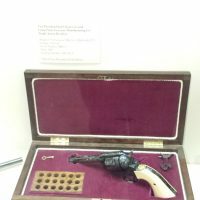 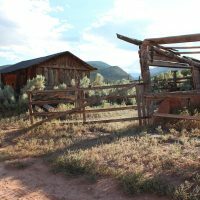 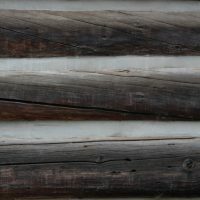 I spent the most time in the firearms museum, including seeing a rifle found leaning against a tree in the Great Basin National Park and watched them place a recently donated pistol from a former Vice President. 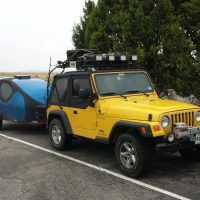 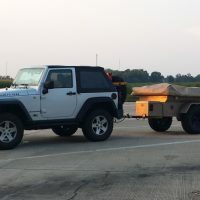 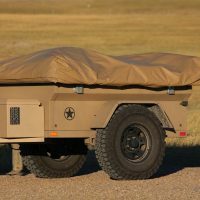 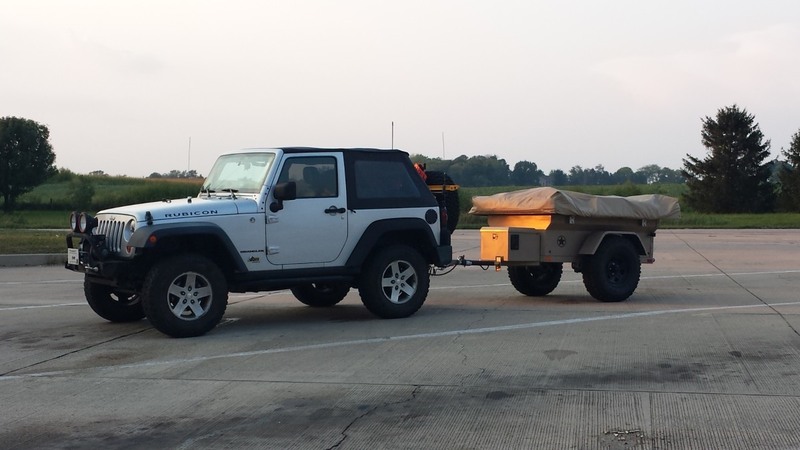 Walking out, I chatted with a tourist from Europe who was interested in my trailer, I believe he was from Denmark… if you slow down, you’ll meet a lot of interesting folks out here. 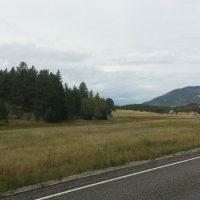 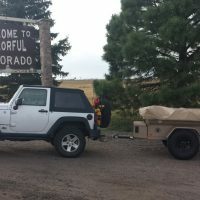 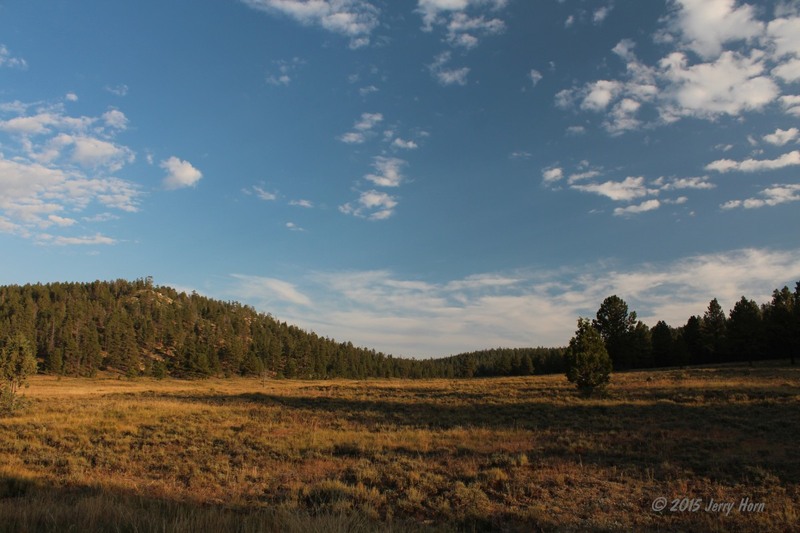 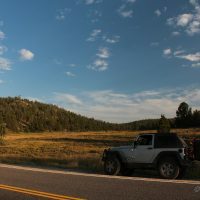 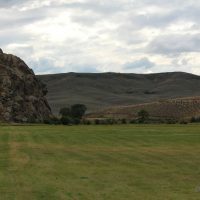 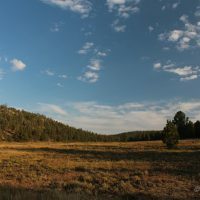 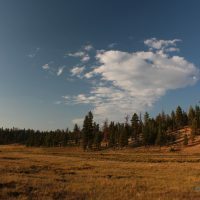 After leaving Cody, I continued east, driving several hours across the state… I looked on the maps and didn’t see any public land for campsites, so I decided to stop at a hotel for the night. 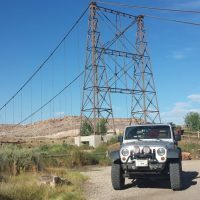 Ramada Inn in Gillette was a great stay for the night and a nice buffet in the morning for breakfast. 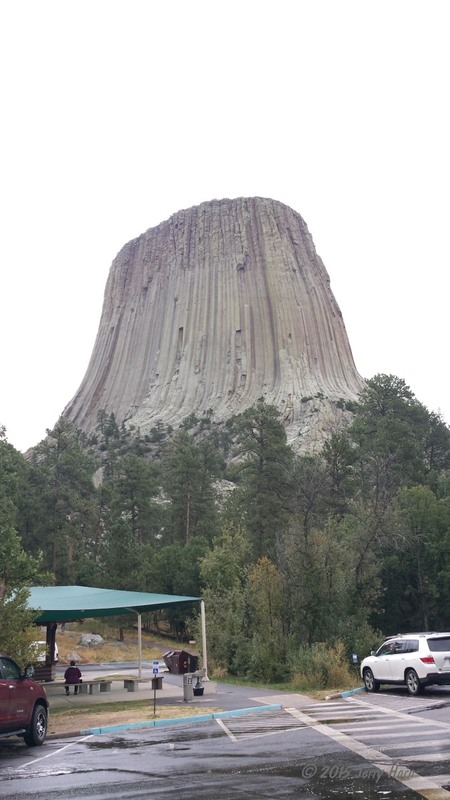 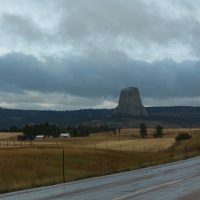 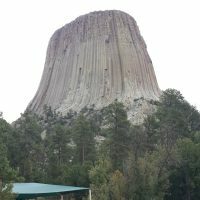 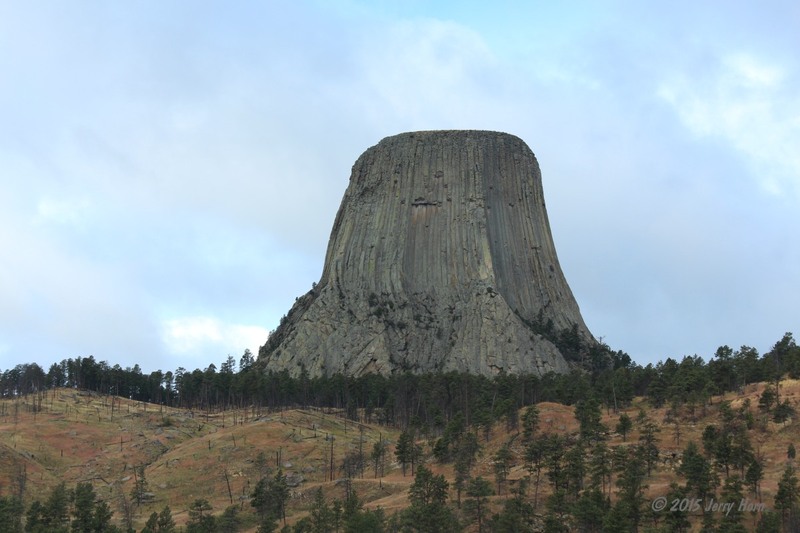 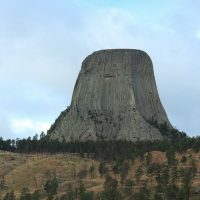 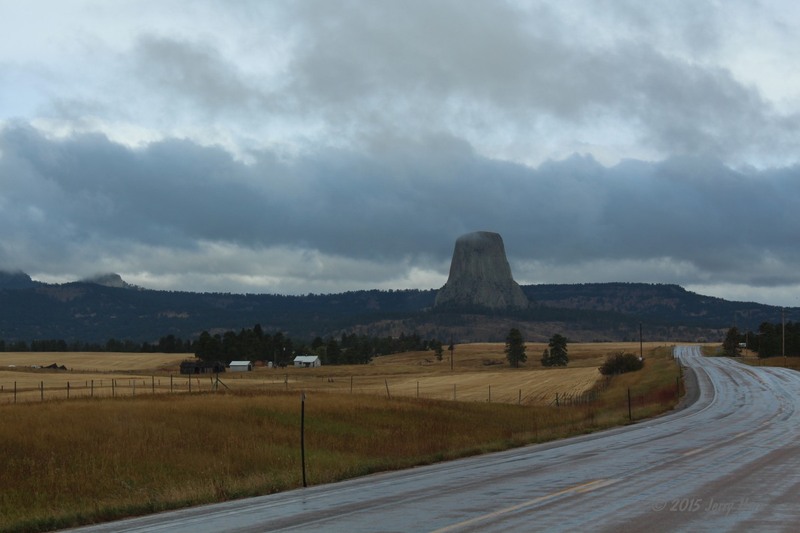 Friday the 18th, I head east and stop at the Devil’s Tower National Monument, which has had me curious for a few years. 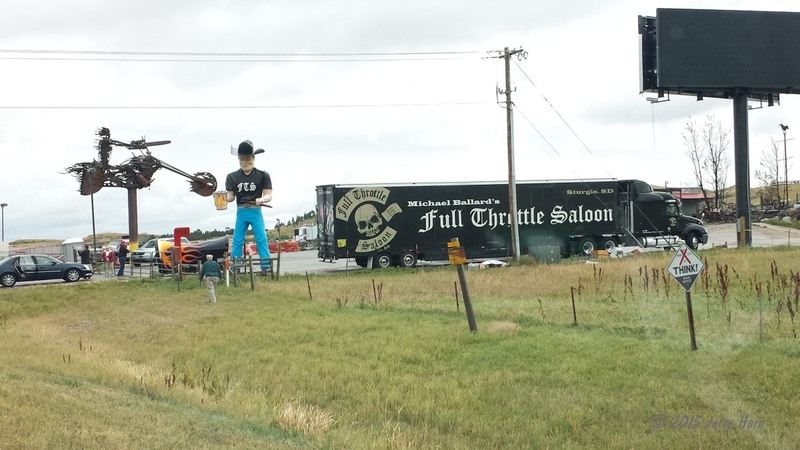 Curiosity satisfied, I continued along, stopping briefly in Sturgis and Deadwood after reaching South Dakota. 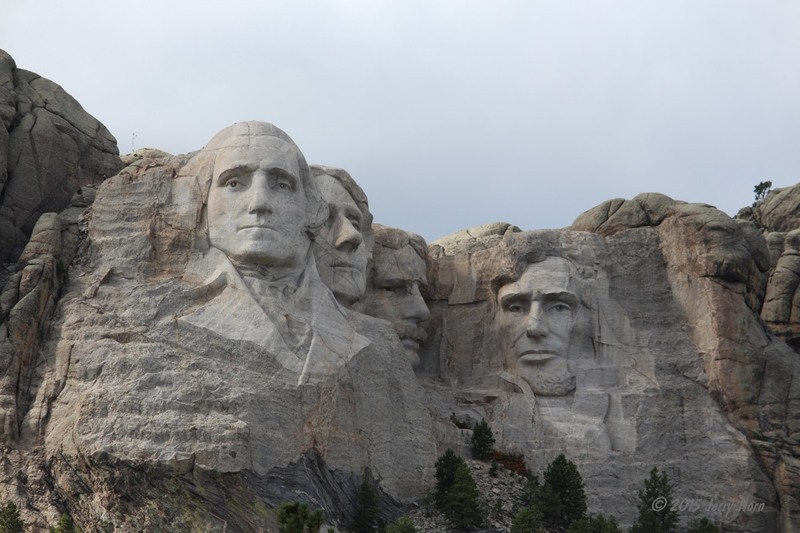 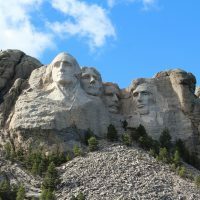 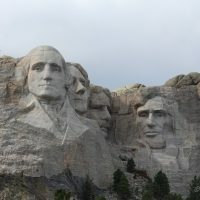 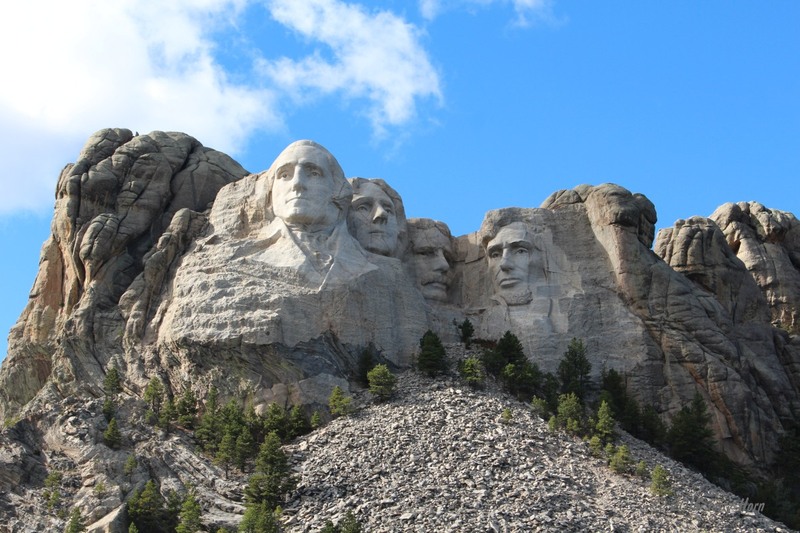 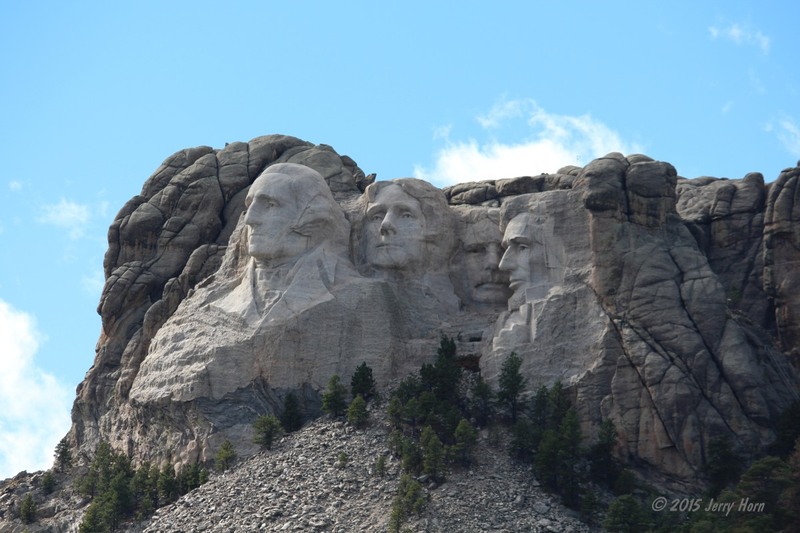 Now, I went to visit Mount Rushmore and spent a little time there. 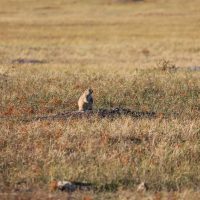 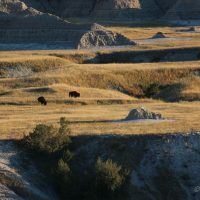 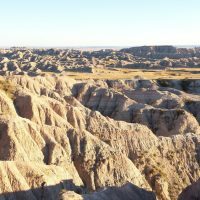 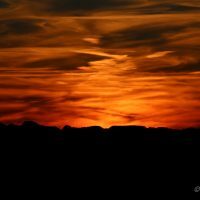 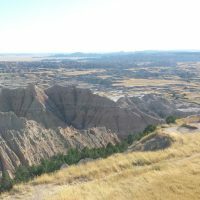 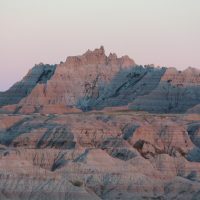 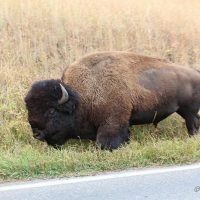 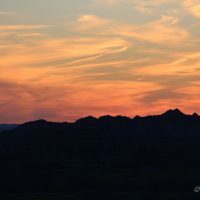 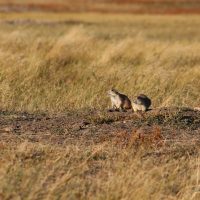 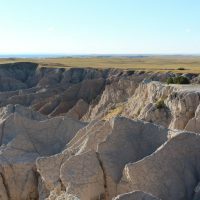 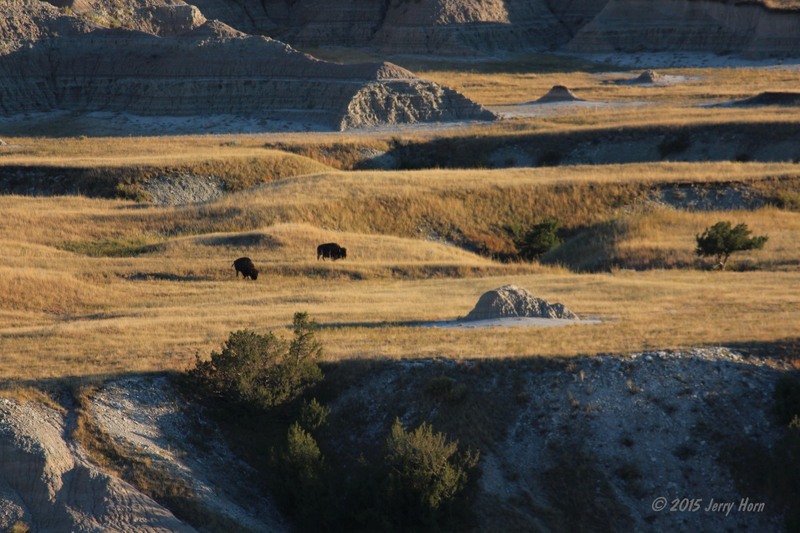 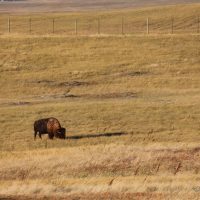 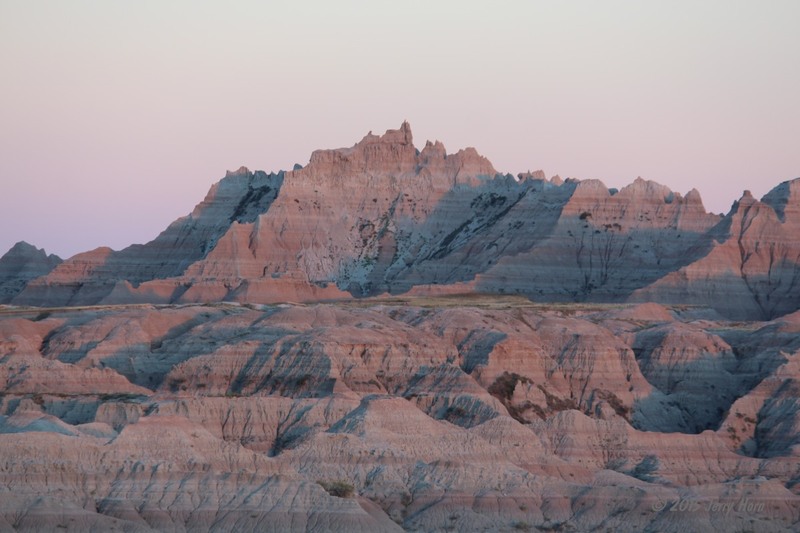 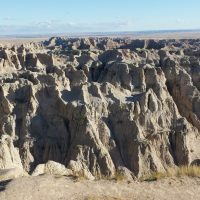 I checked the maps and kept heading east, stopping at the Badlands National Park a little before sunset and spent around 2 hours there. 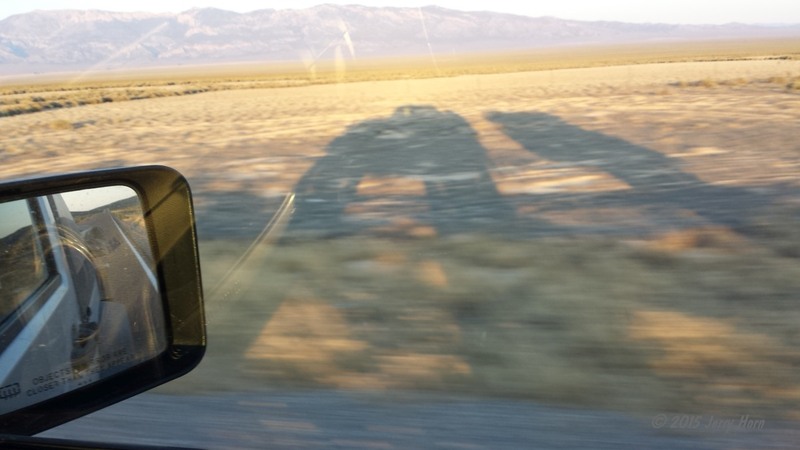 That marks the end of my tourist stuff, time for the drive home. 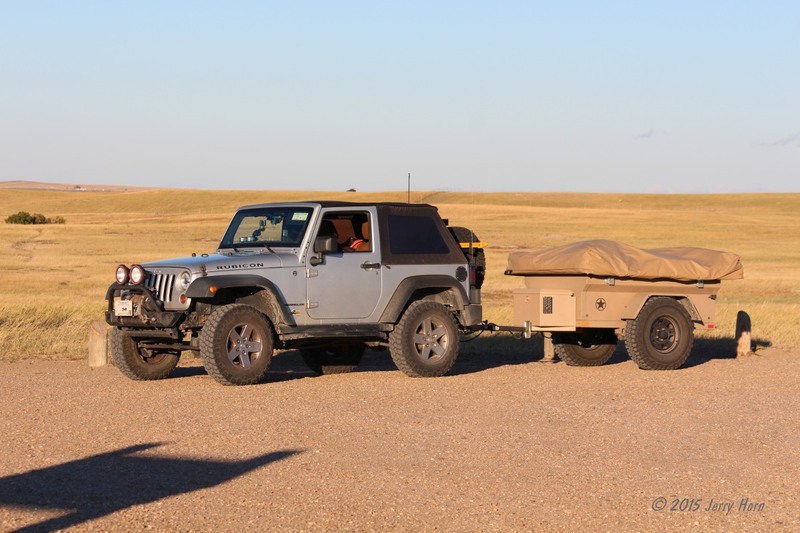 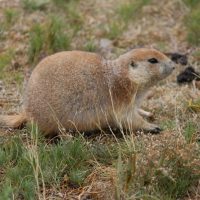 I stop for a 4 hour nap outside Junction City, SD and marathon drive home from there… finally reaching my home at 6:38am on the 20th after nearly 25 straight hours on the road. 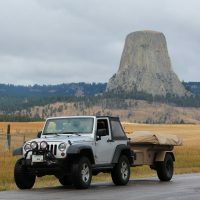 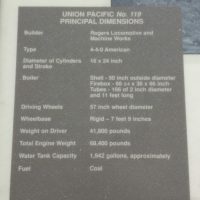 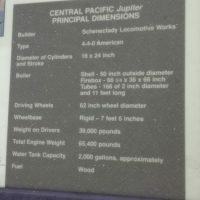 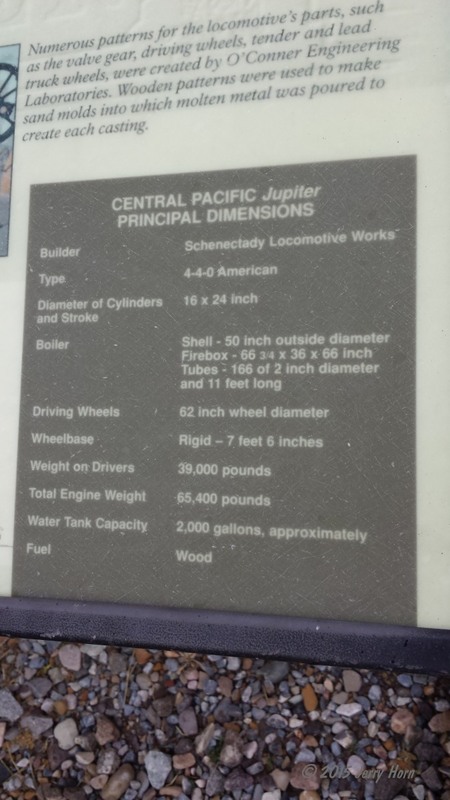 Total mileage from the Jeep trip meter is 7343.1 miles.